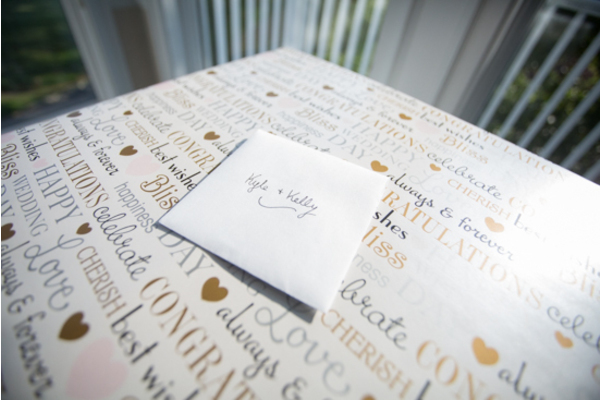 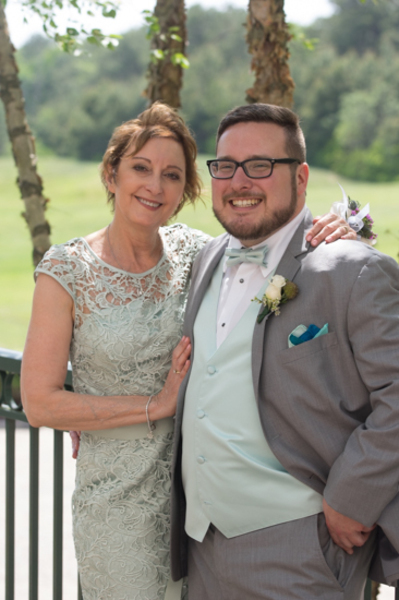 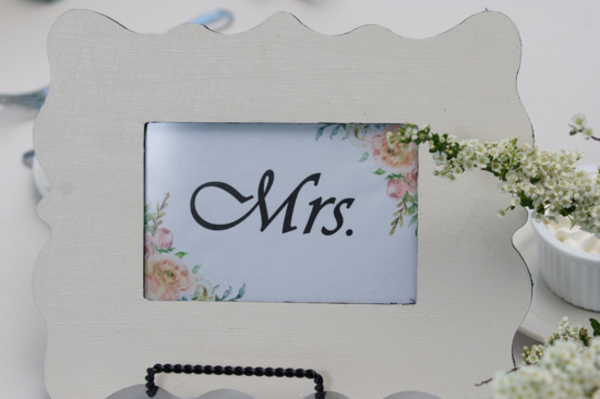 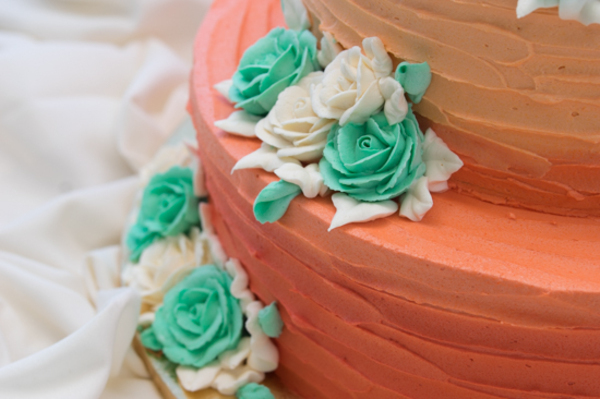 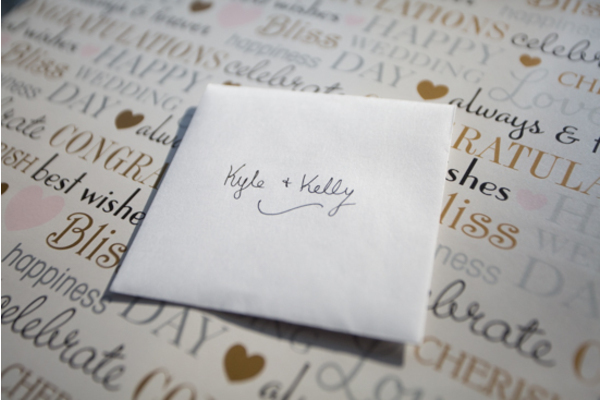 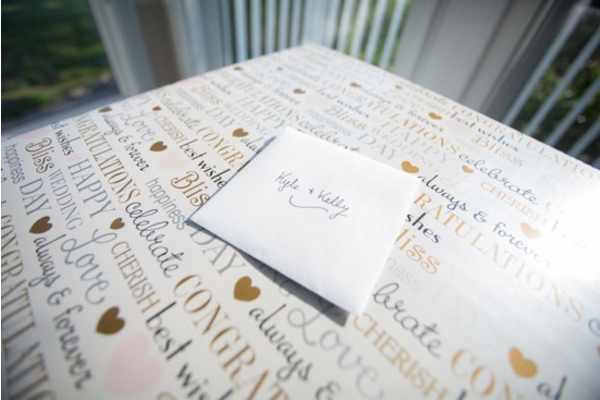 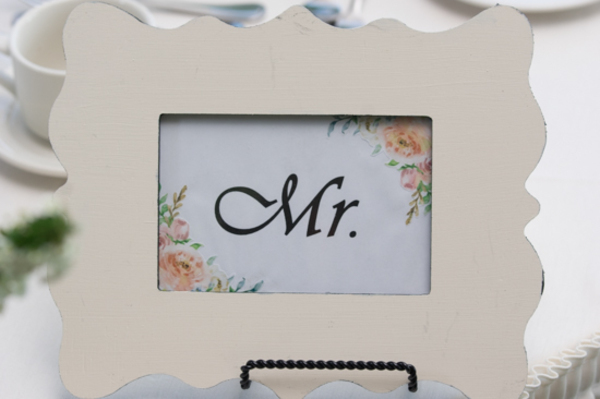 Congratulations to Kelly and Kyle on their recent marriage! 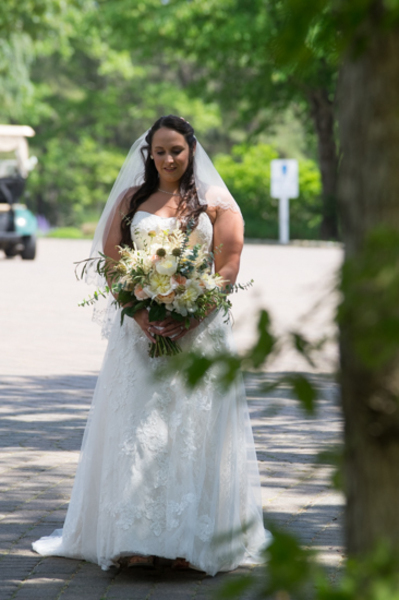 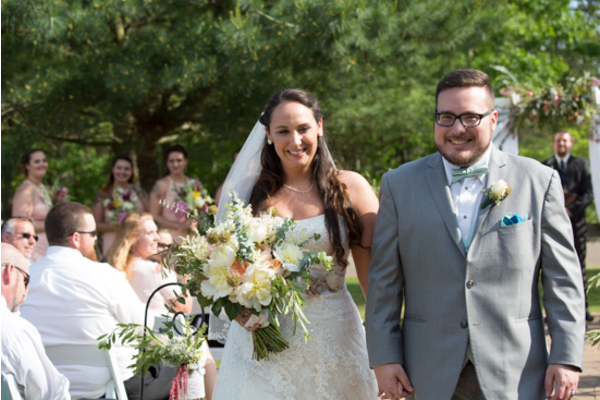 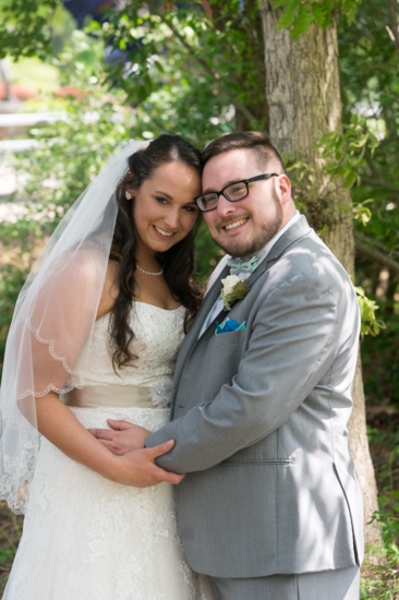 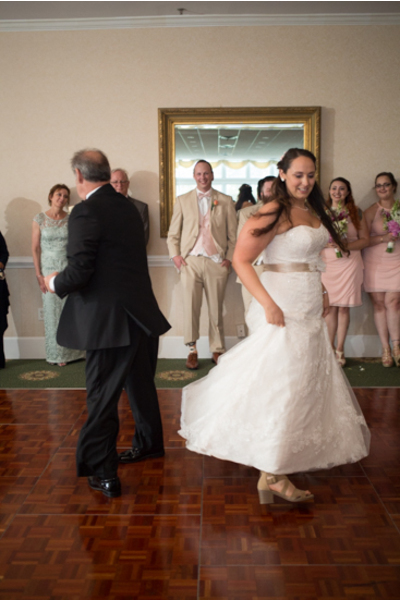 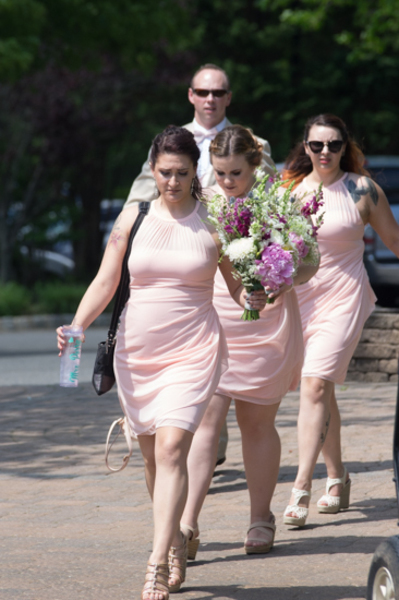 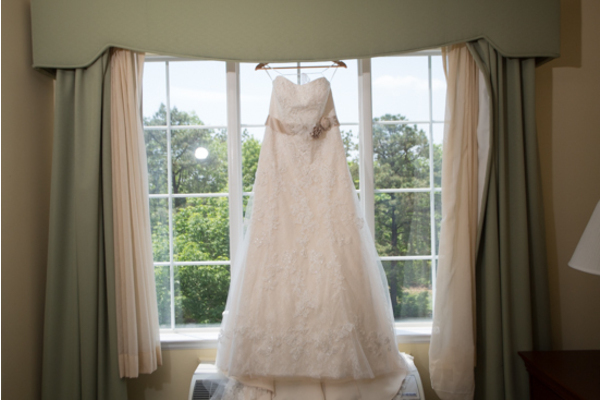 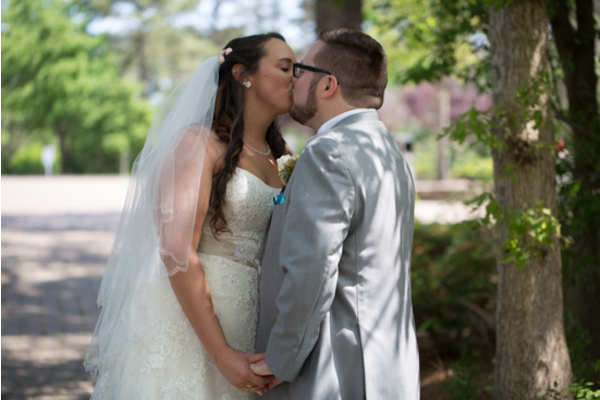 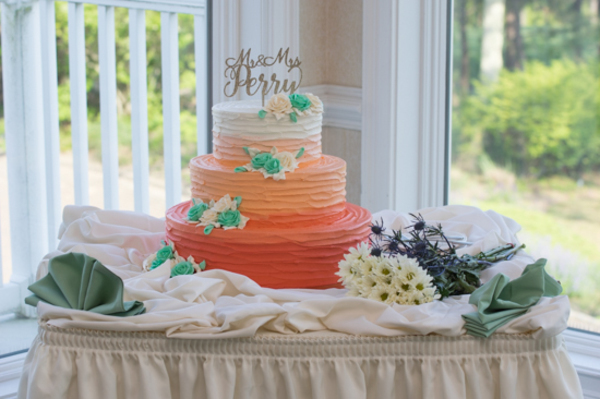 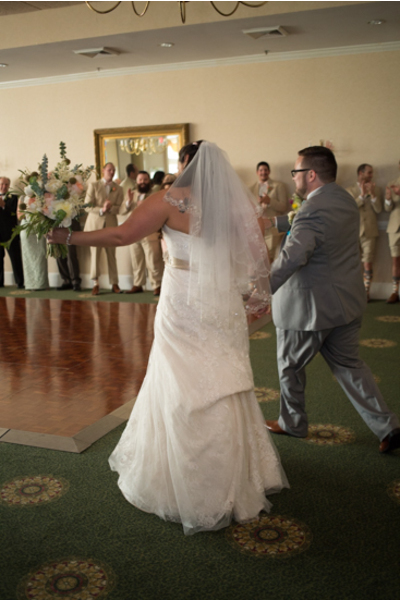 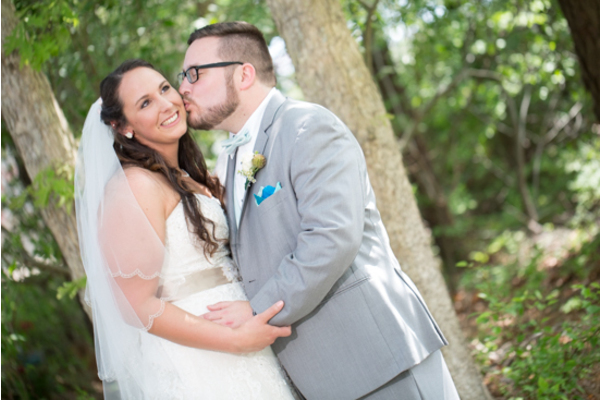 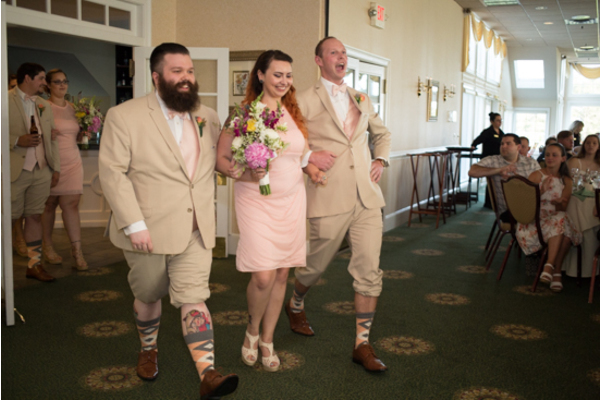 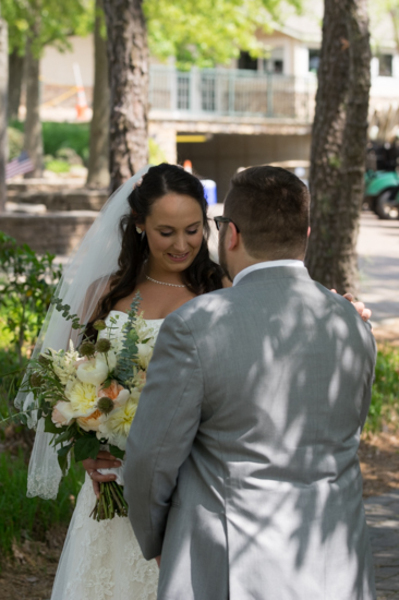 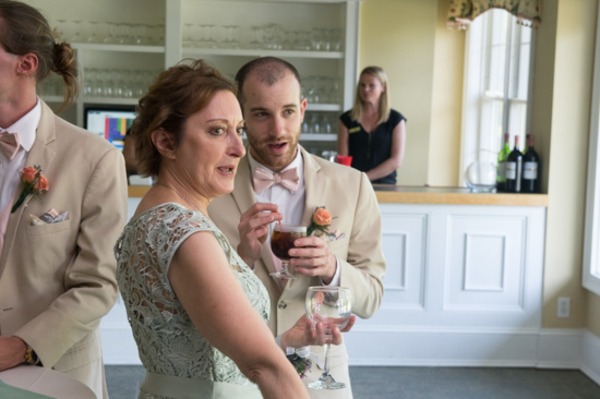 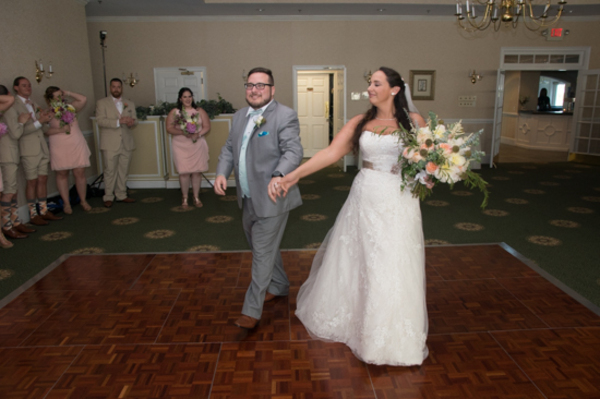 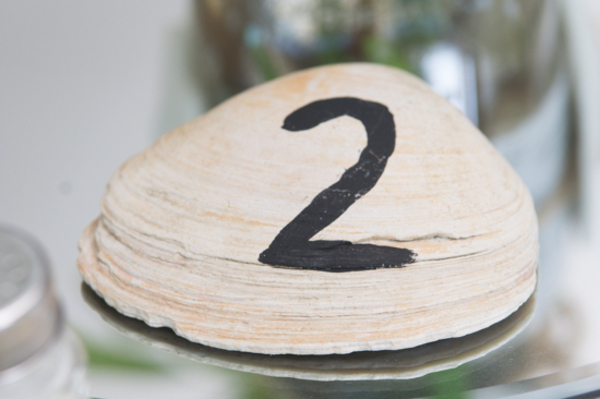 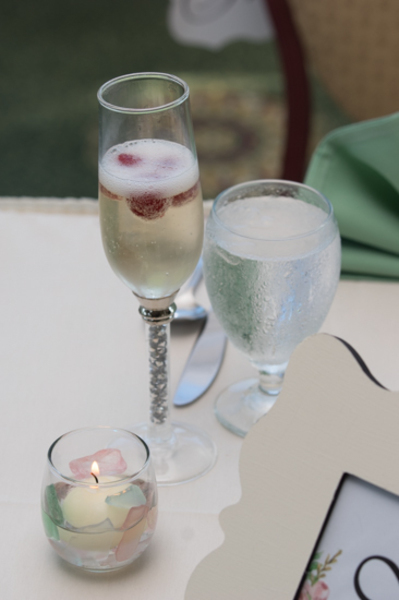 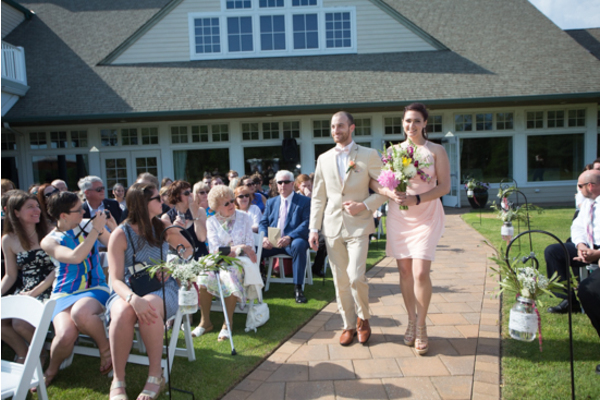 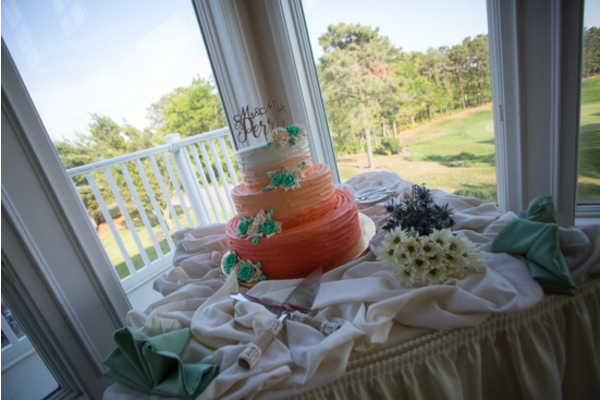 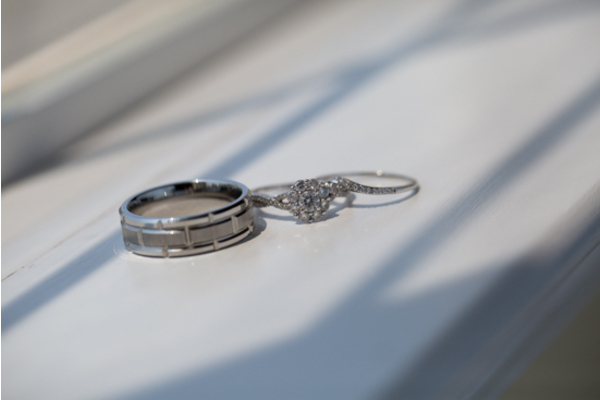 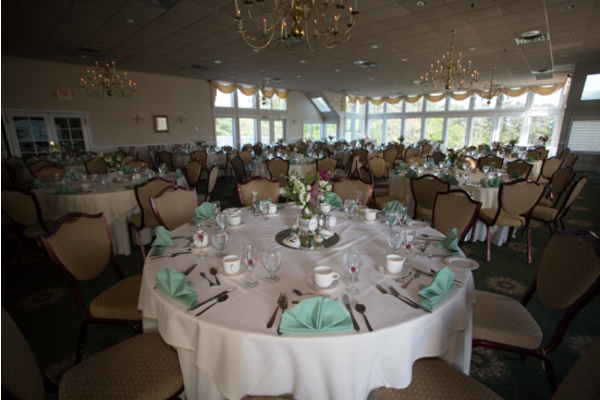 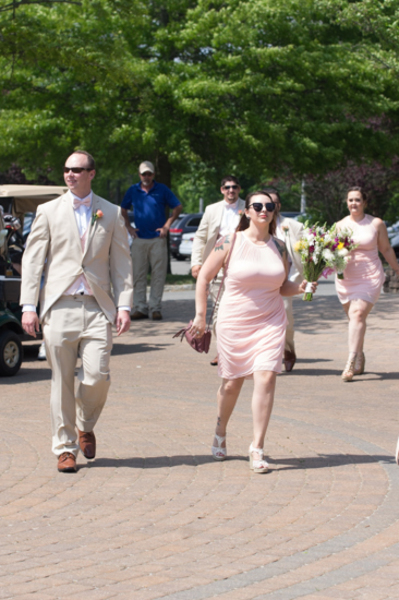 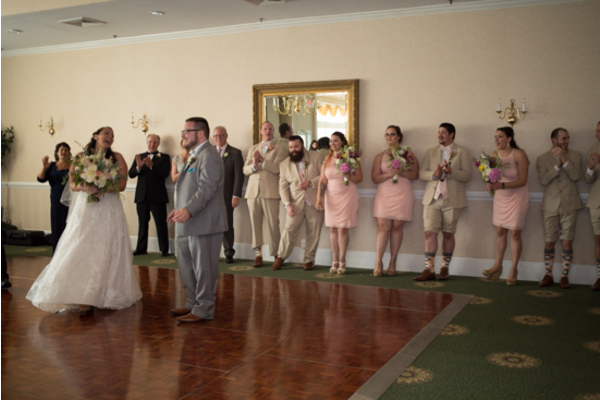 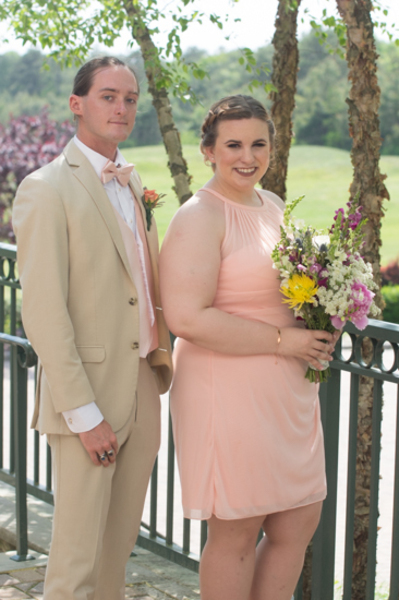 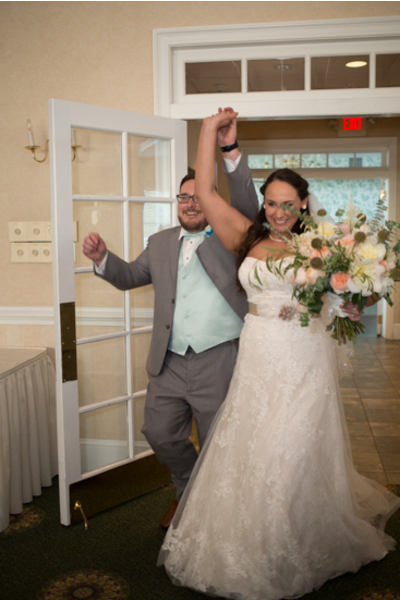 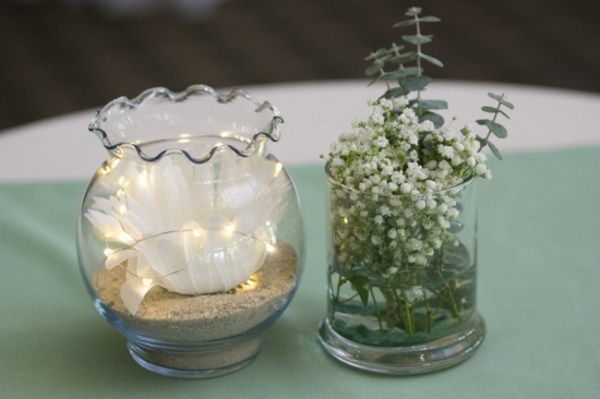 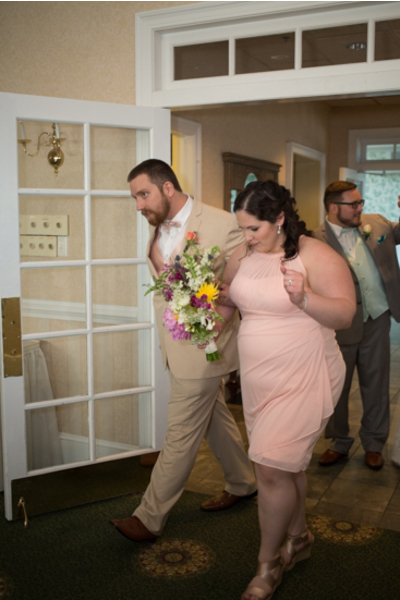 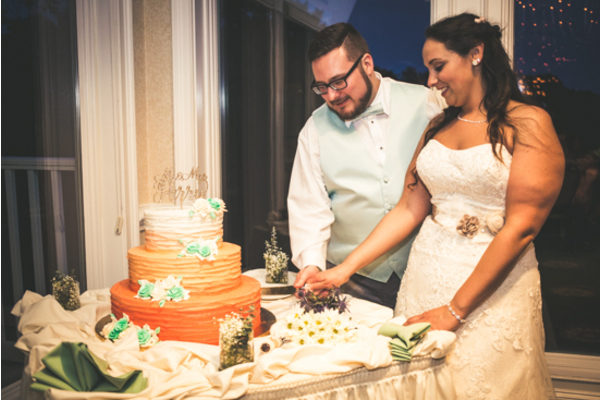 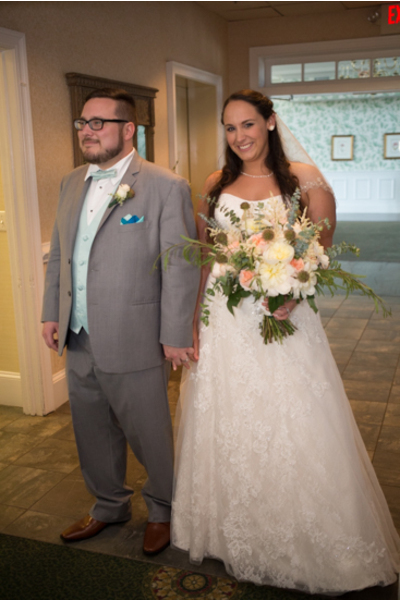 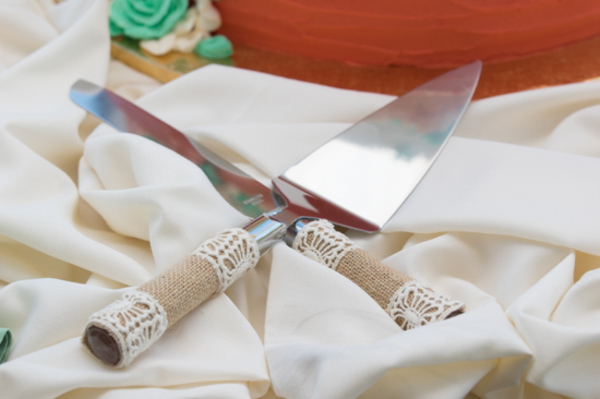 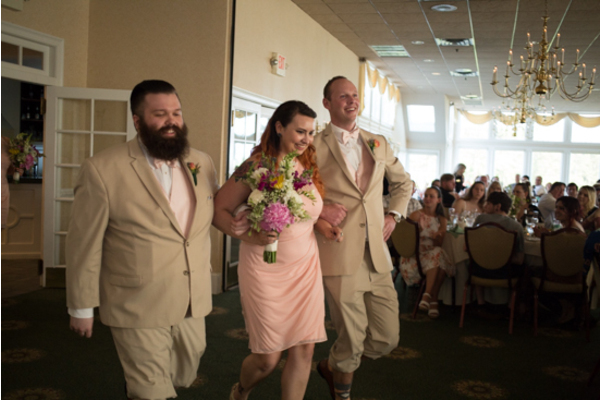 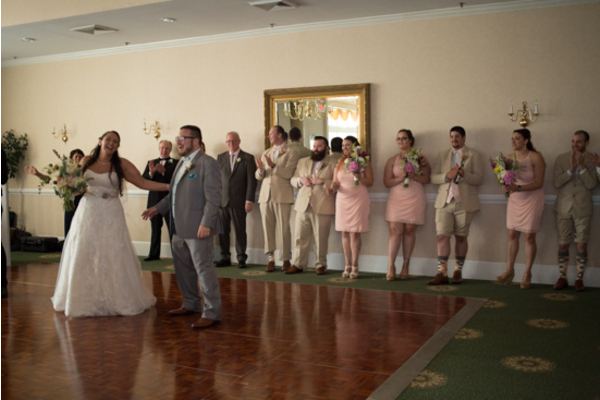 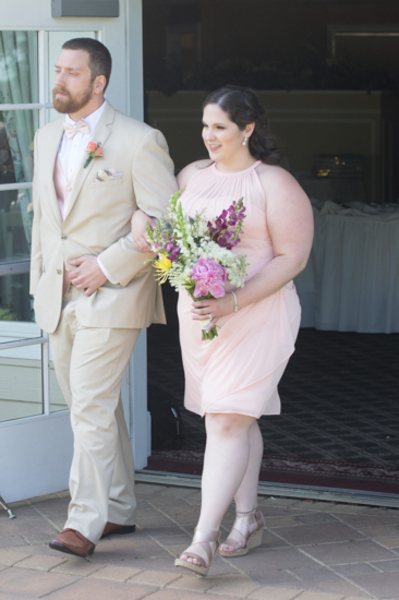 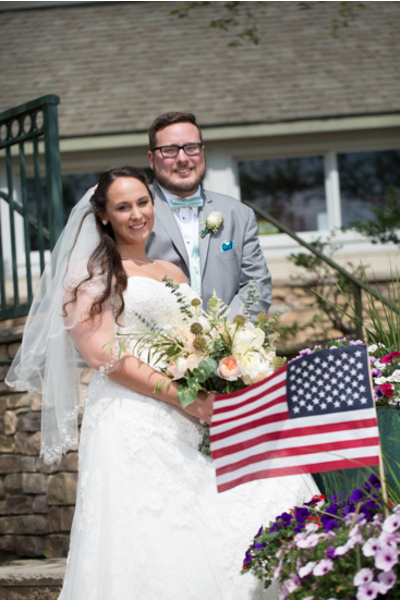 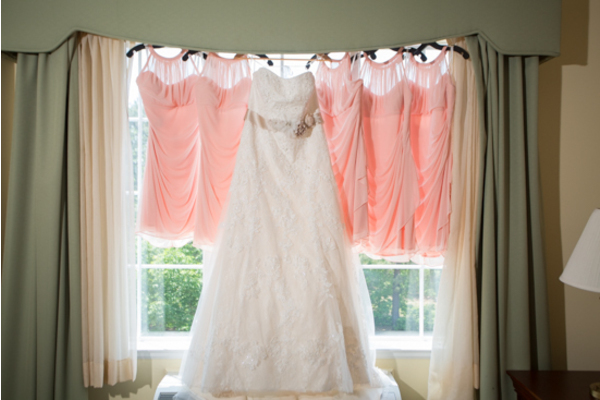 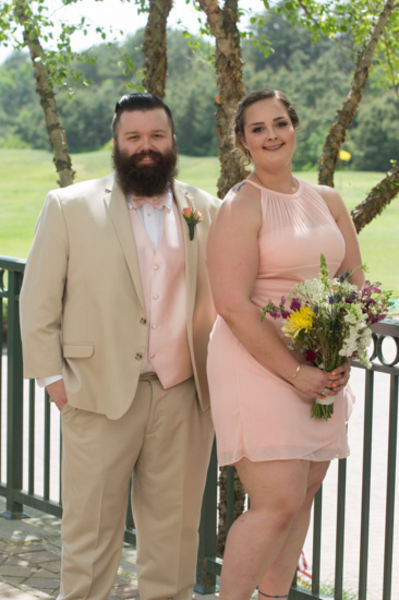 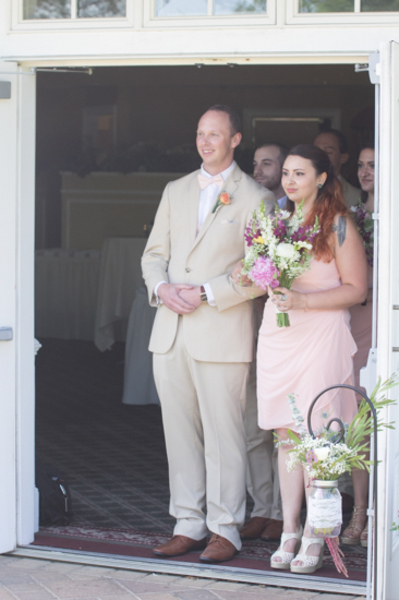 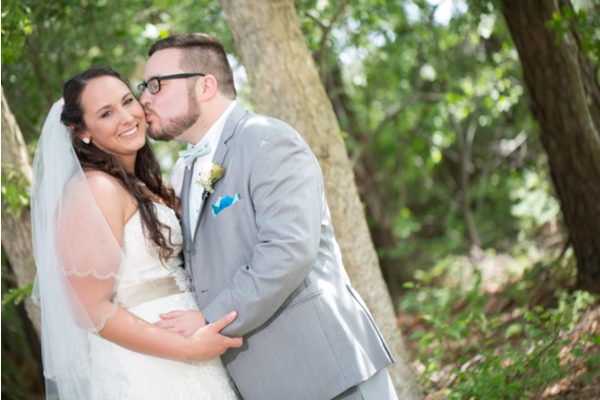 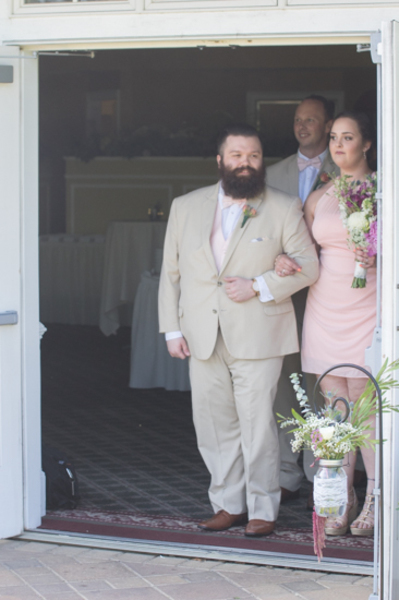 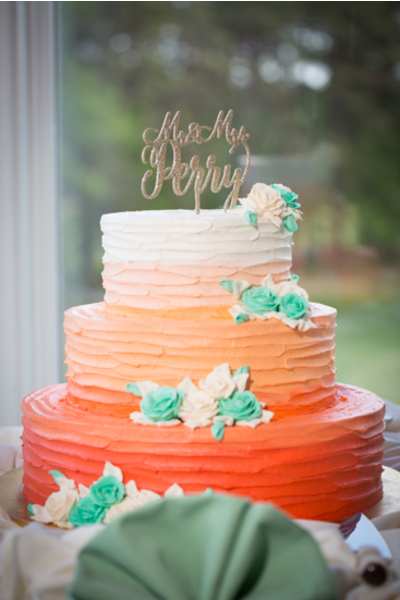 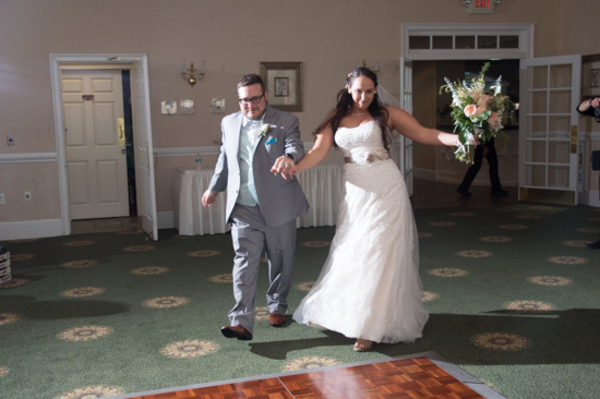 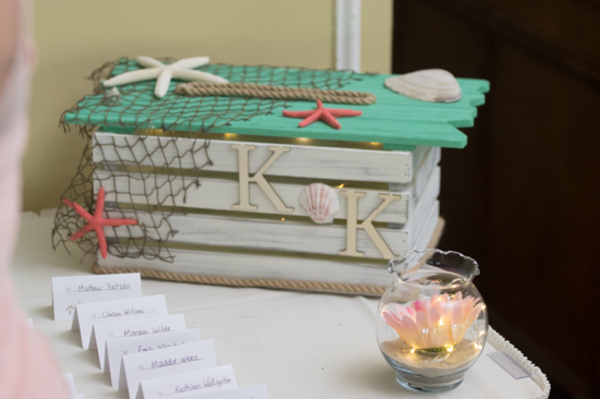 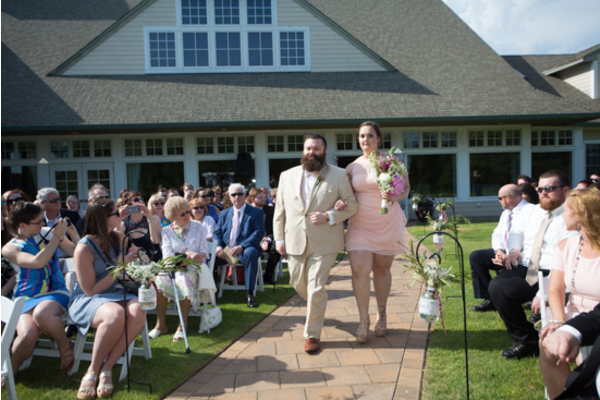 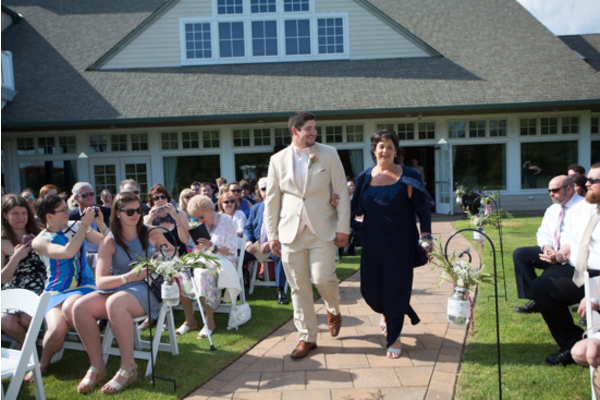 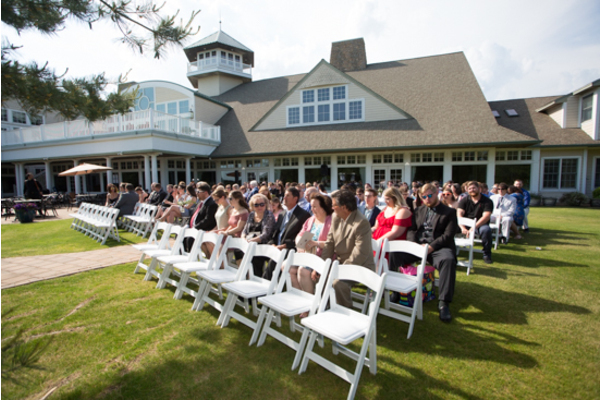 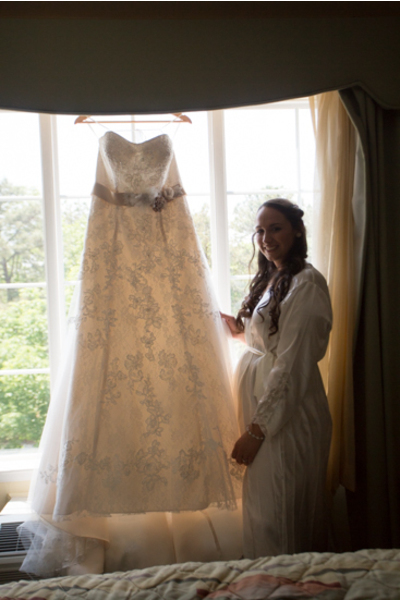 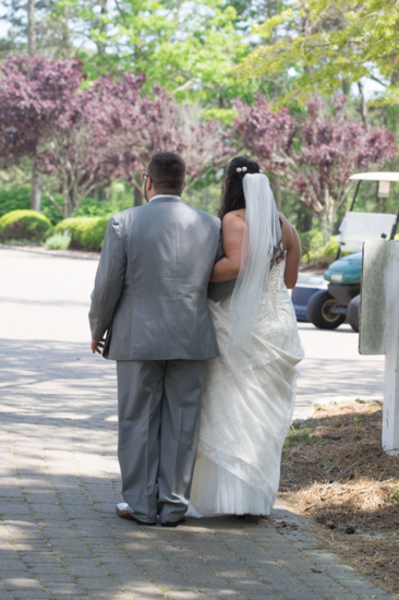 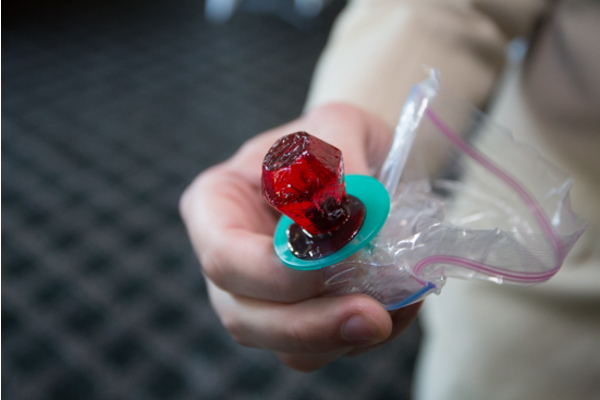 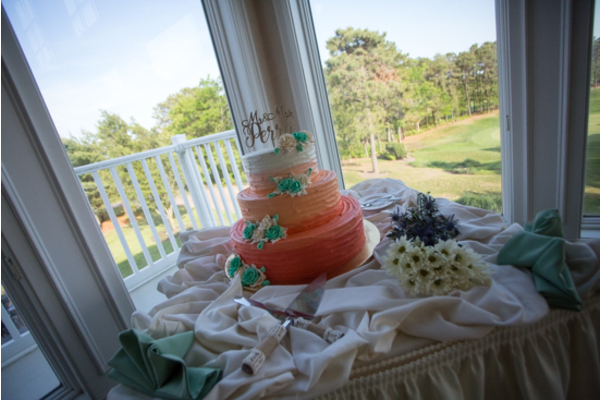 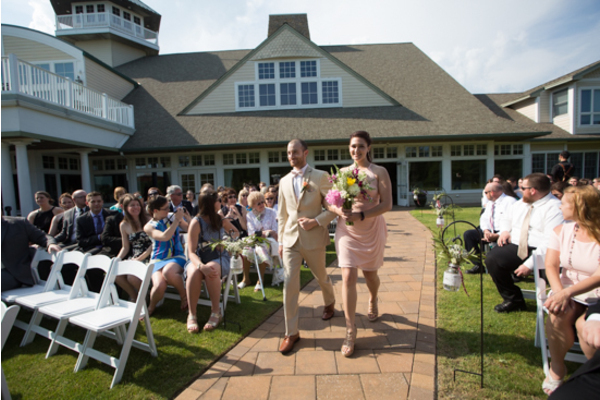 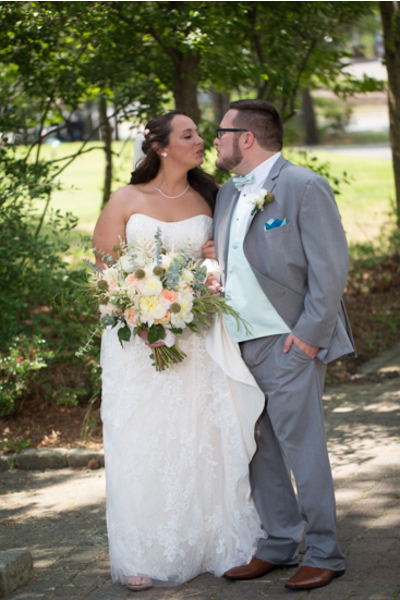 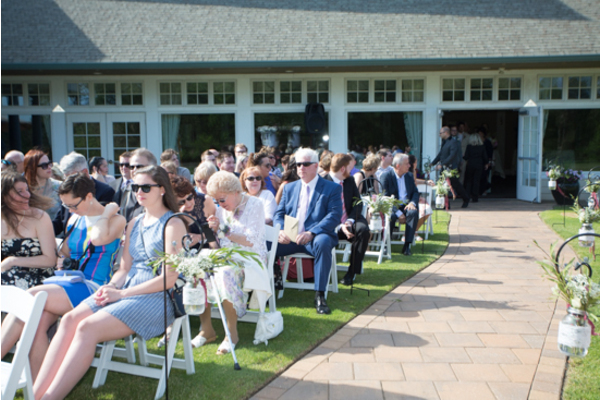 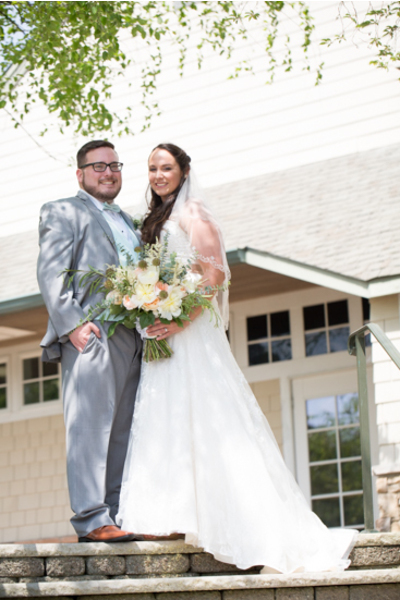 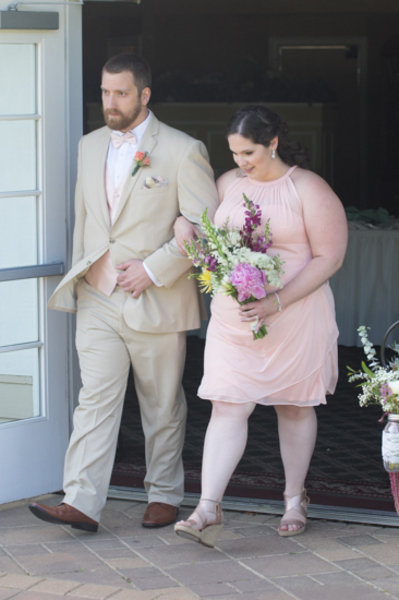 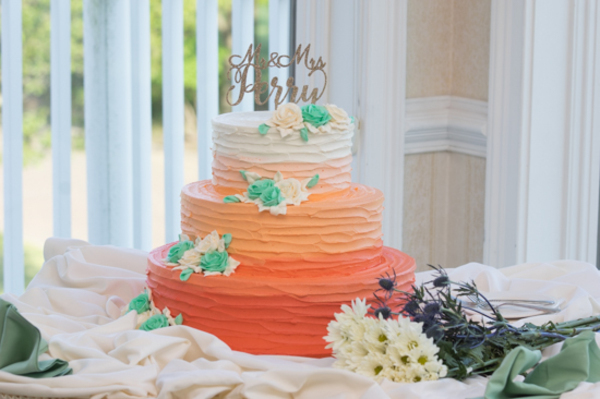 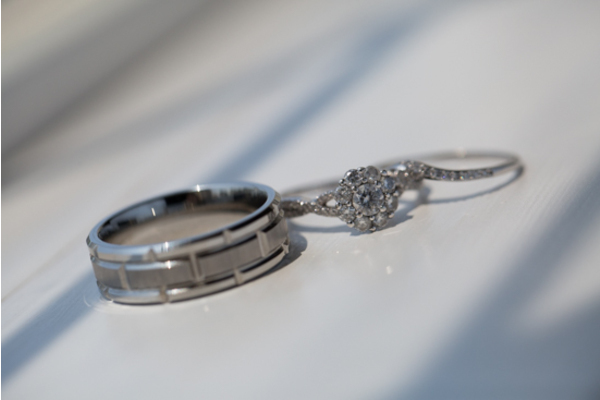 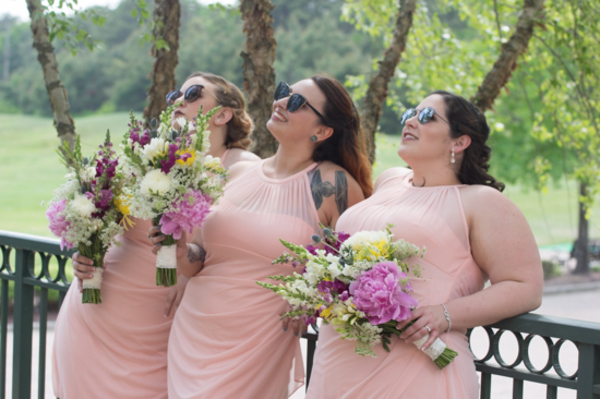 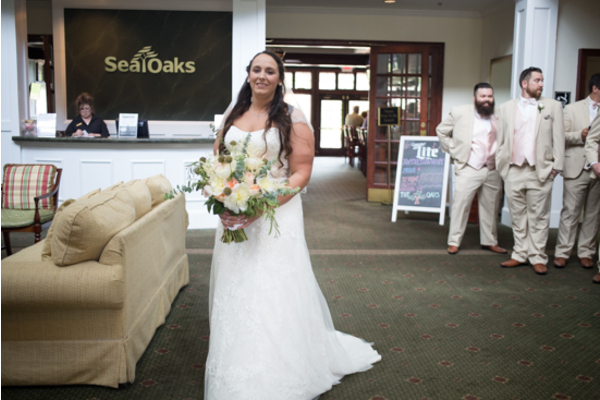 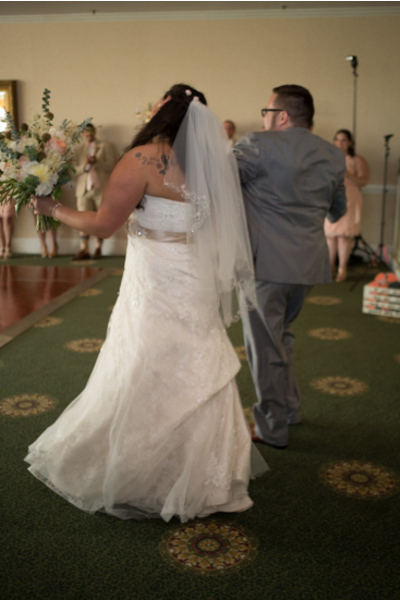 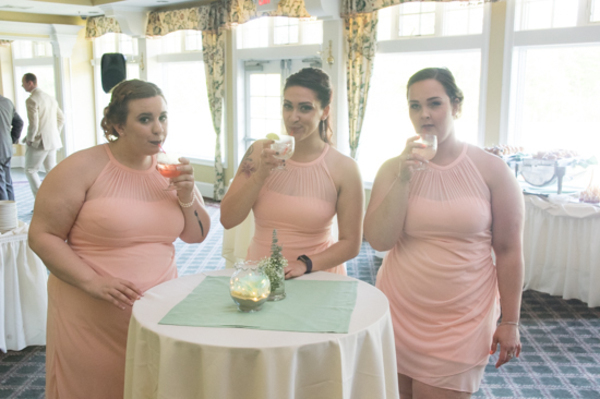 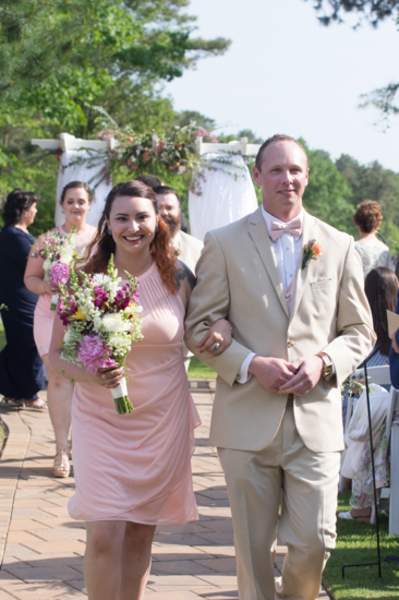 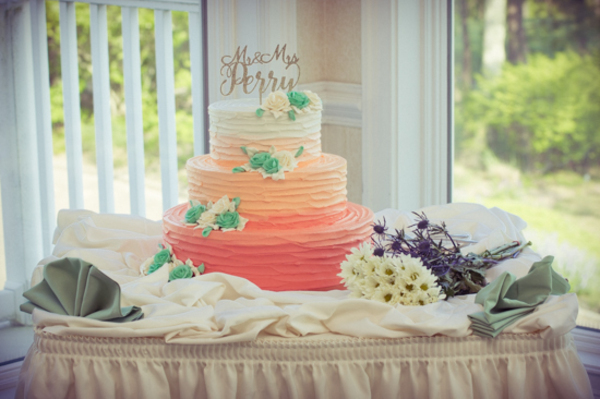 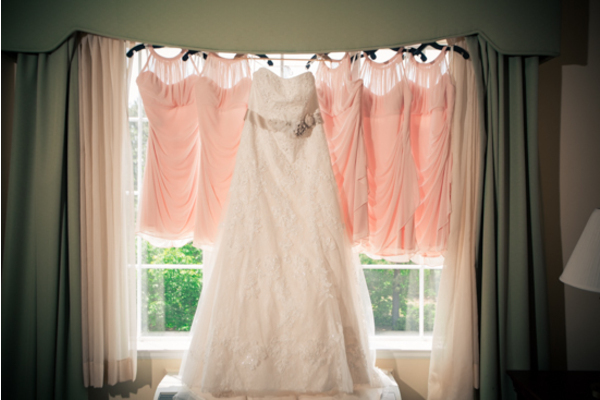 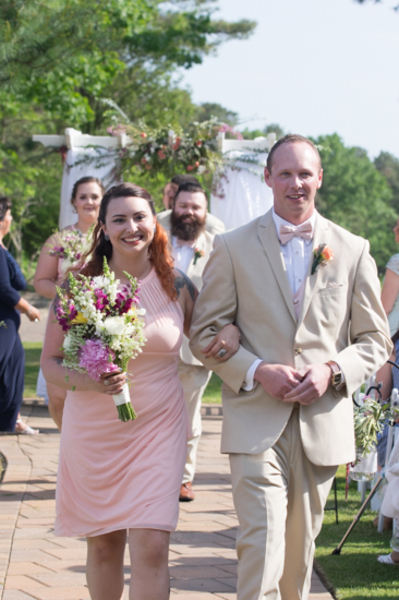 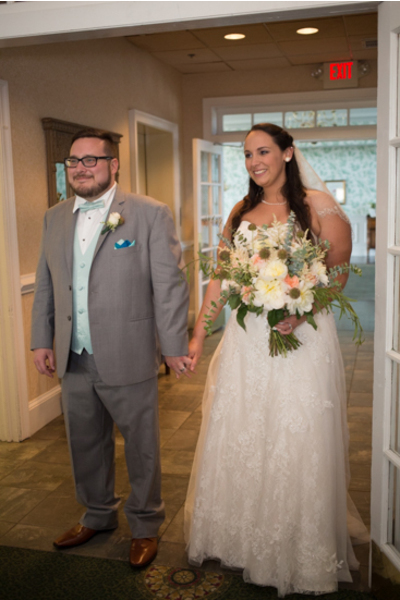 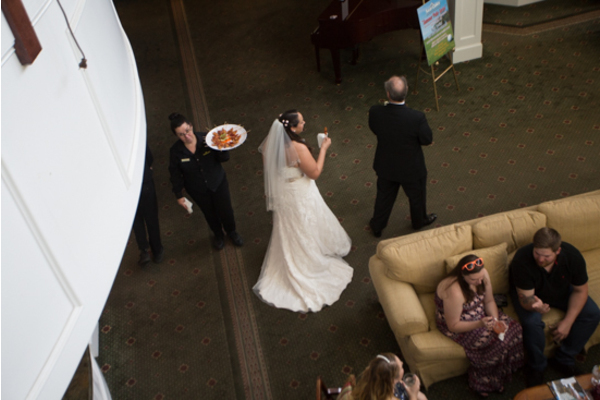 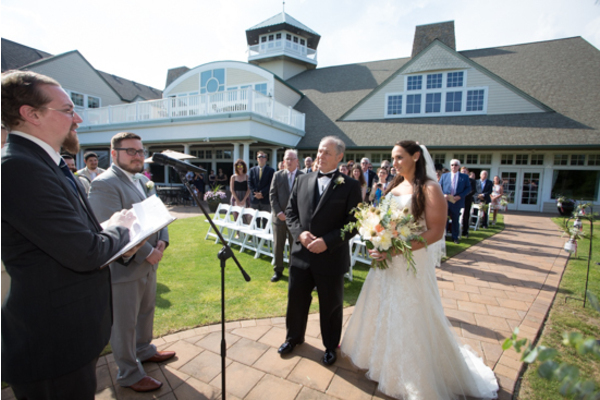 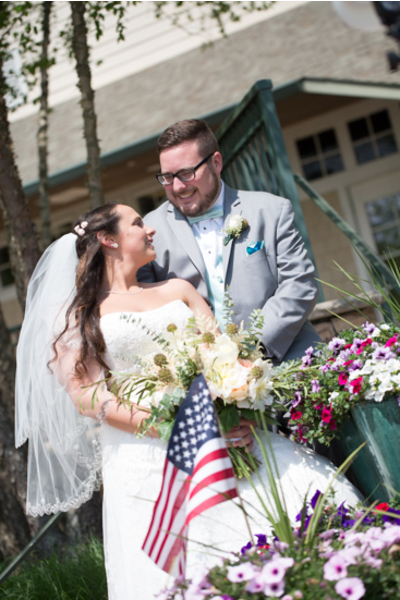 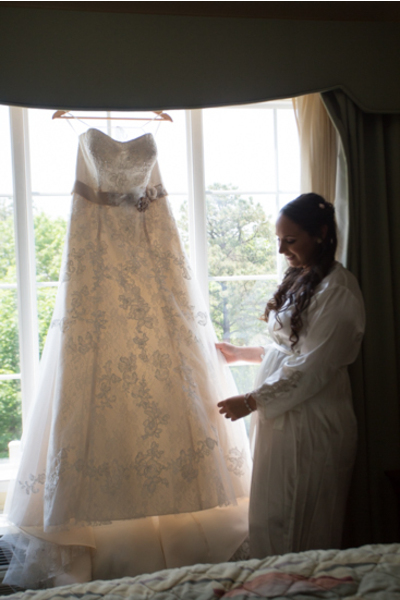 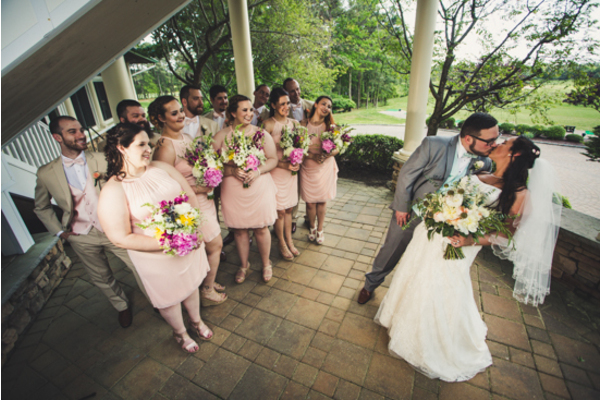 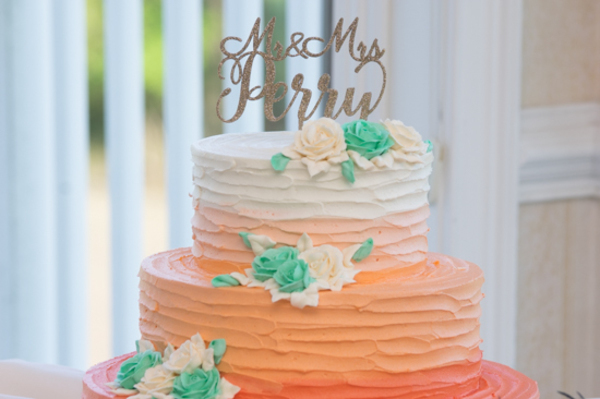 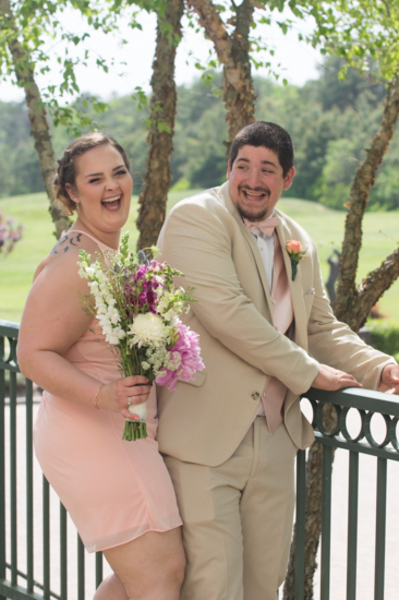 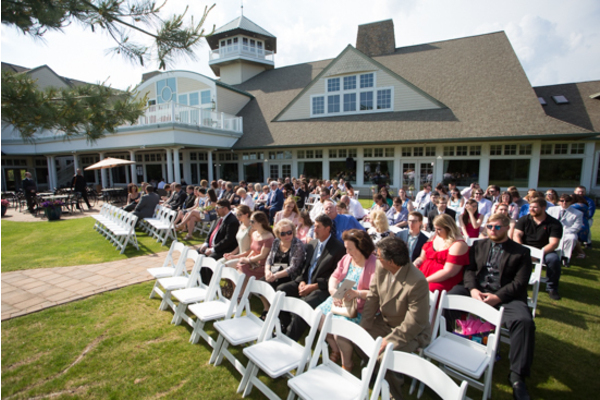 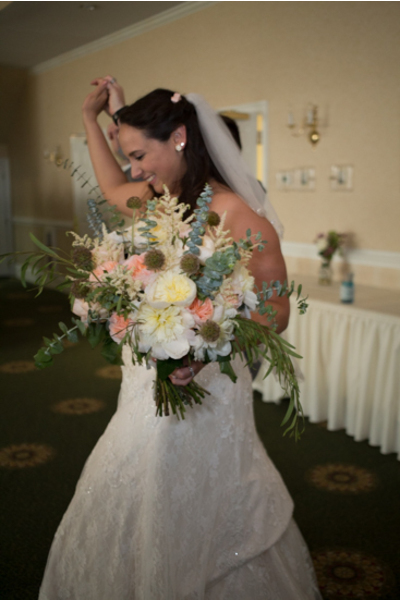 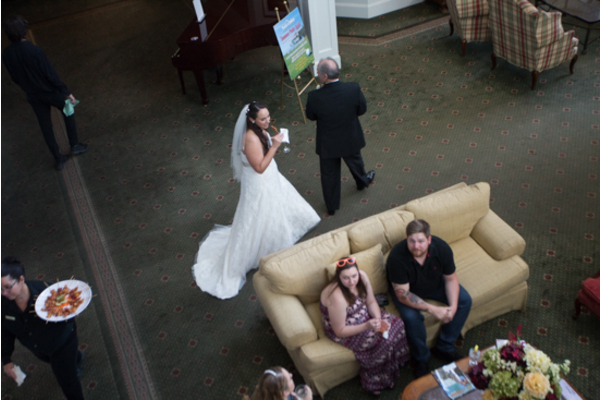 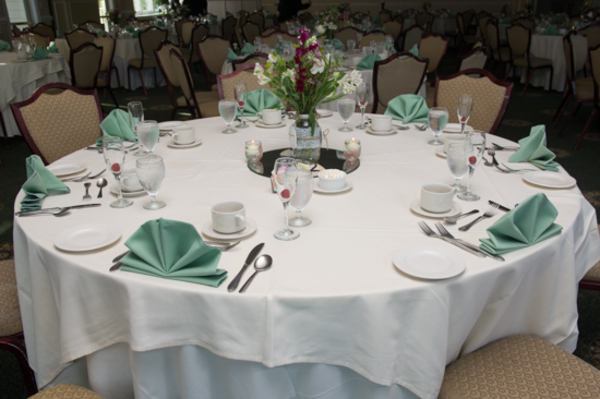 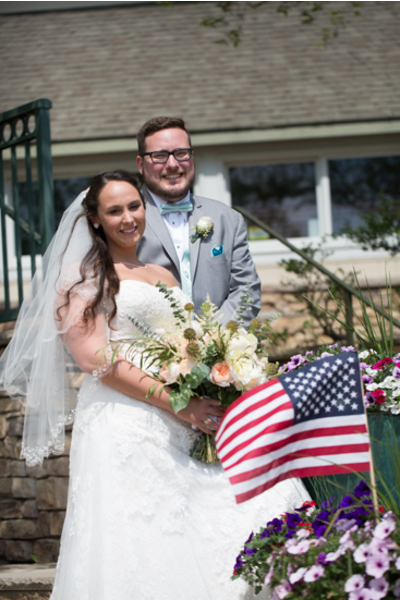 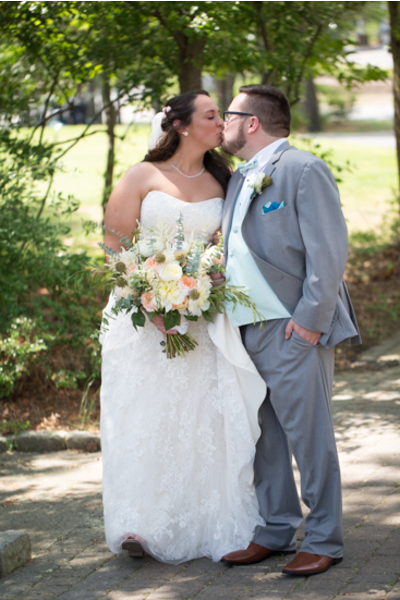 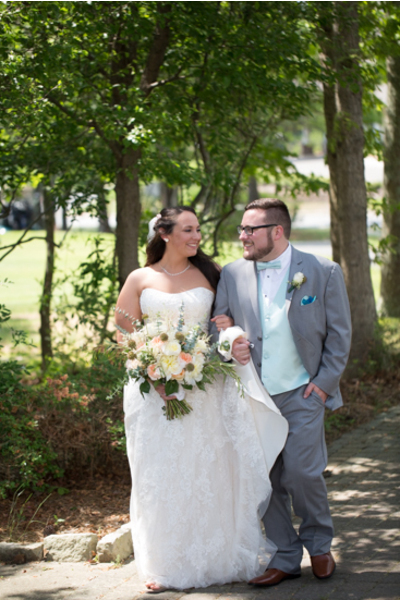 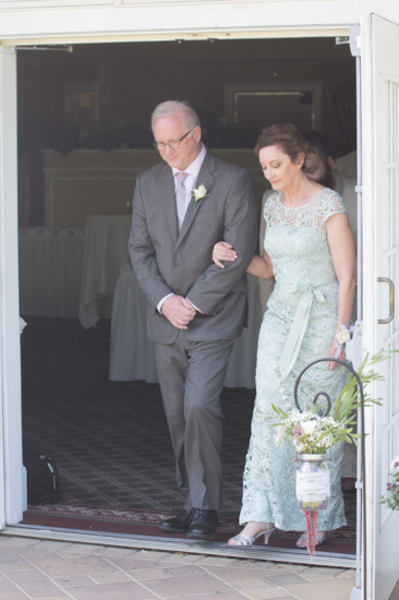 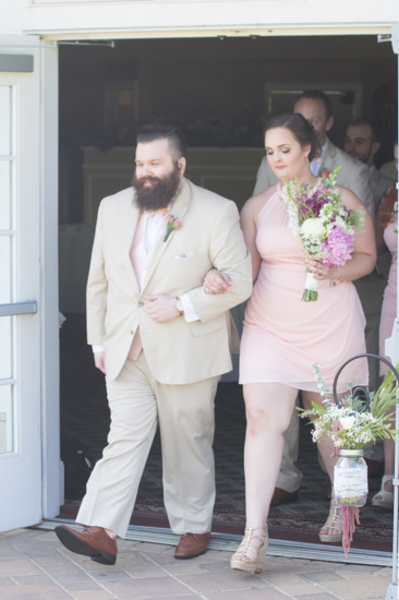 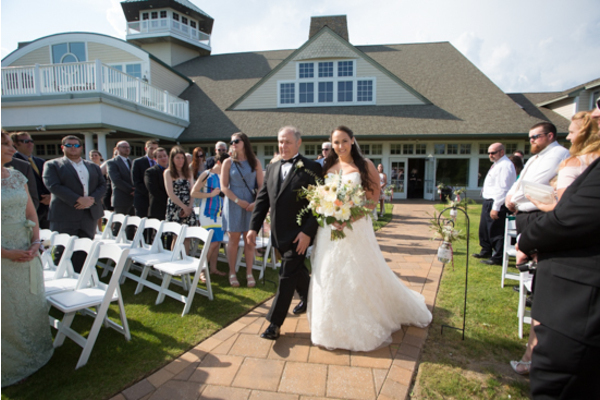 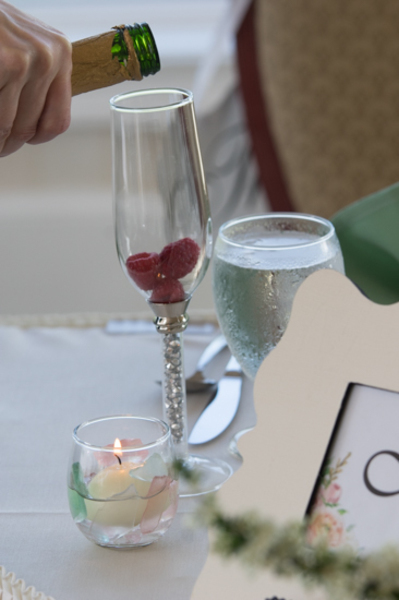 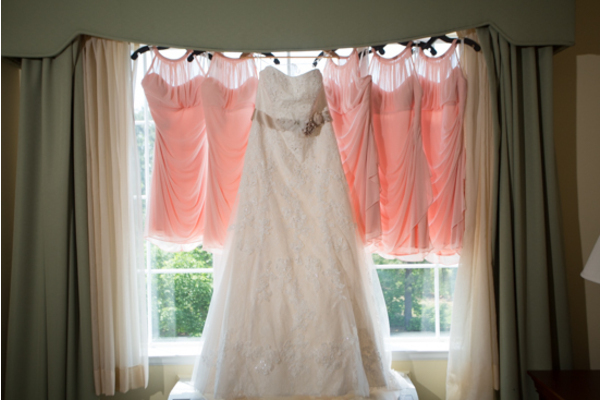 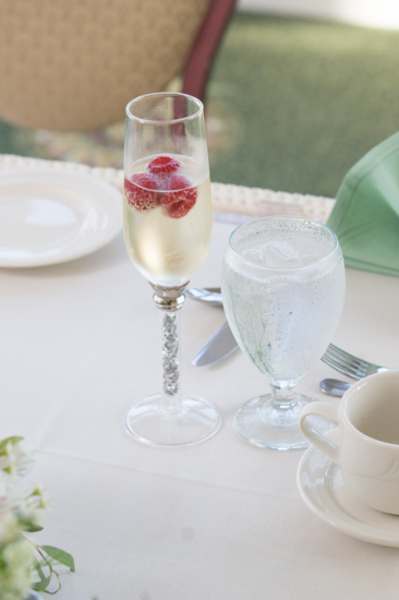 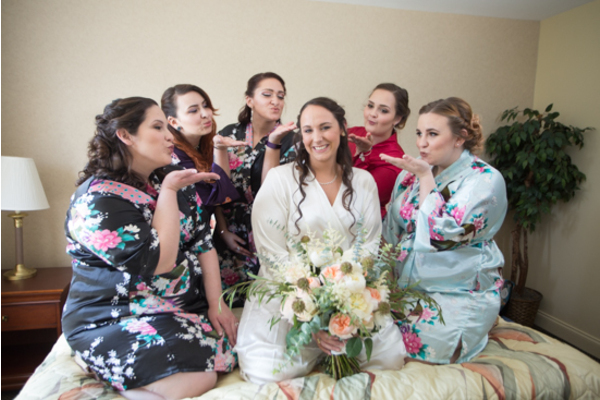 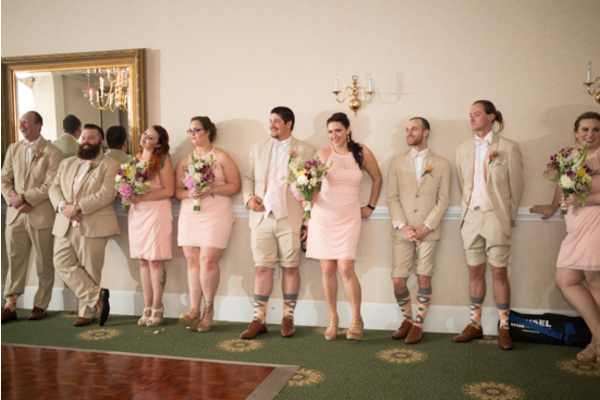 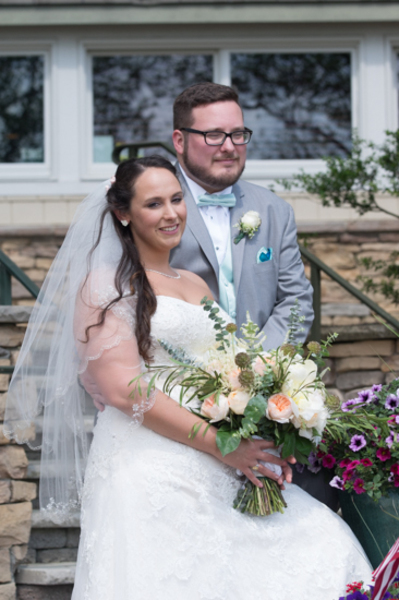 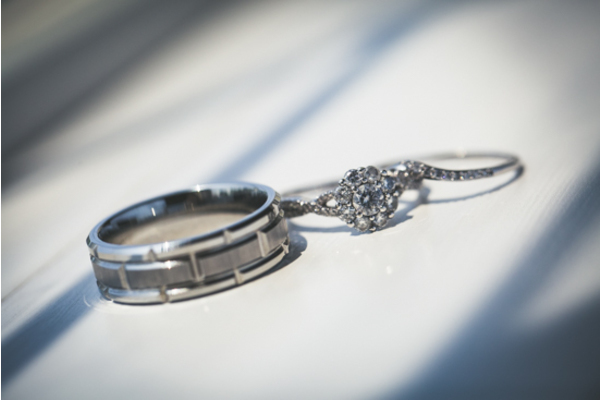 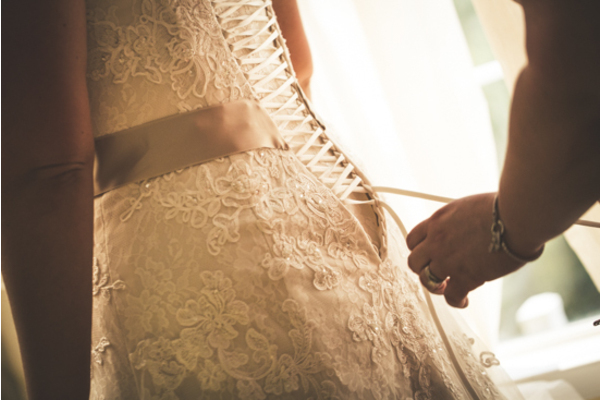 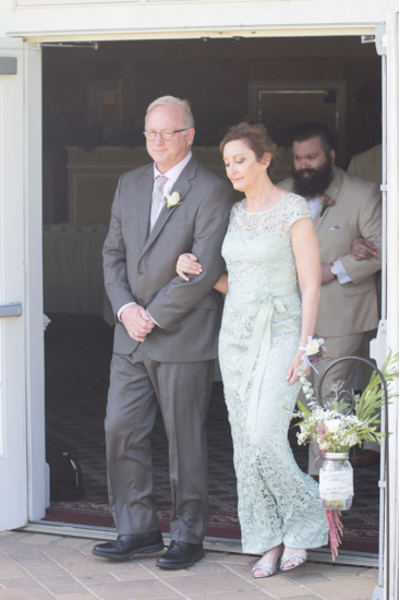 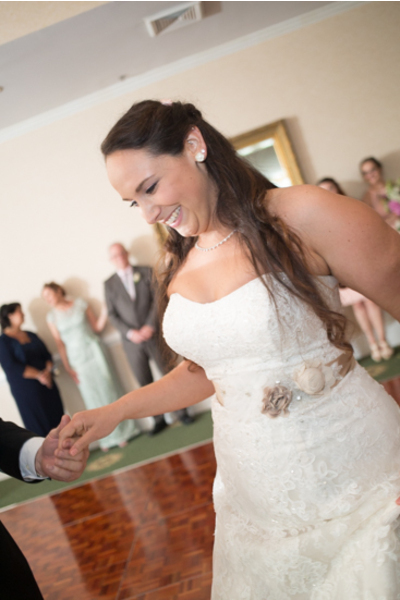 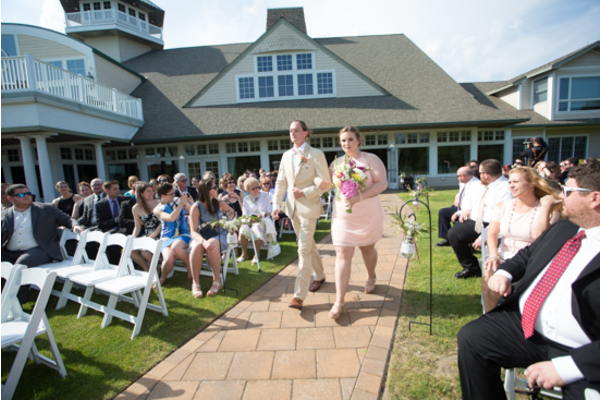 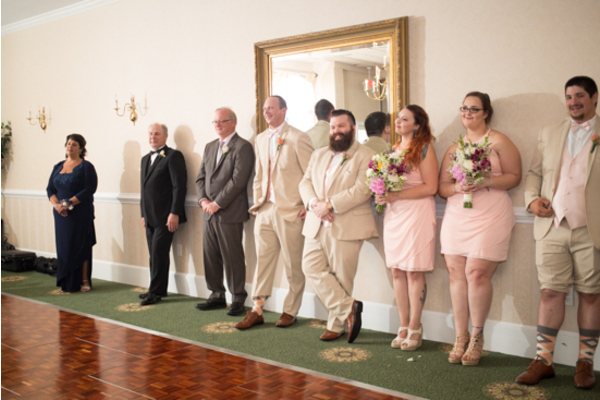 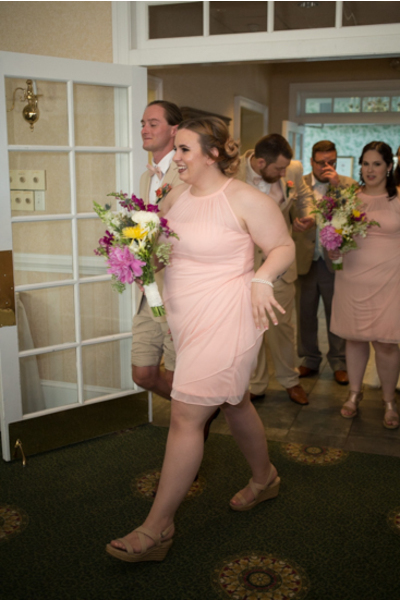 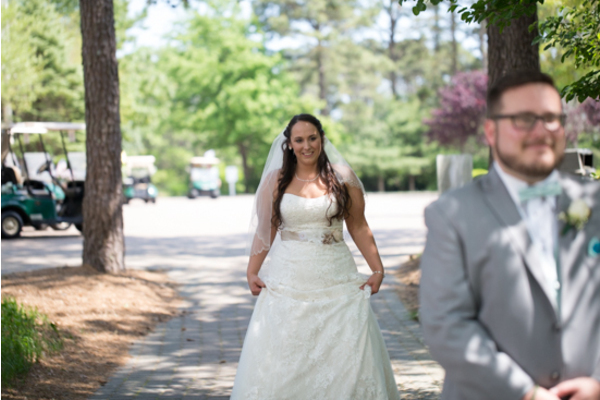 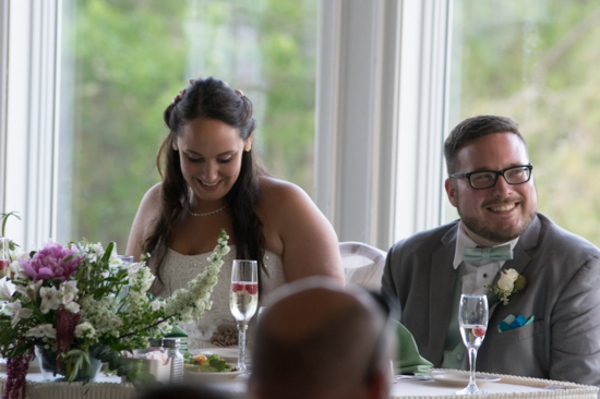 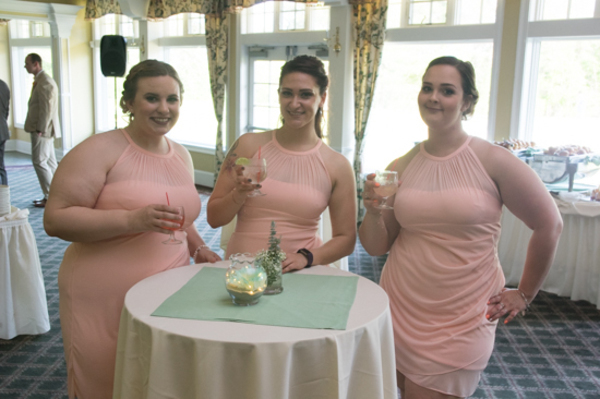 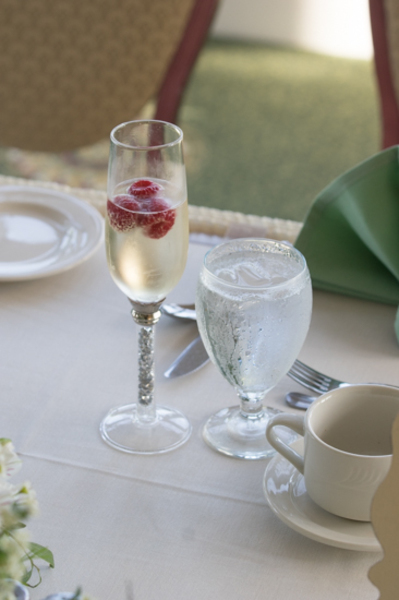 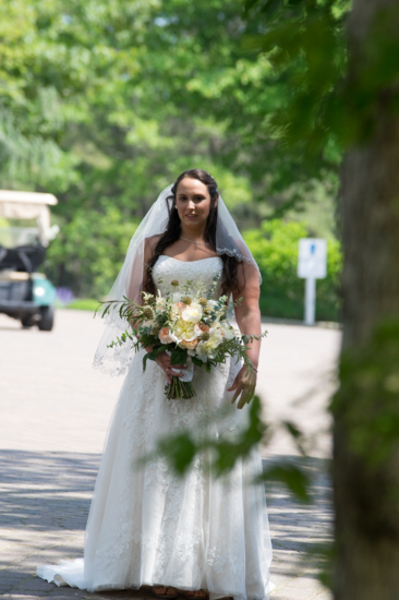 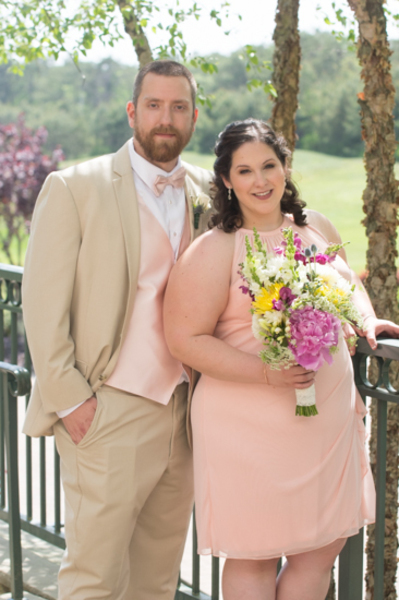 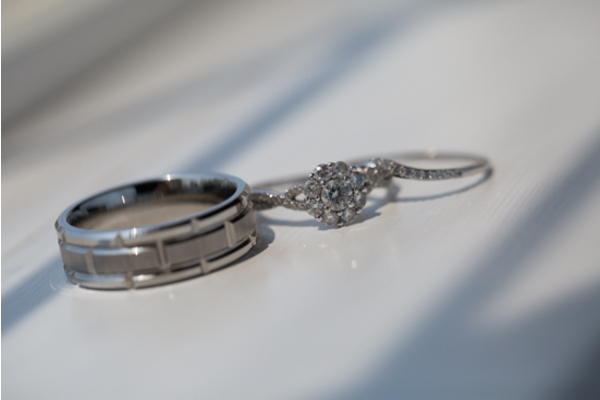 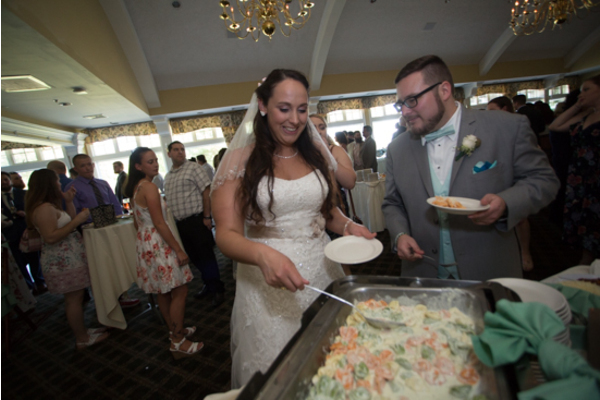 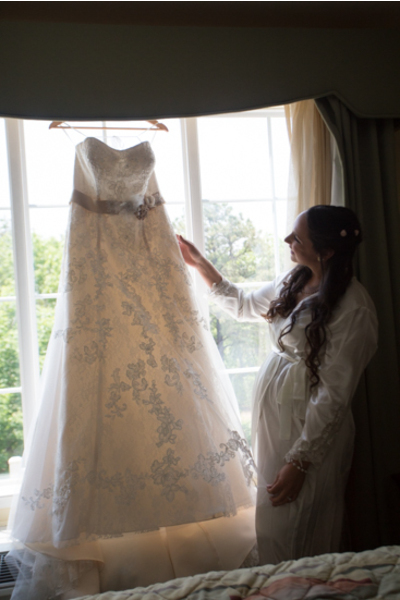 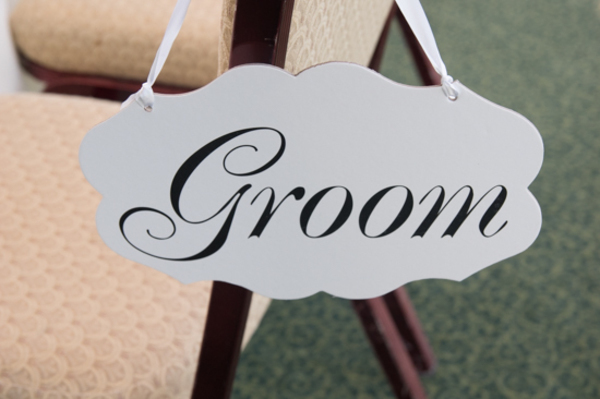 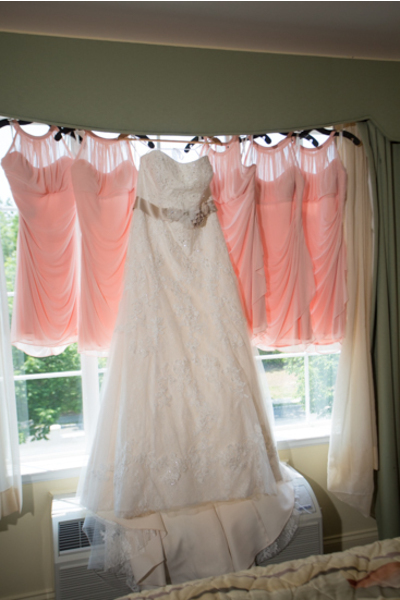 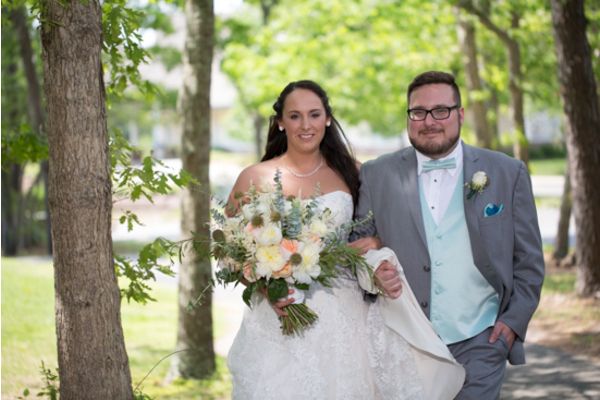 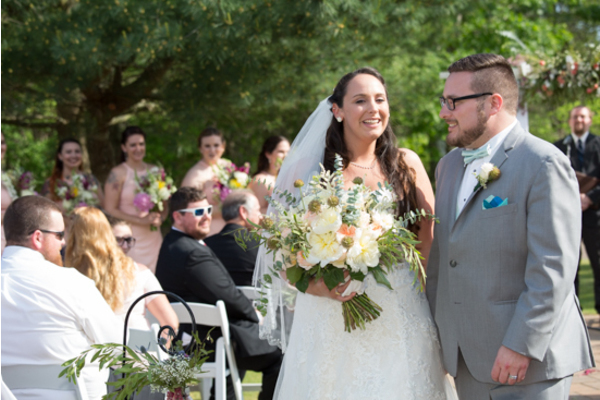 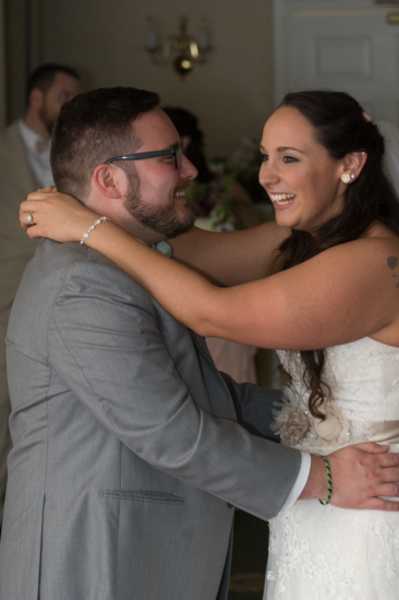 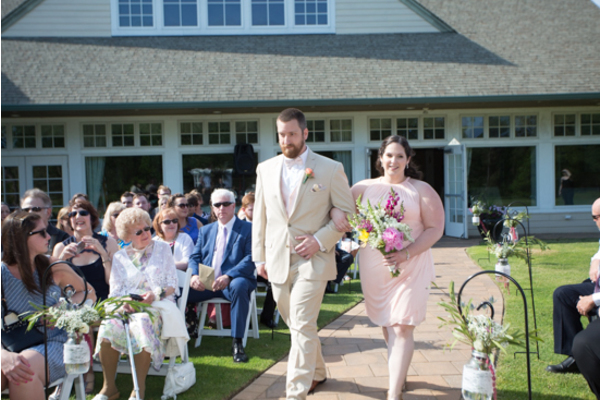 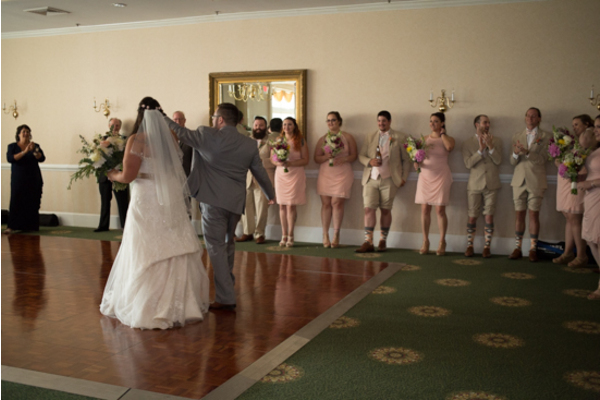 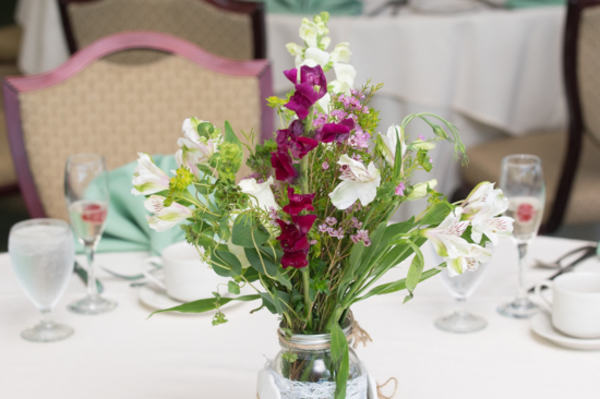 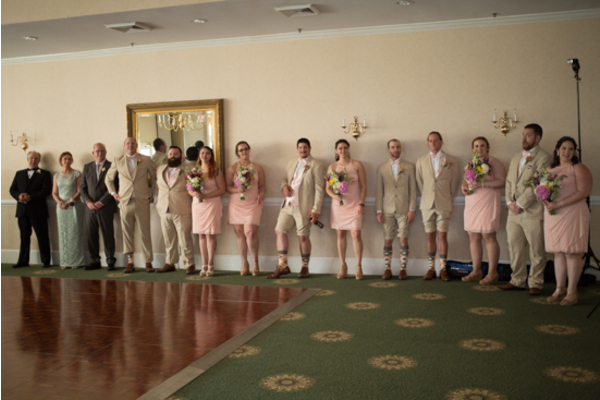 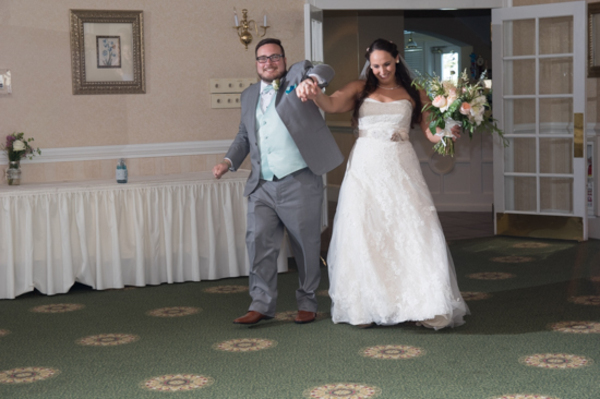 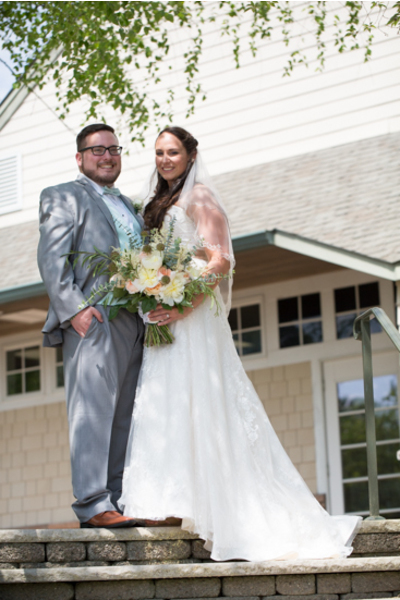 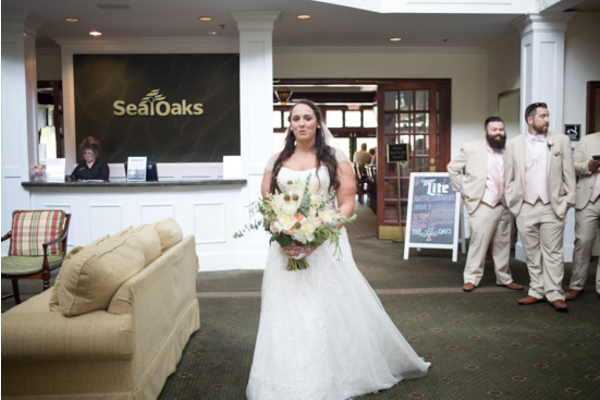 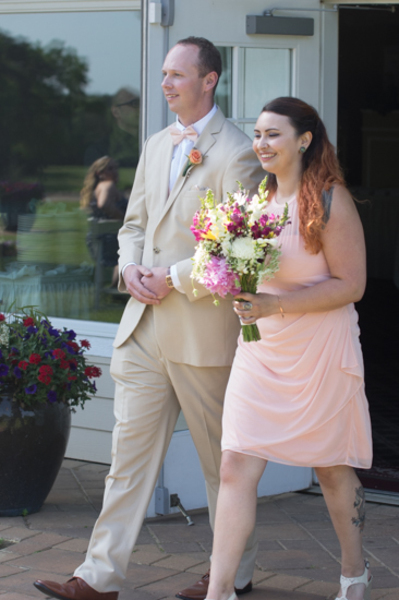 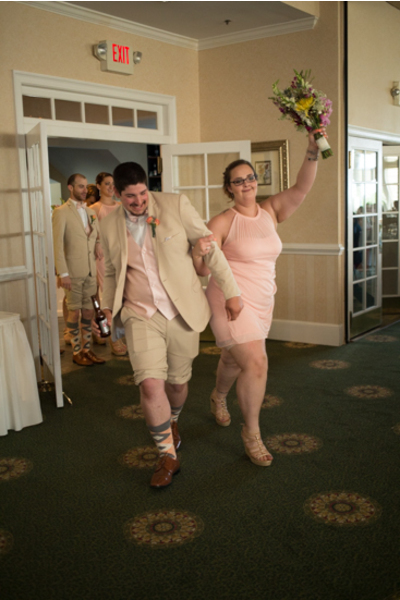 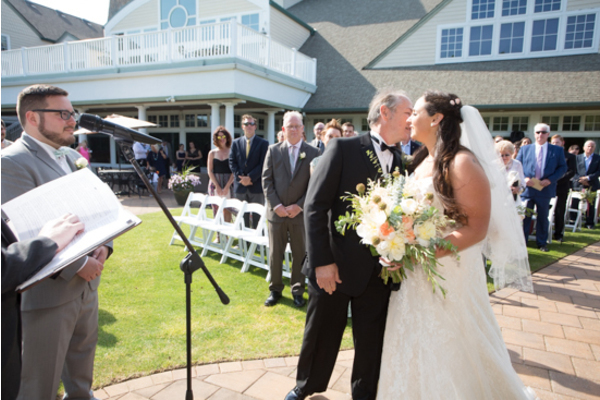 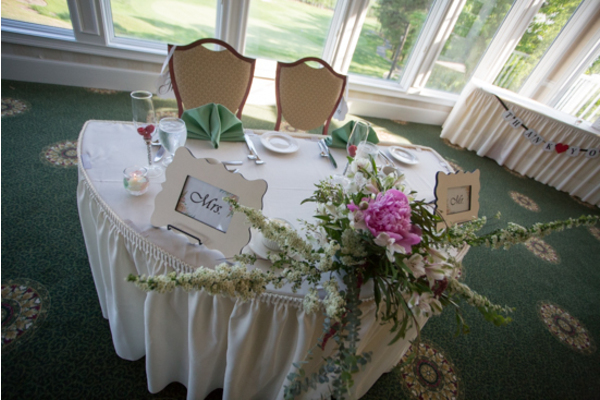 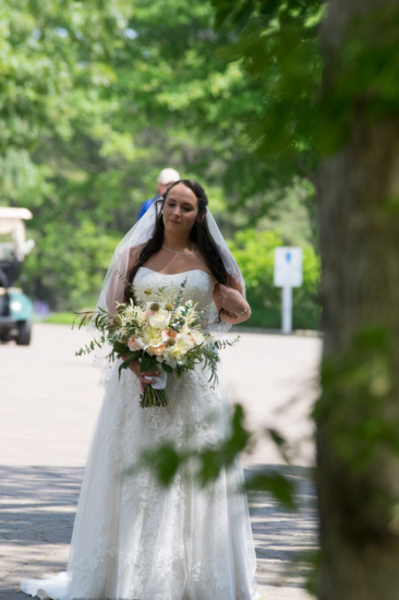 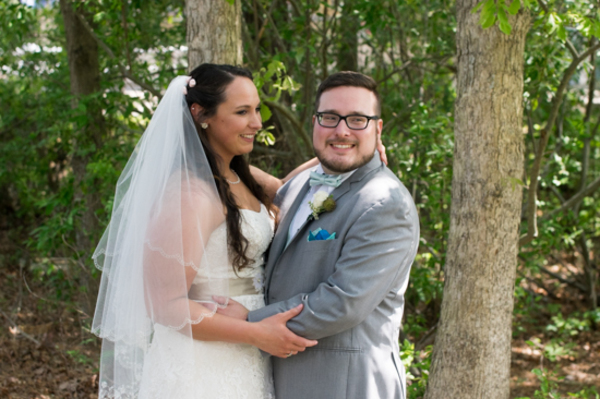 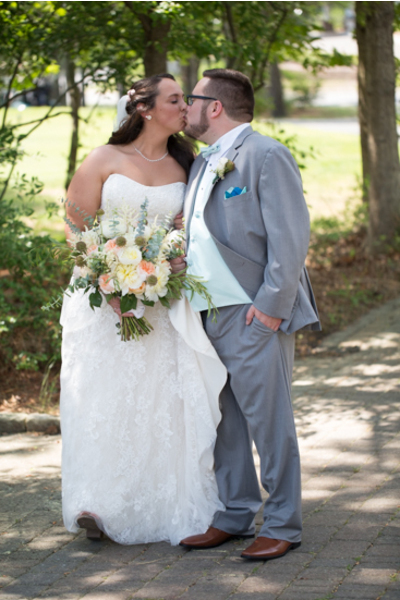 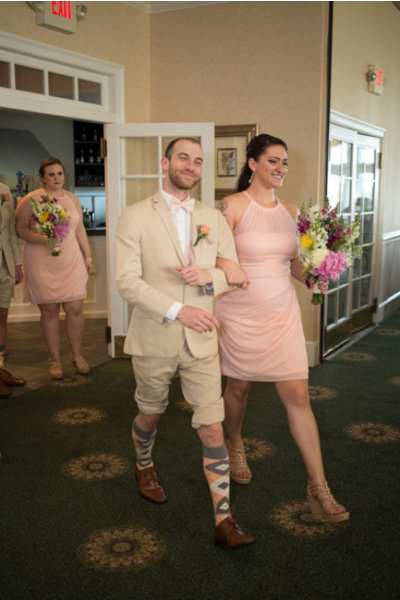 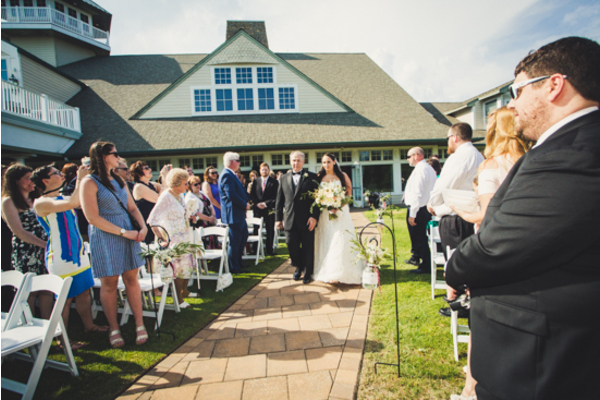 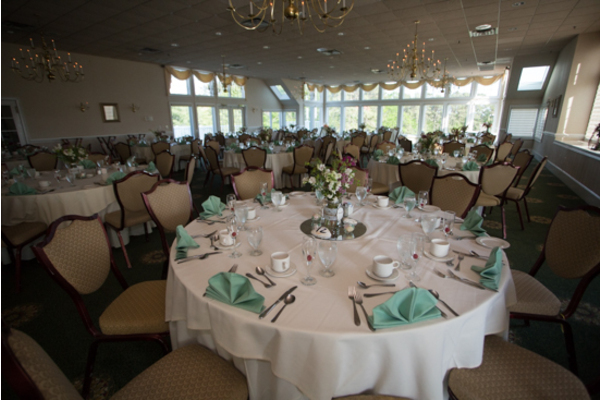 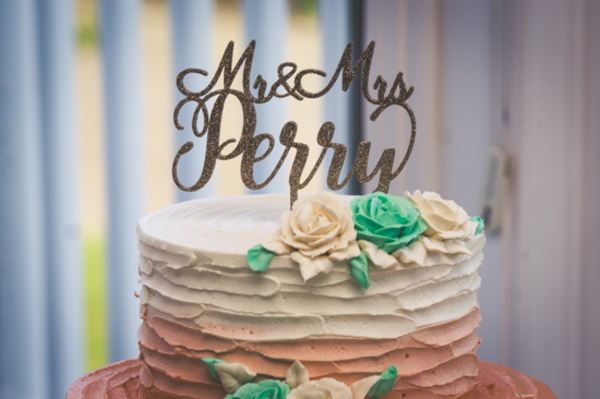 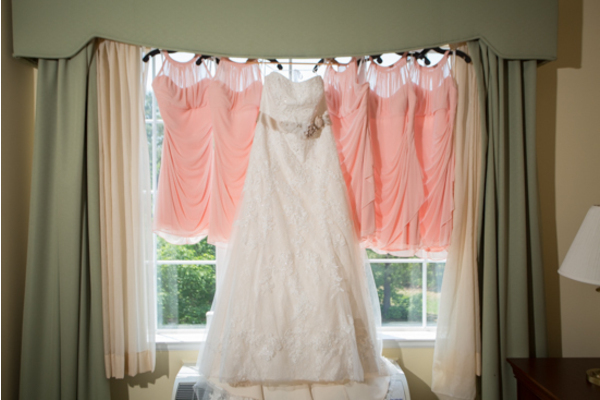 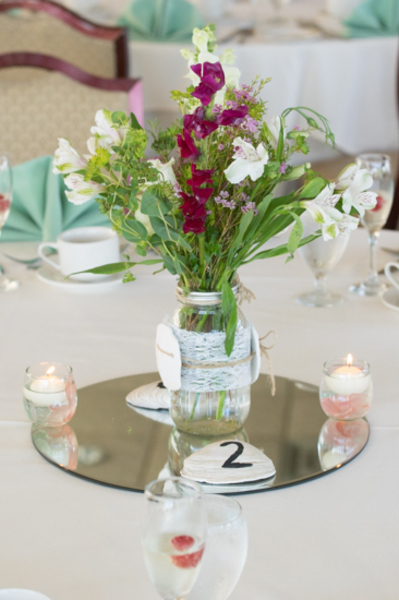 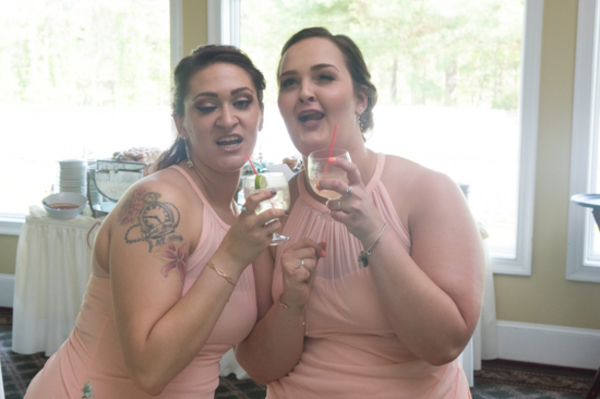 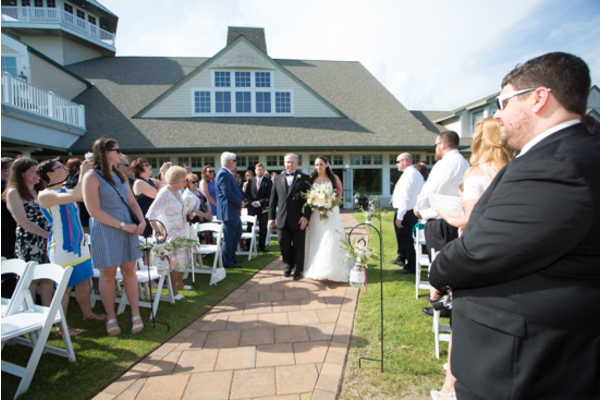 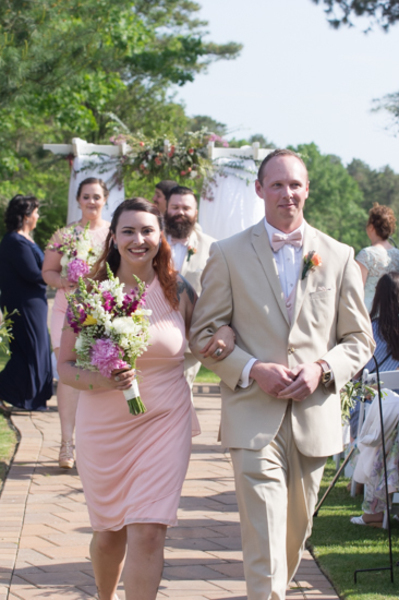 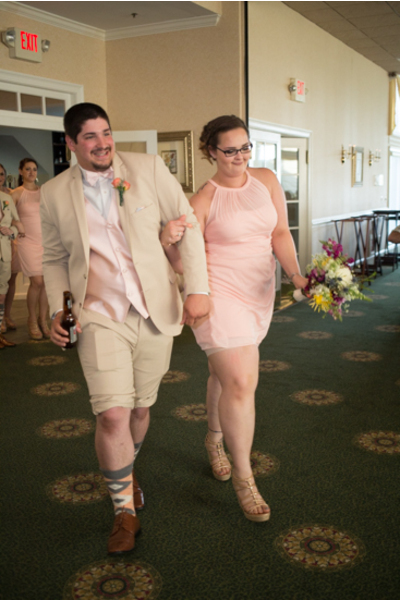 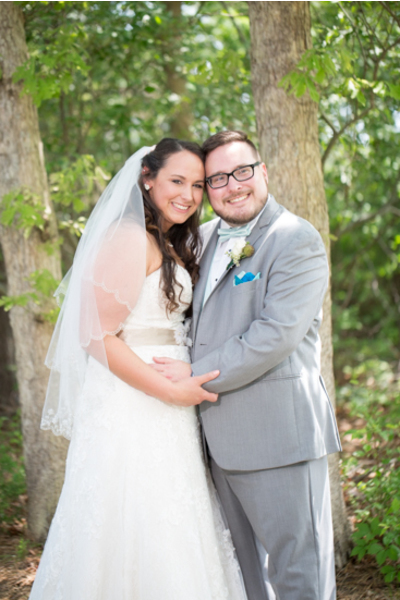 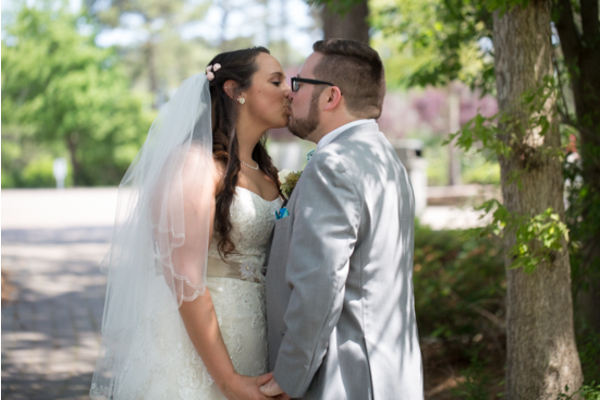 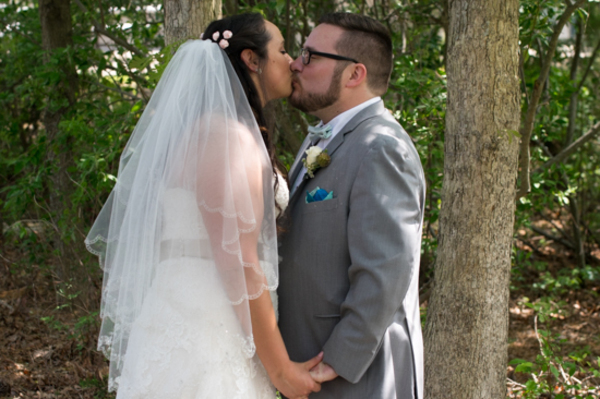 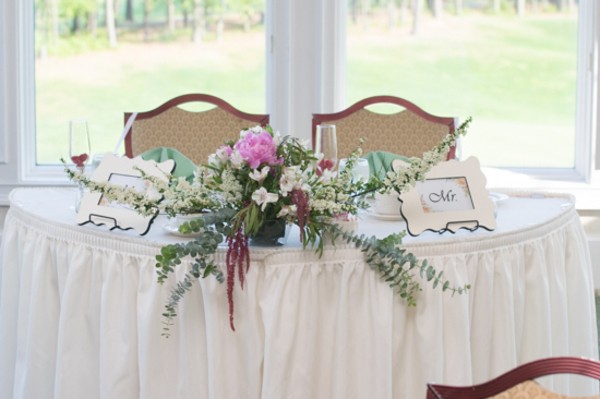 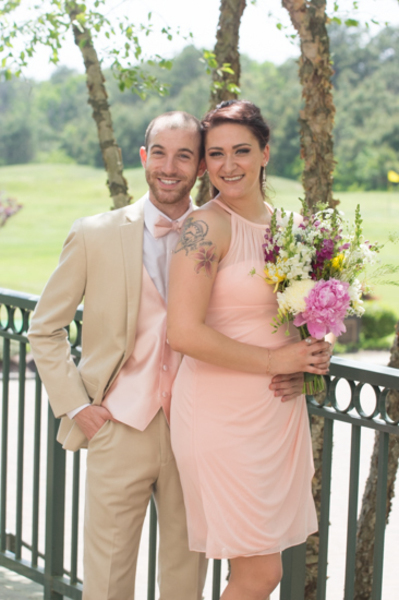 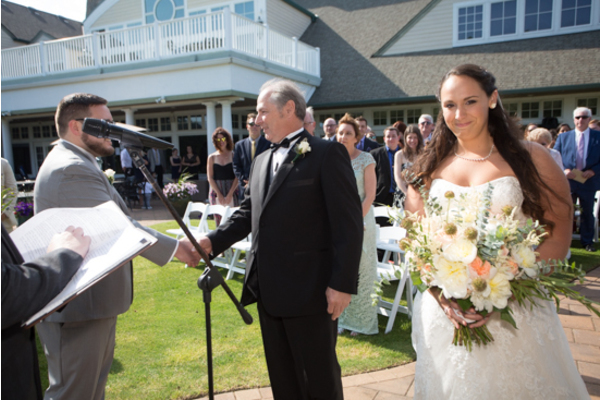 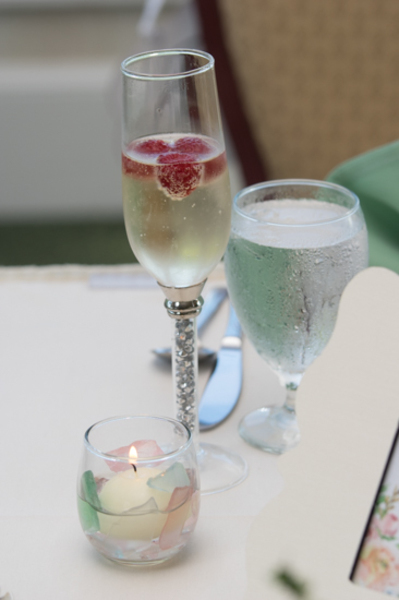 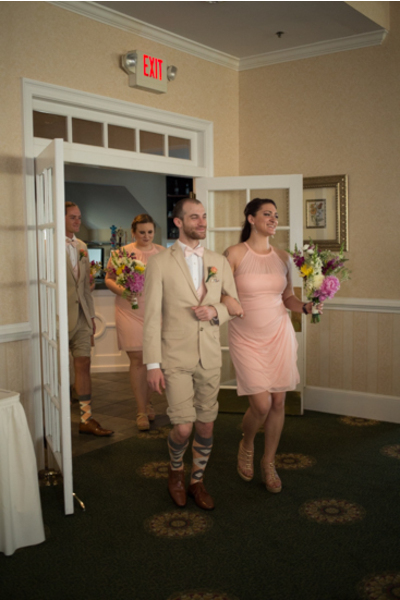 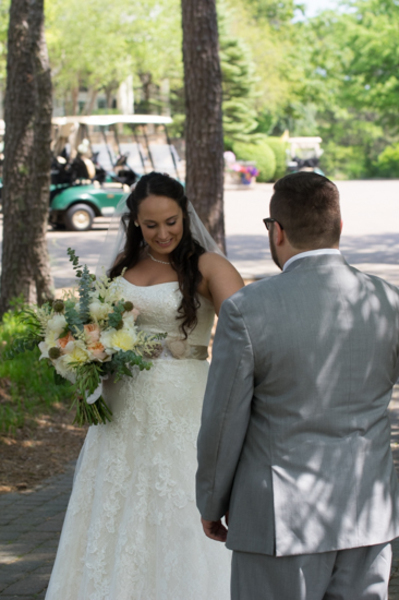 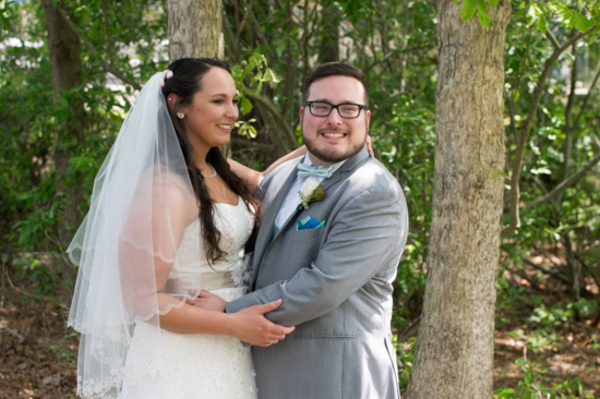 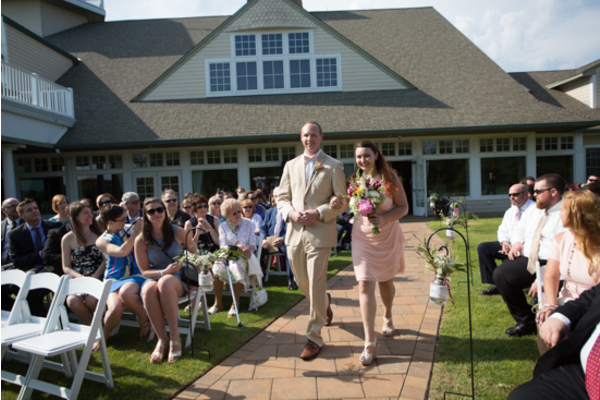 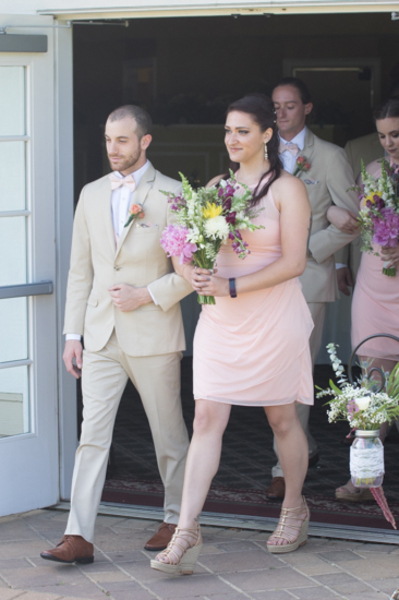 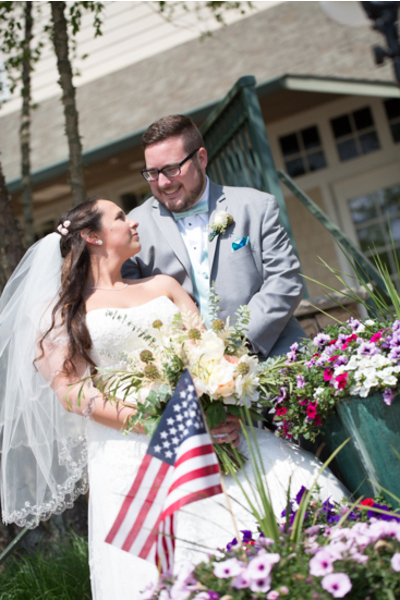 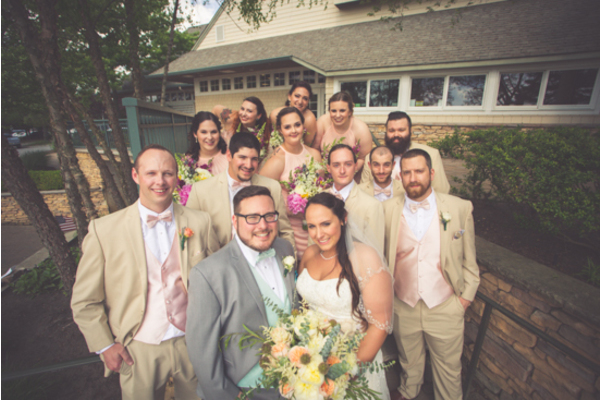 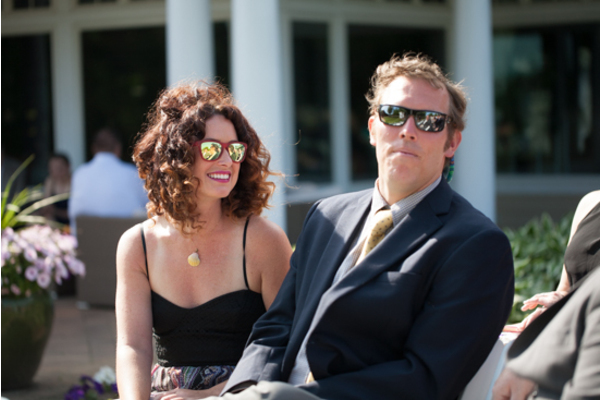 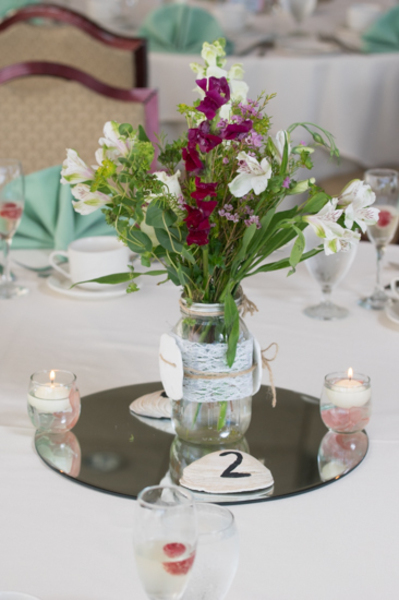 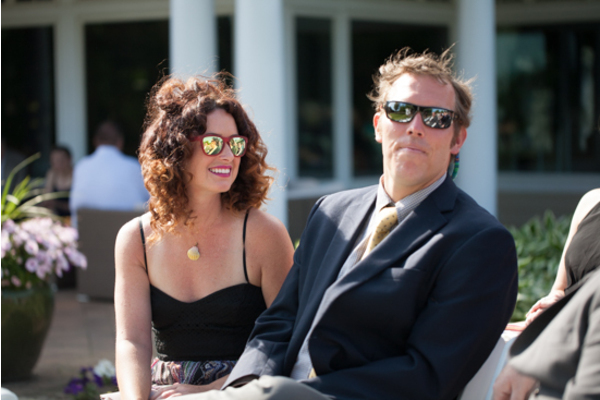 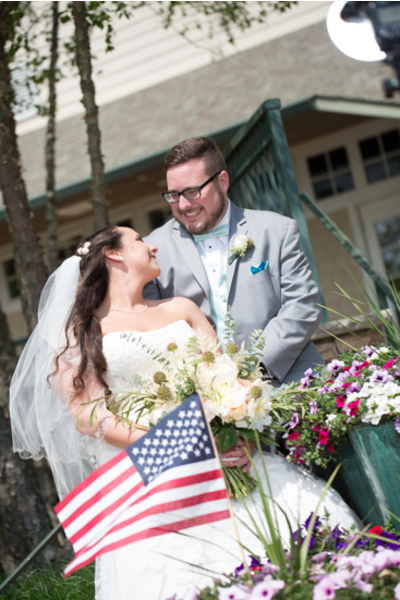 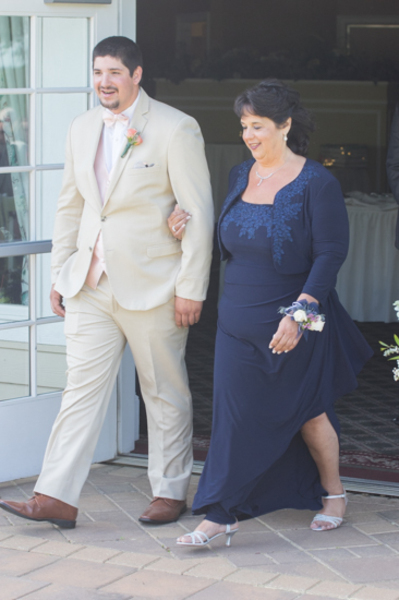 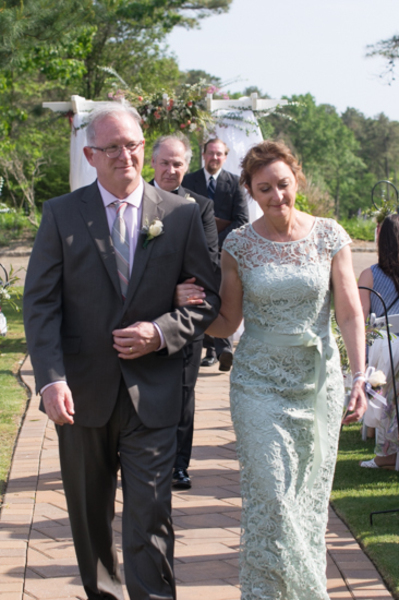 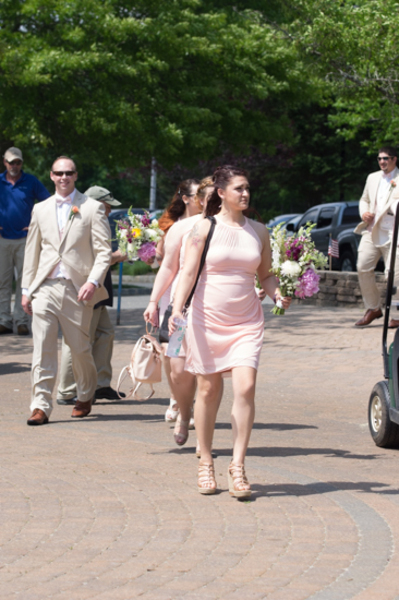 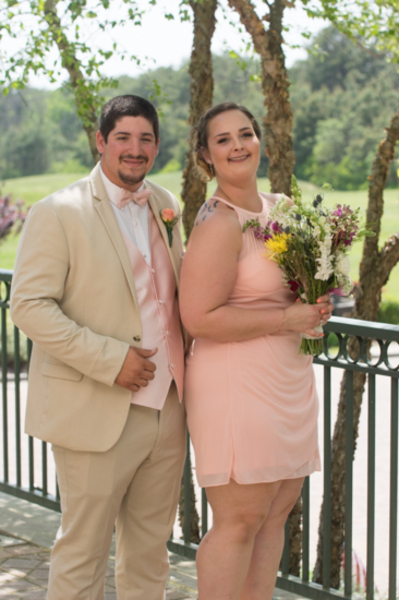 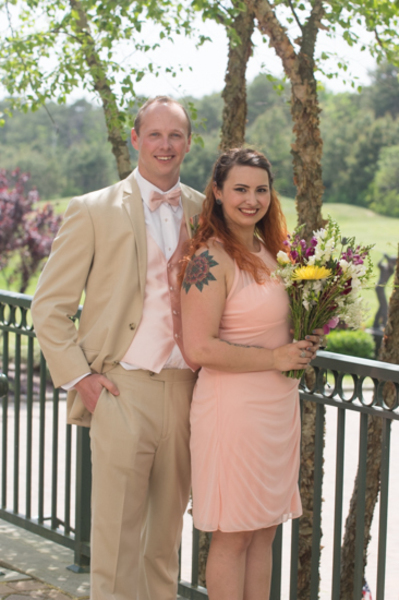 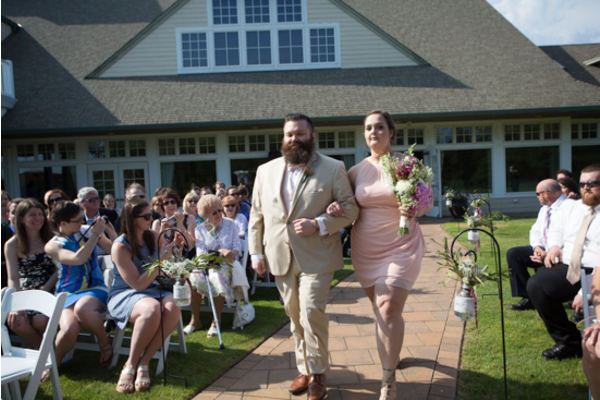 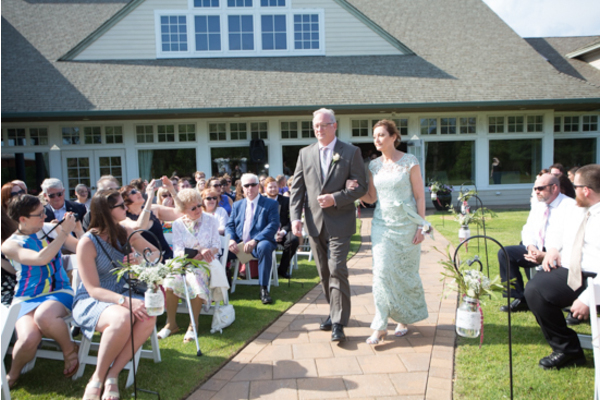 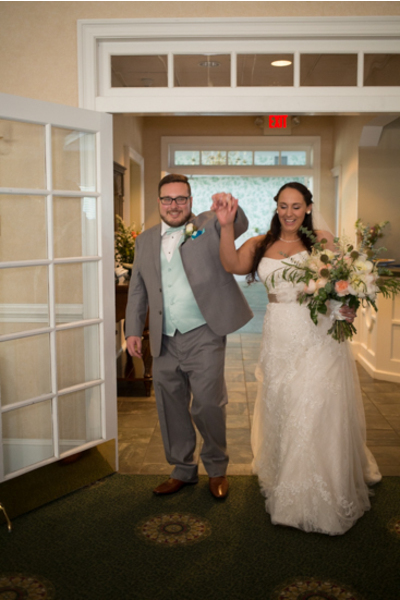 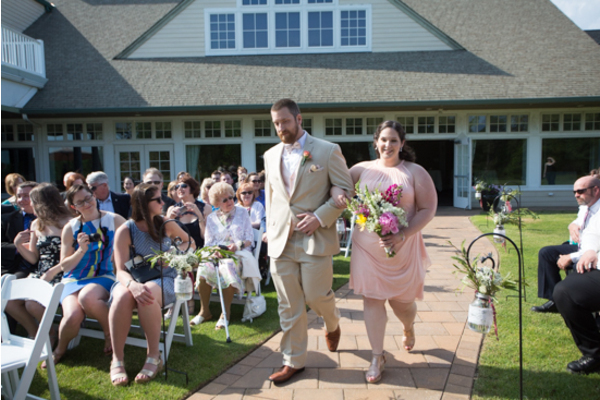 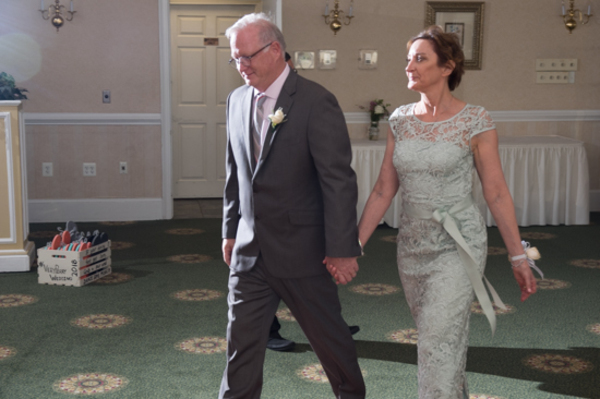 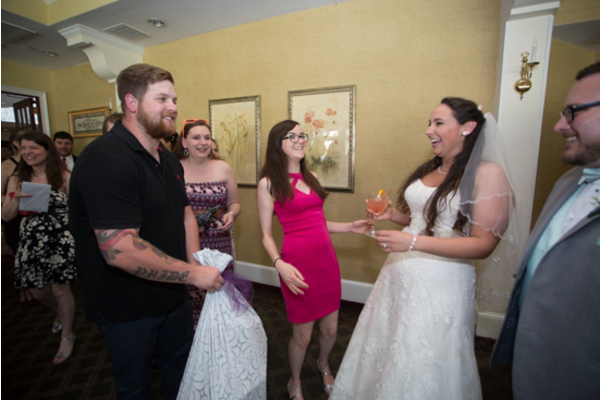 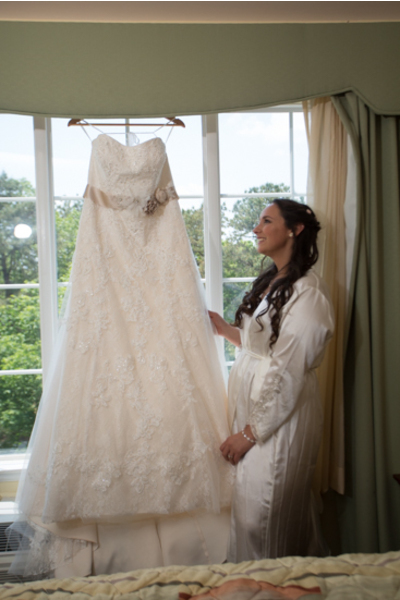 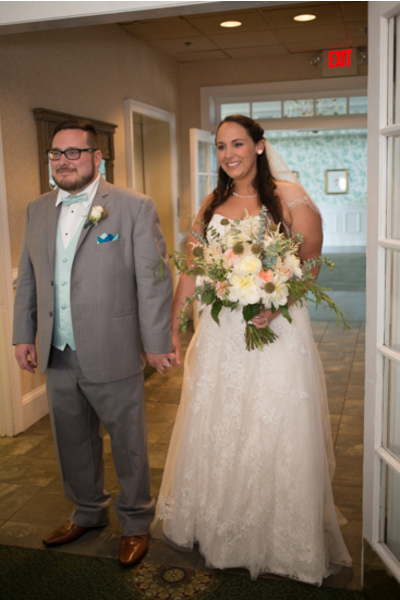 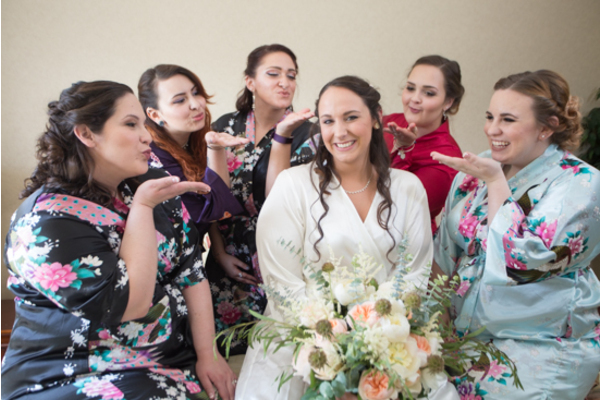 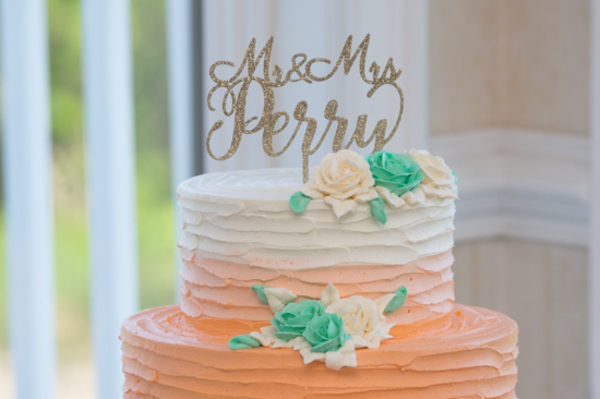 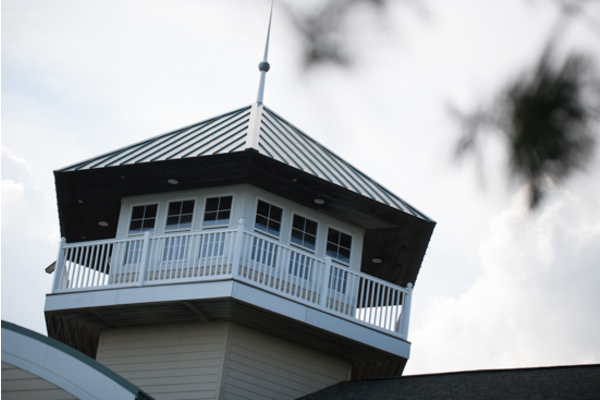 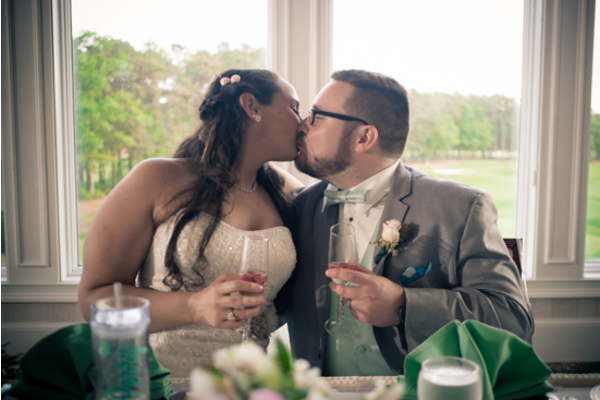 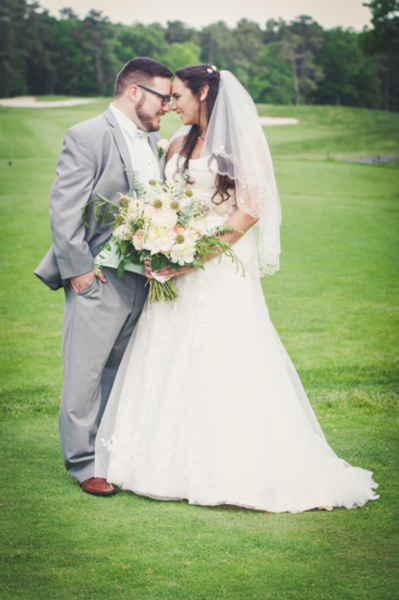 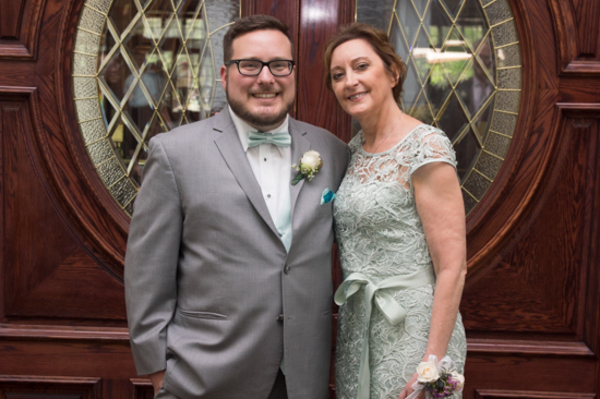 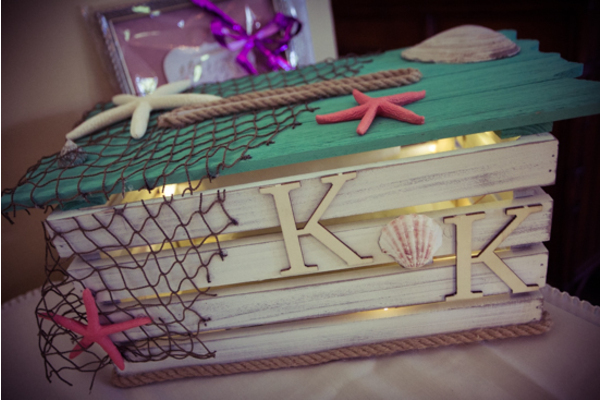 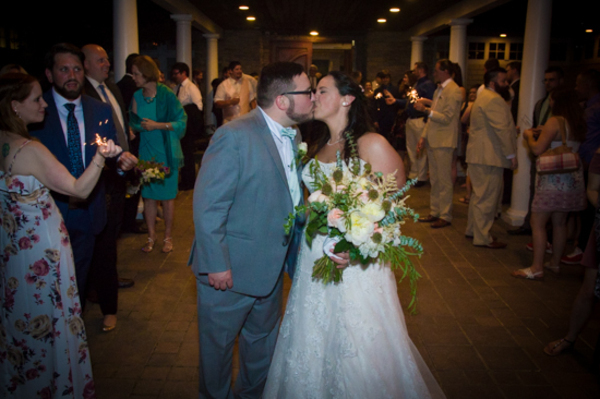 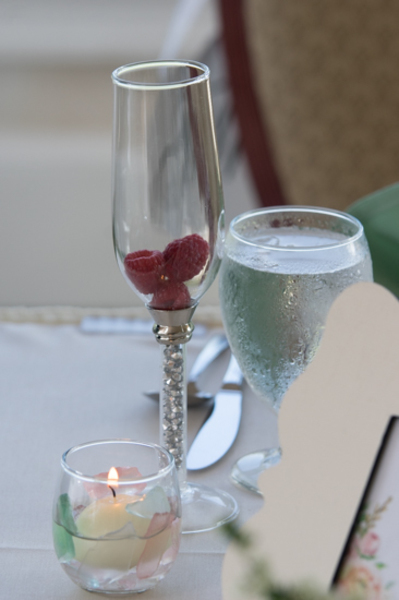 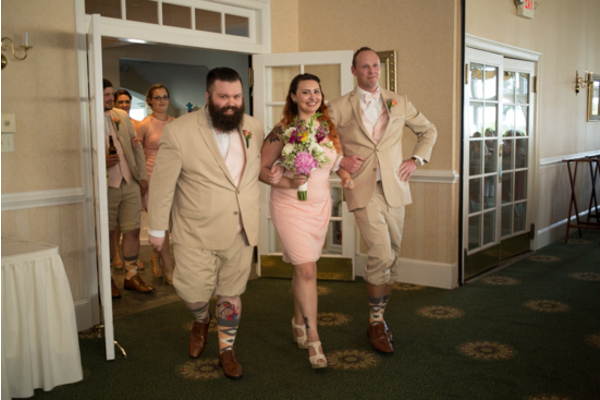 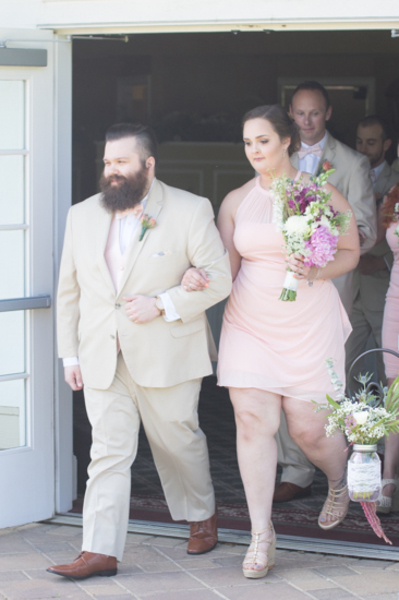 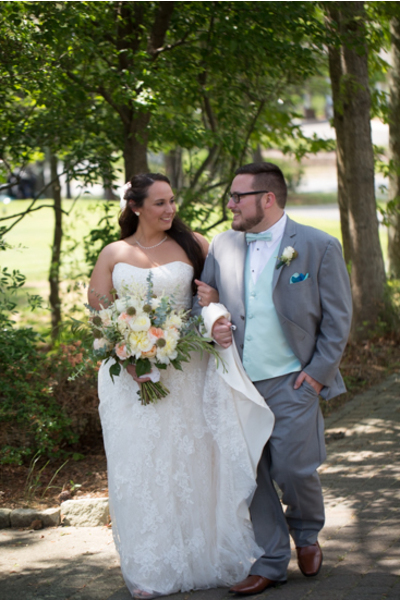 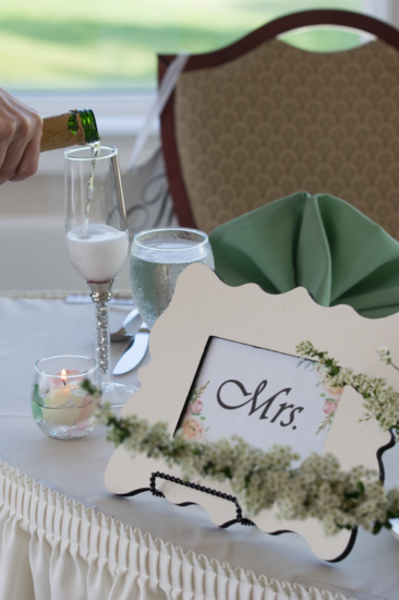 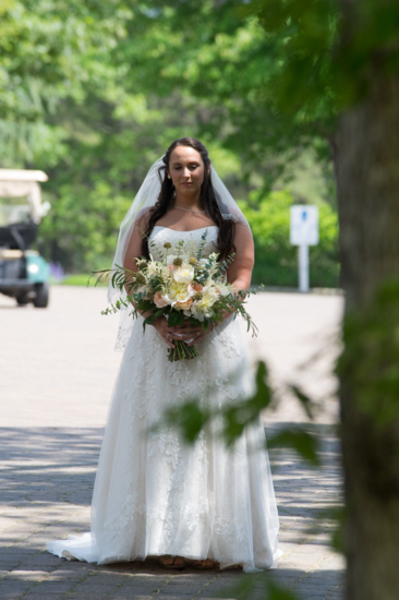 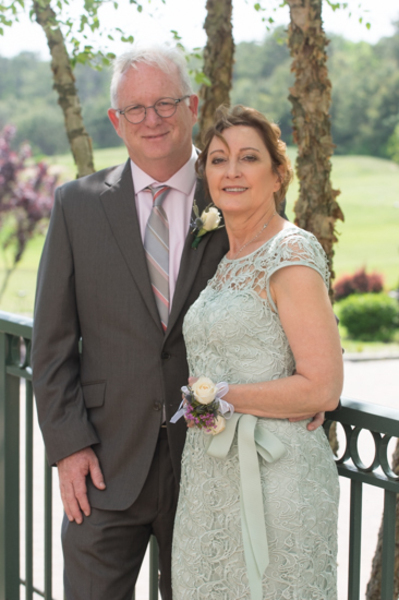 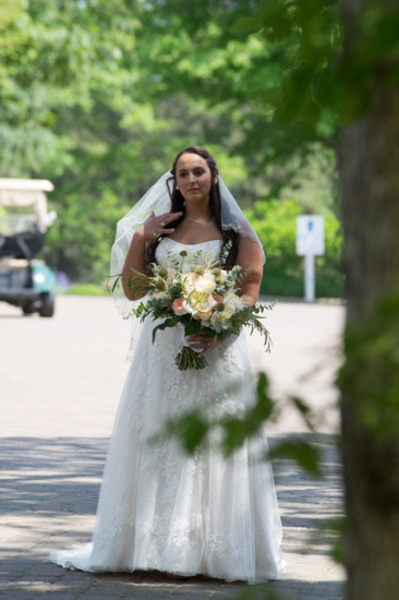 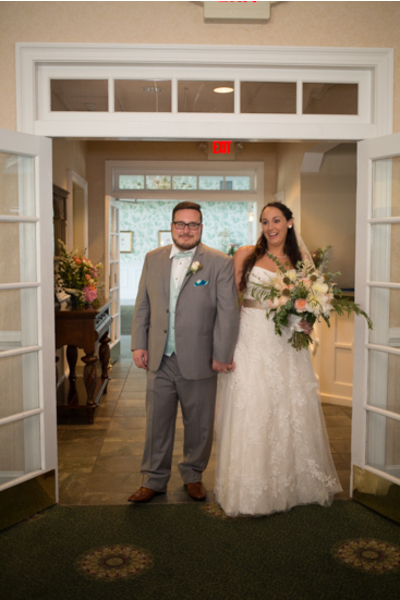 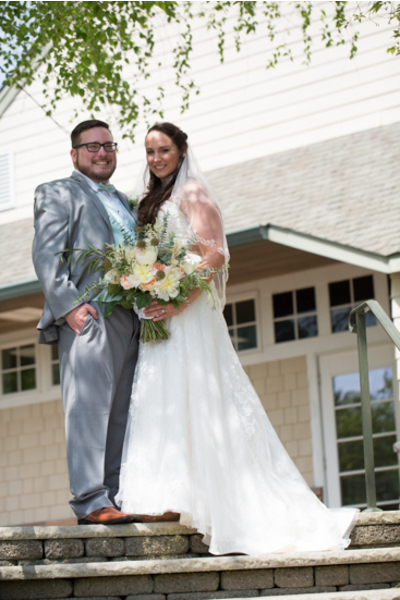 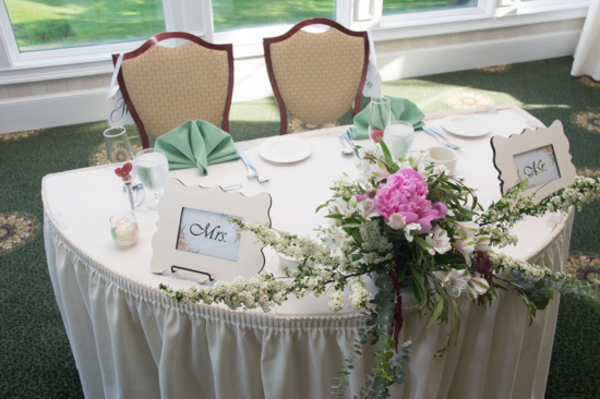 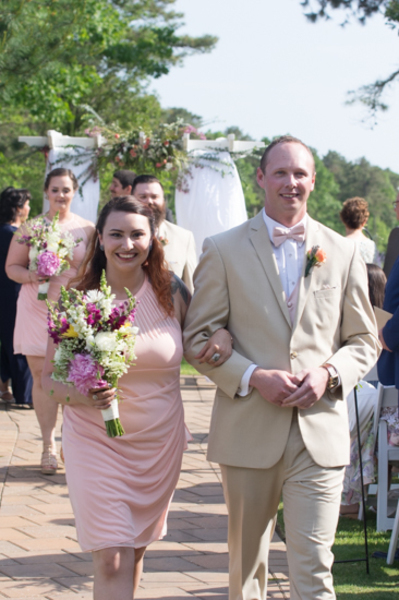 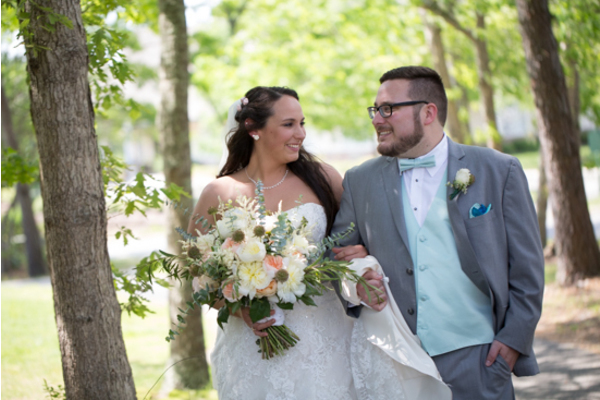 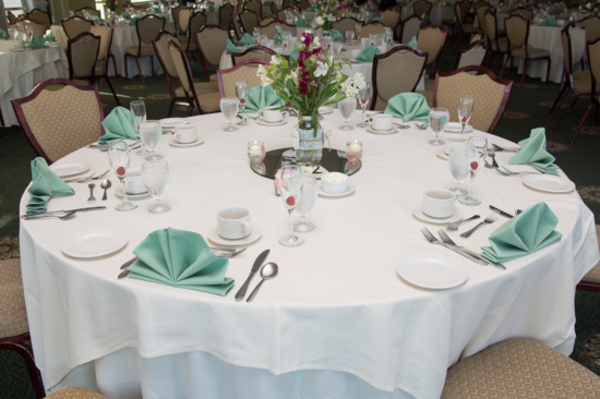 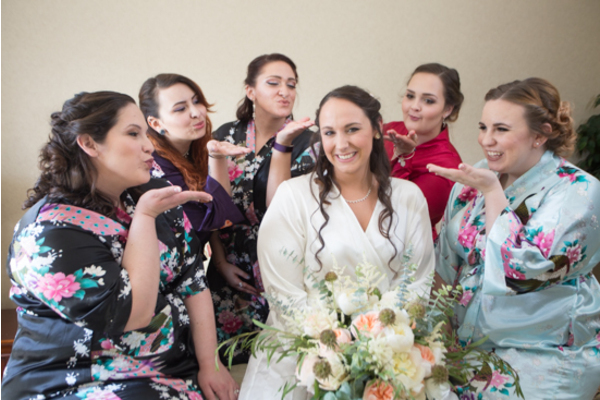 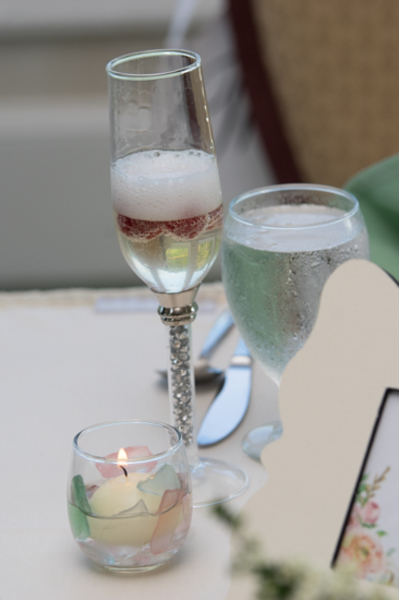 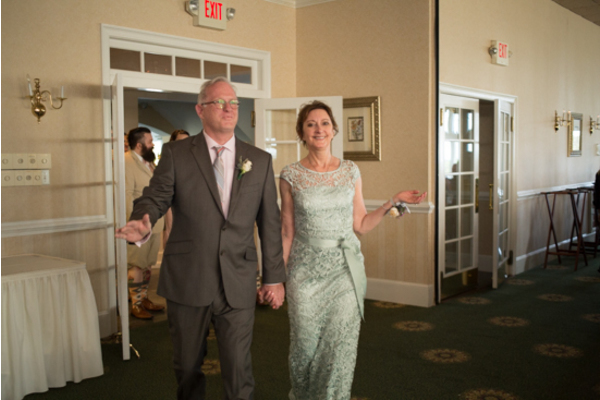 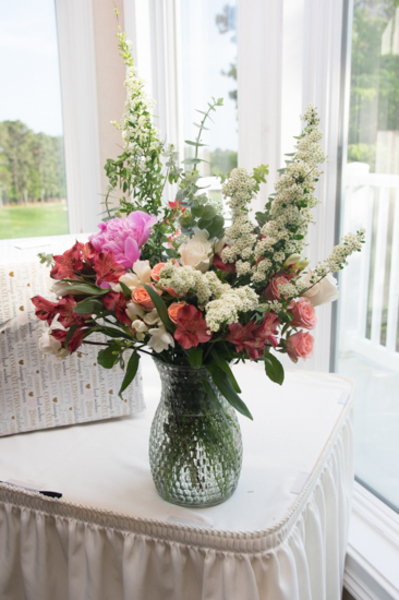 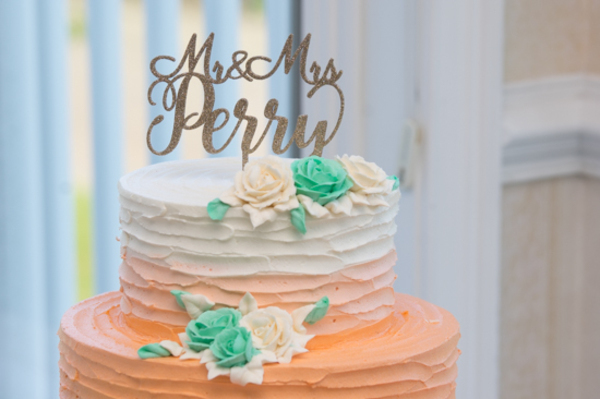 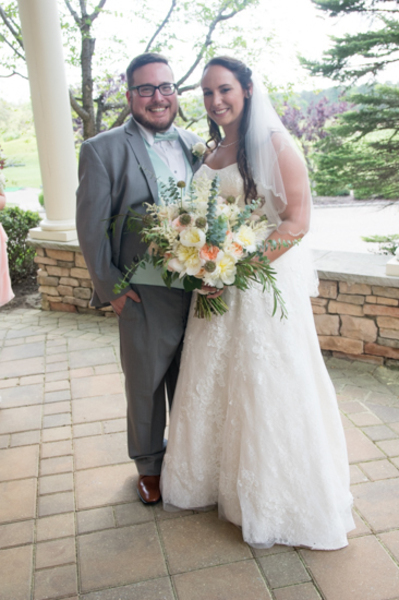 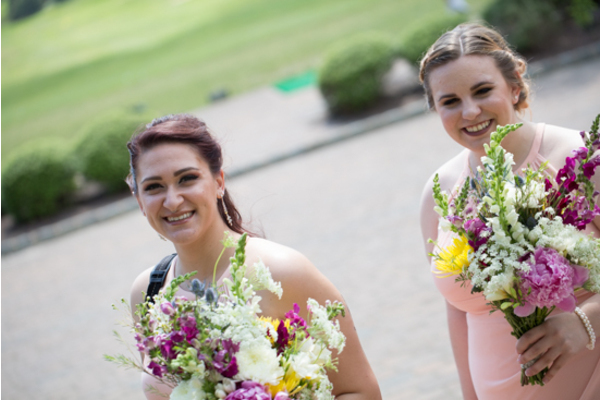 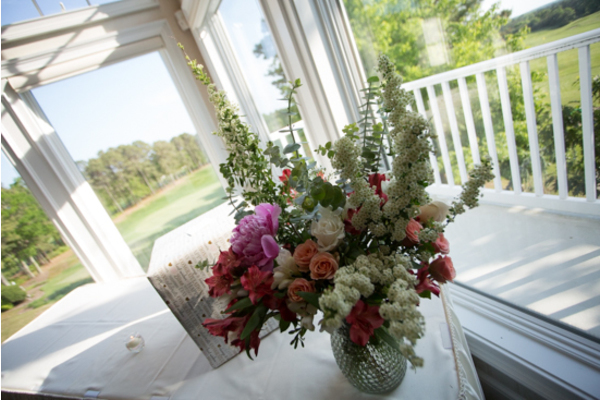 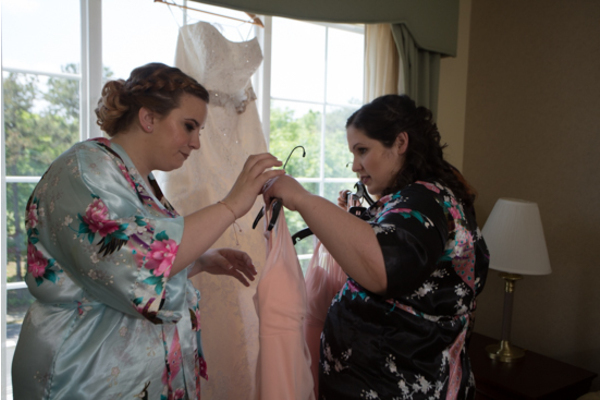 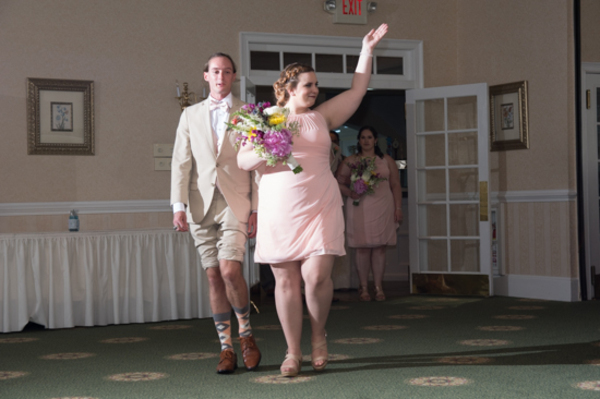 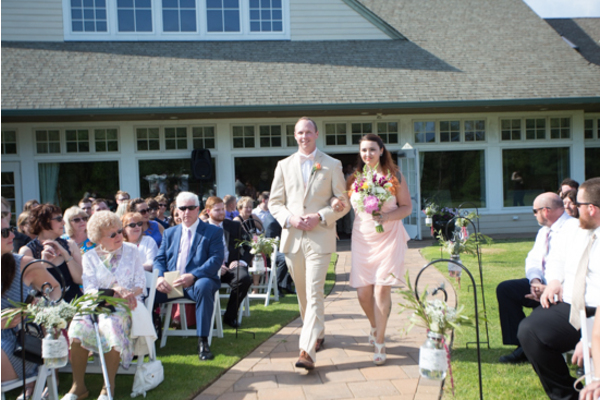 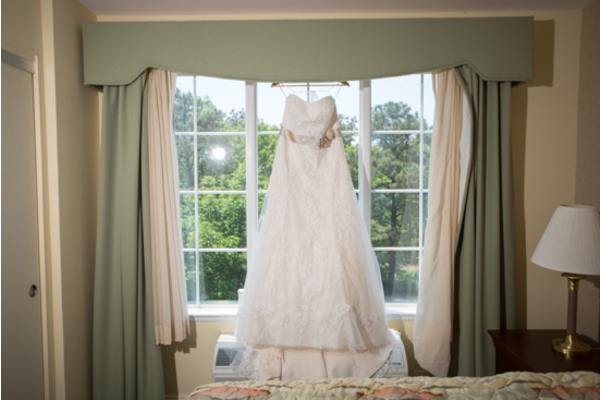 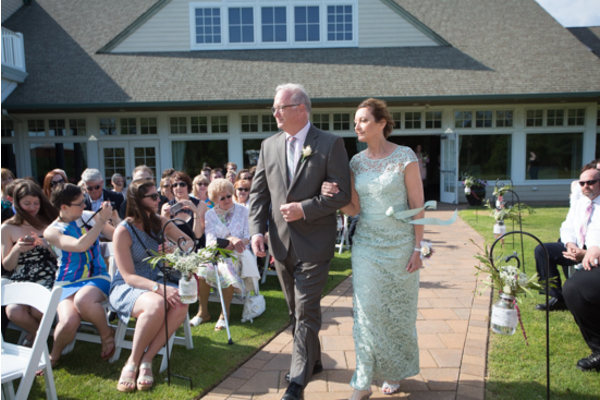 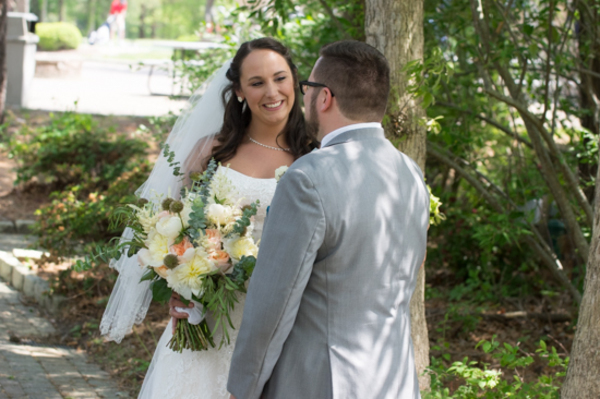 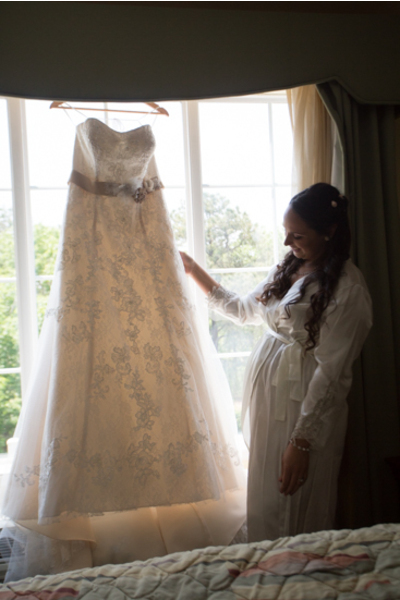 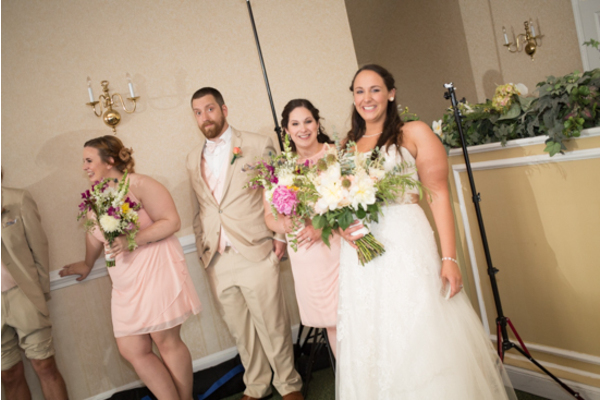 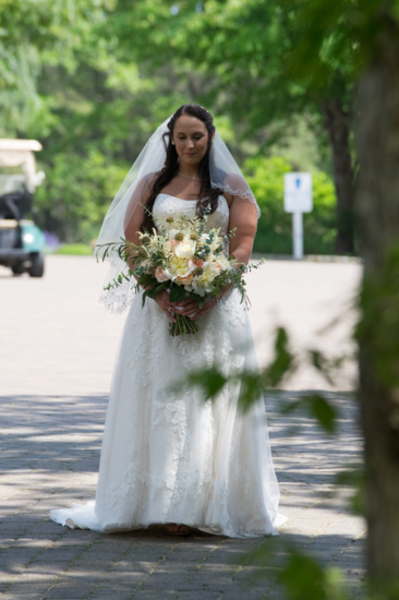 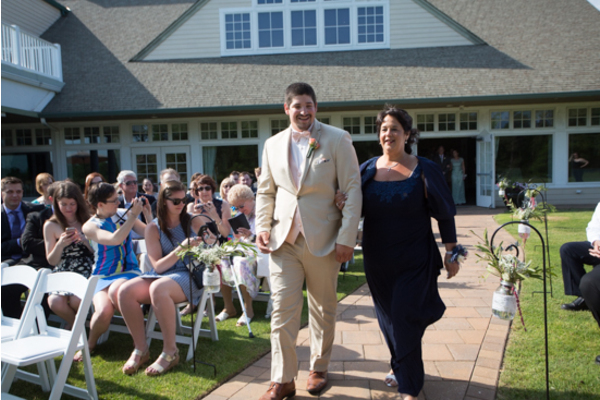 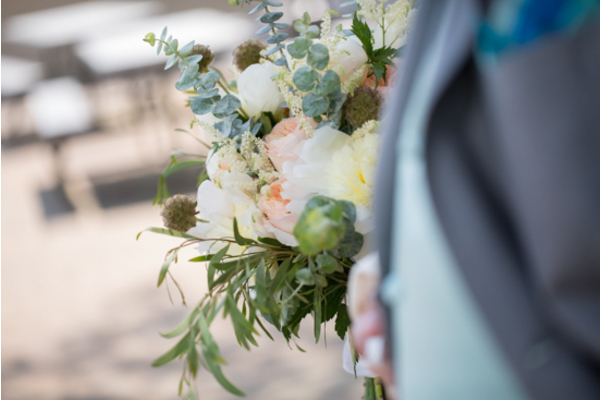 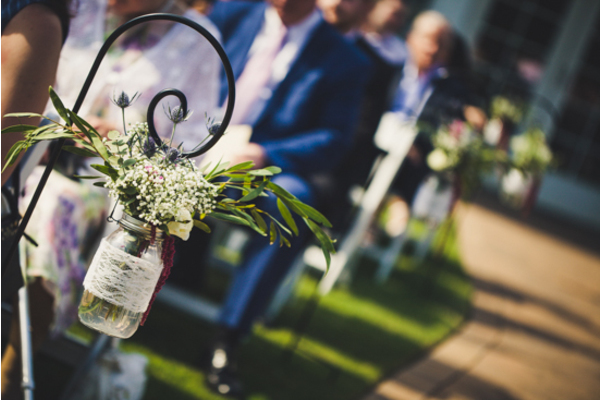 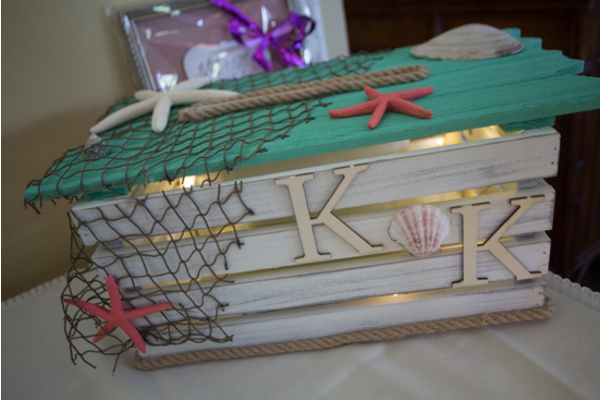 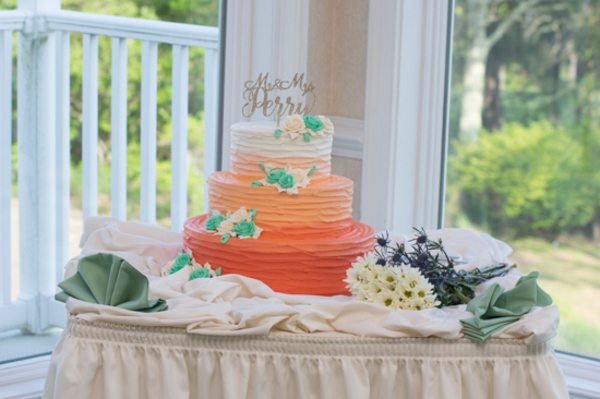 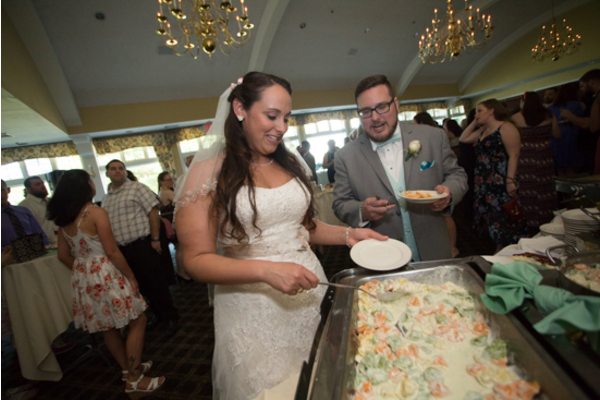 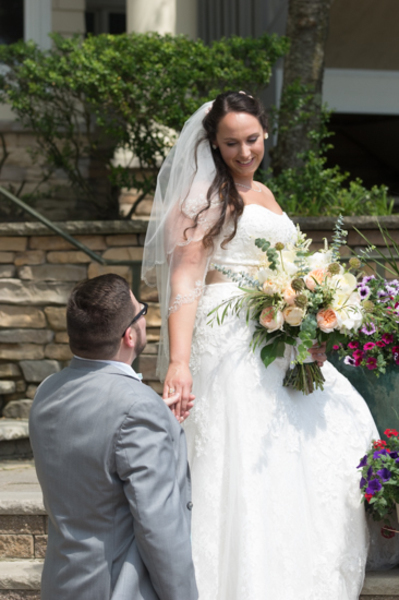 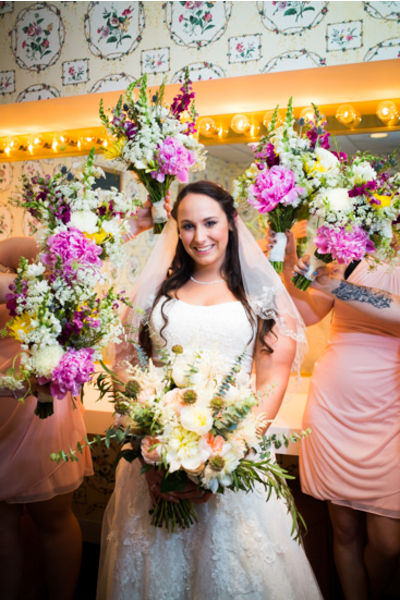 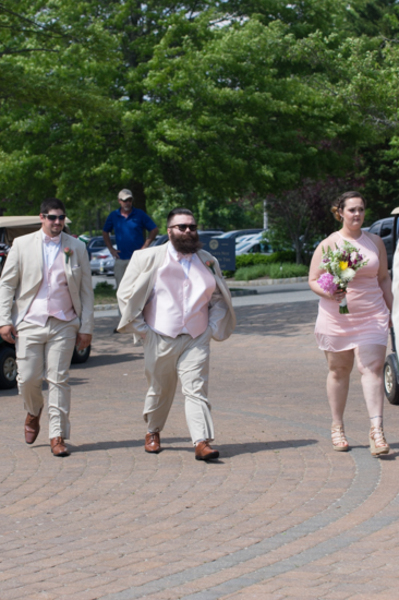 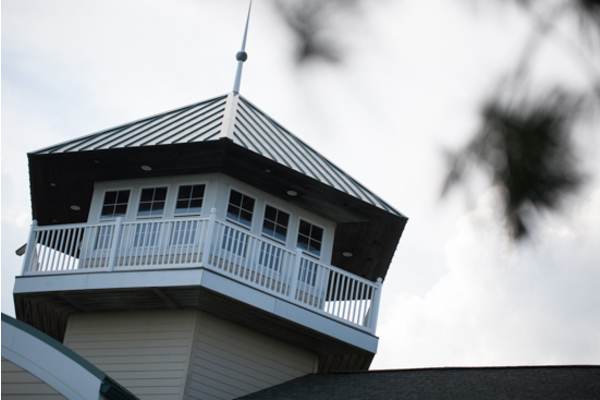 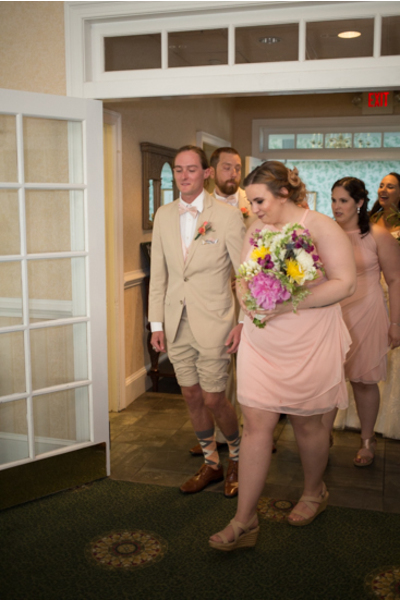 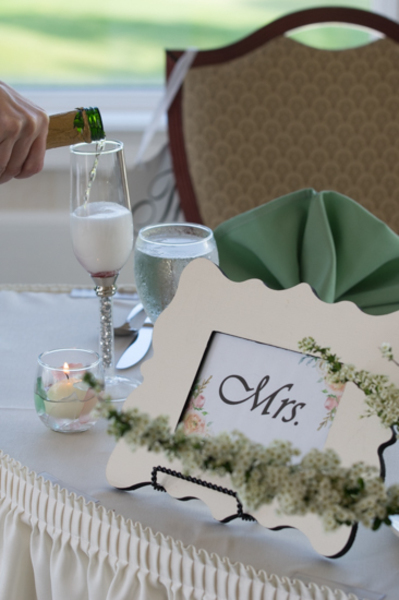 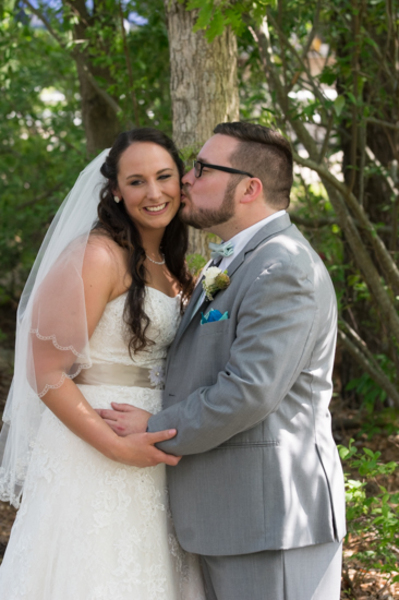 This fun-loving couple tied the knot at Sea Oaks Country Club, located in Little Egg Harbor Township, NJ. 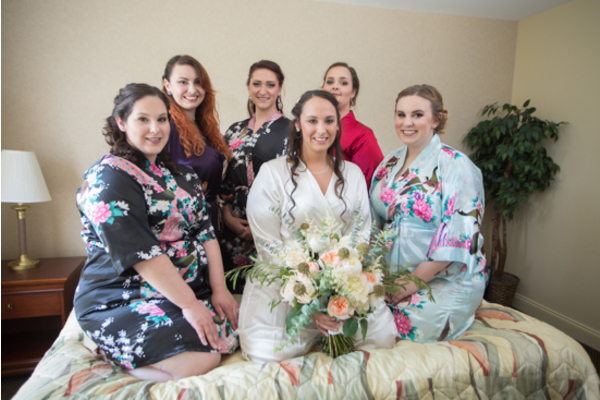 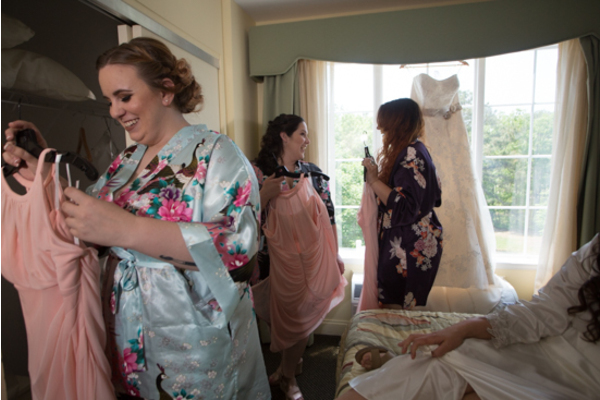 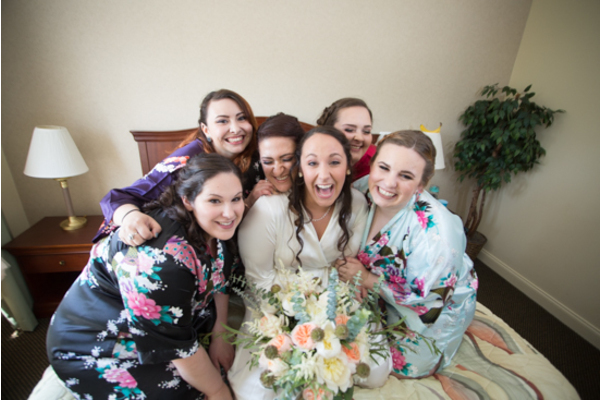 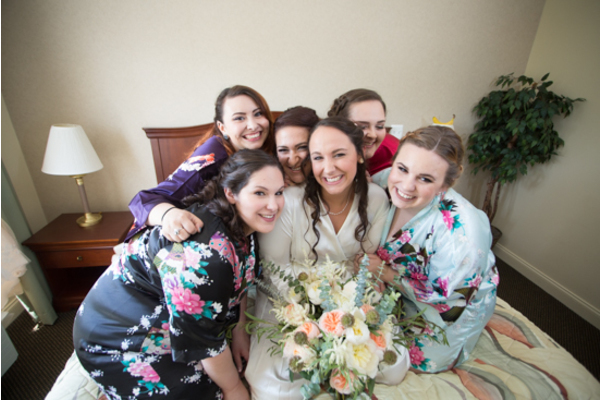 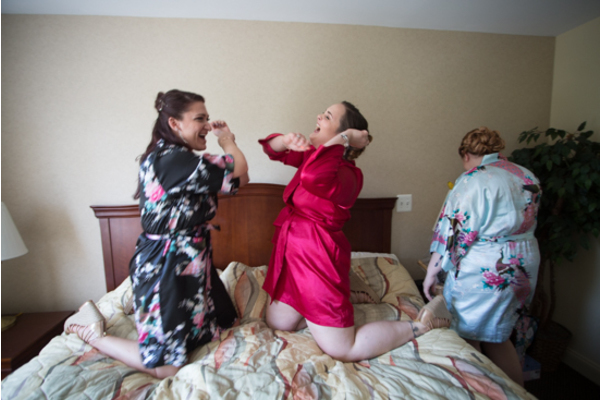 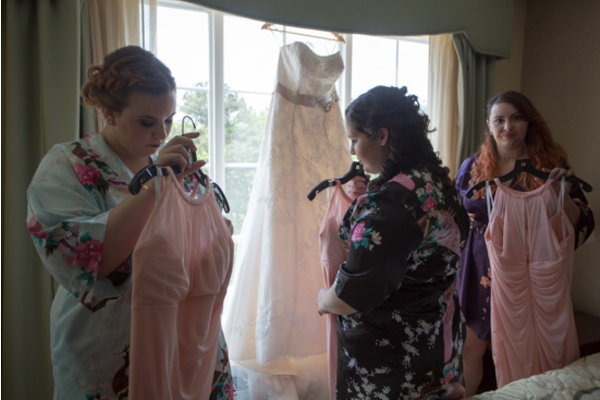 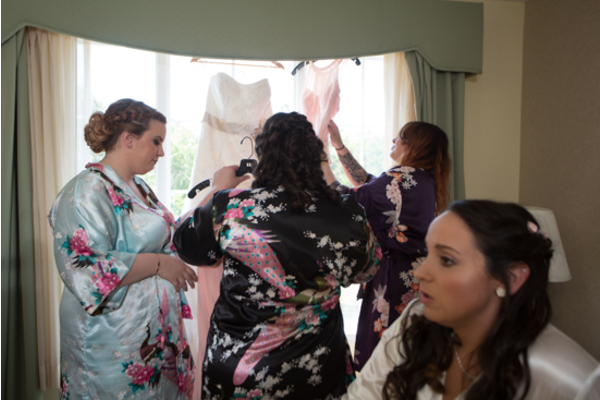 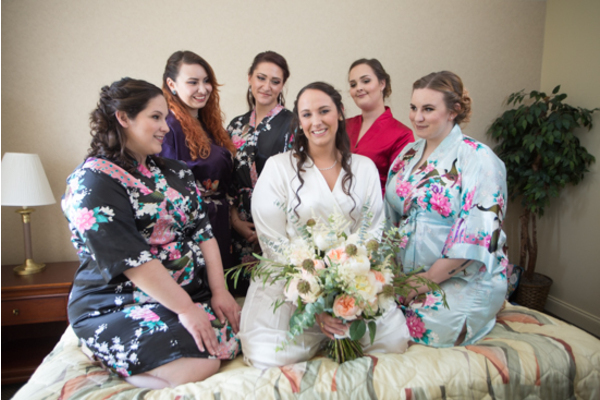 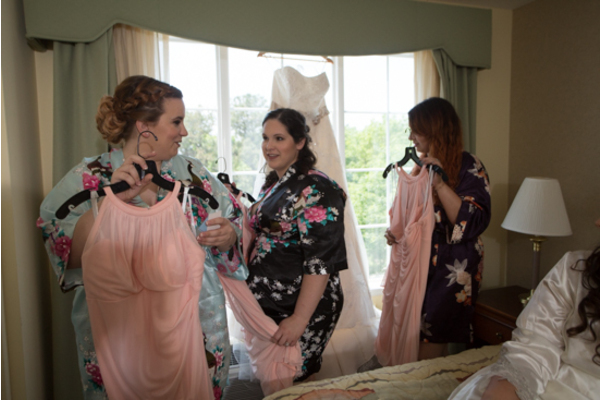 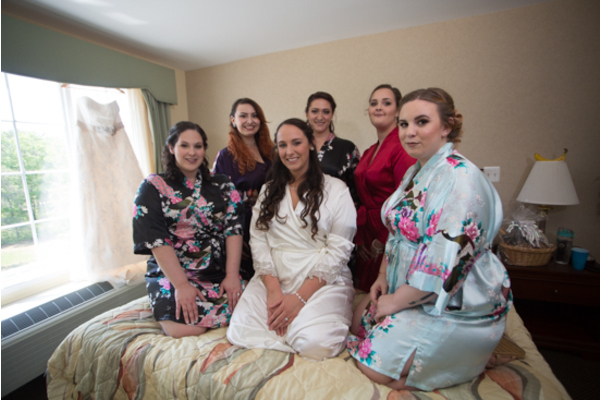 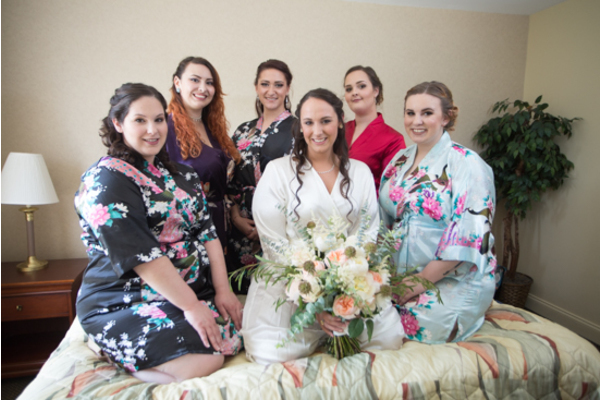 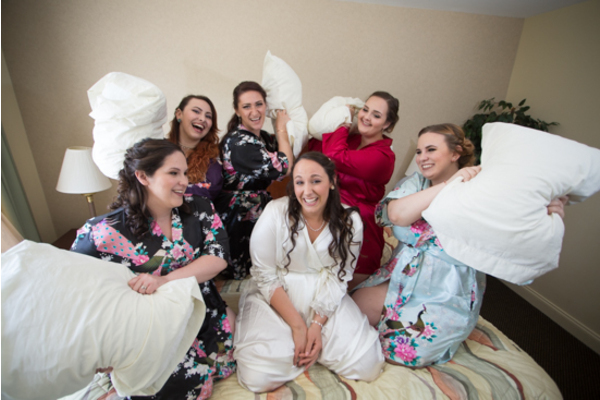 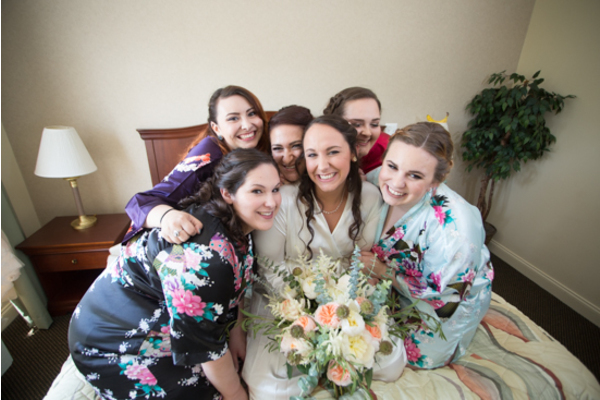 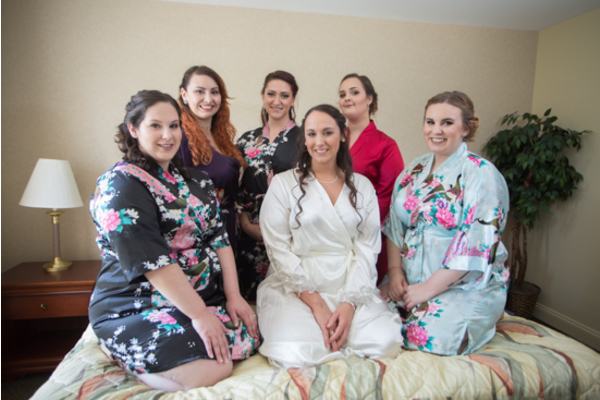 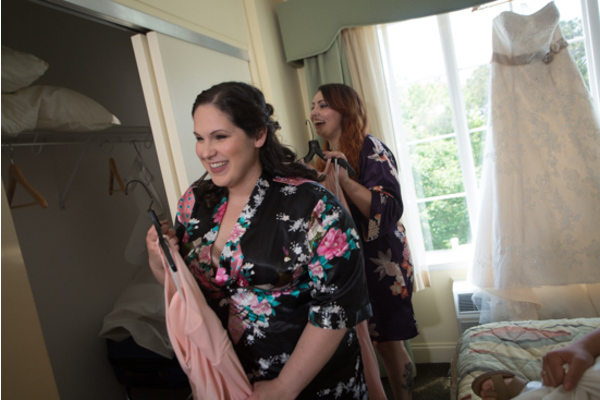 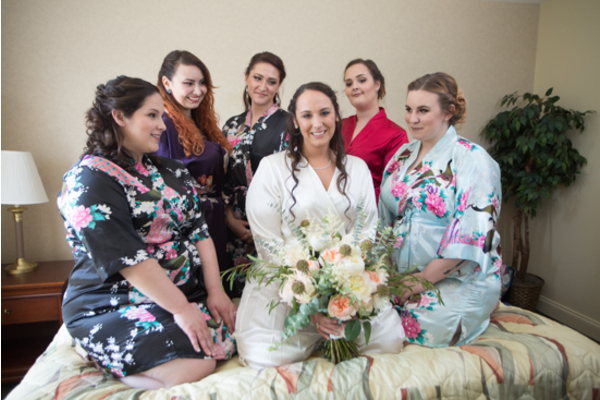 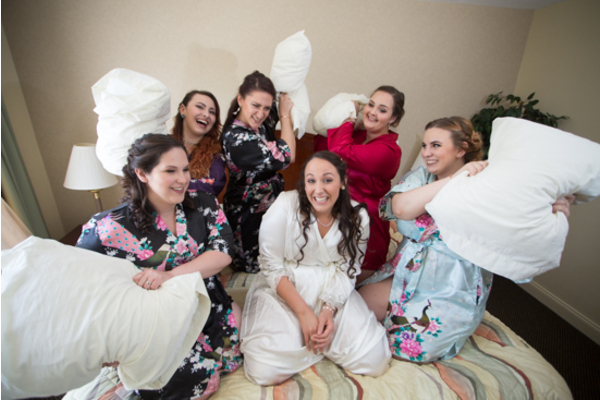 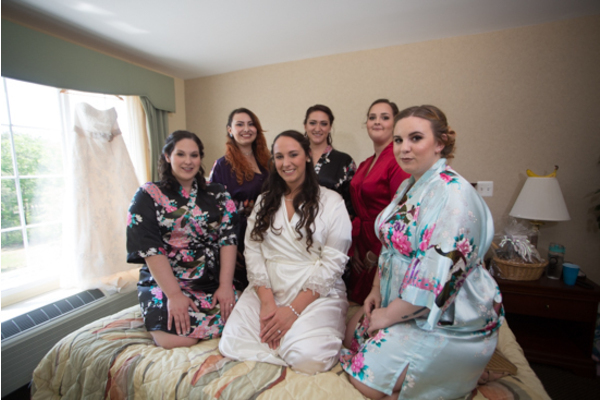 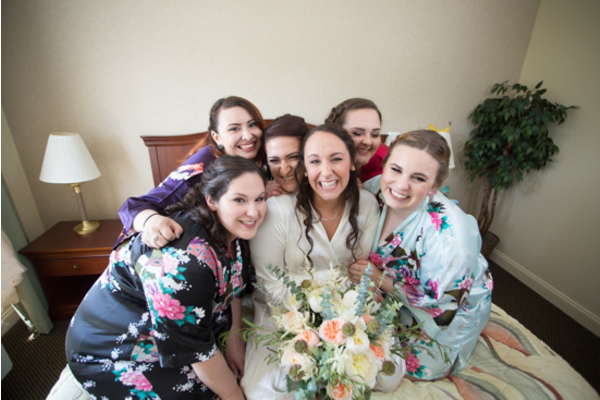 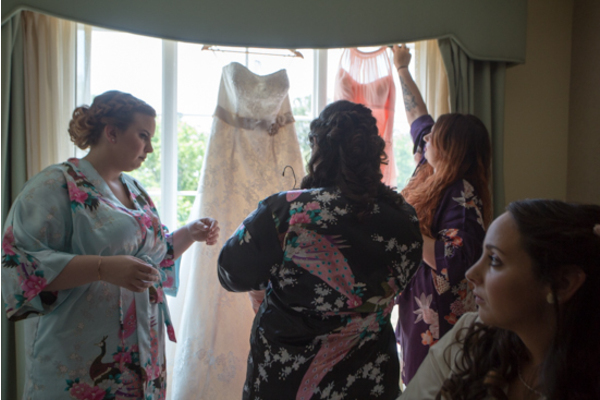 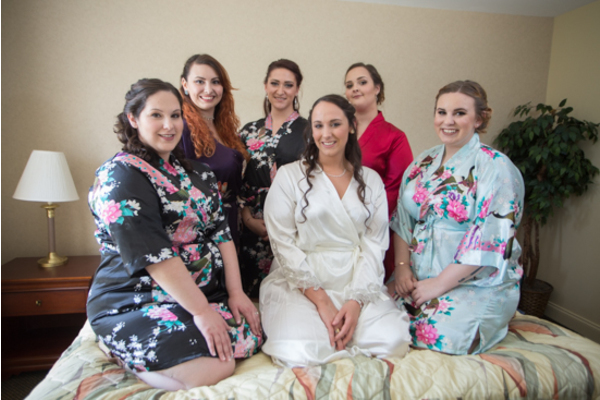 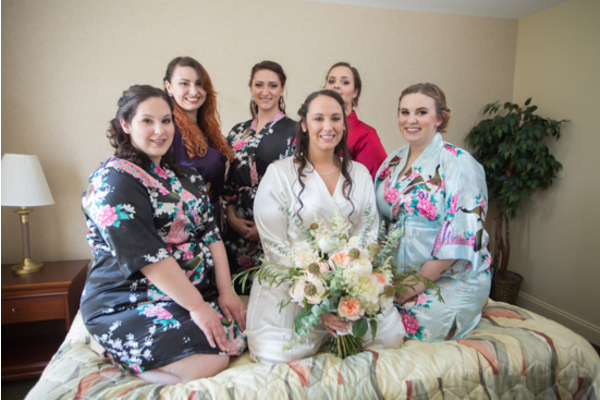 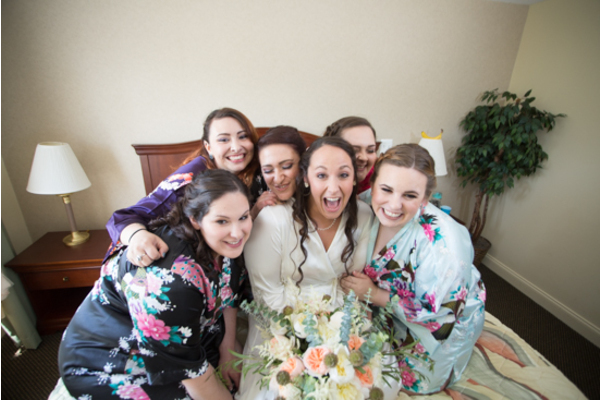 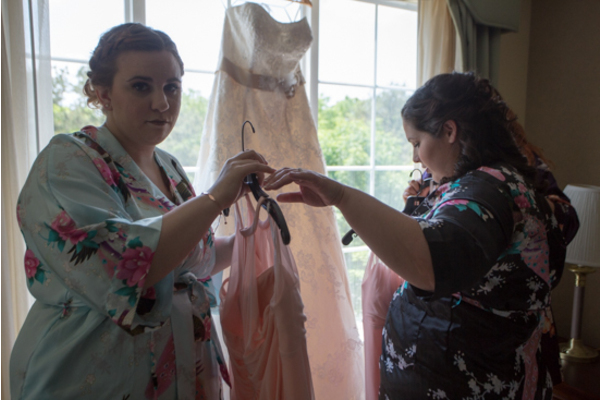 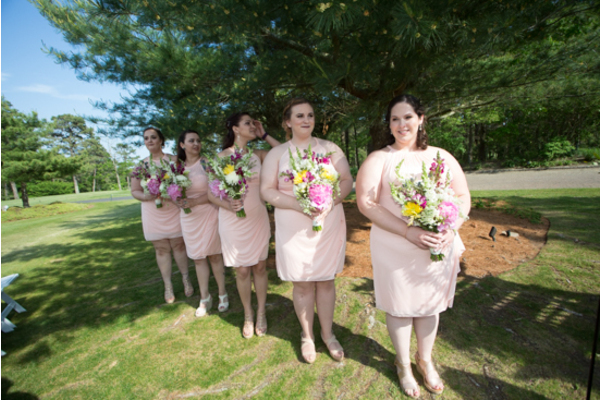 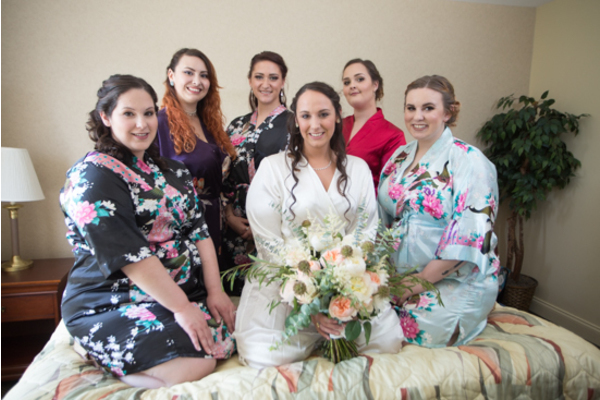 Kelly spent her morning with her bridesmaids clad in matching robes. 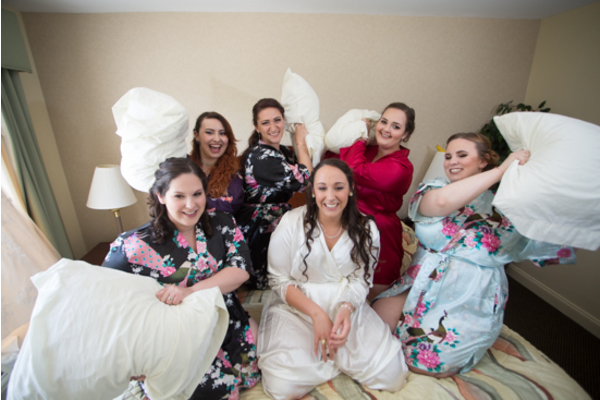 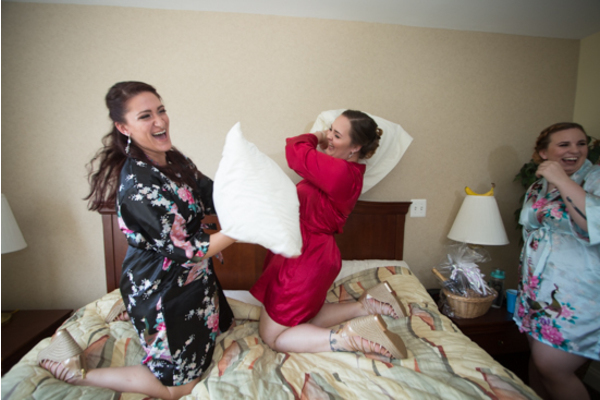 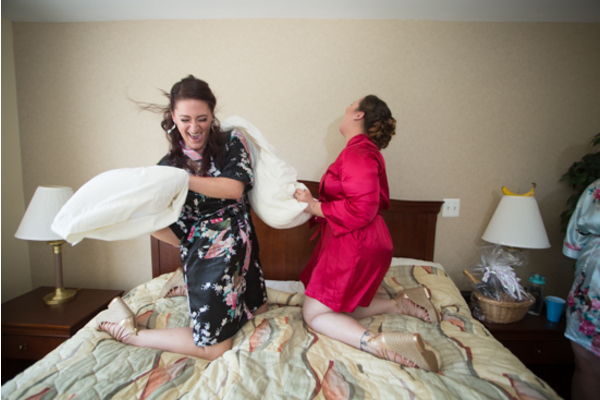 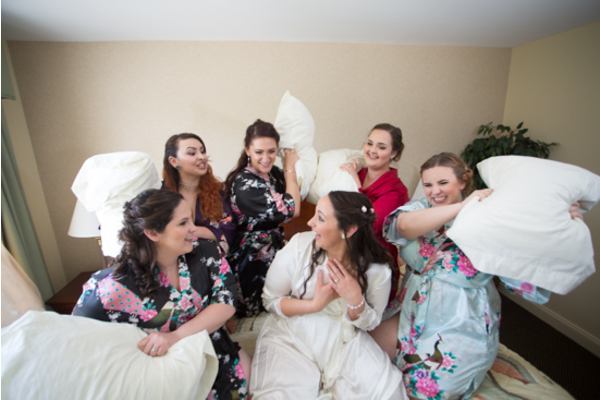 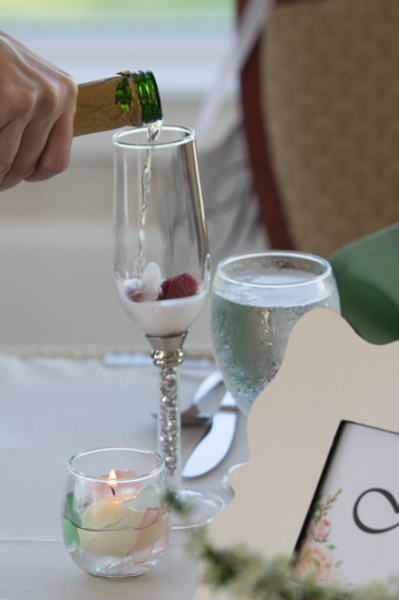 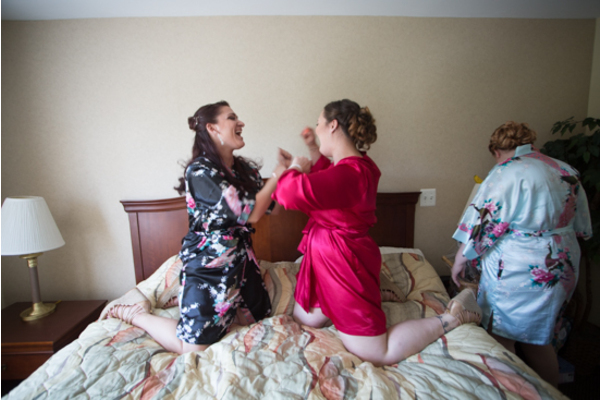 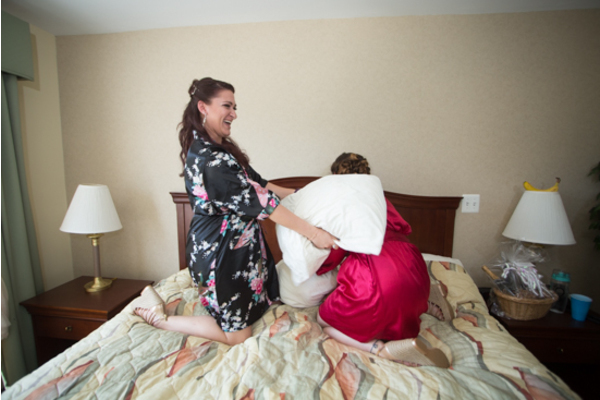 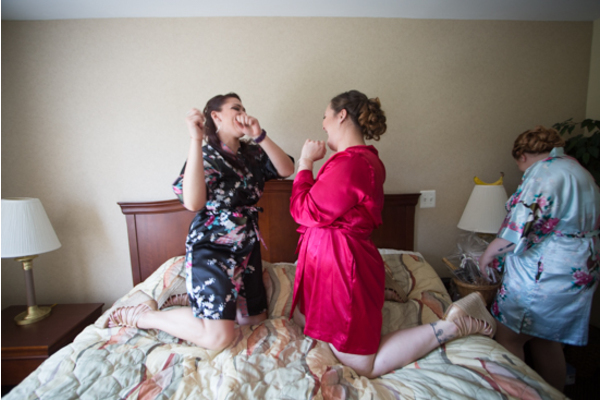 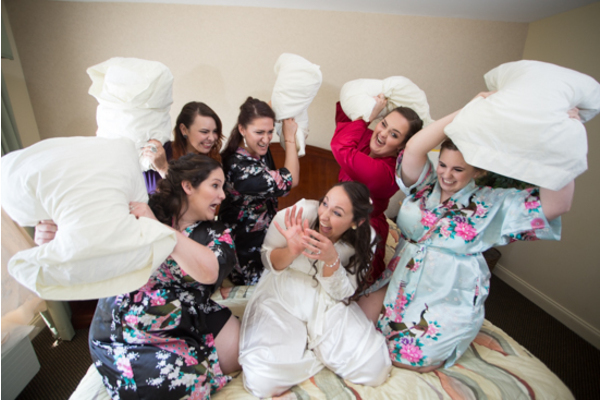 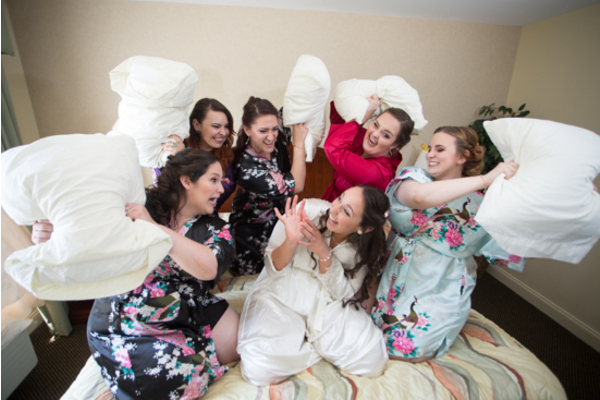 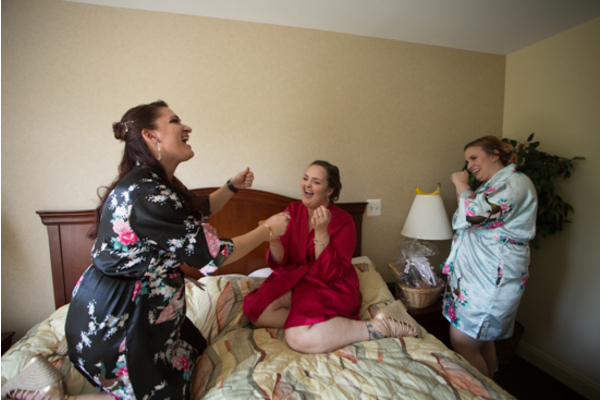 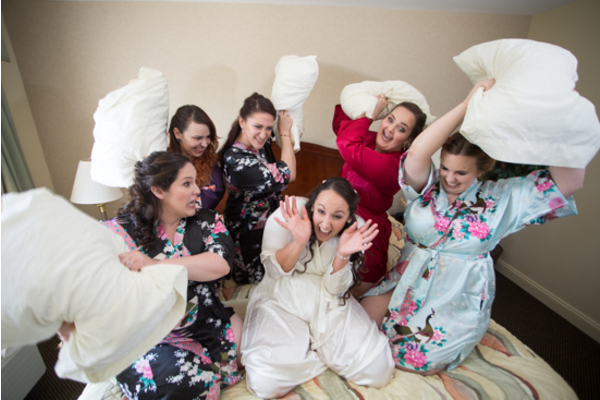 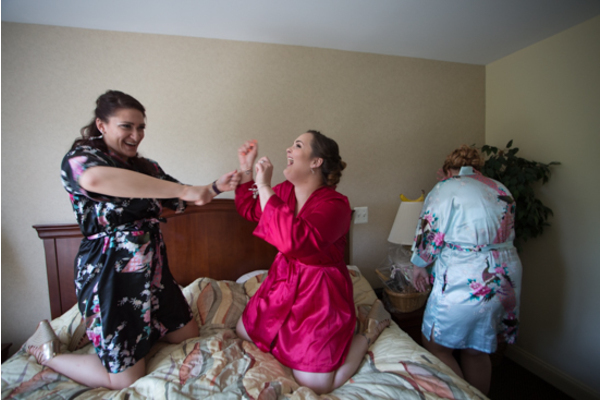 The ladies shared laughs as they had a pillow fight on the bed and toasted Kelly with personalized cups. 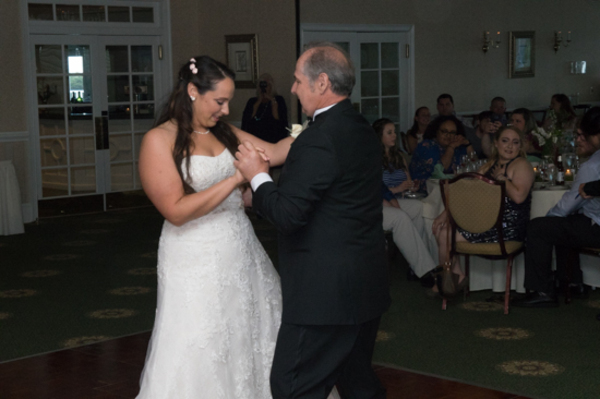 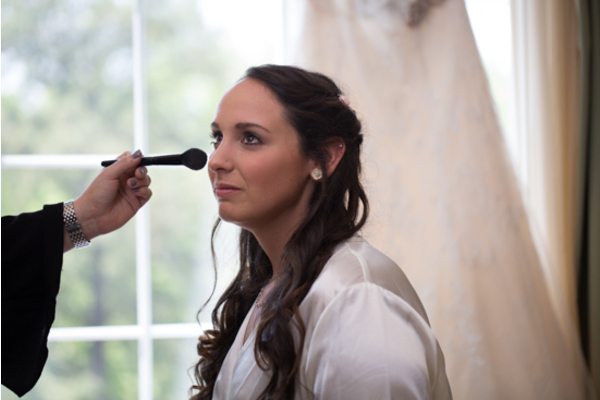 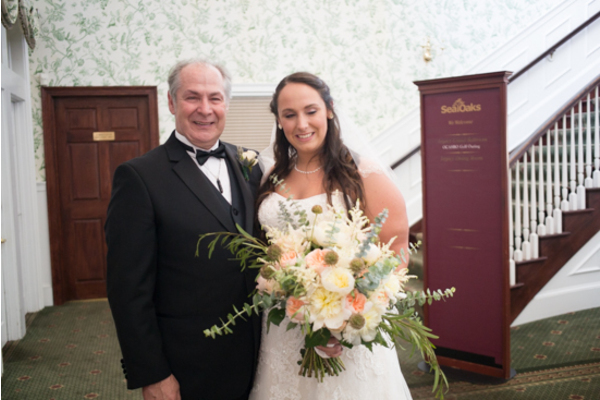 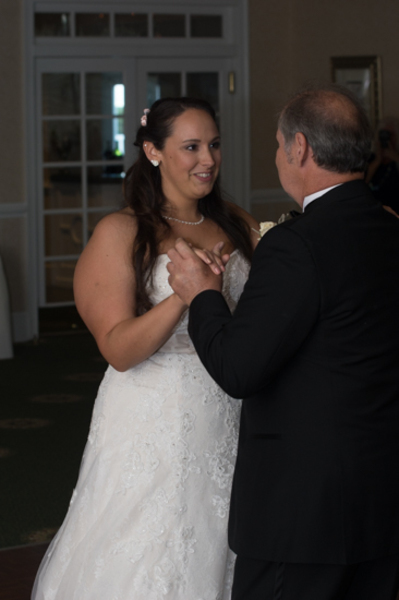 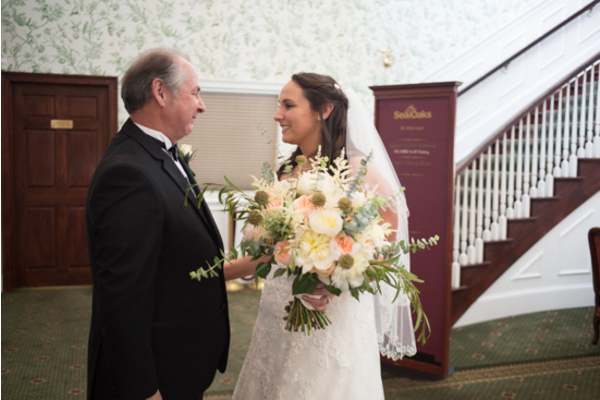 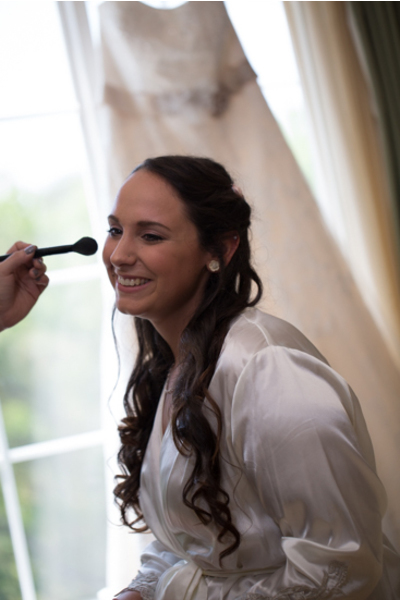 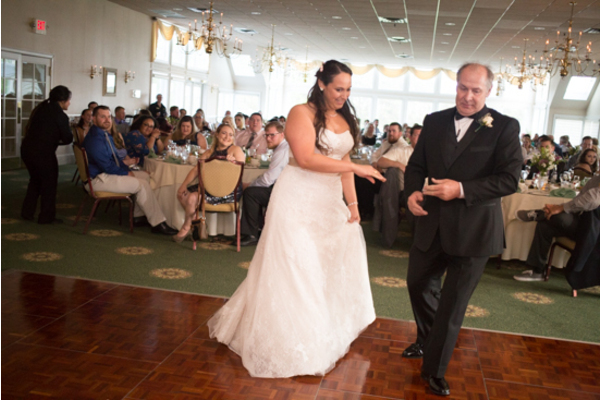 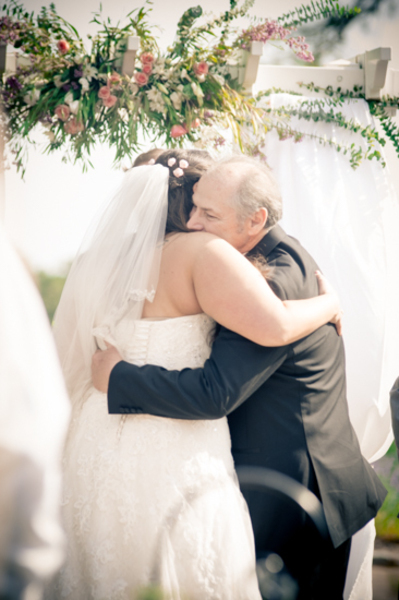 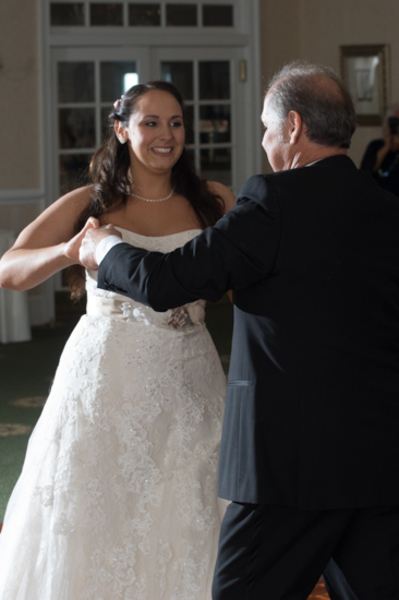 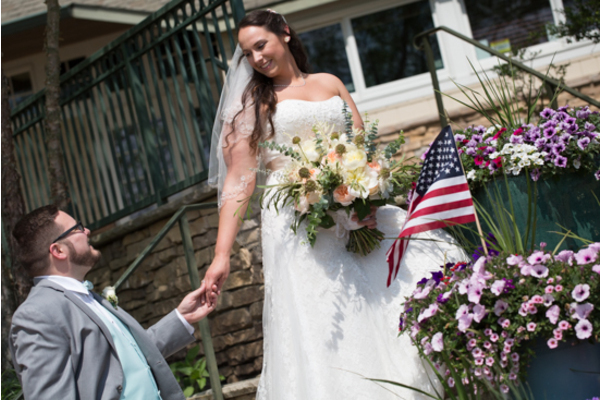 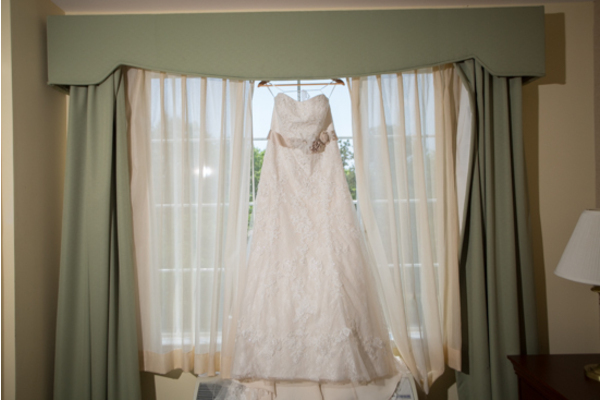 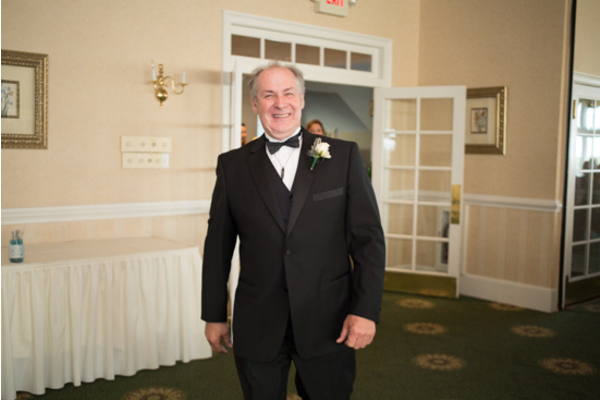 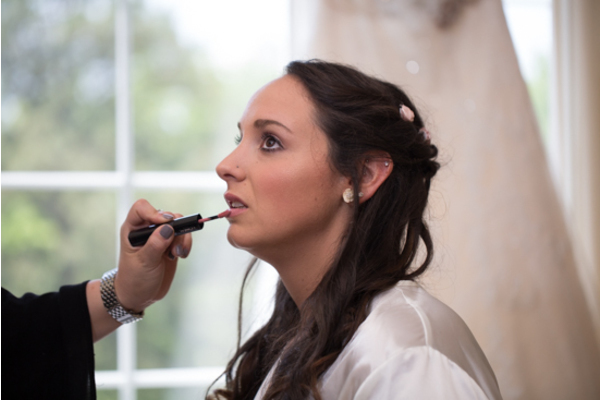 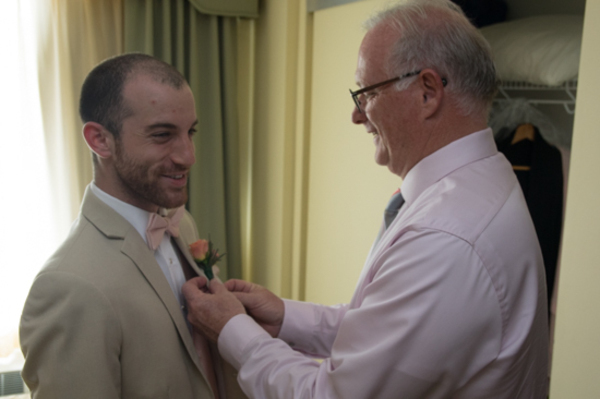 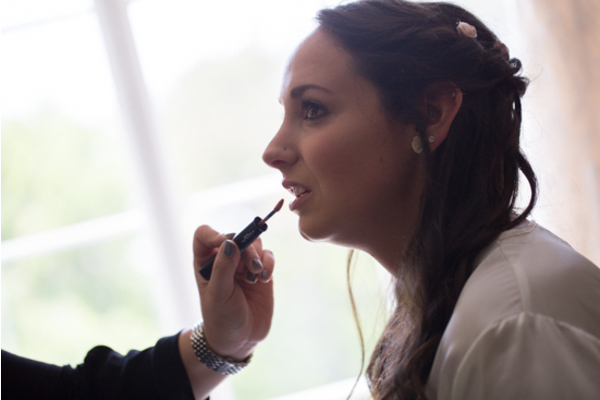 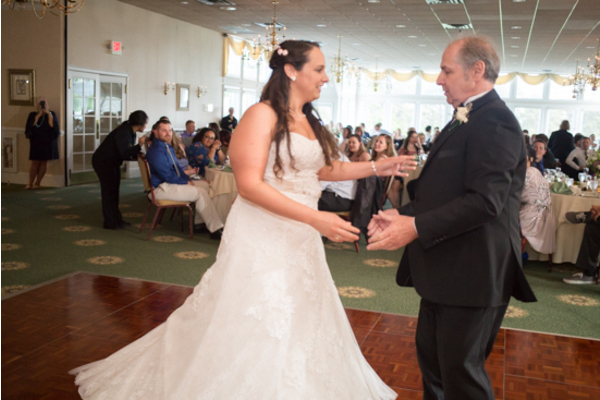 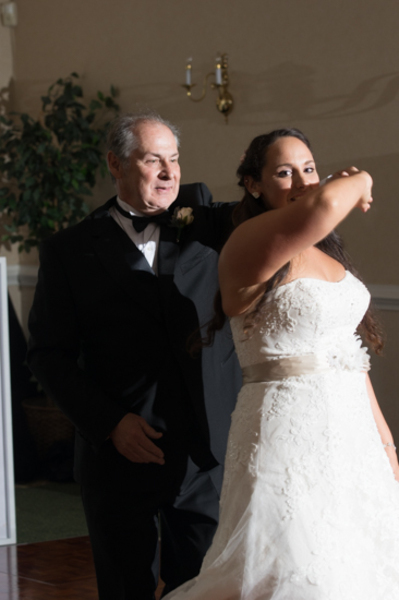 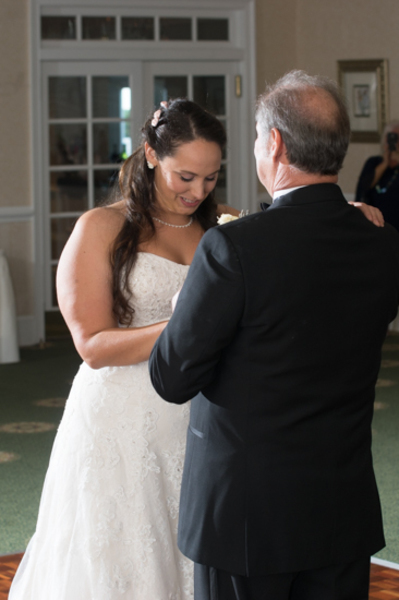 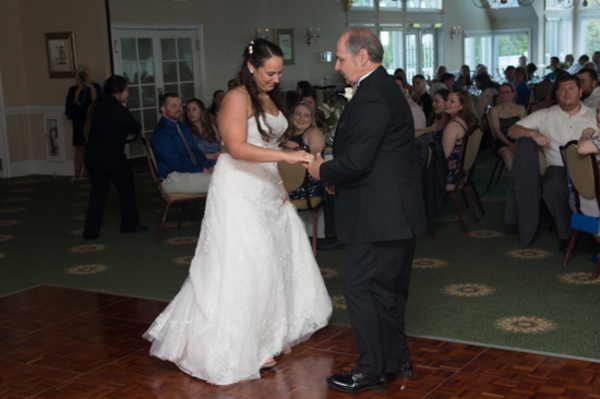 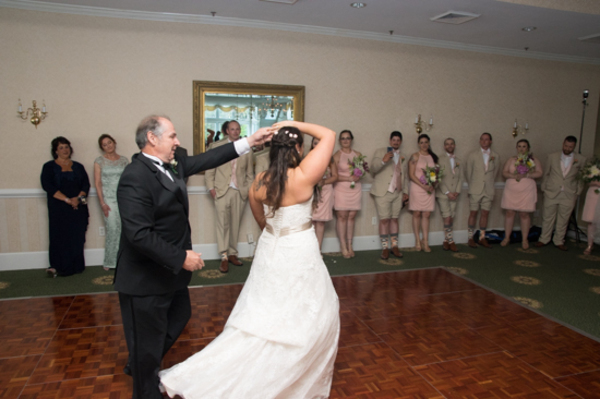 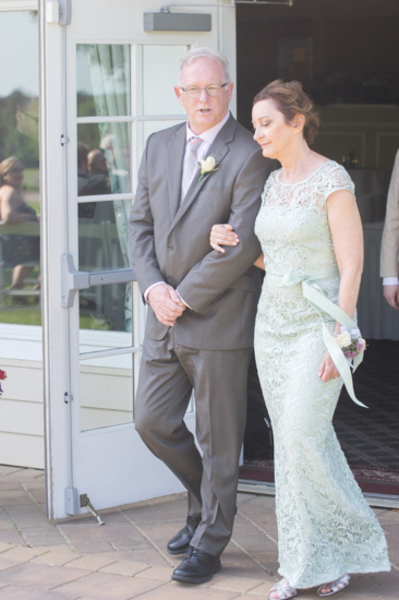 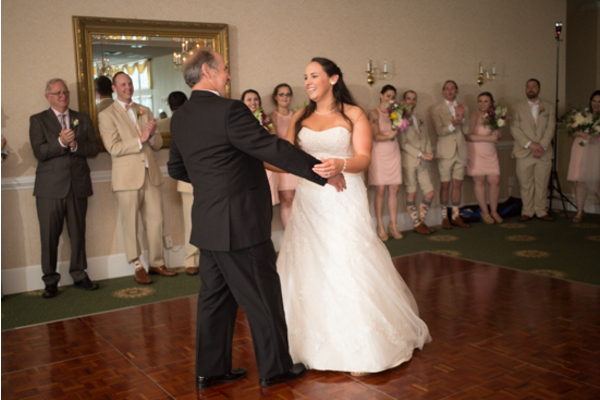 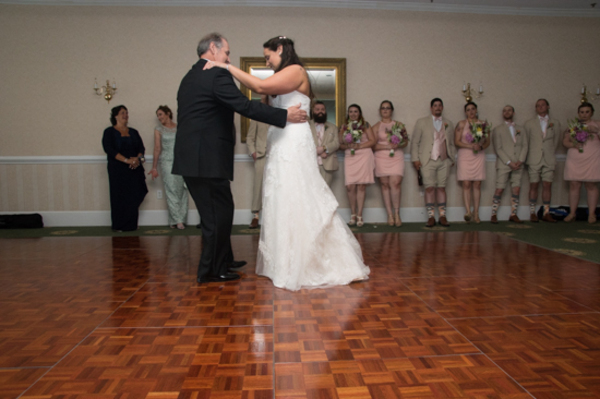 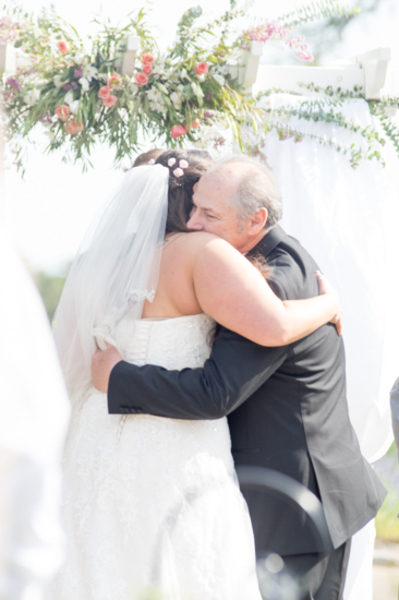 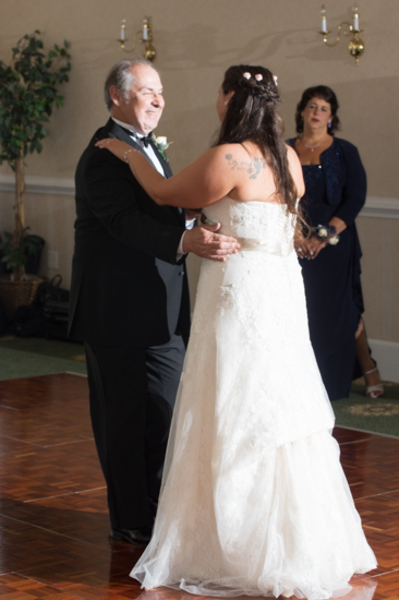 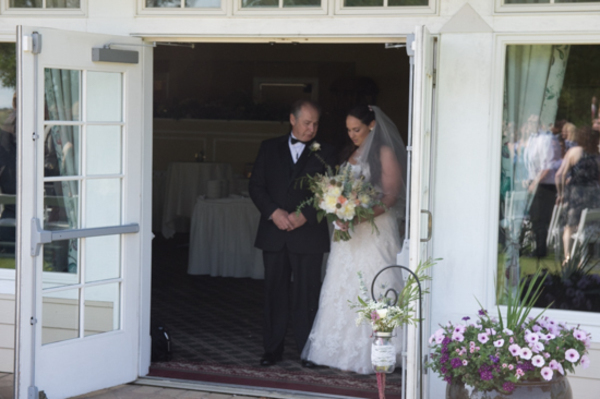 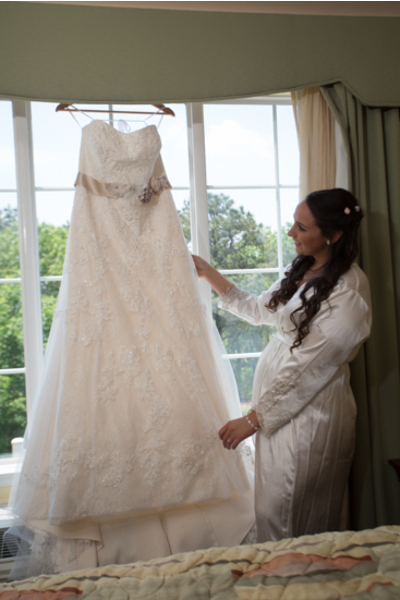 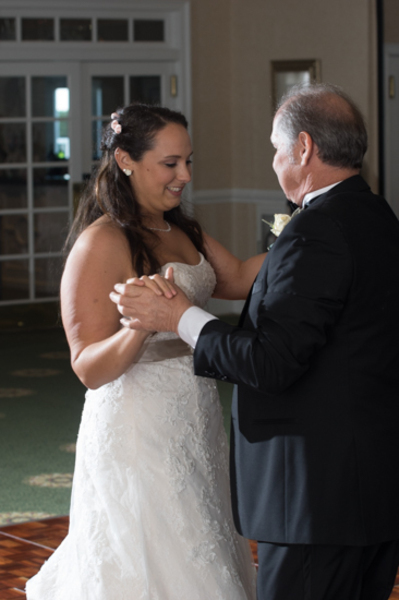 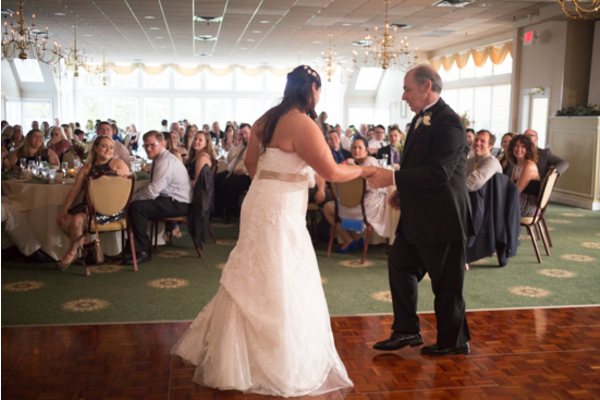 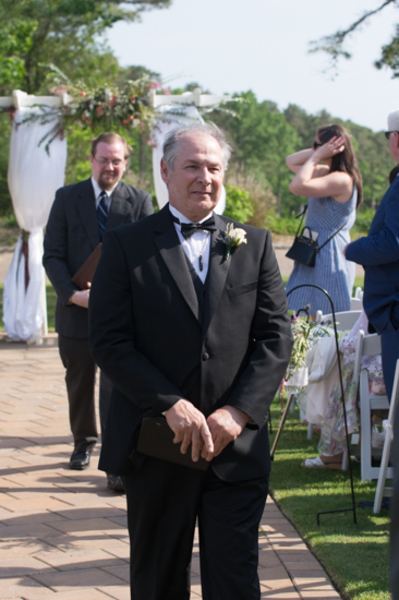 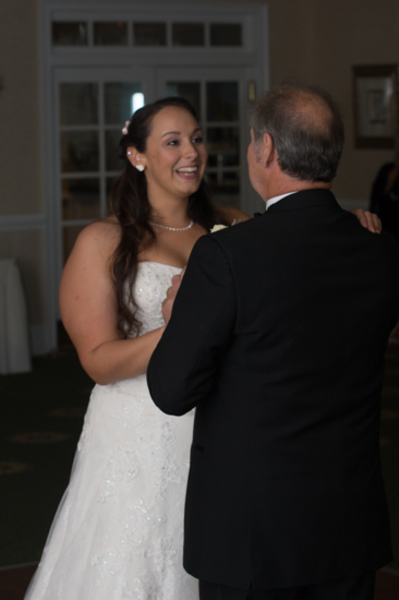 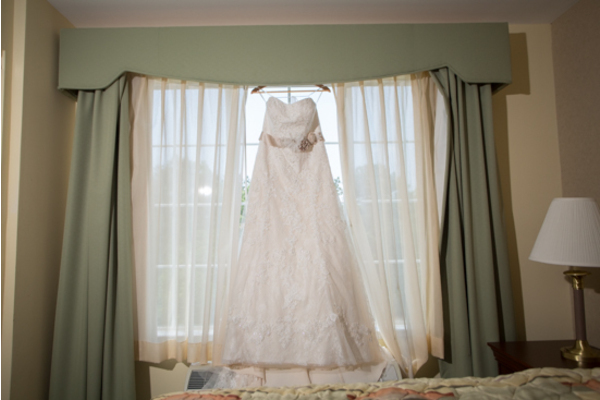 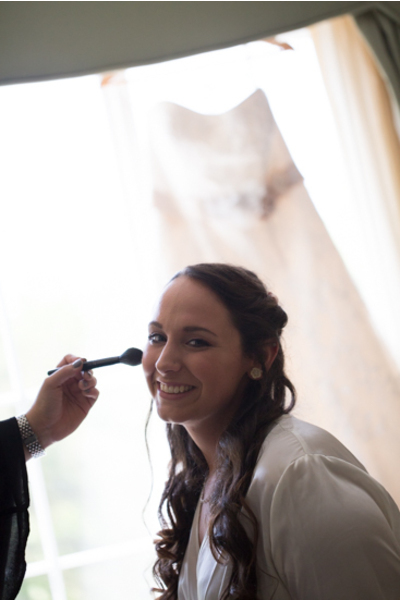 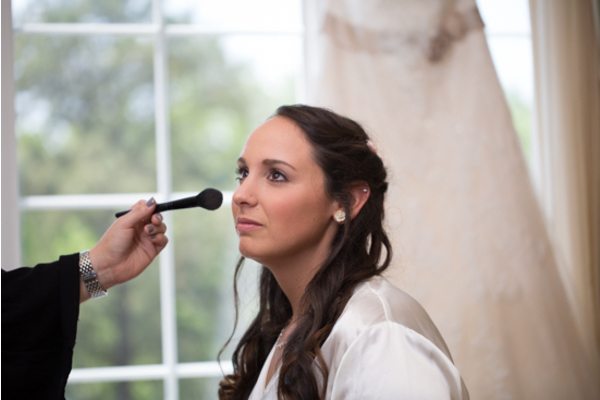 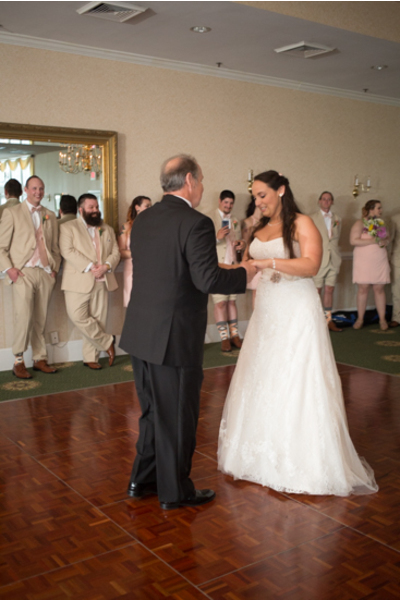 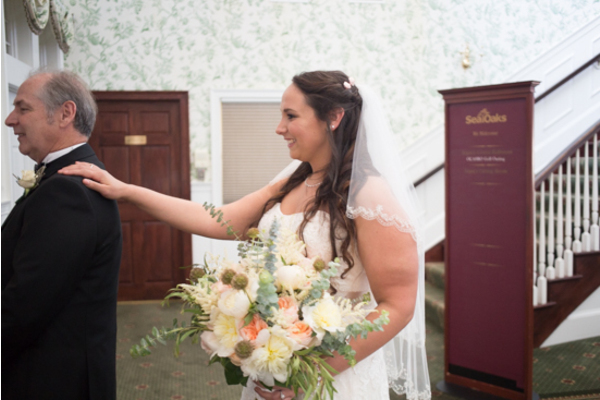 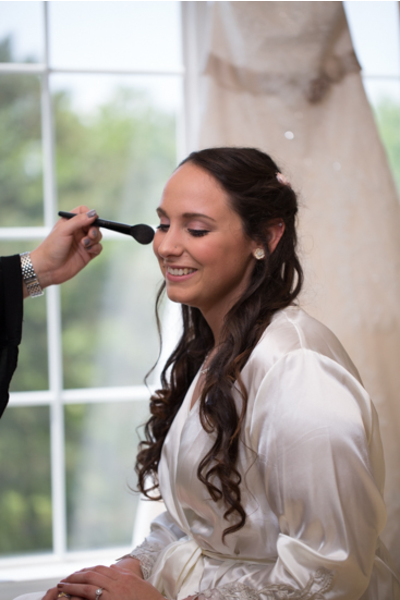 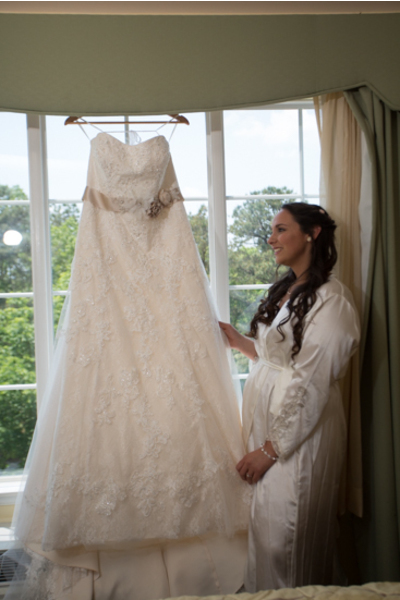 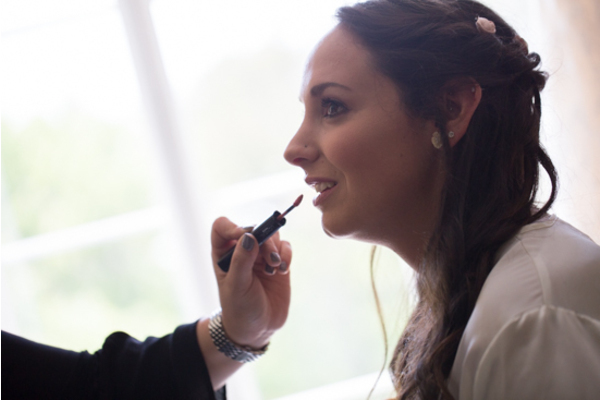 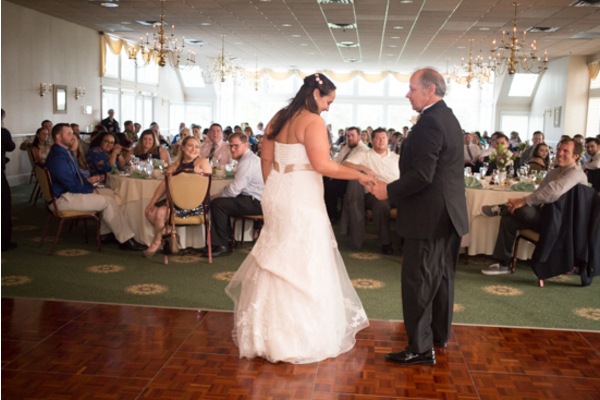 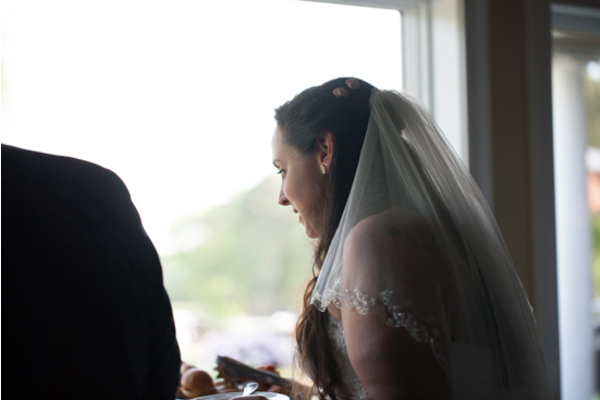 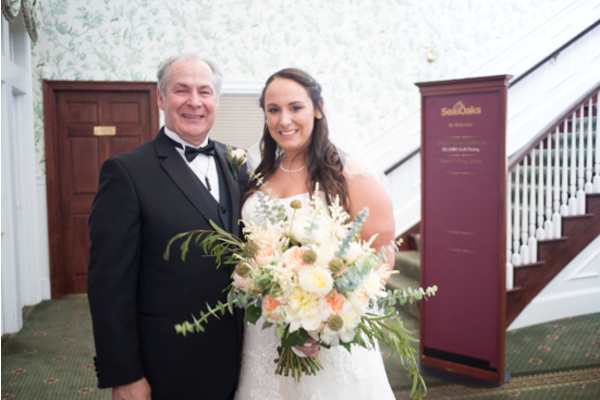 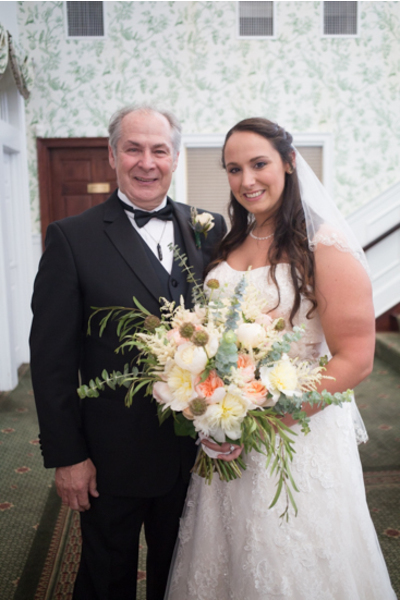 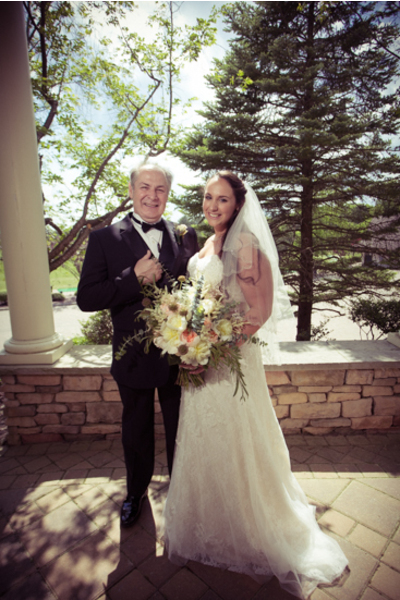 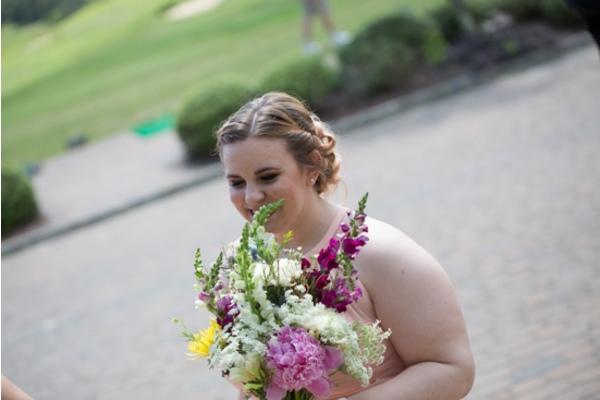 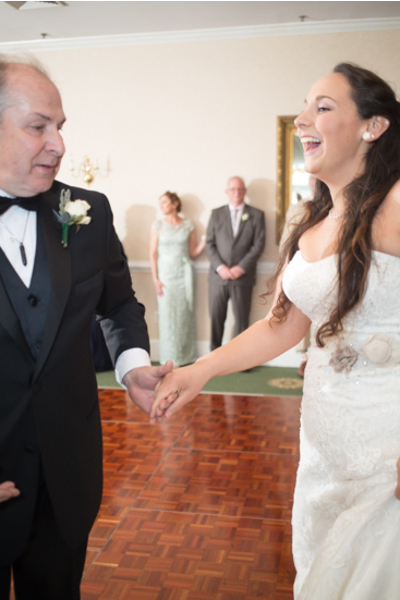 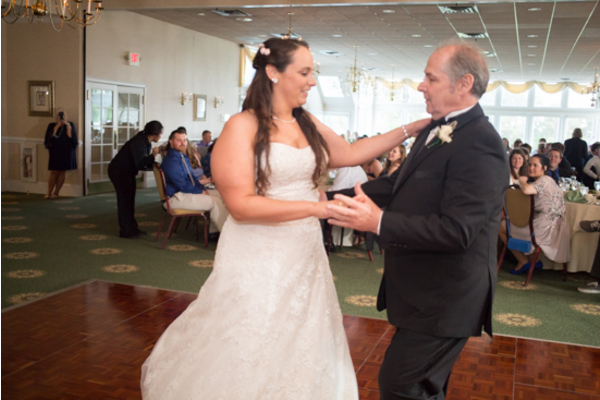 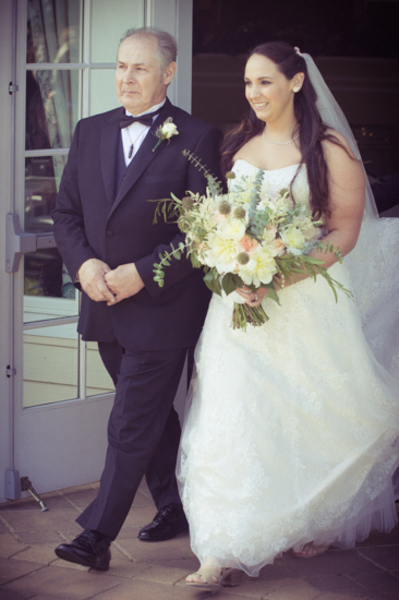 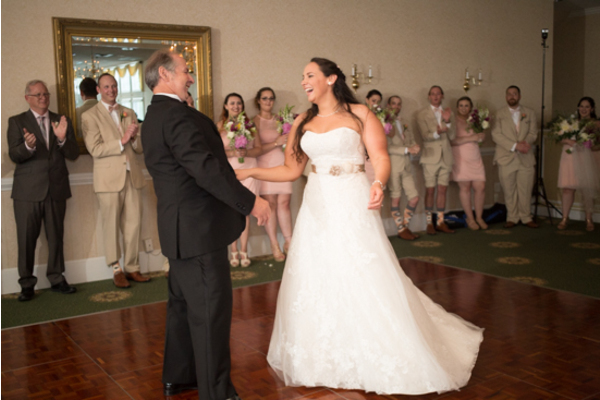 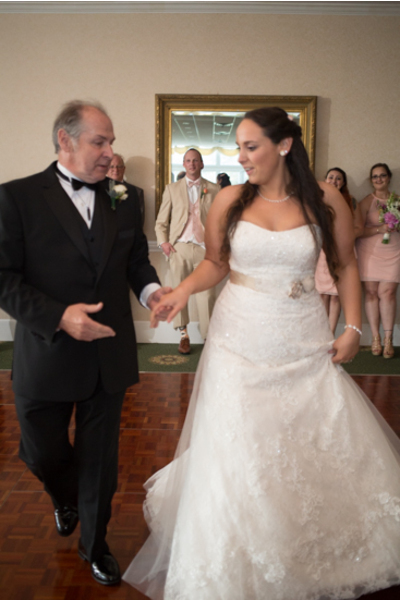 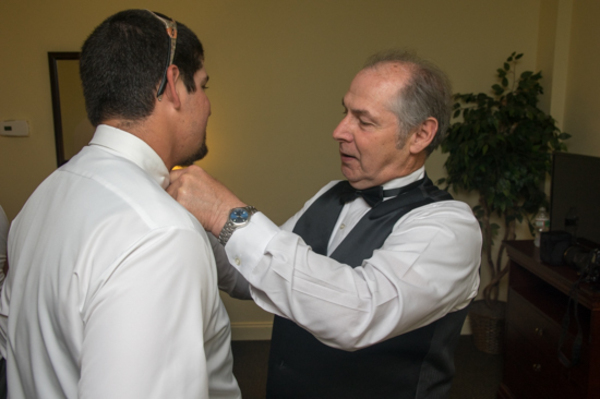 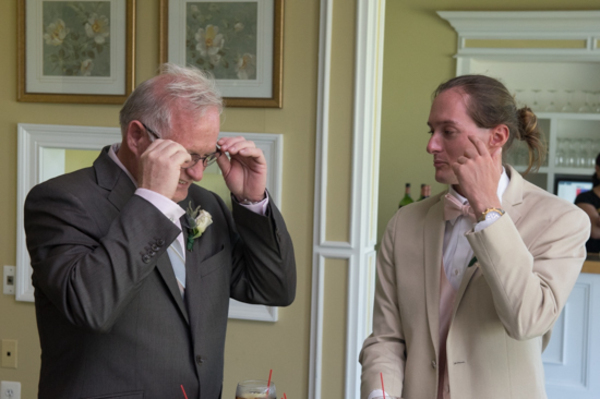 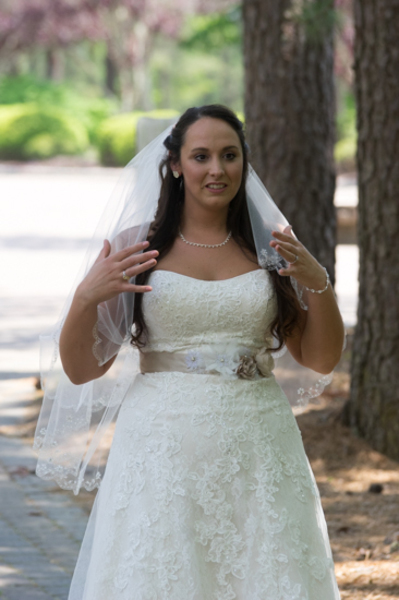 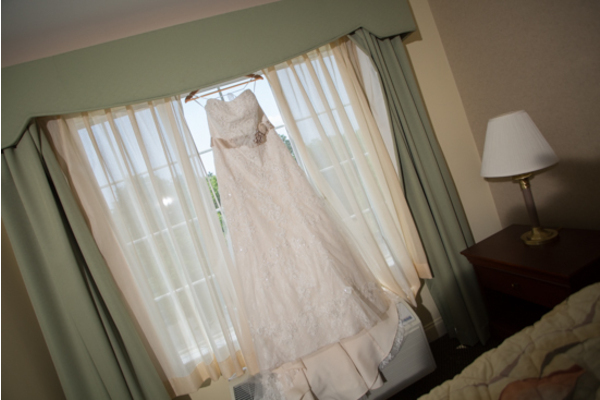 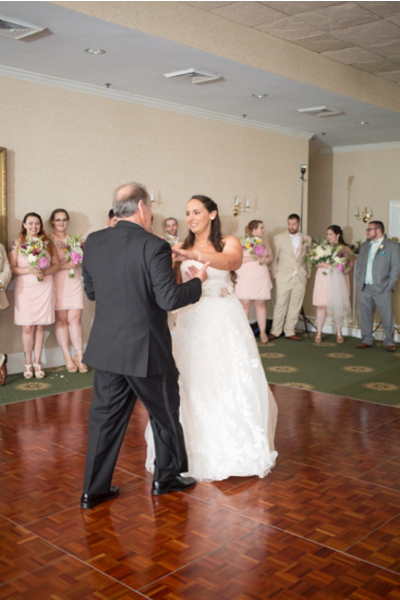 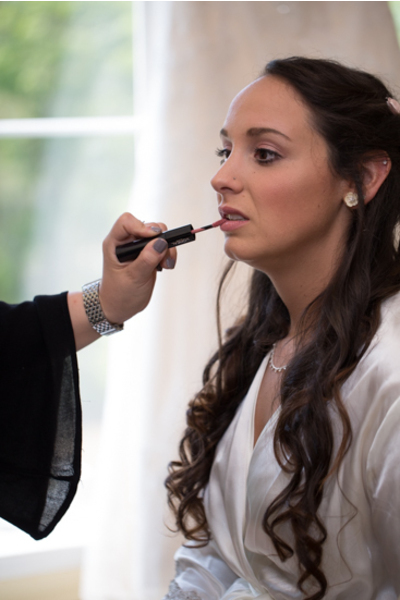 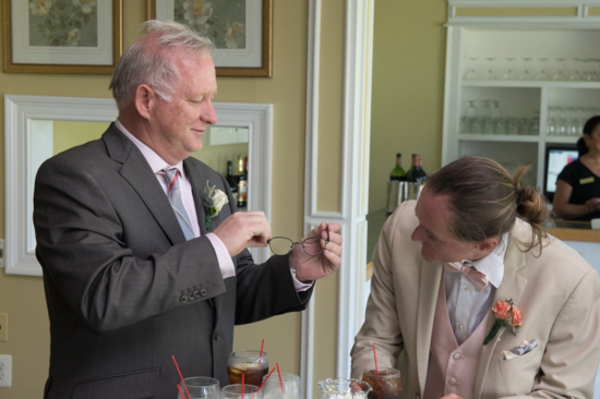 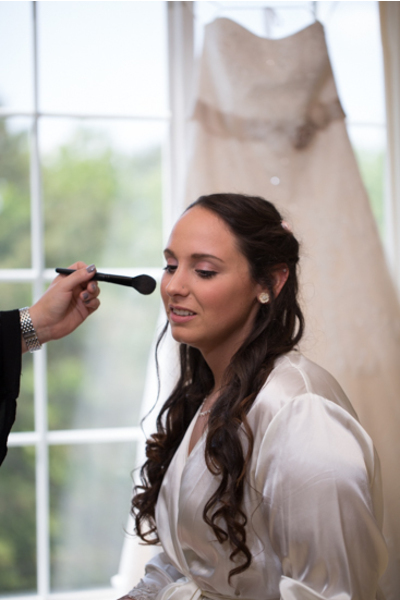 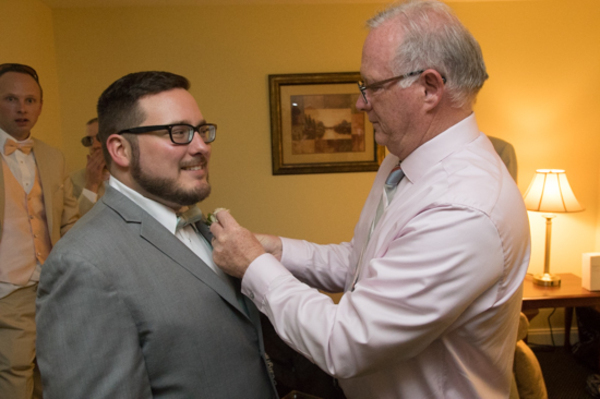 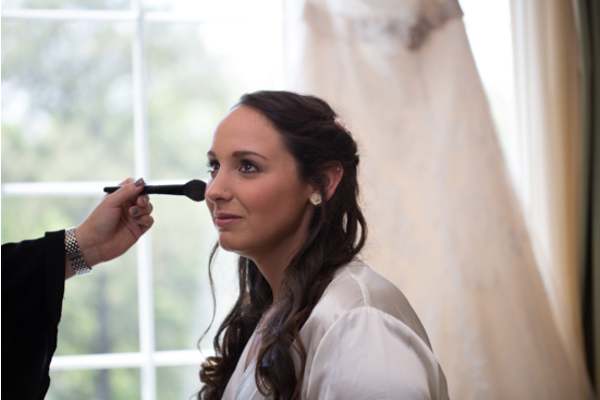 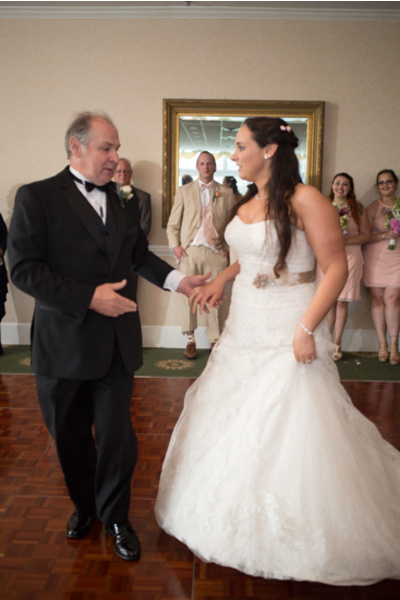 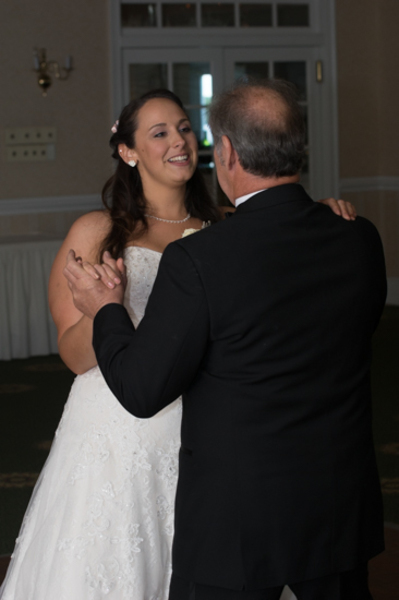 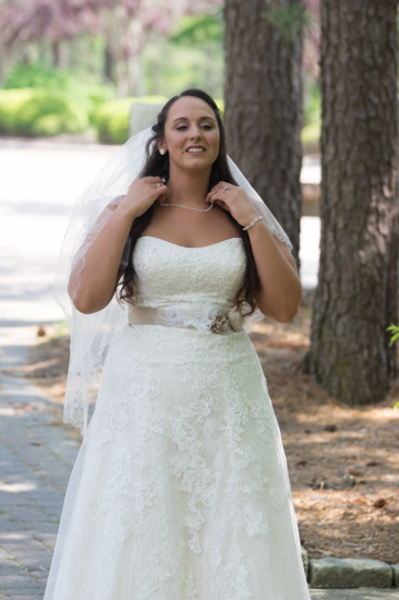 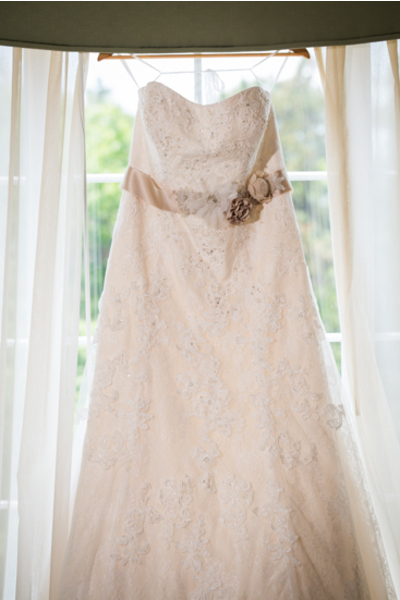 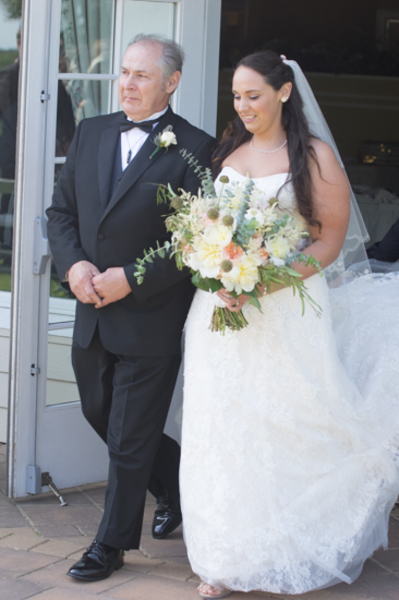 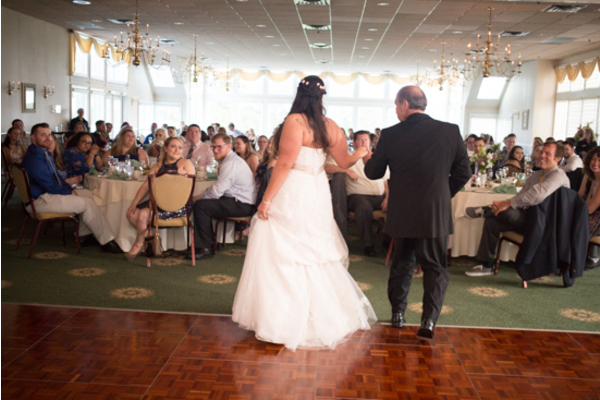 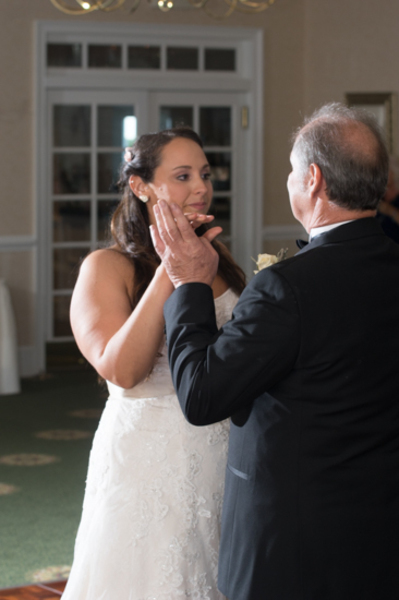 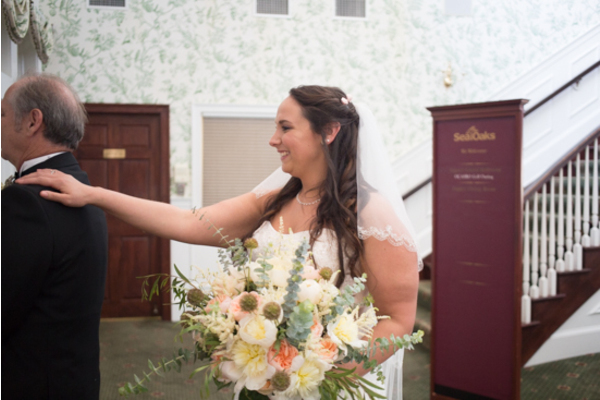 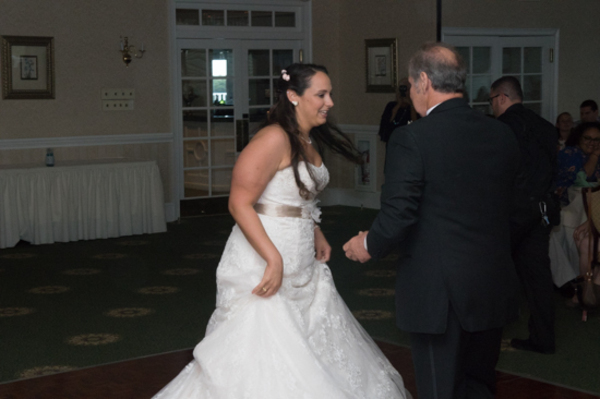 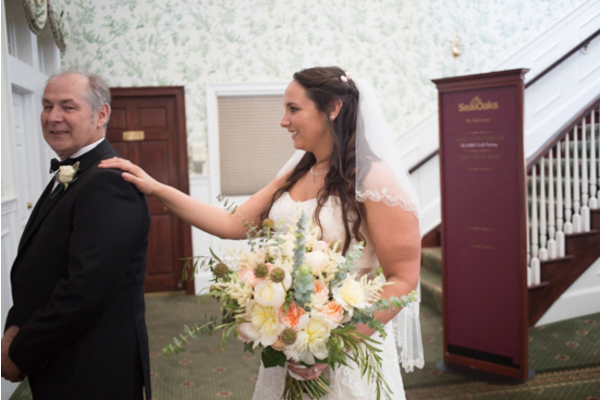 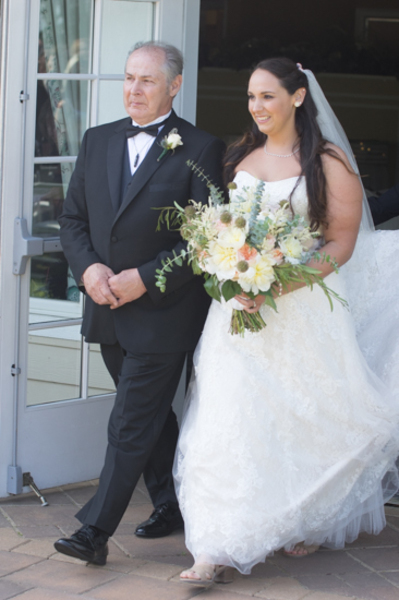 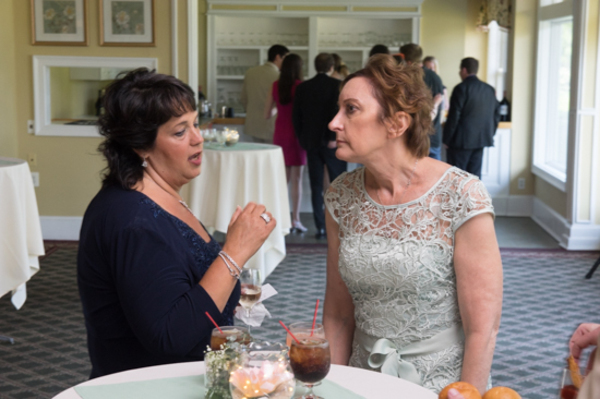 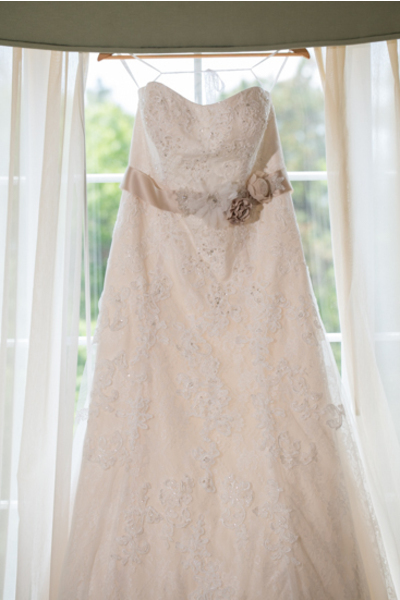 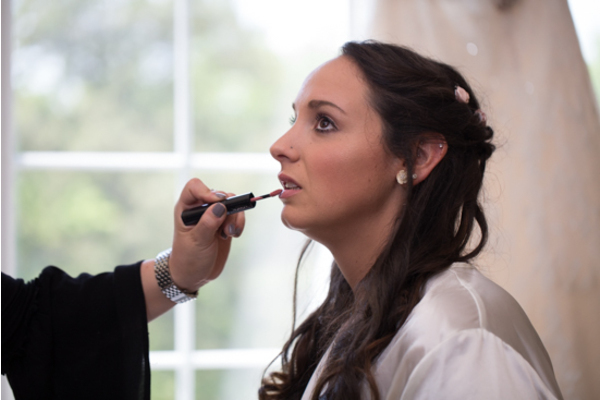 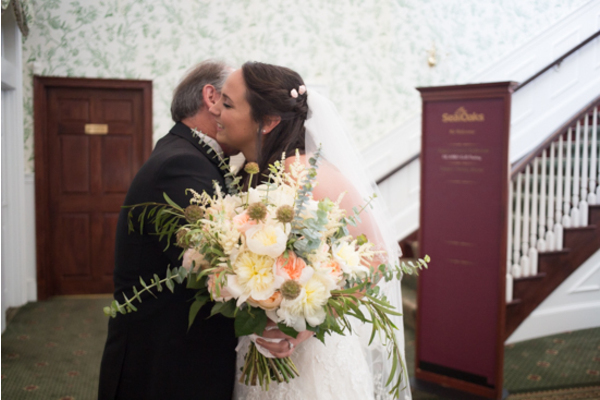 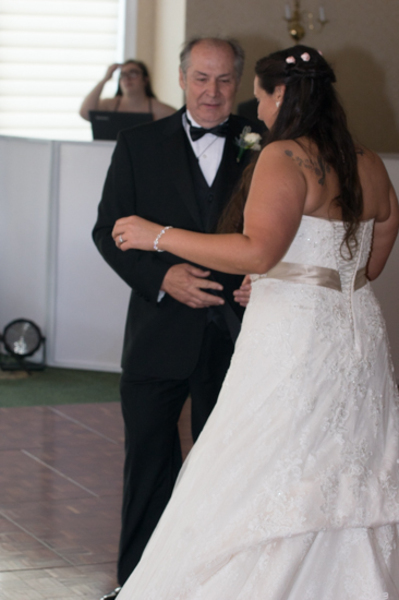 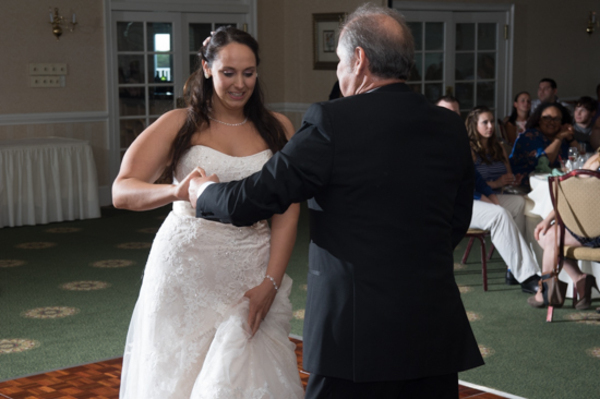 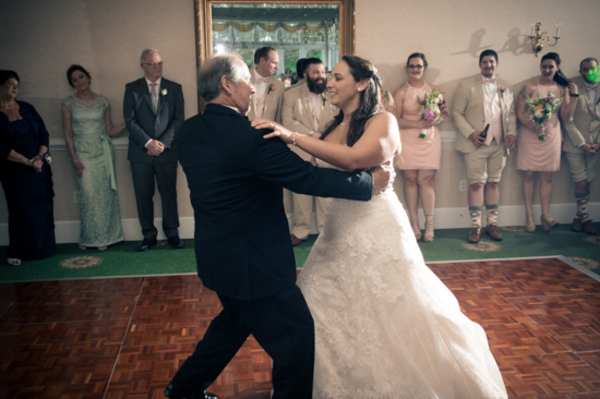 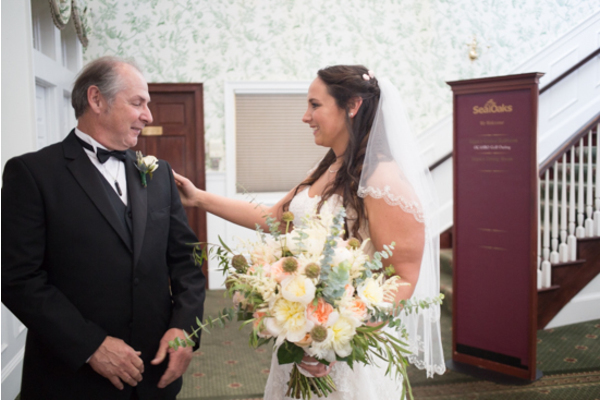 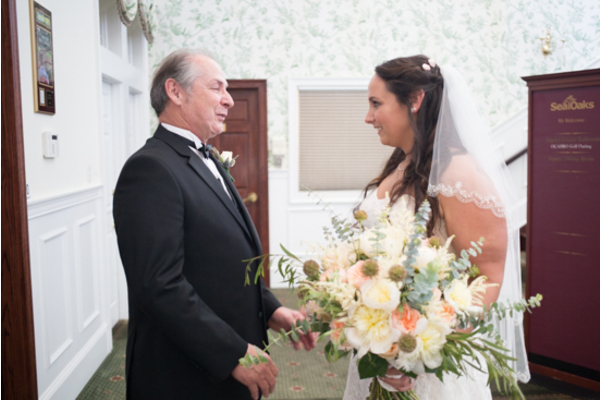 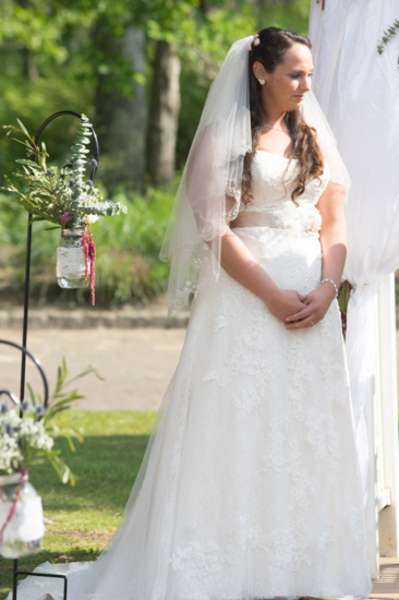 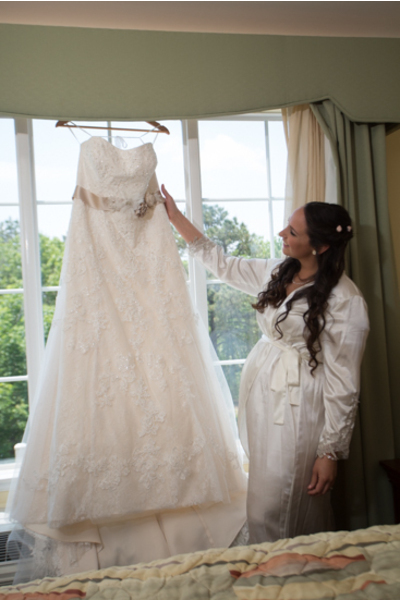 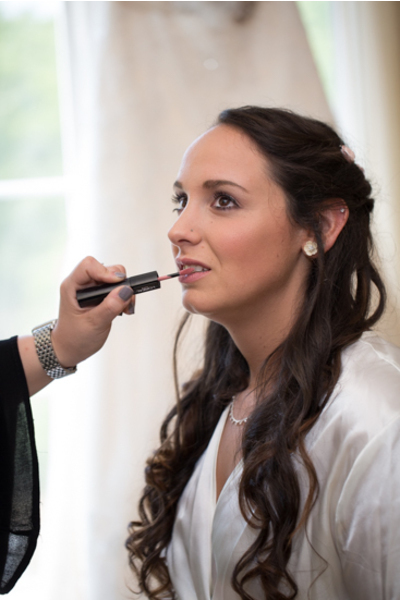 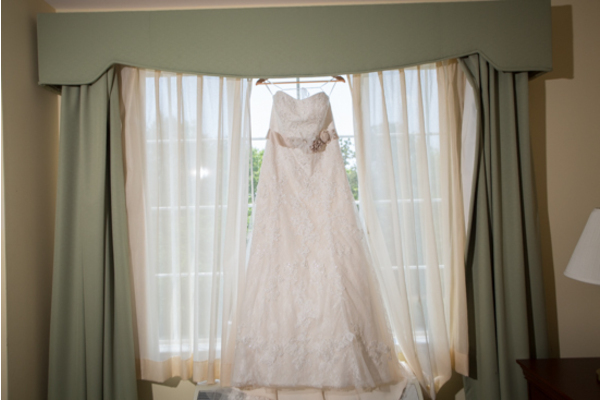 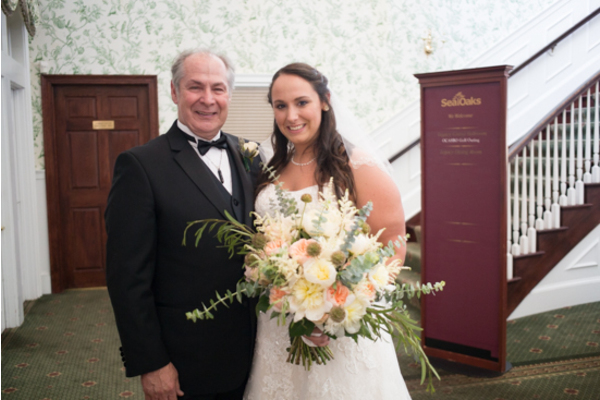 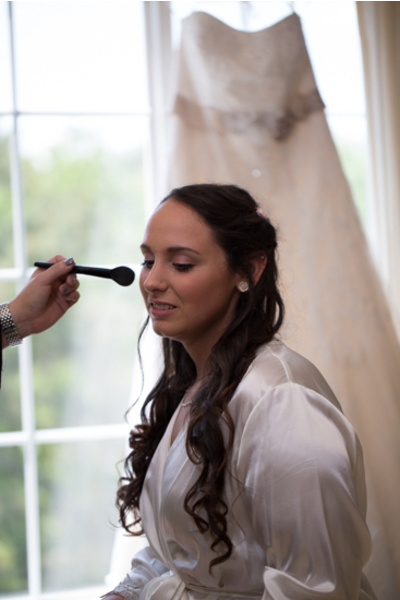 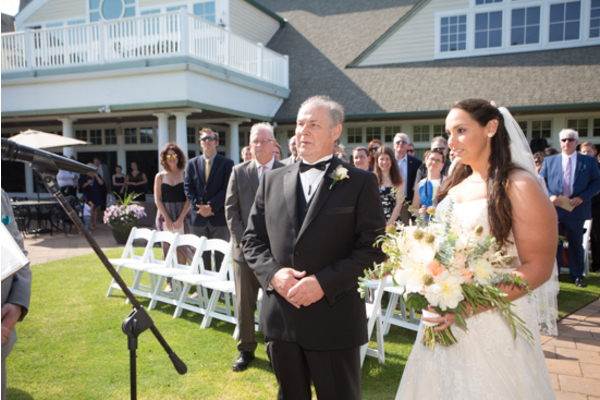 Our NJ Wedding Photographer was there to capture the touching moment when Kelly’s father saw her for the first time. 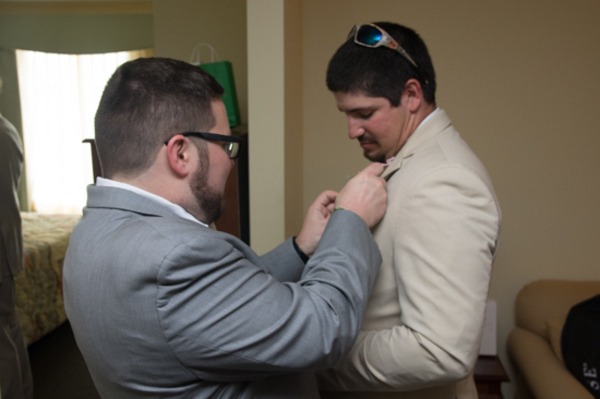 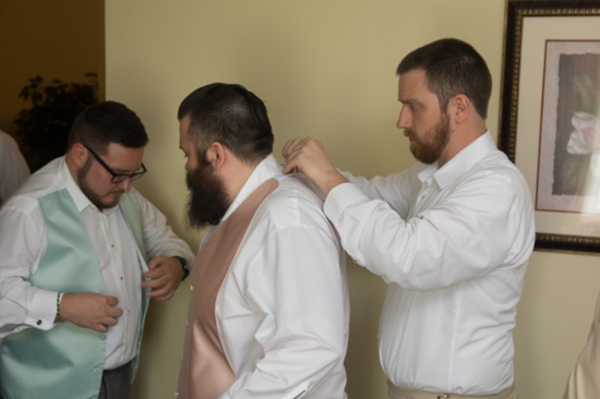 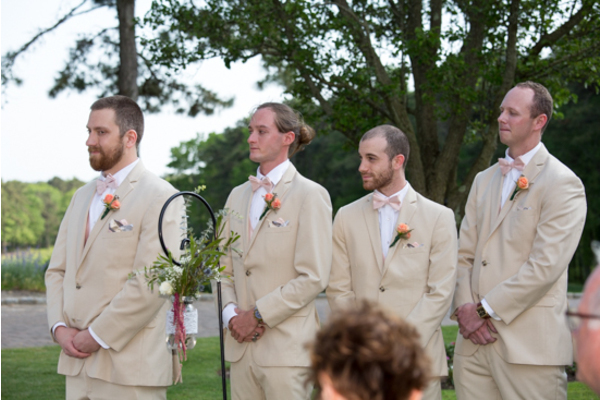 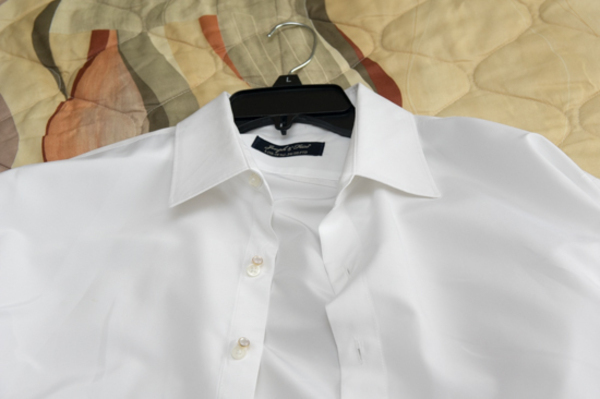 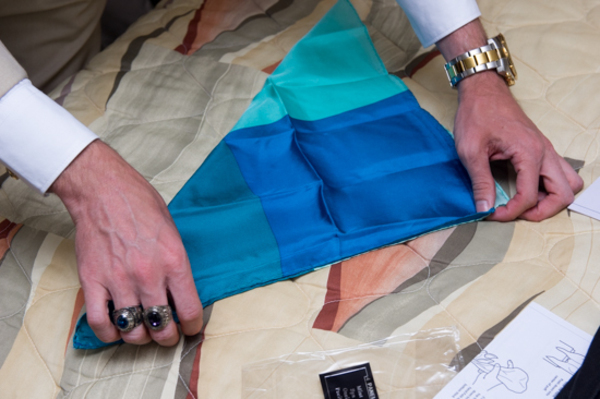 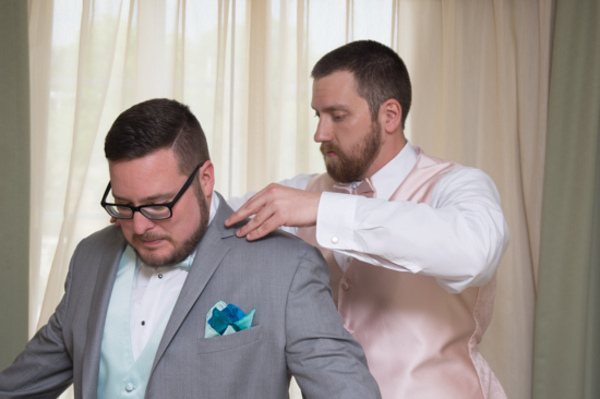 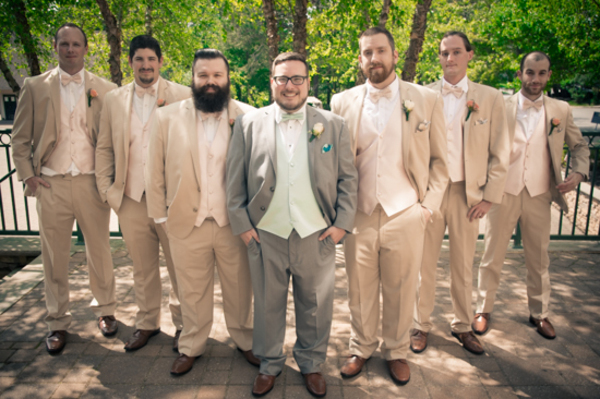 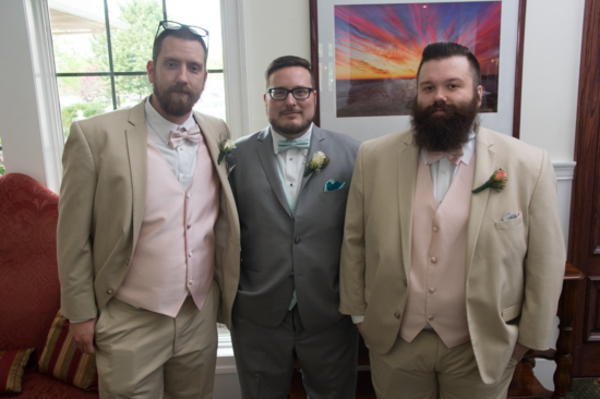 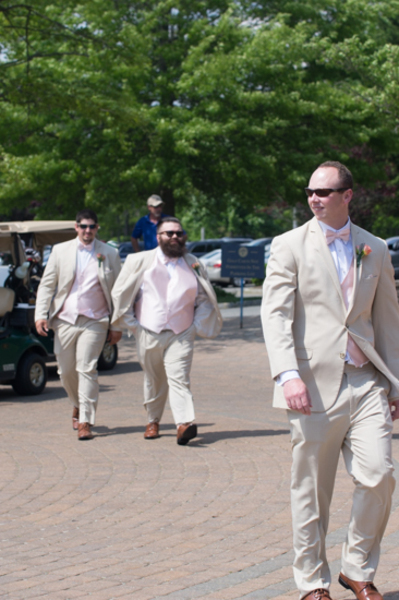 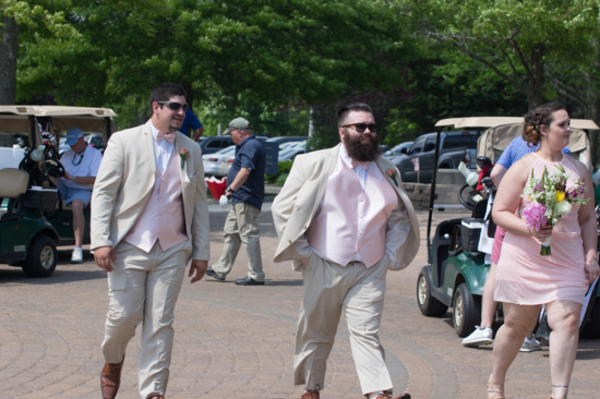 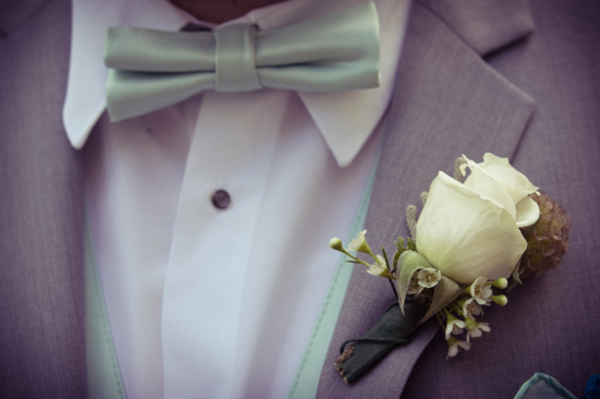 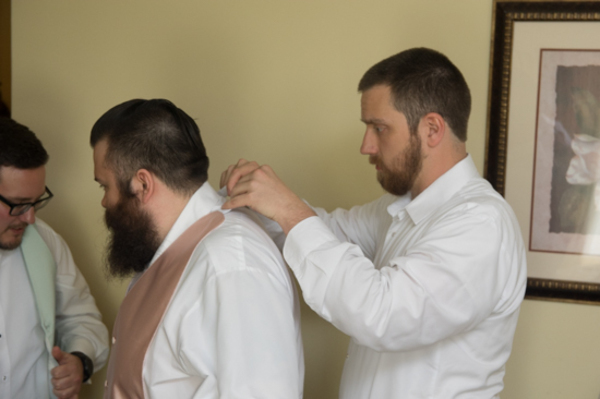 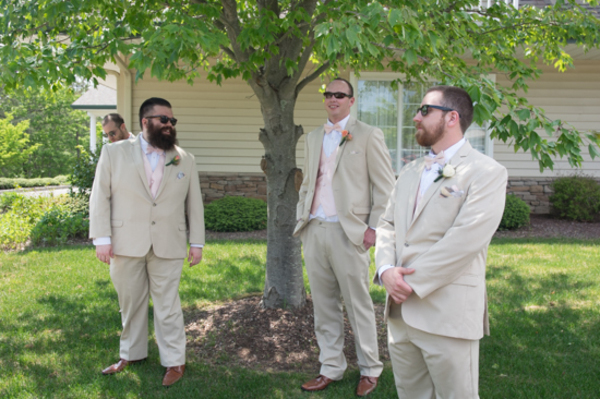 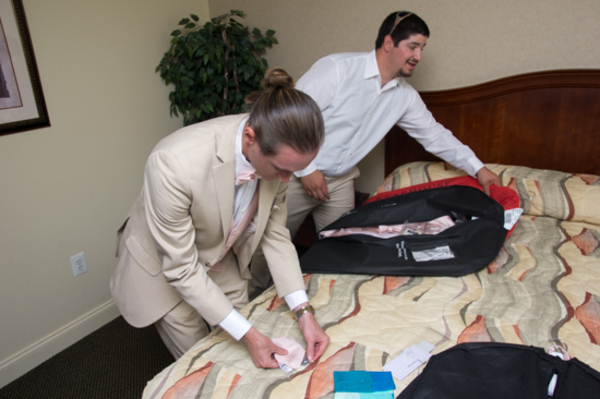 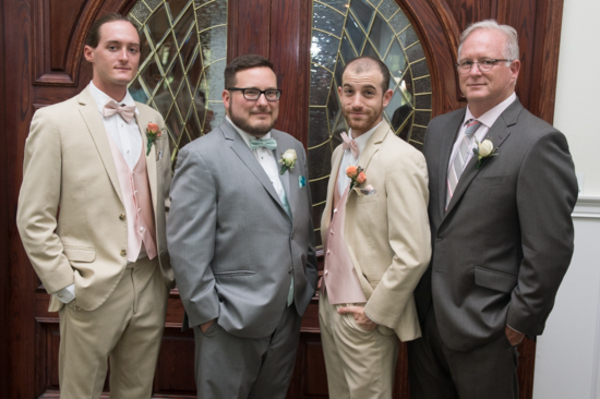 Meanwhile, Kyle was elsewhere with his groomsmen getting ready for the big day. 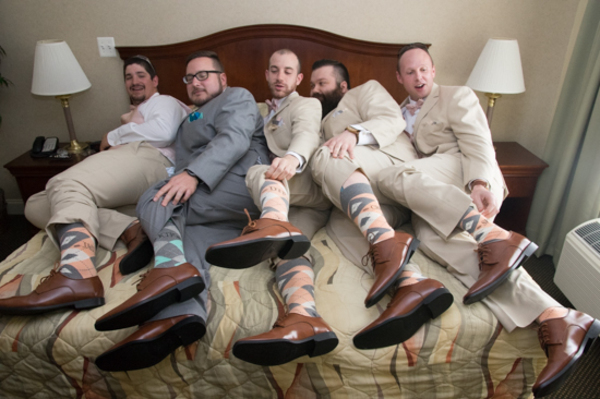 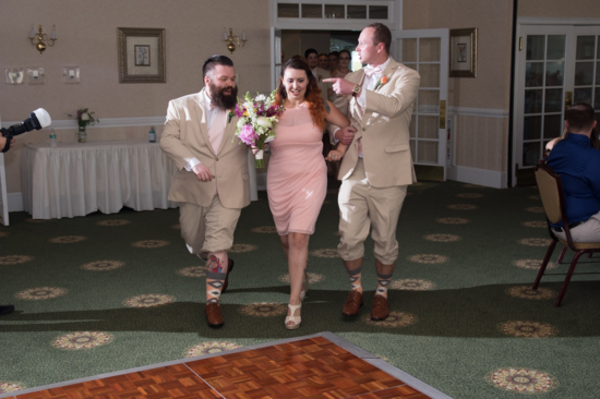 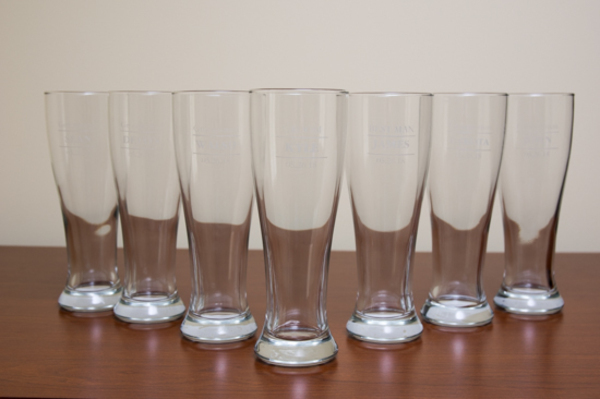 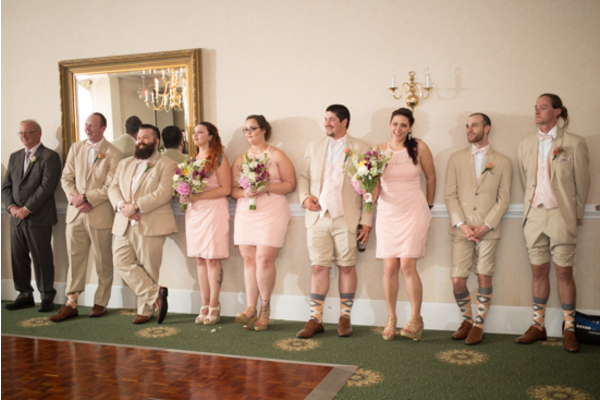 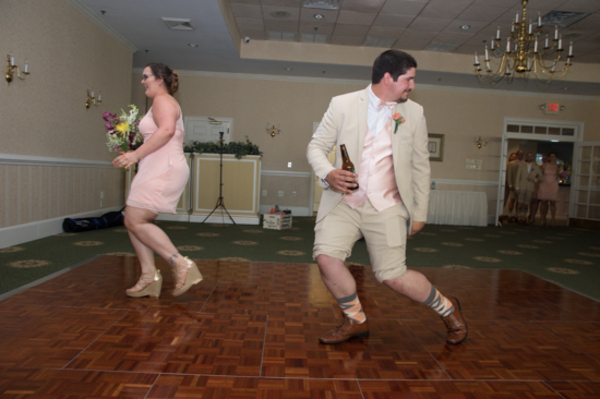 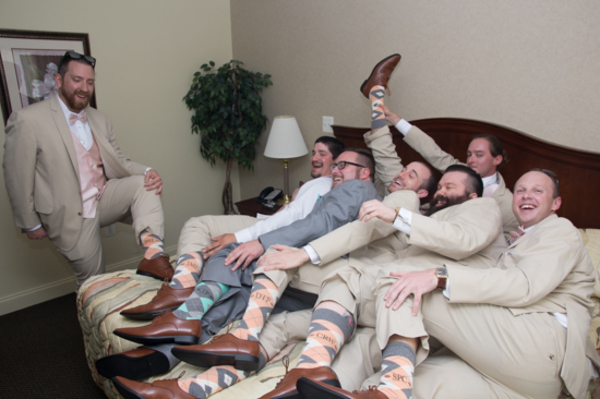 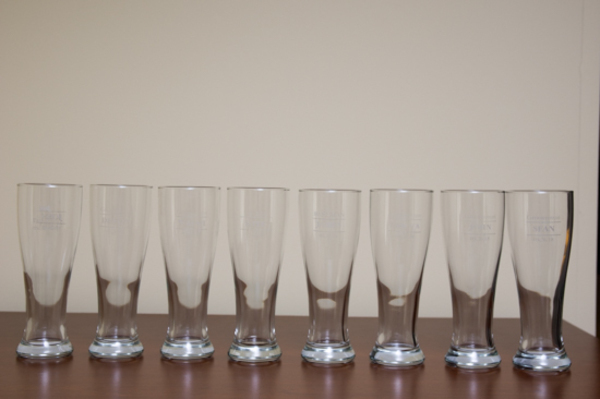 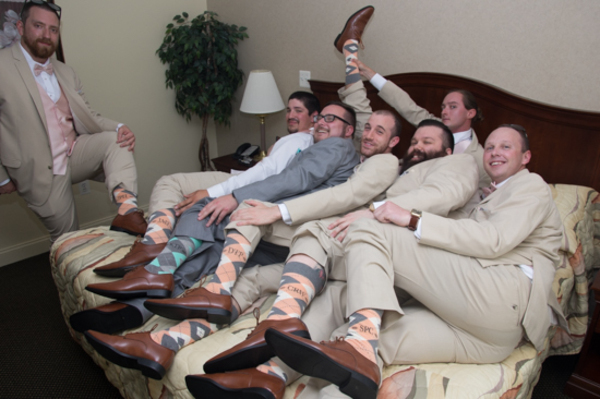 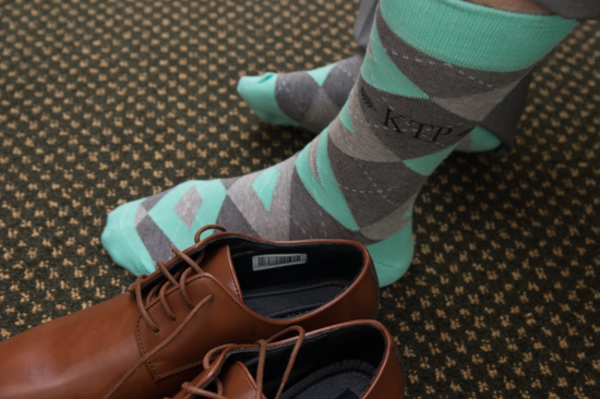 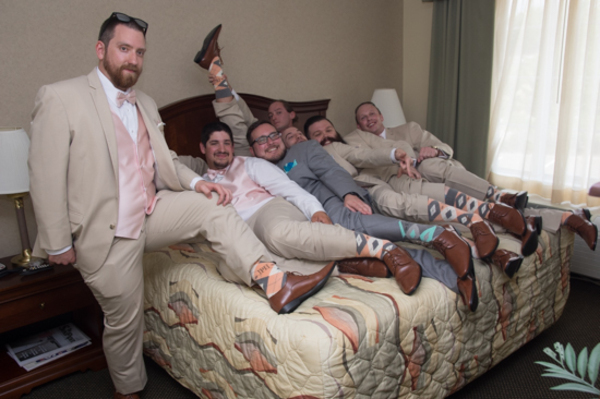 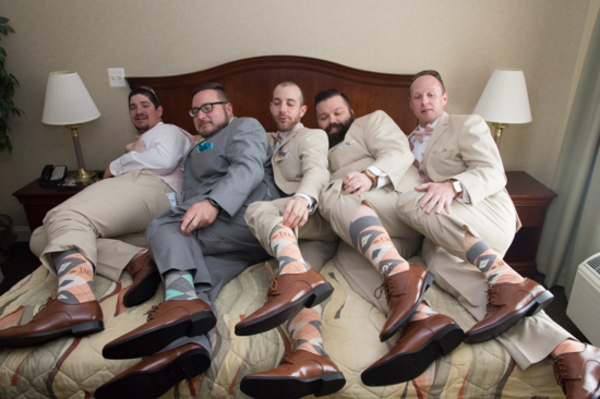 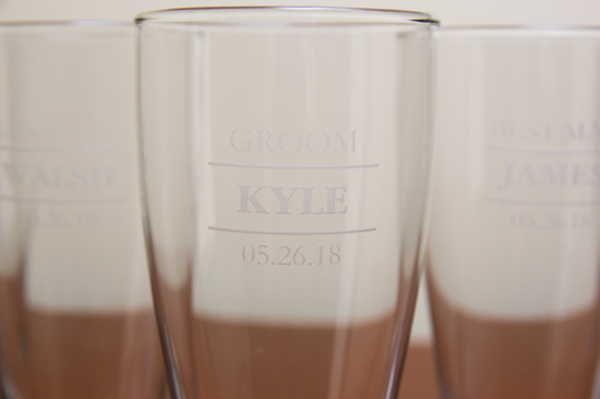 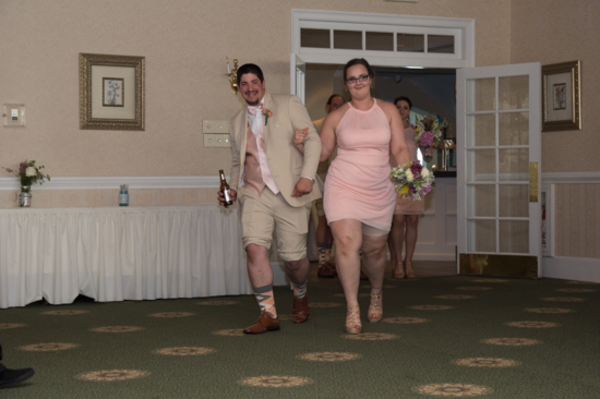 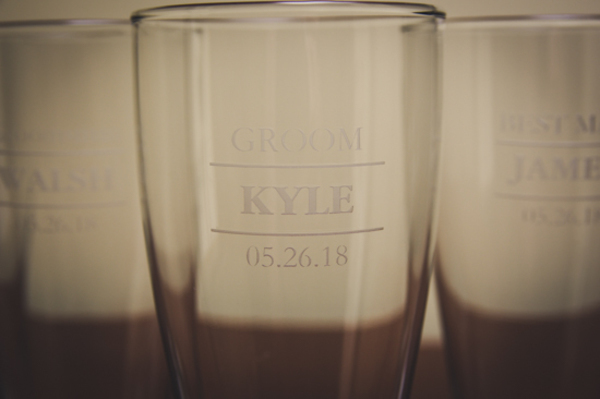 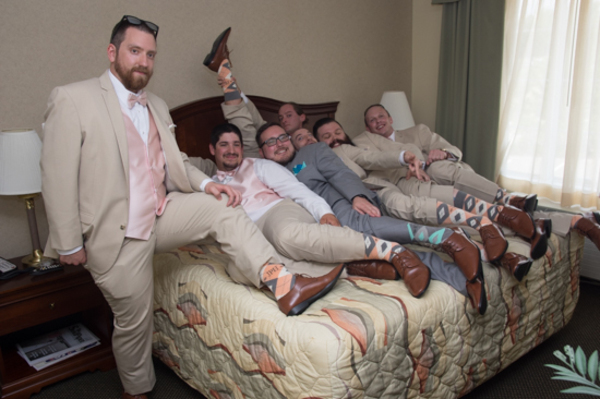 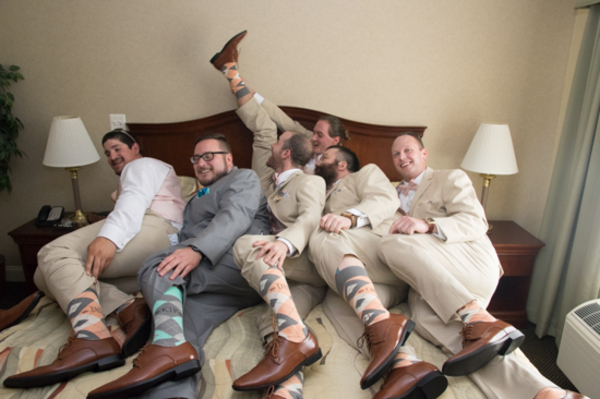 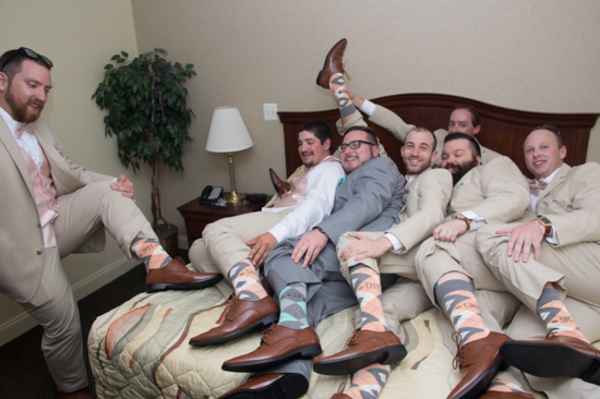 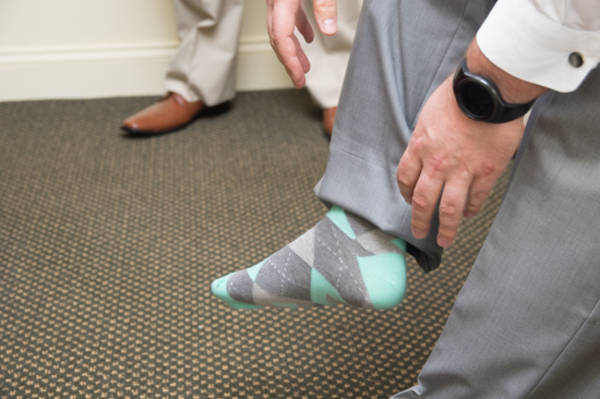 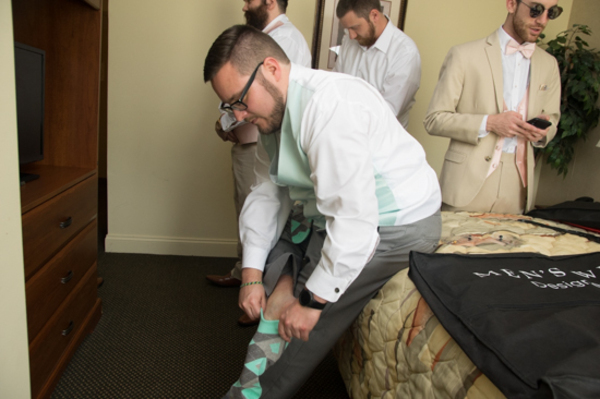 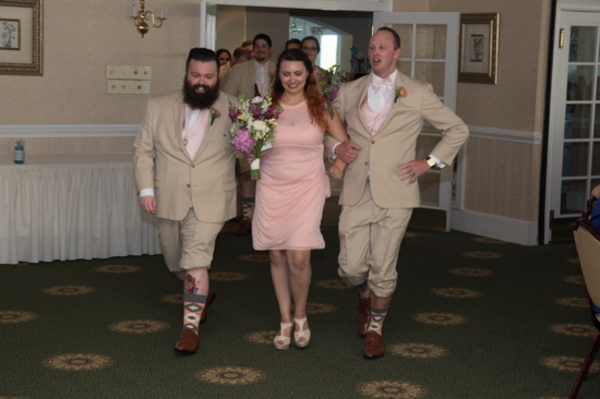 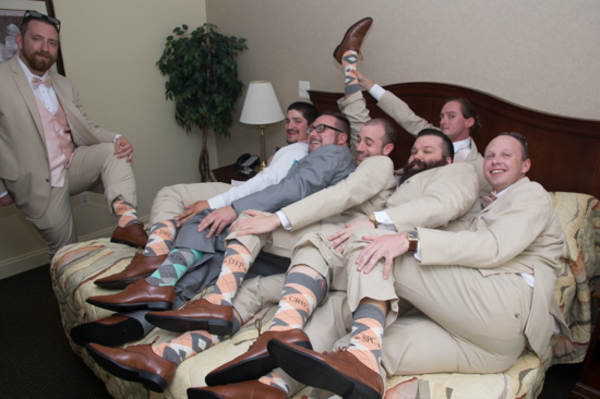 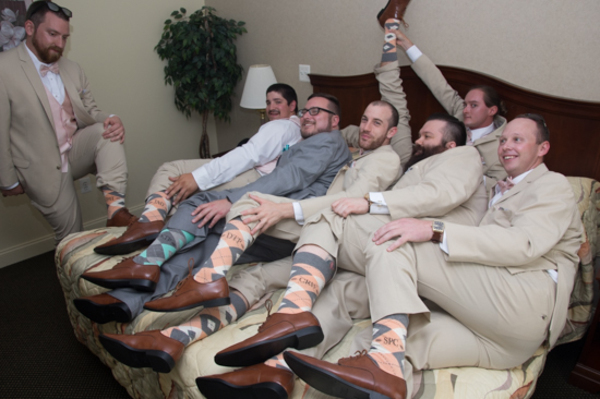 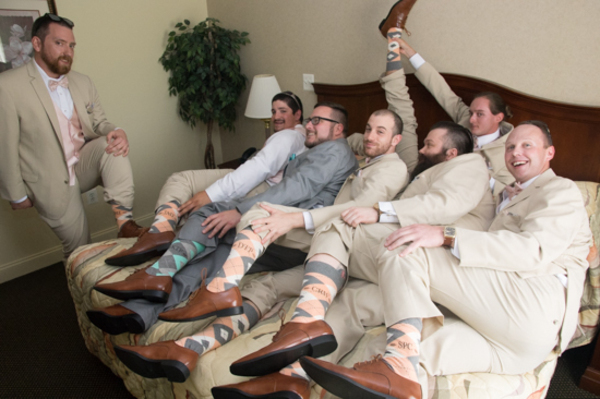 The groomsmen were all gifted with personalized beer glasses and were adorned in matching argyle socks. 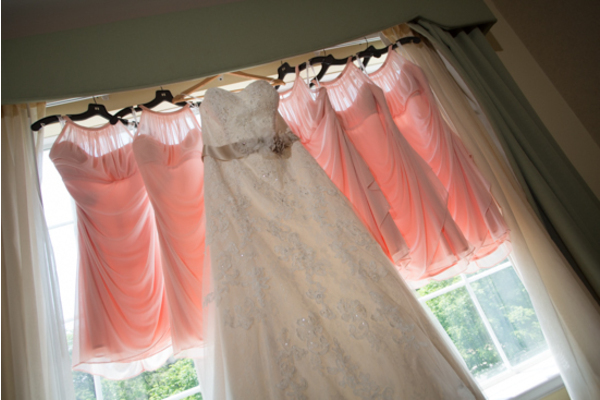 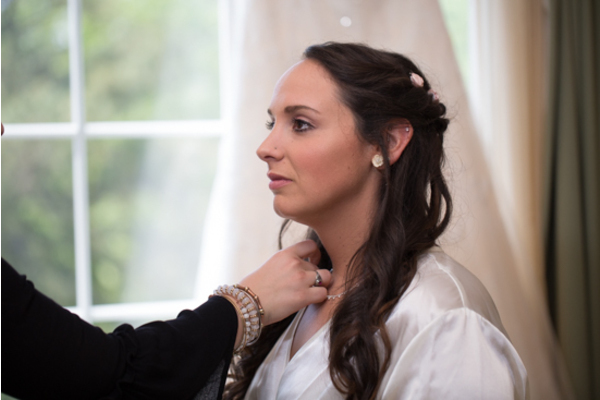 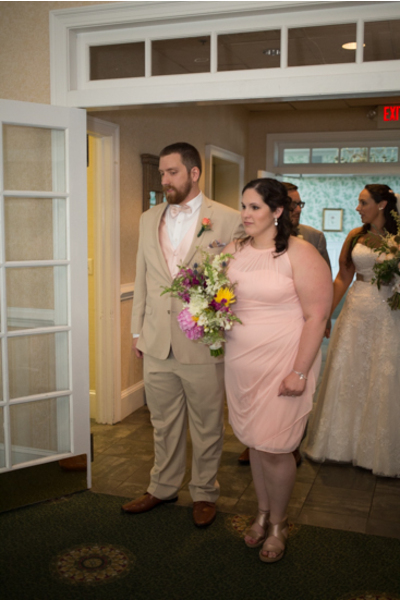 The time had come for the bride and groom to have their first look at each other before the wedding. 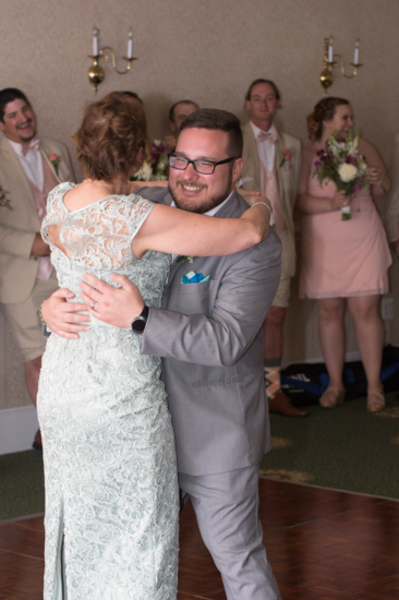 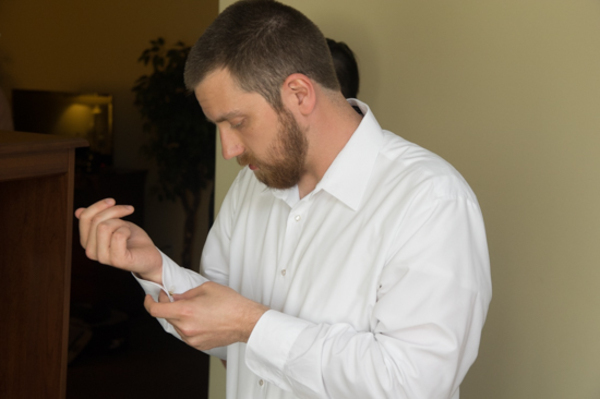 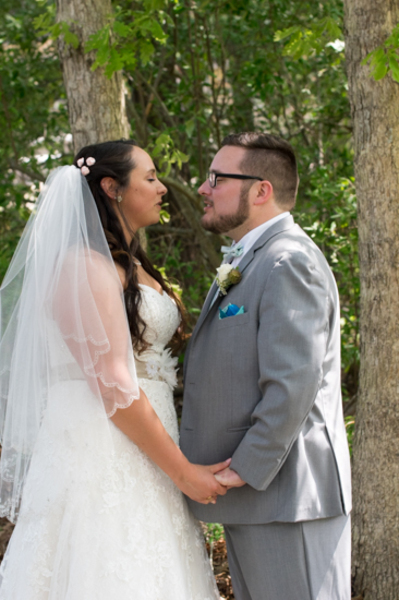 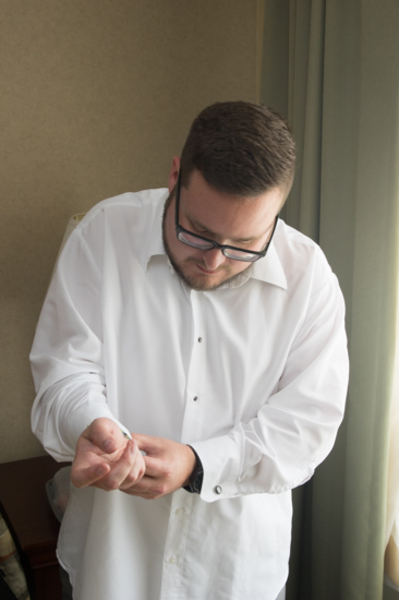 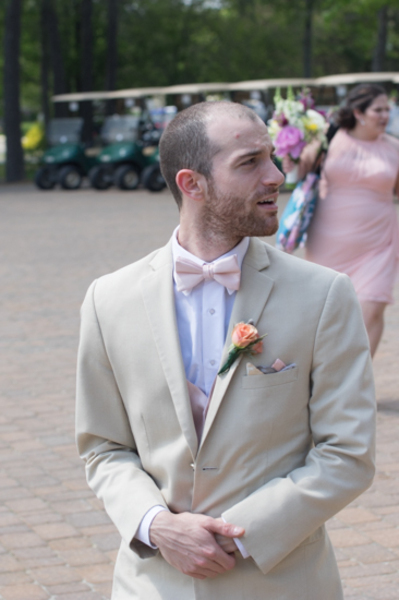 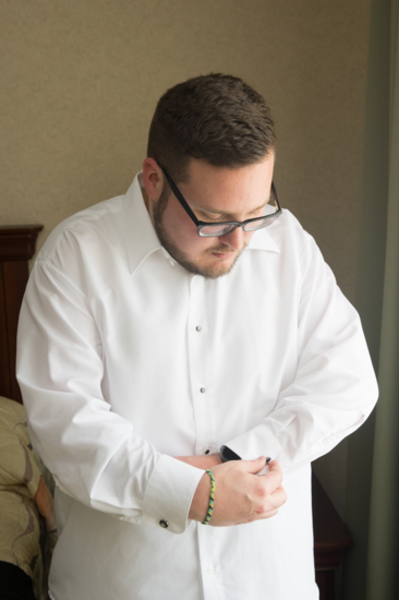 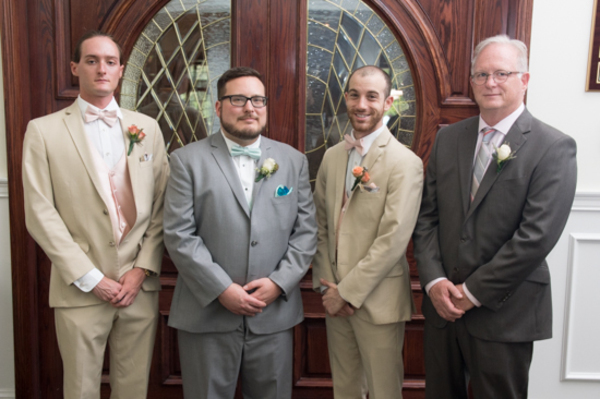 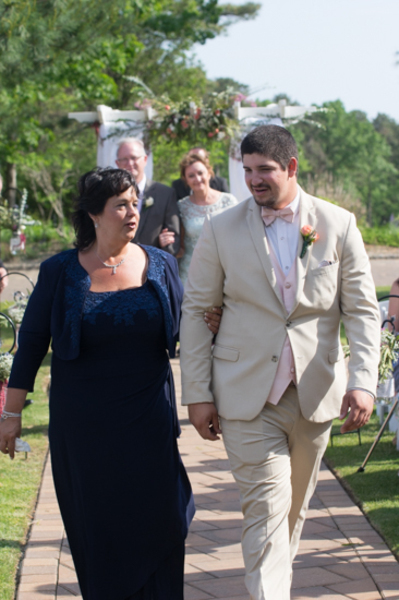 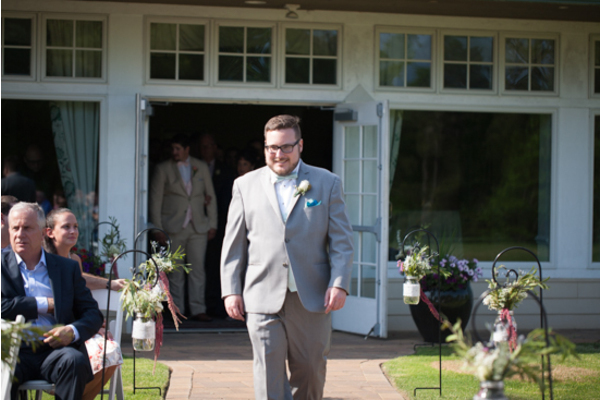 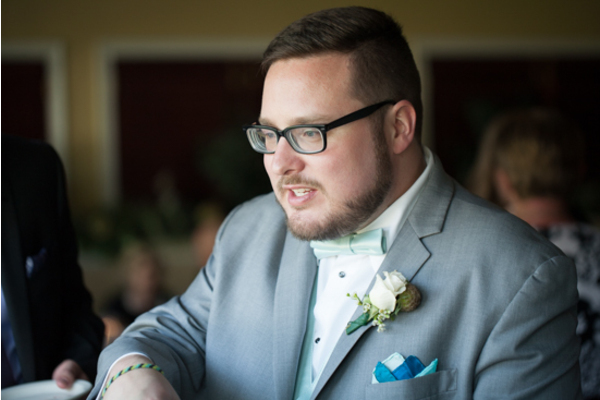 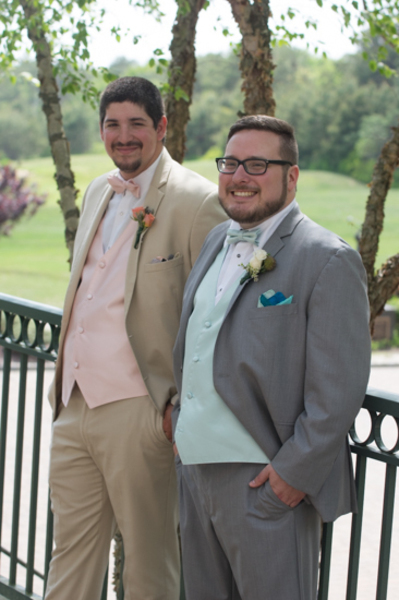 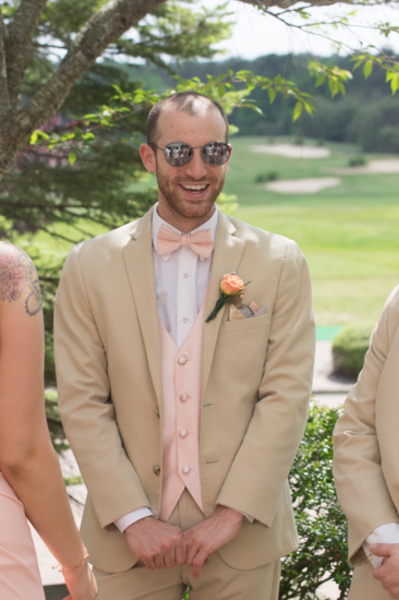 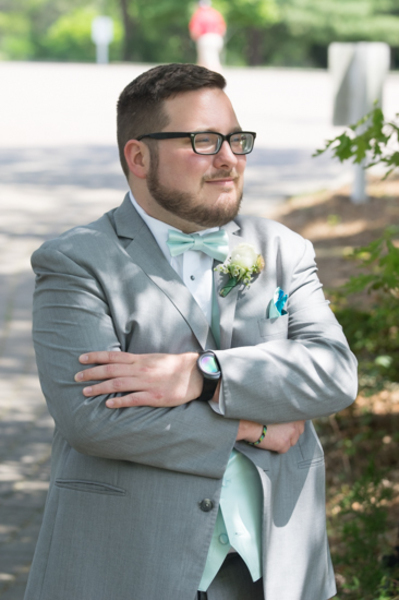 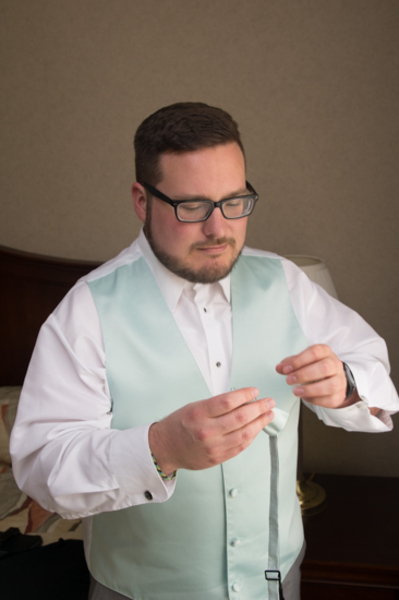 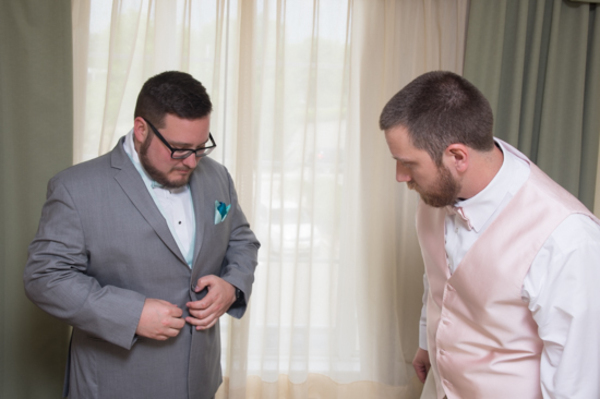 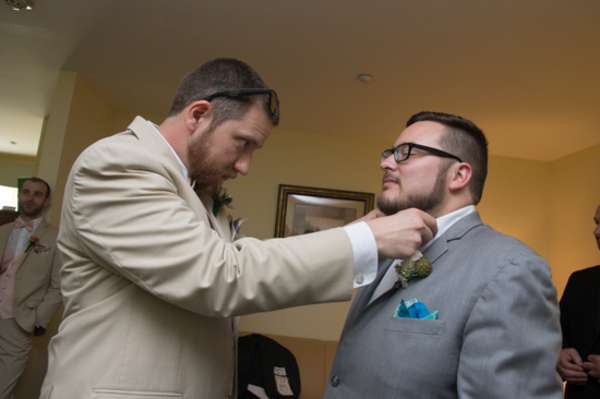 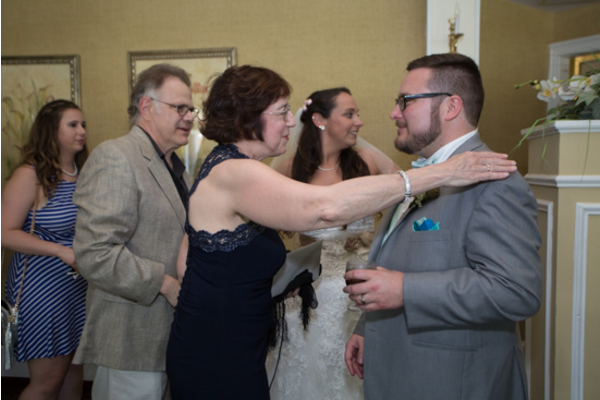 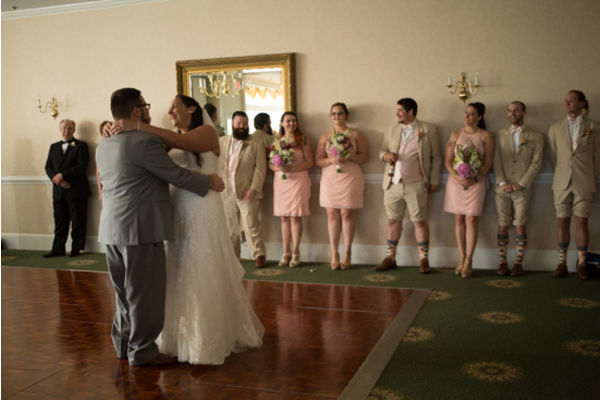 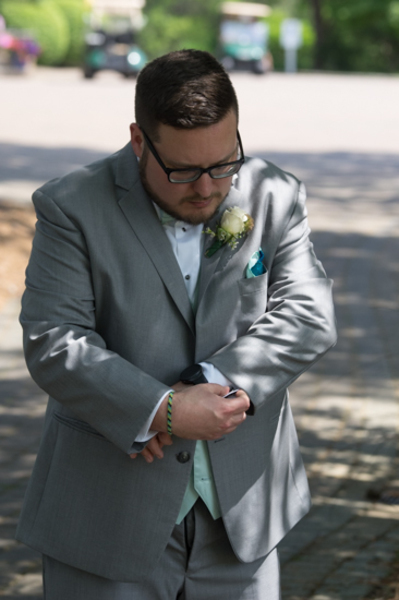 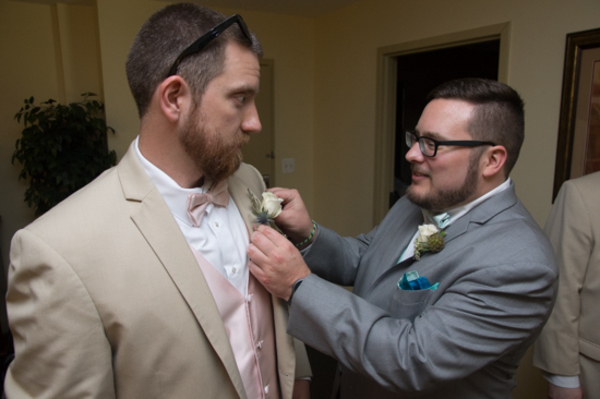 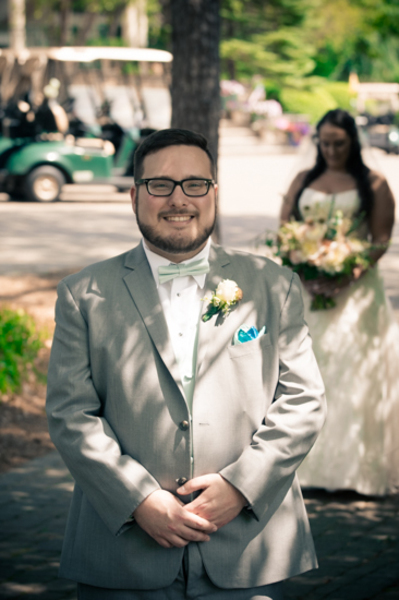 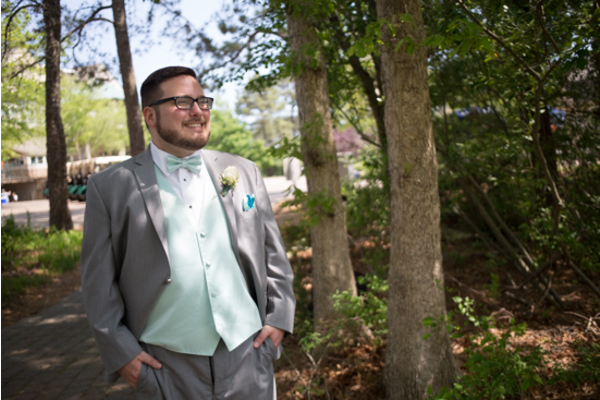 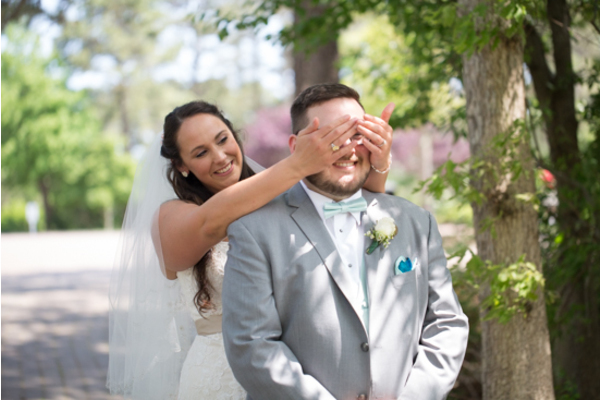 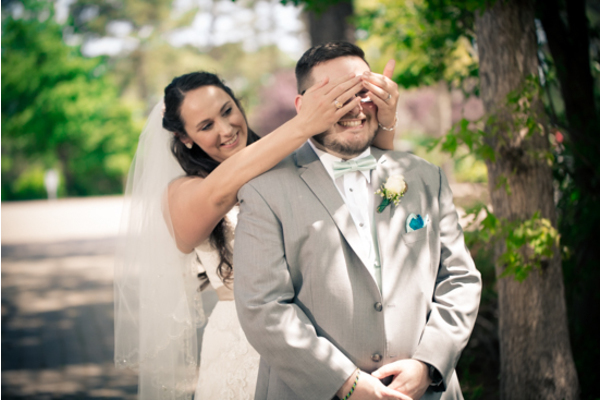 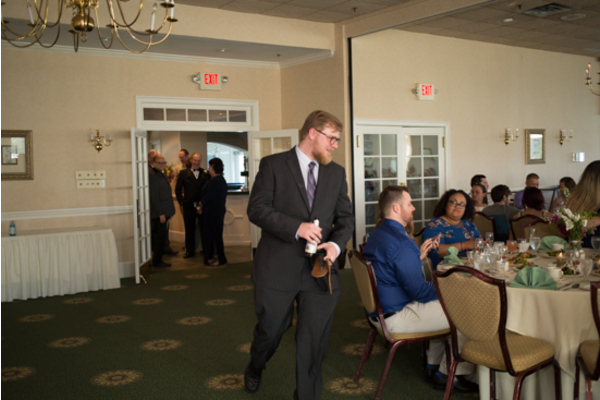 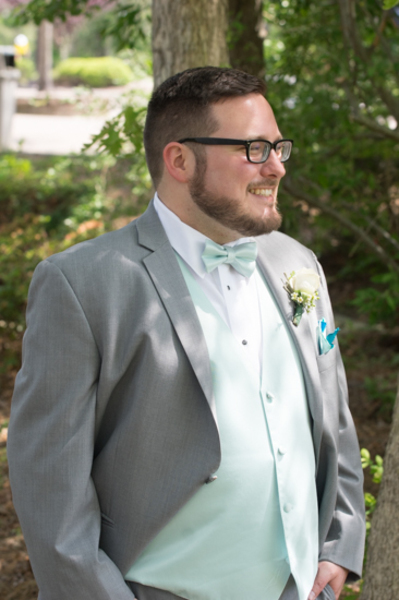 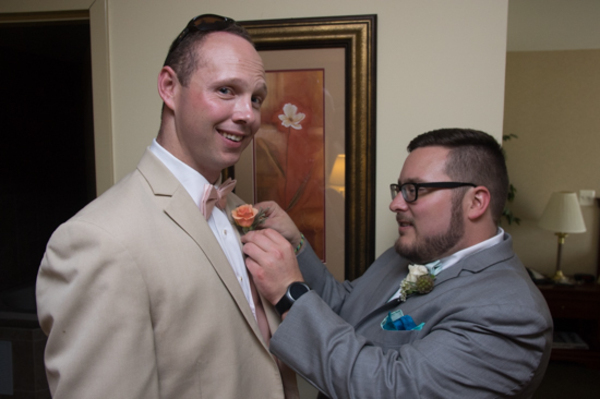 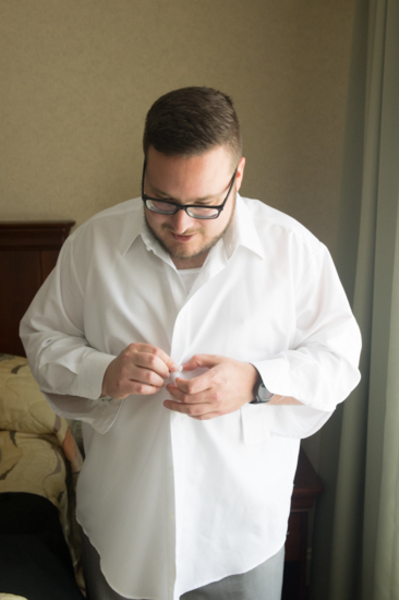 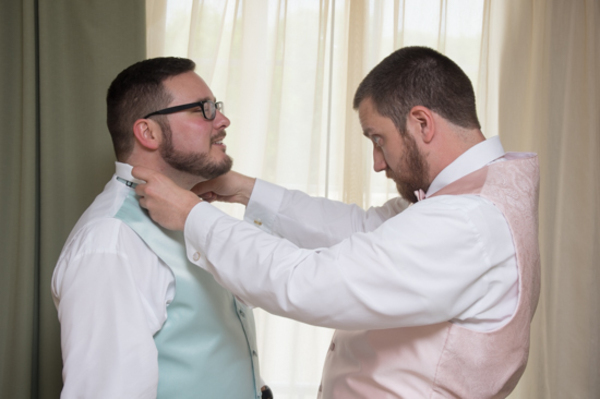 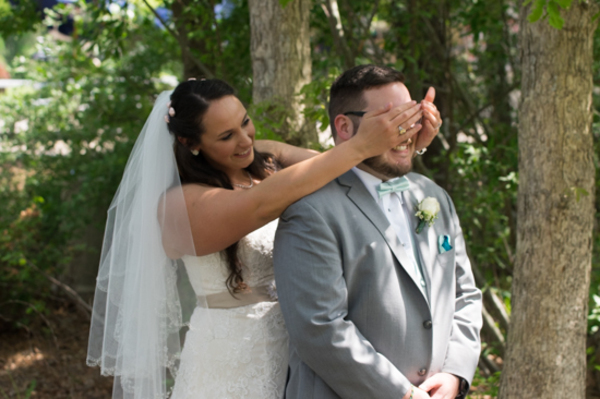 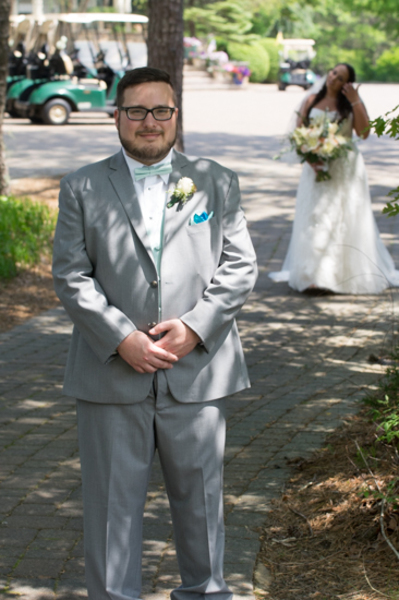 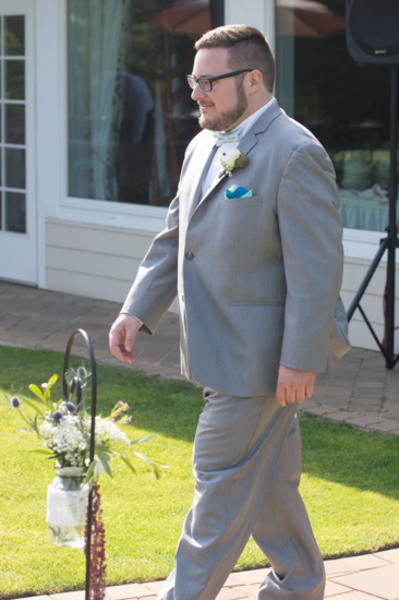 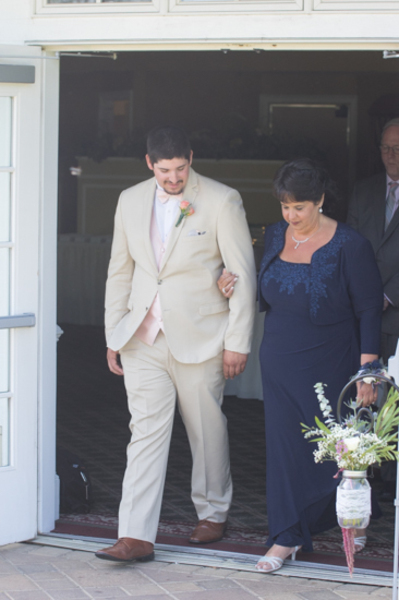 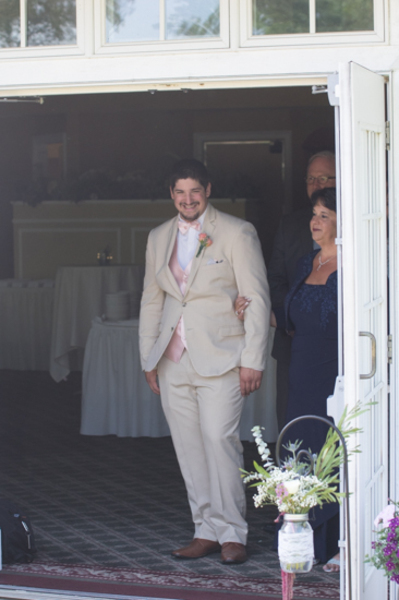 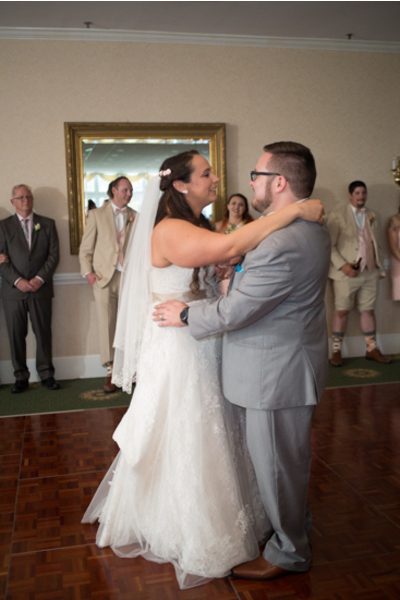 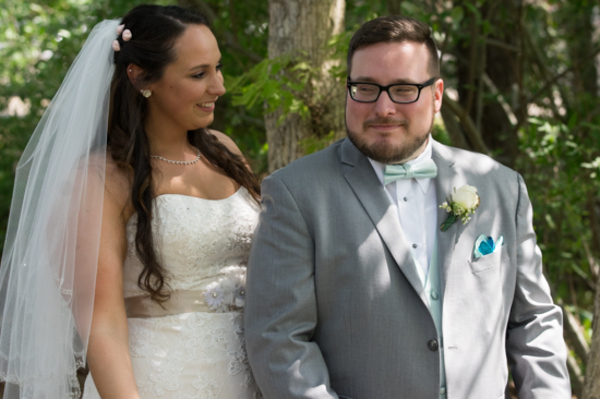 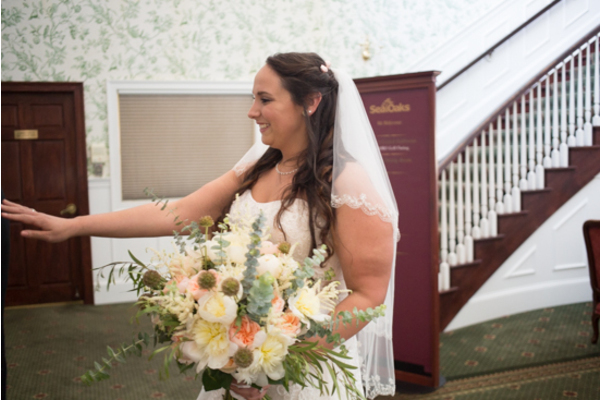 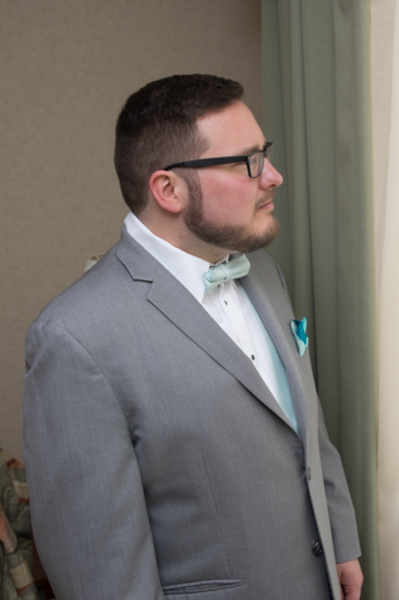 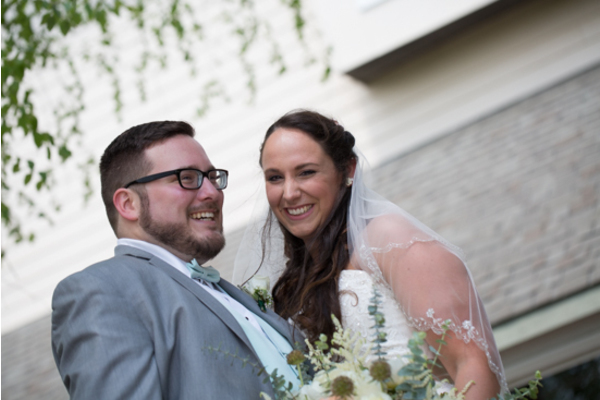 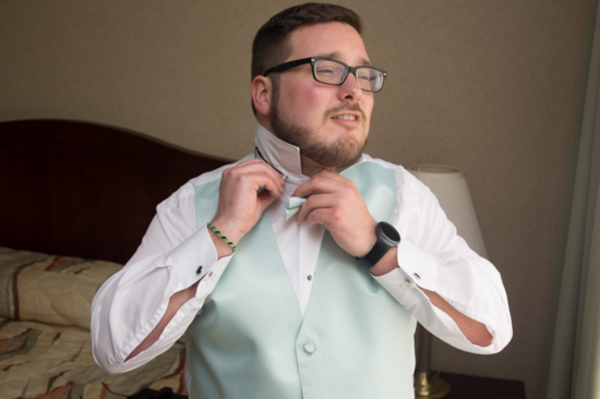 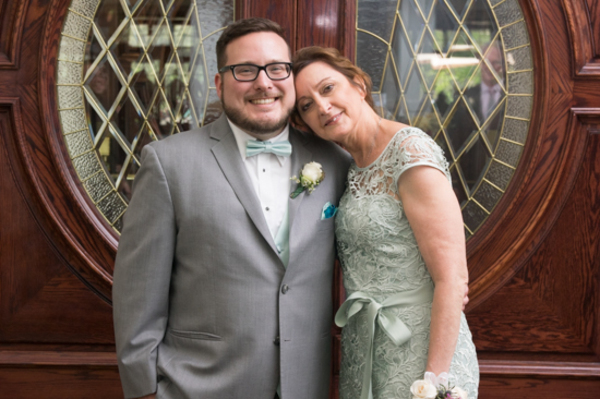 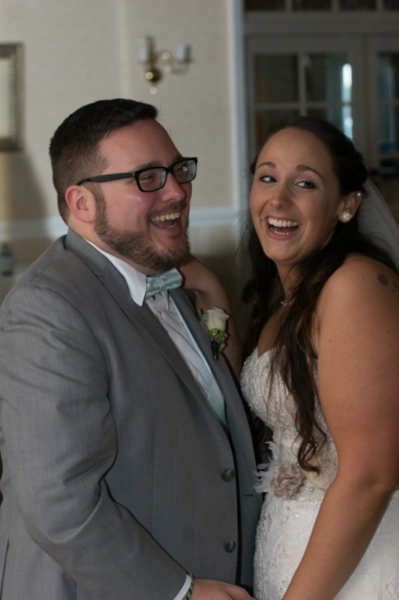 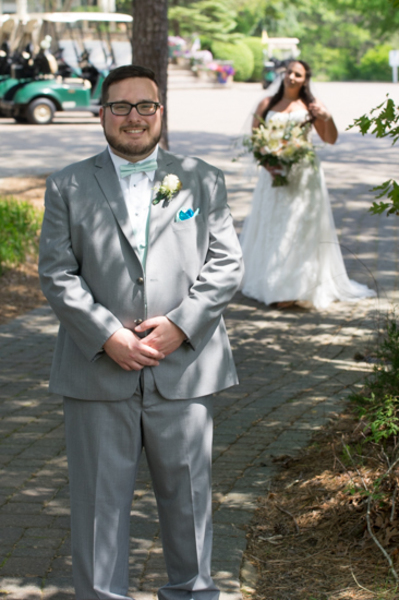 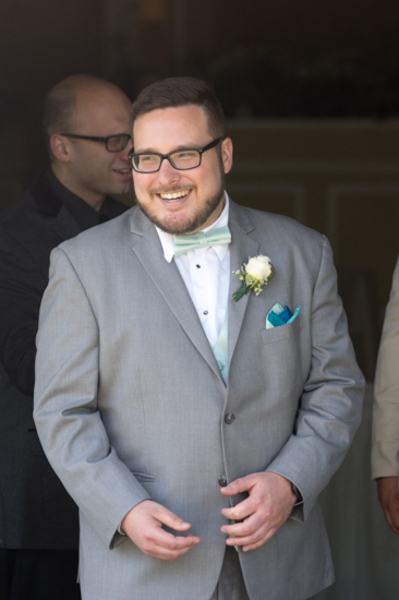 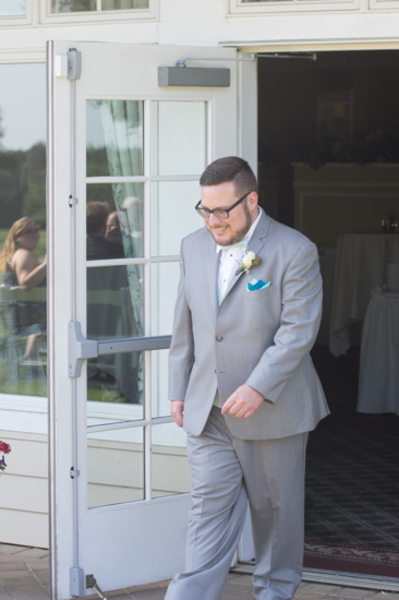 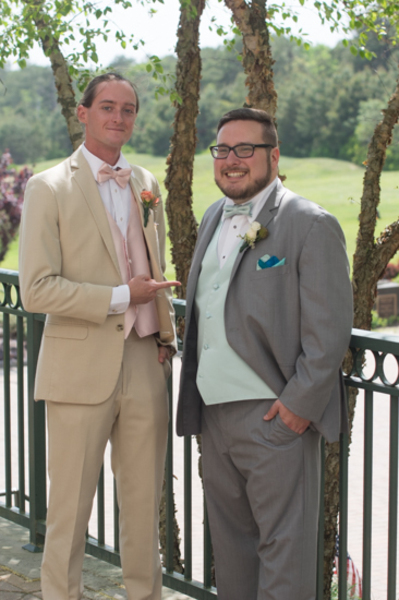 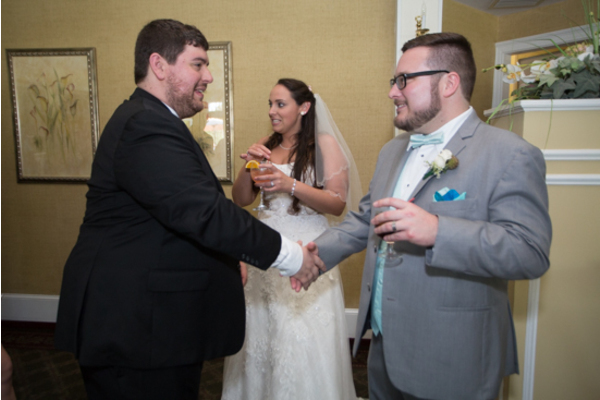 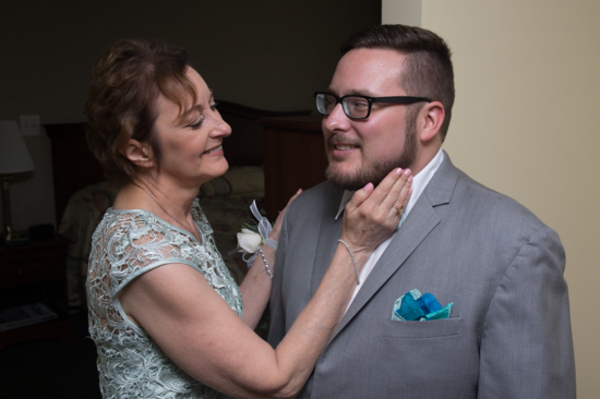 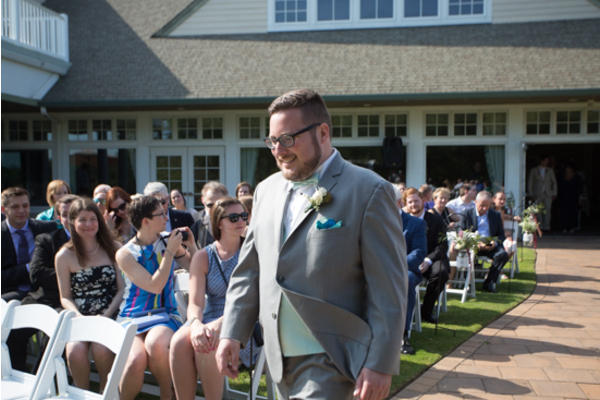 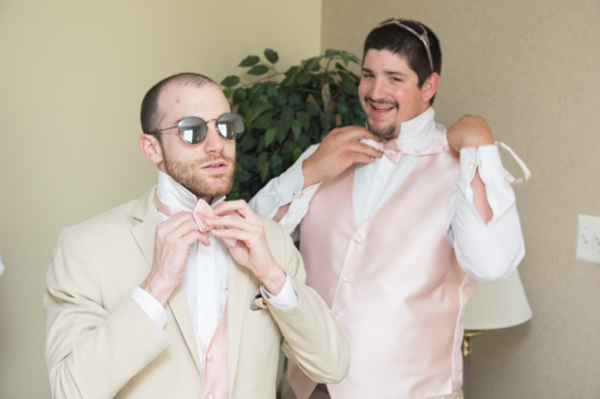 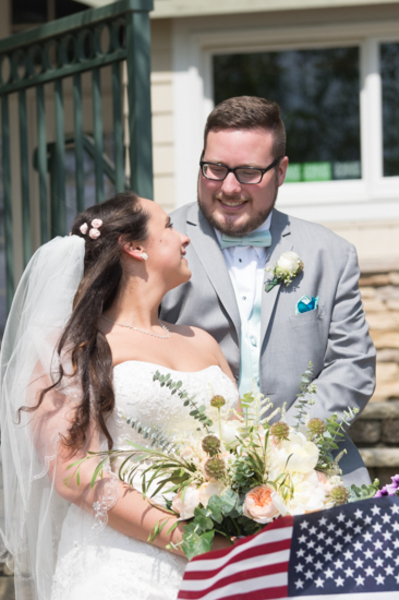 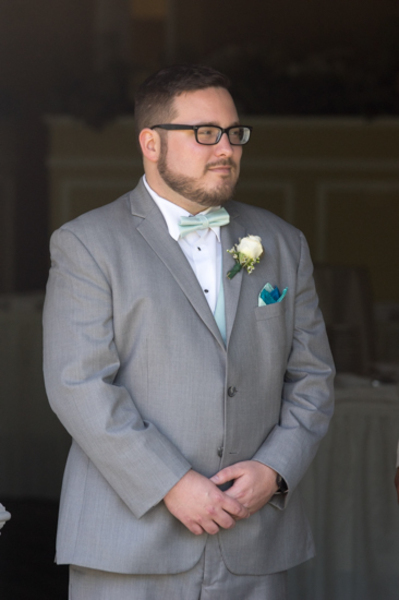 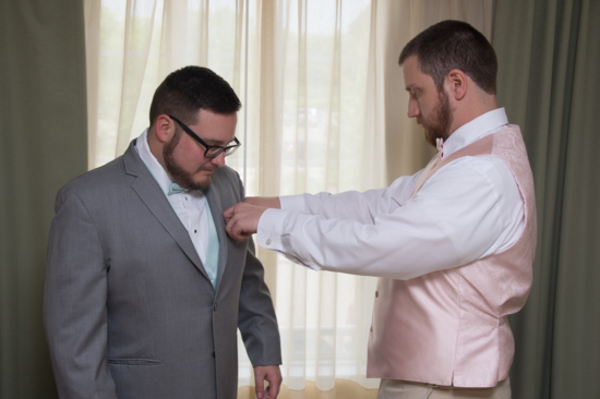 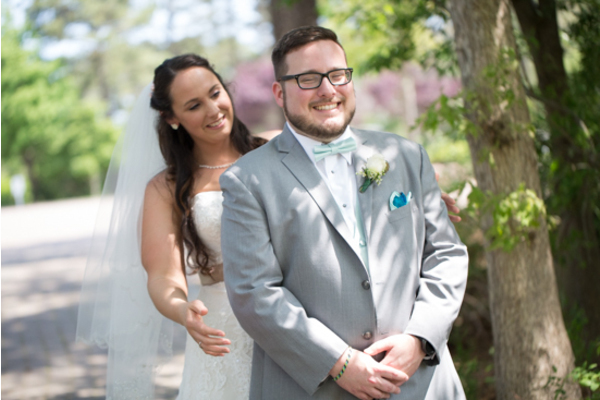 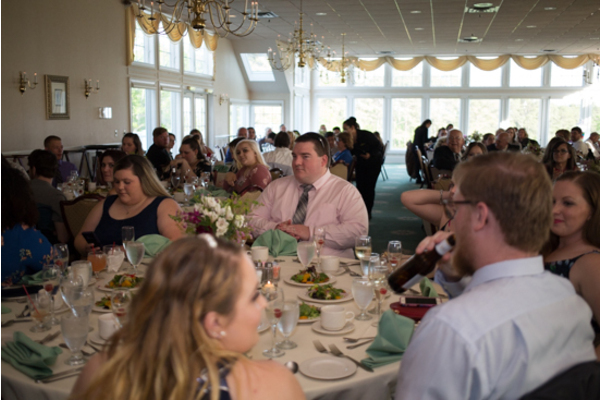 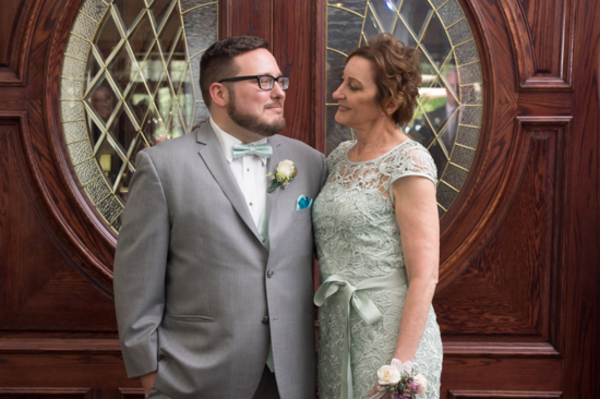 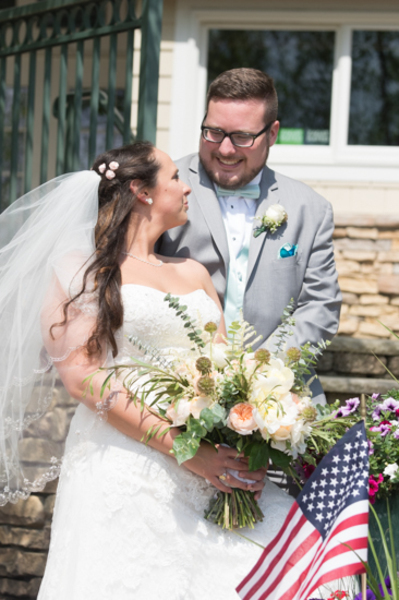 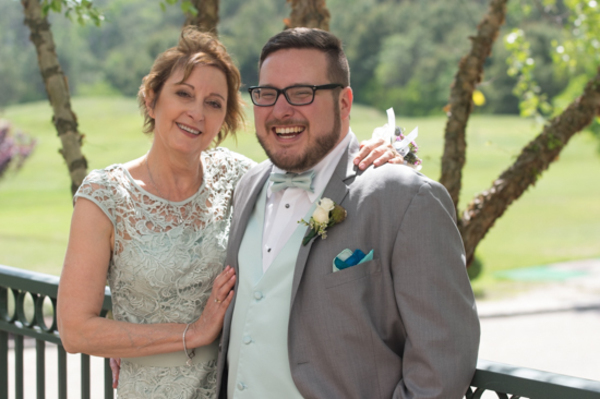 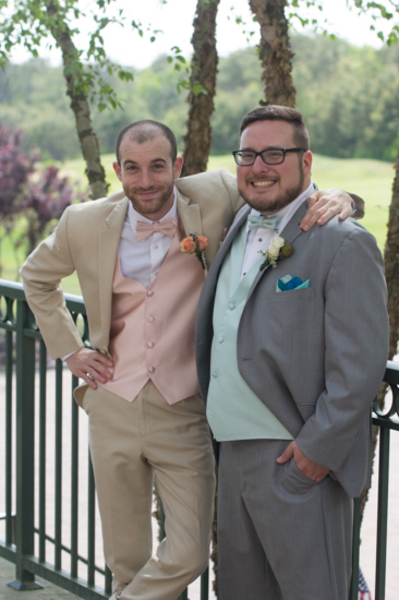 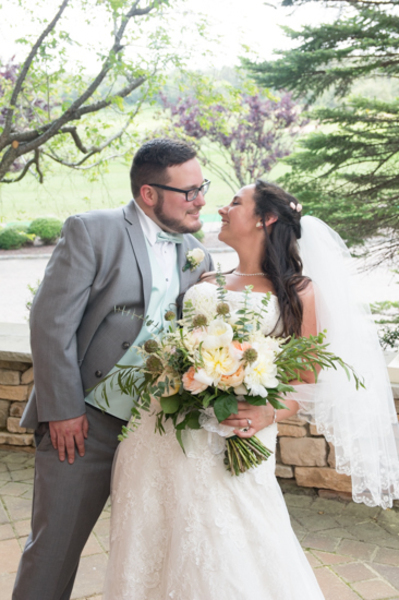 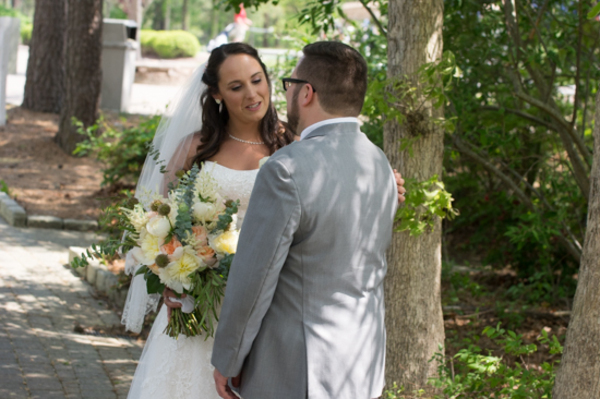 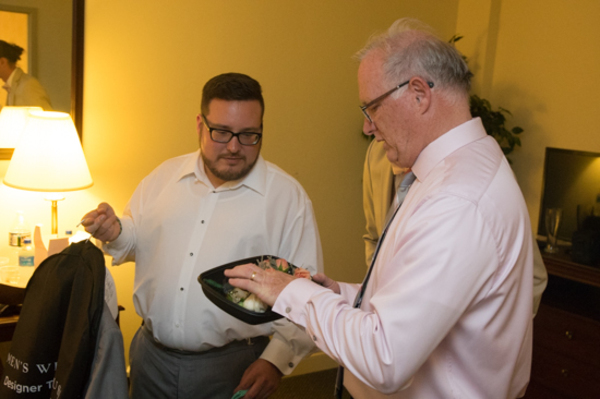 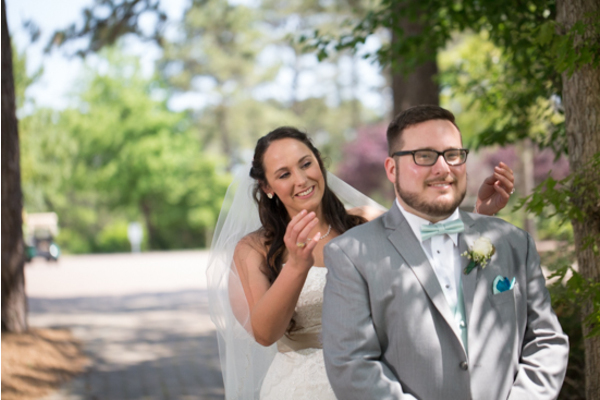 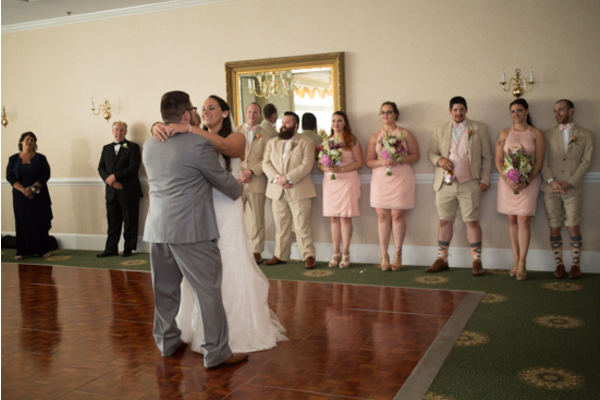 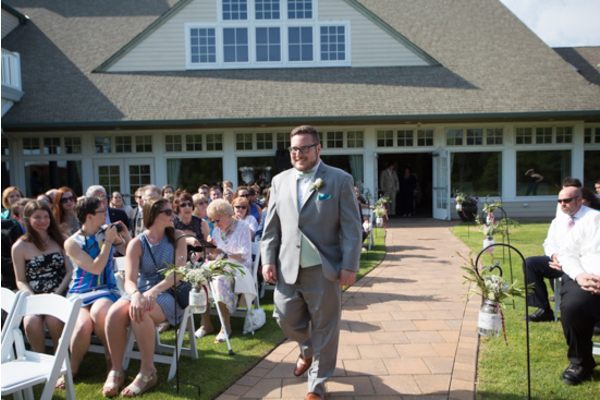 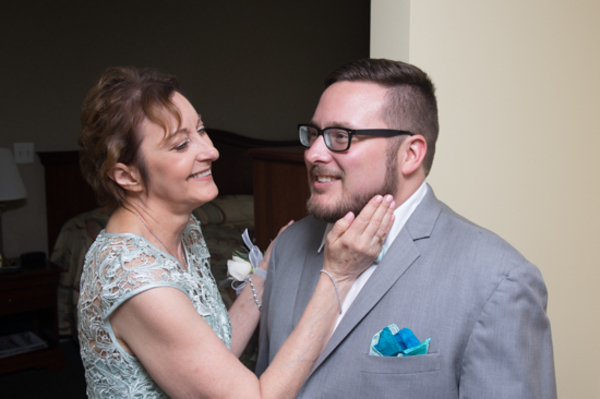 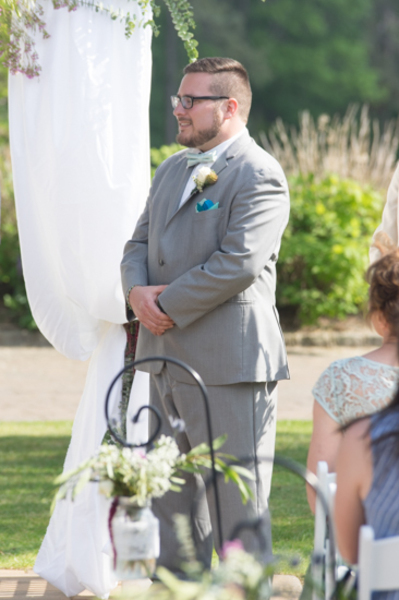 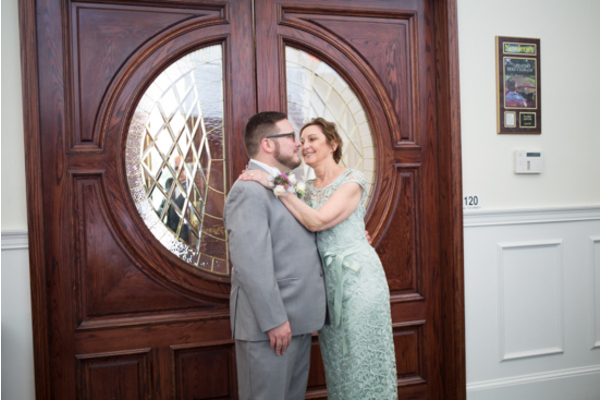 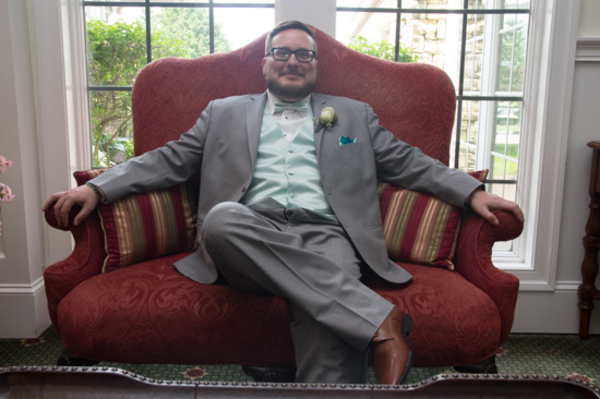 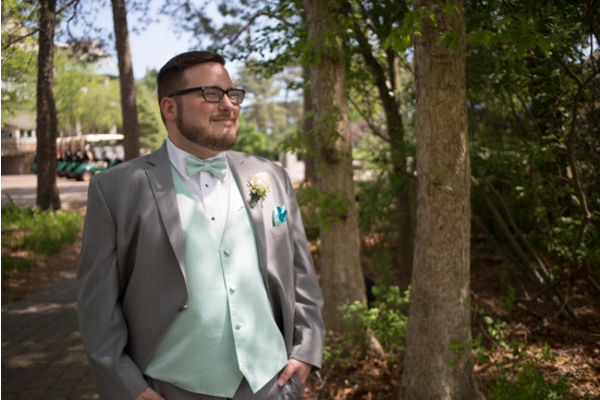 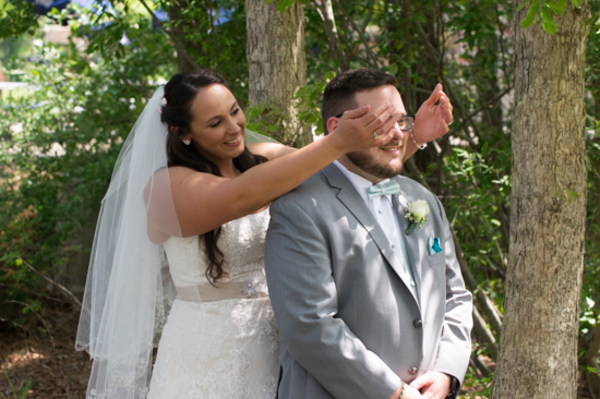 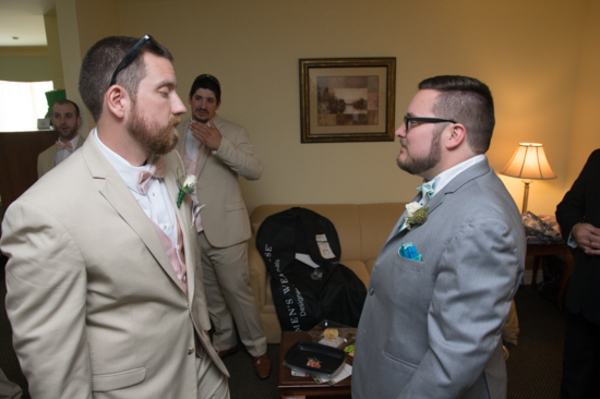 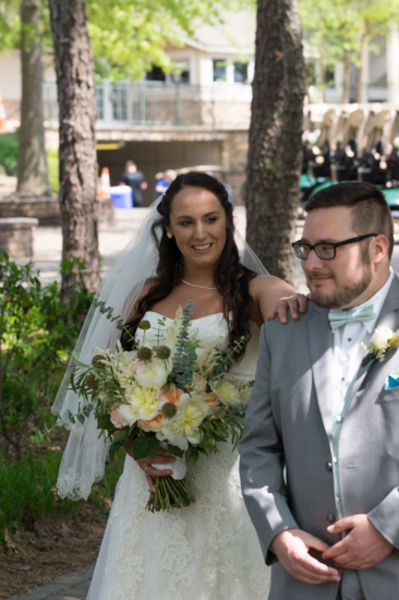 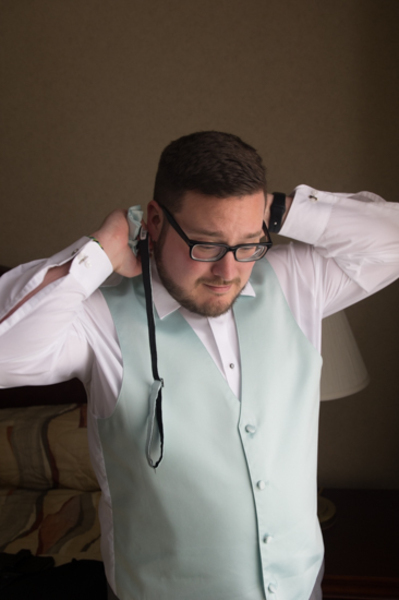 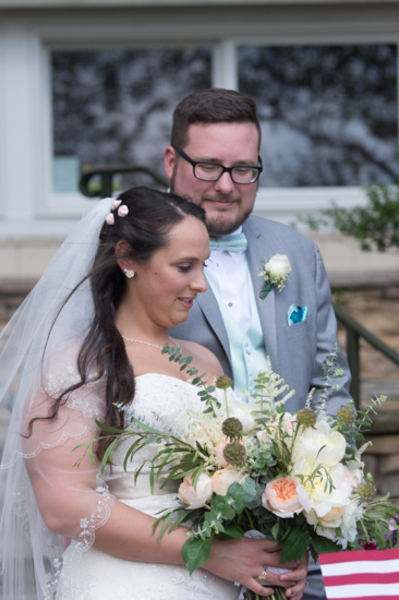 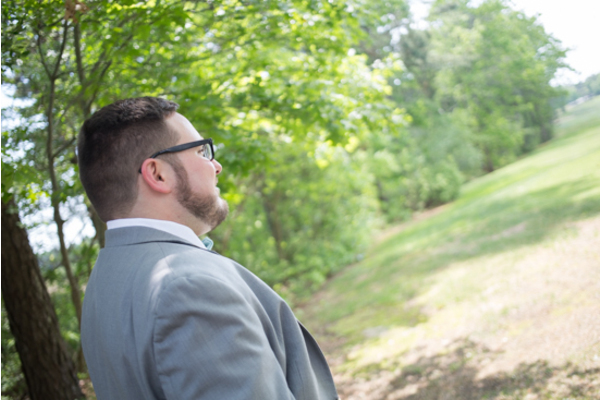 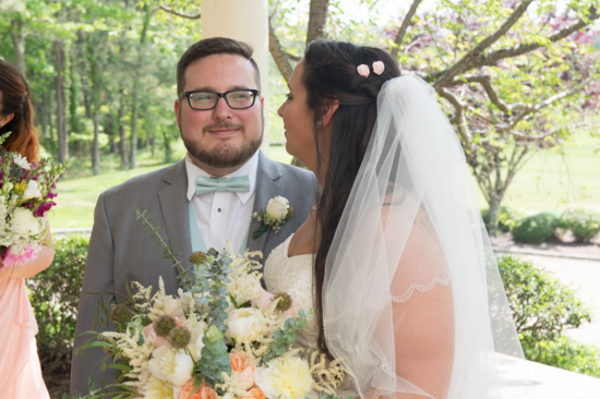 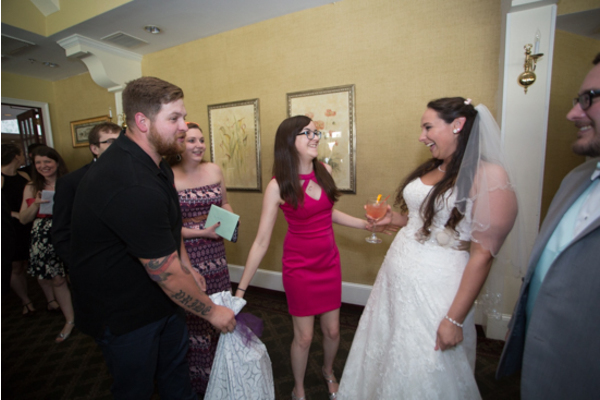 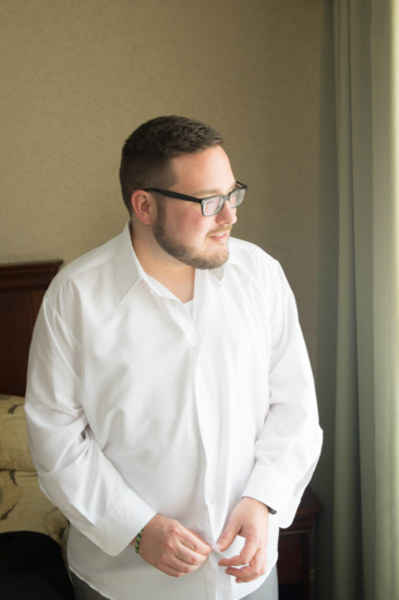 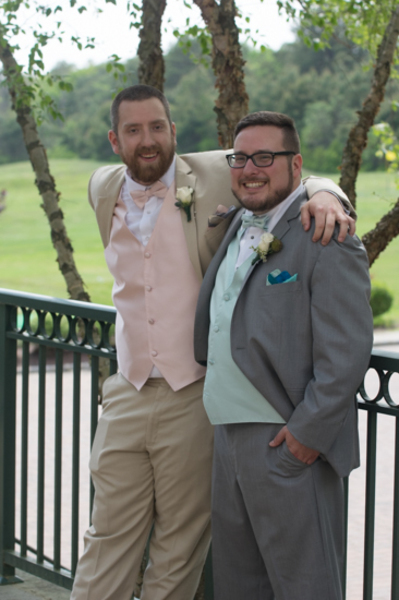 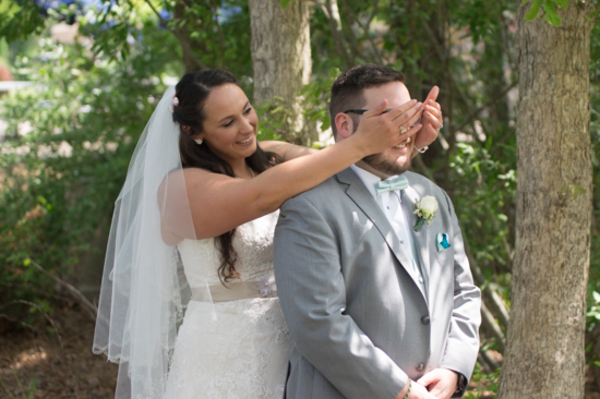 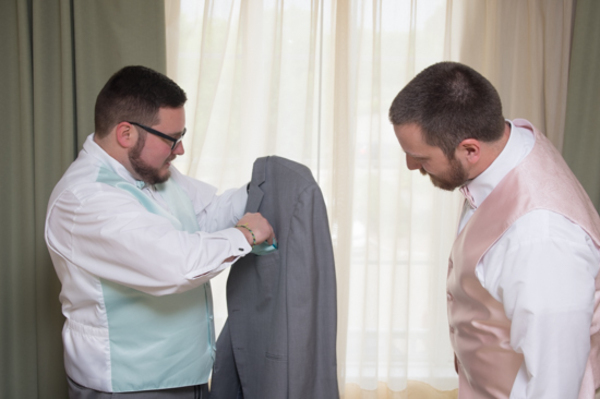 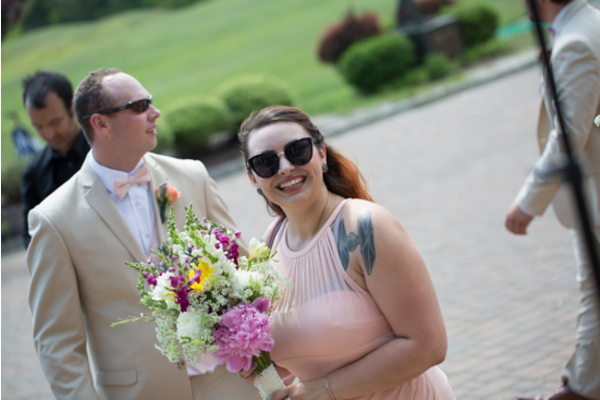 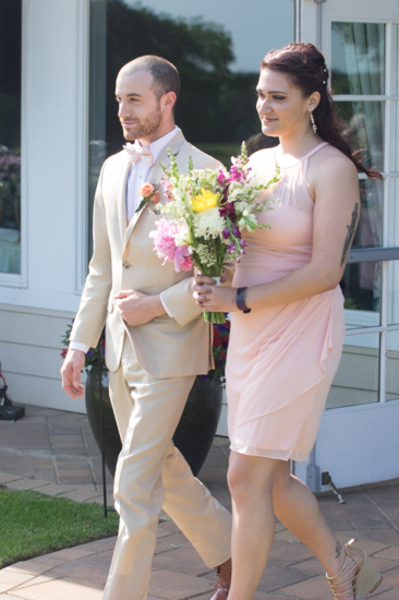 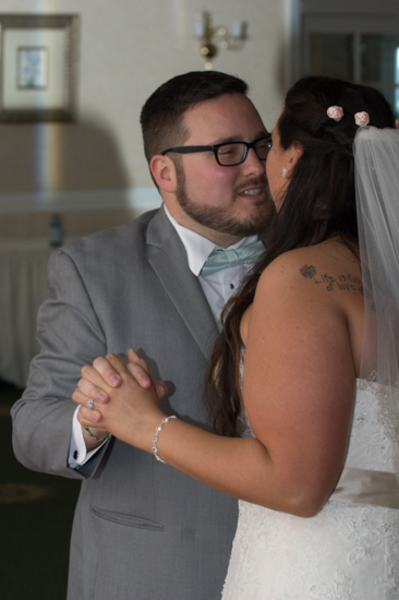 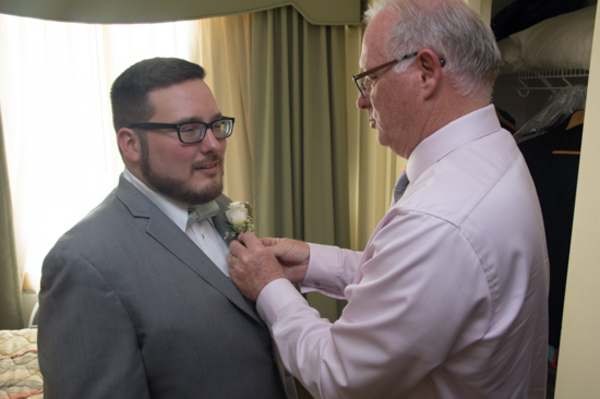 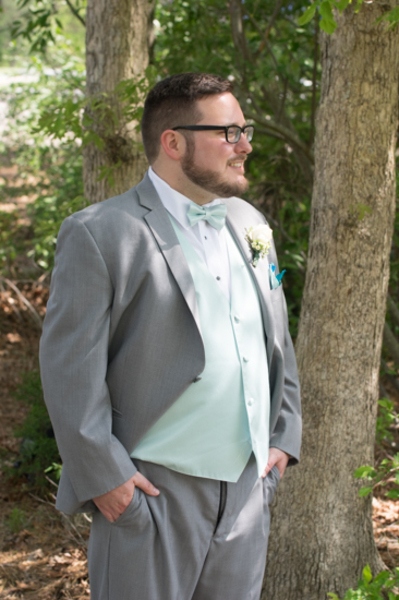 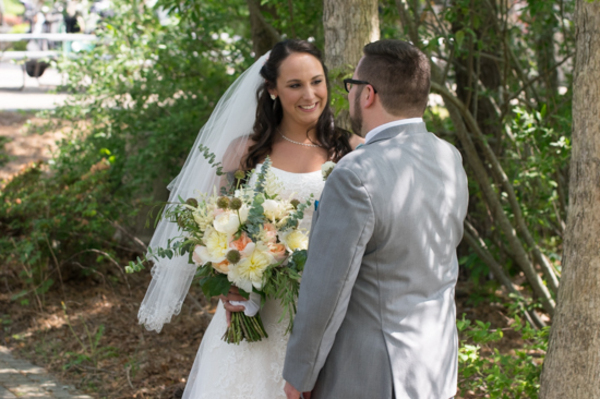 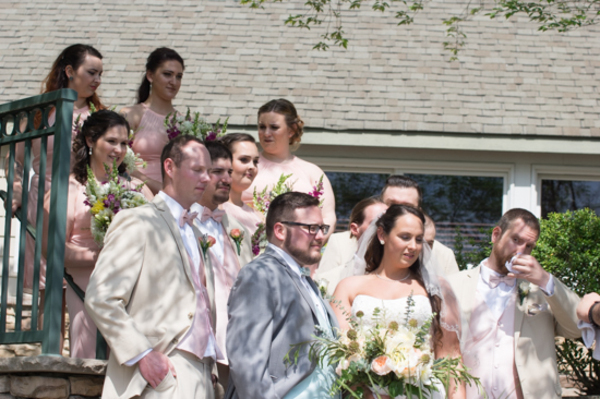 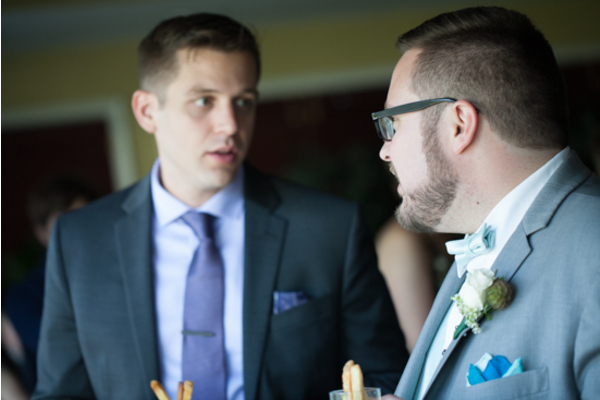 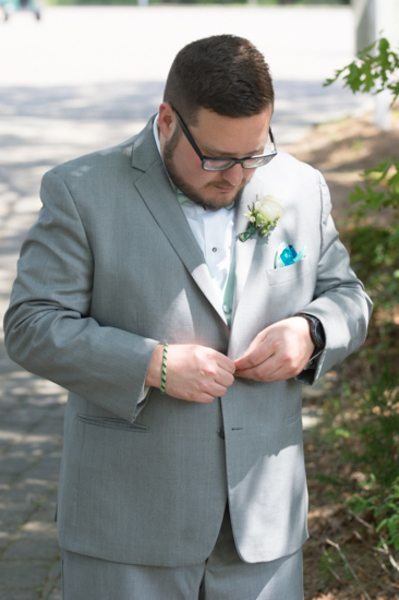 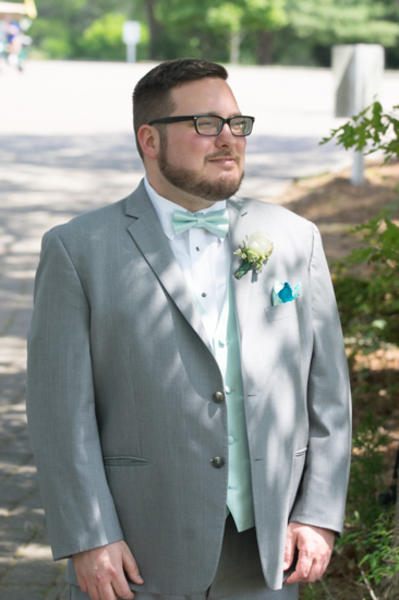 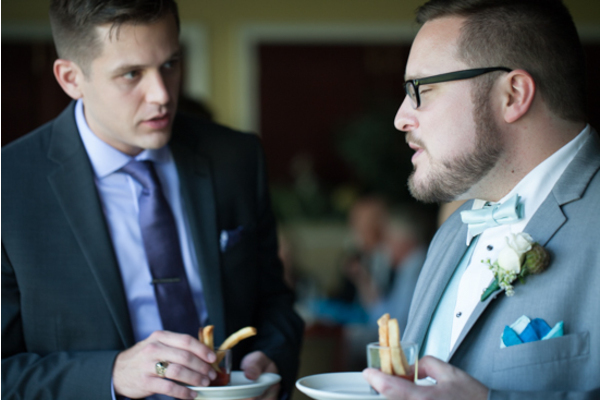 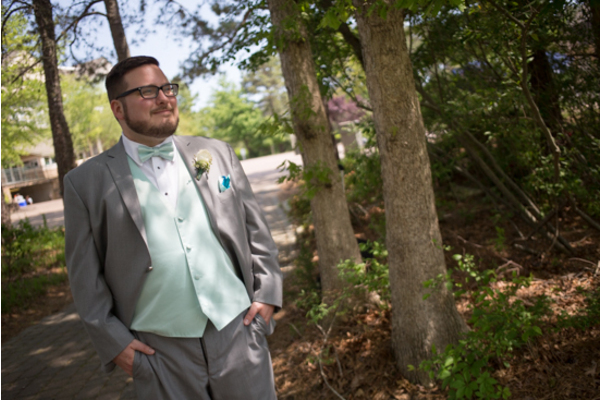 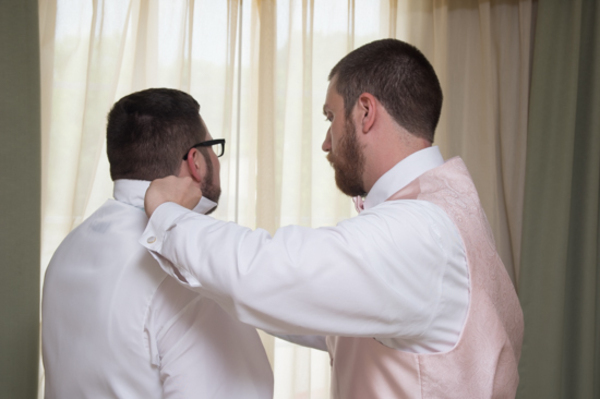 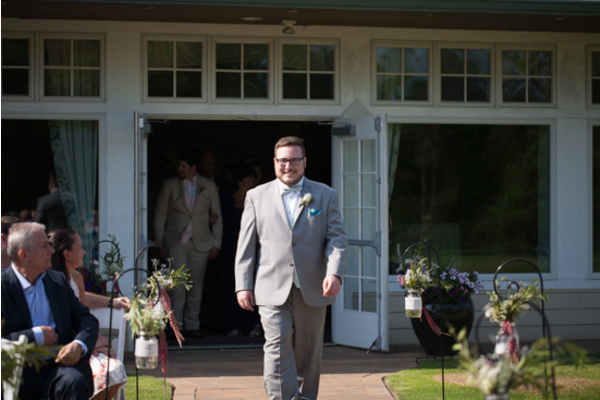 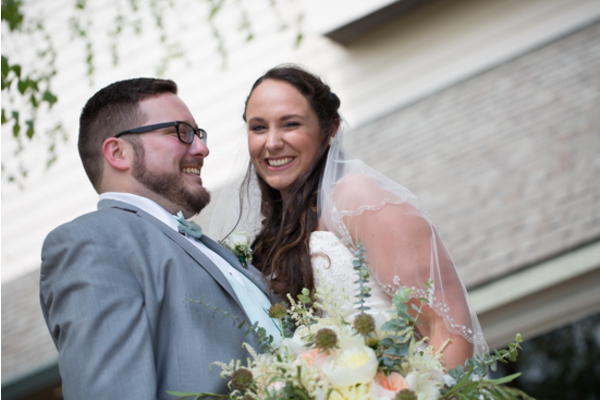 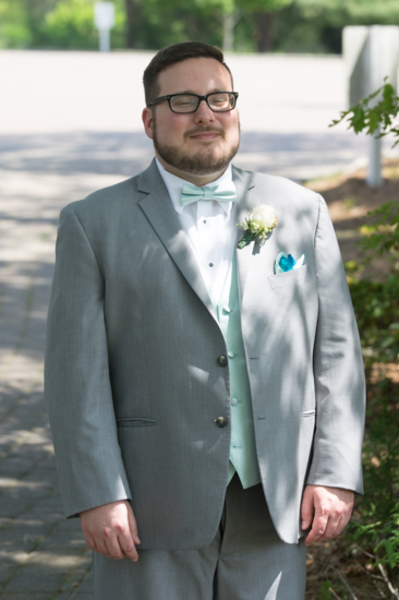 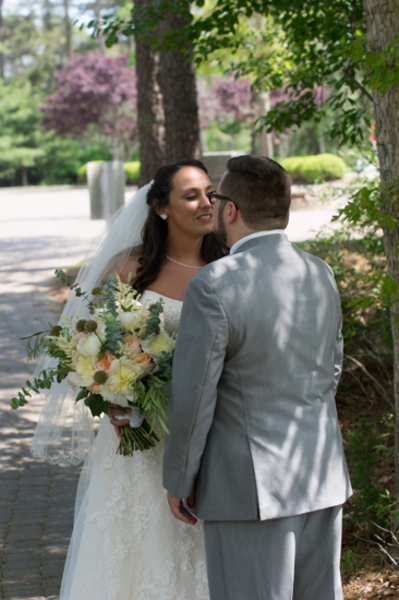 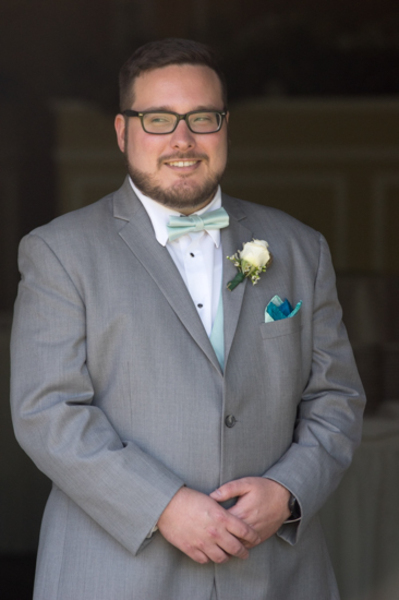 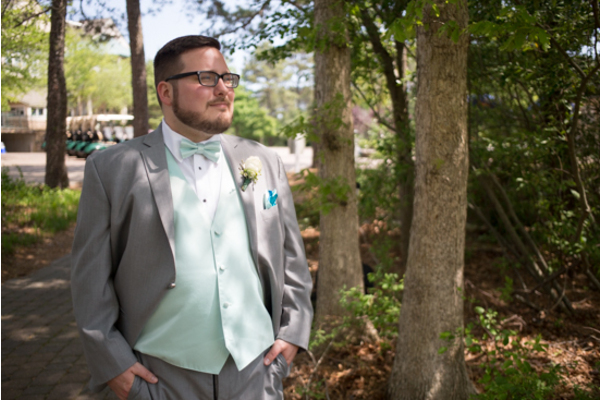 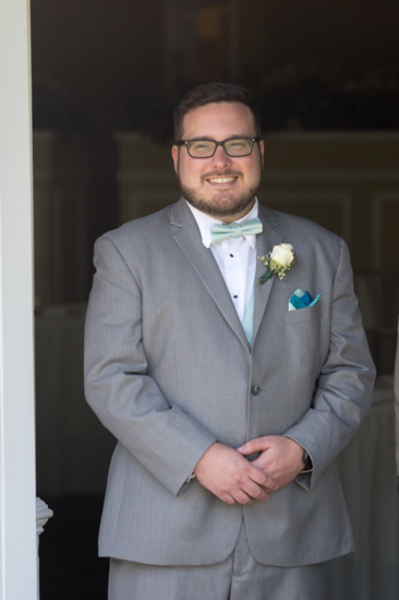 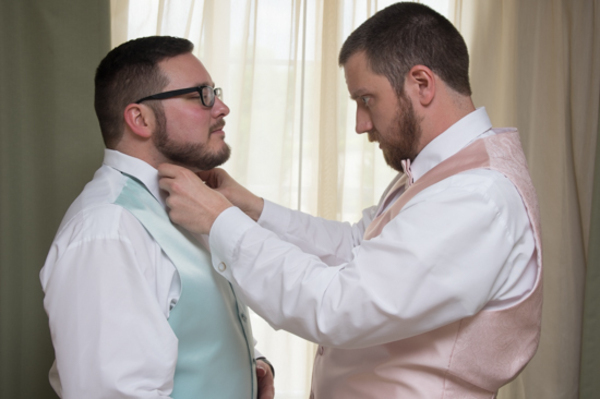 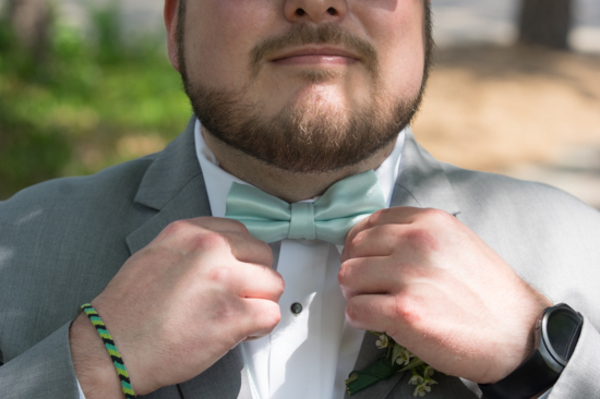 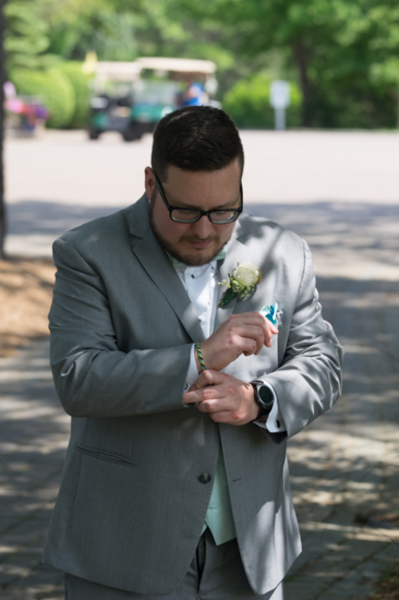 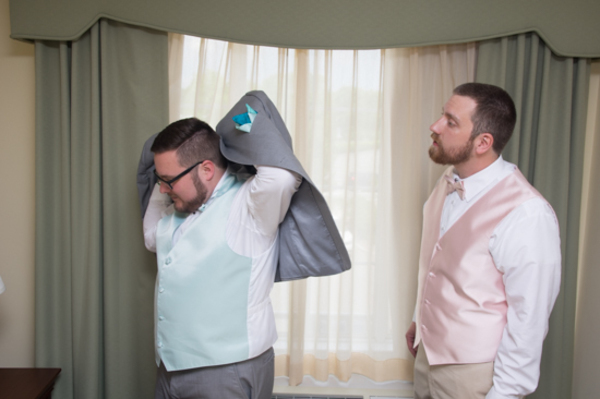 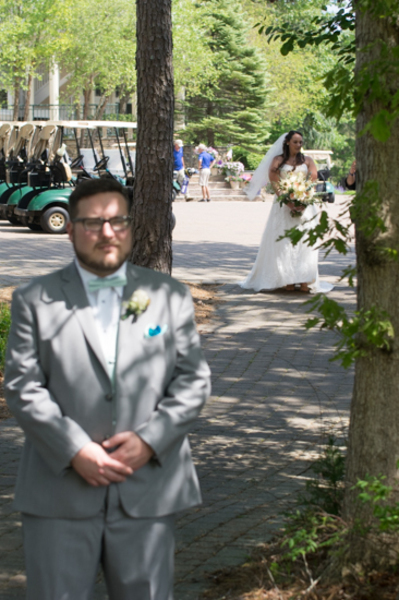 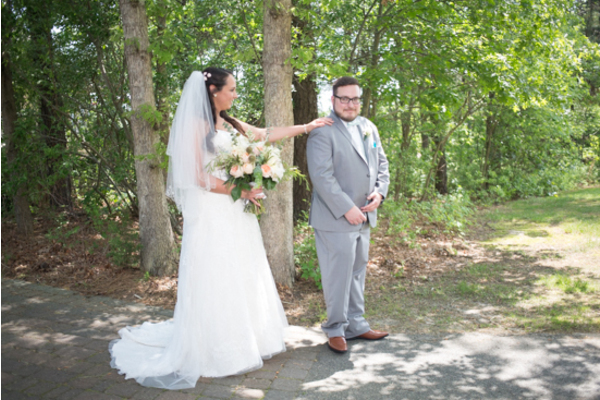 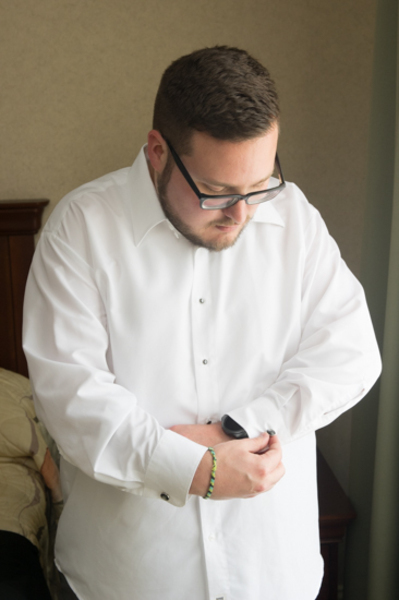 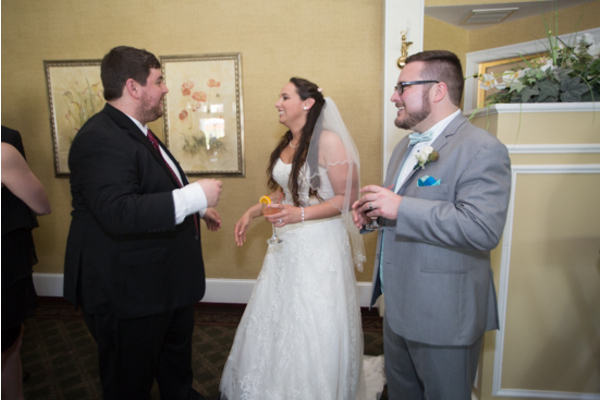 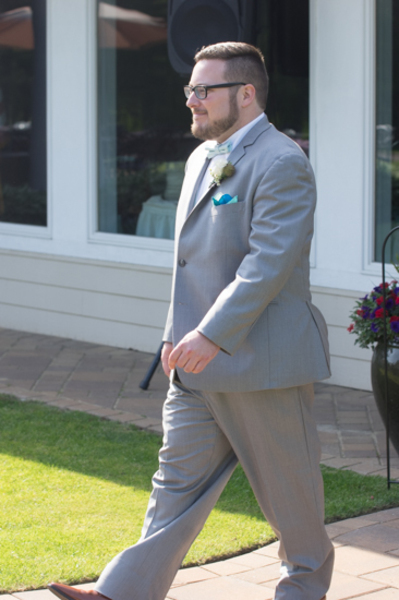 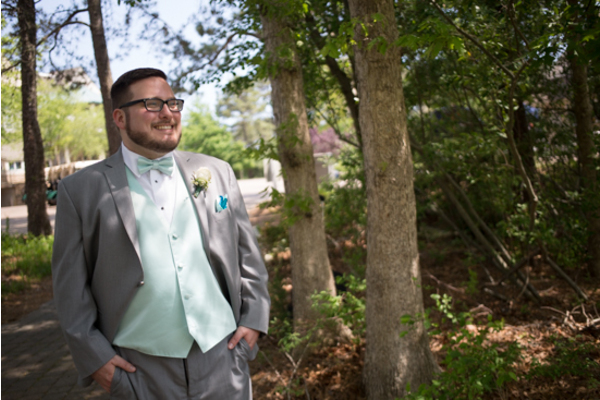 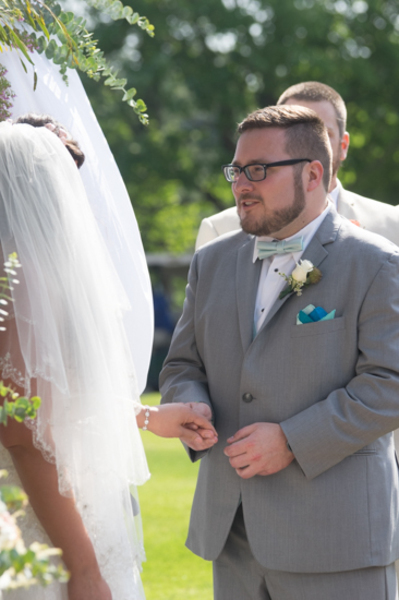 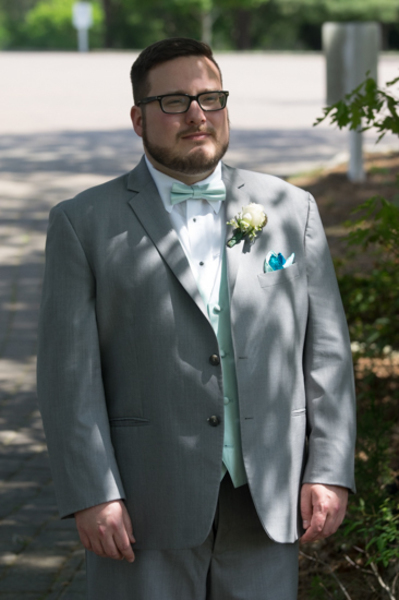 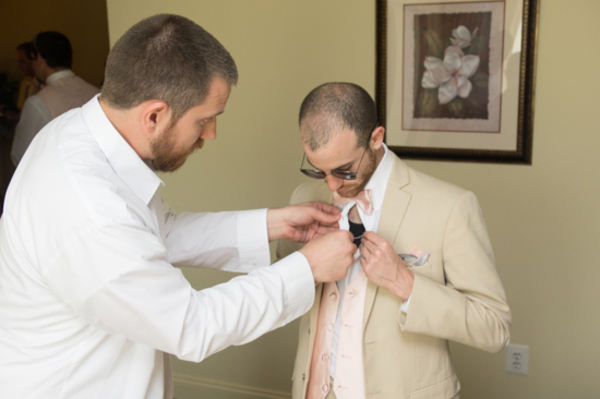 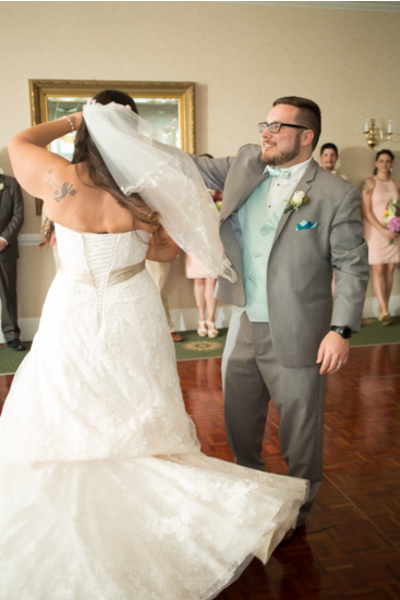 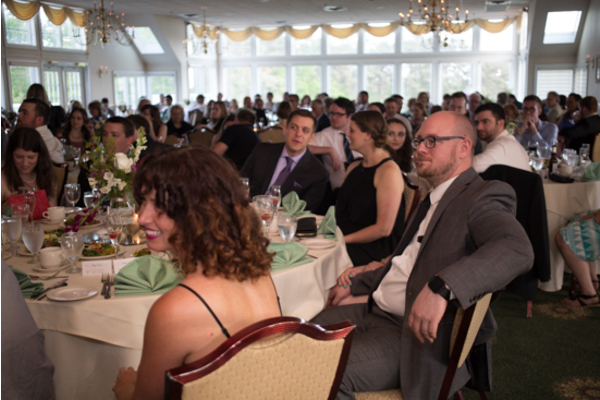 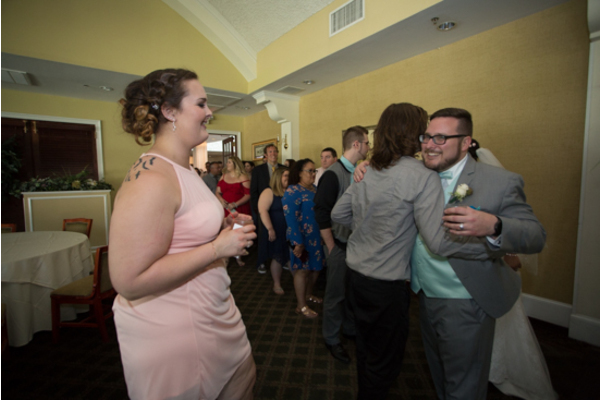 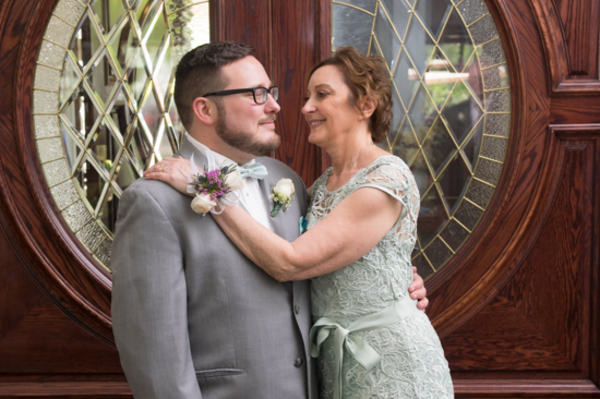 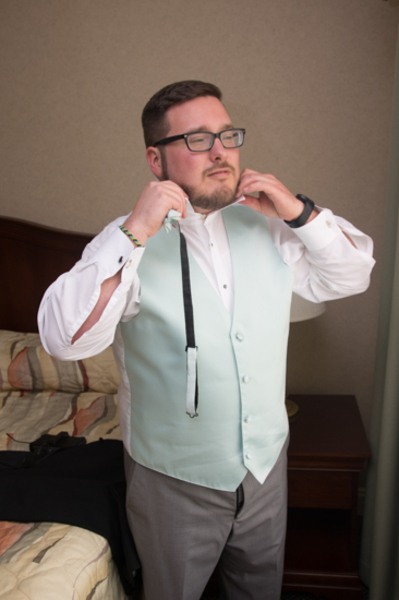 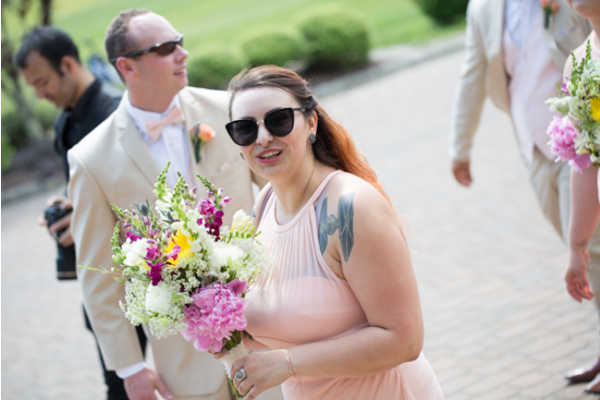 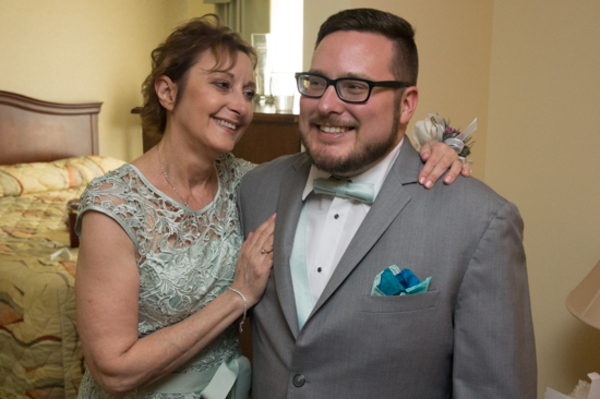 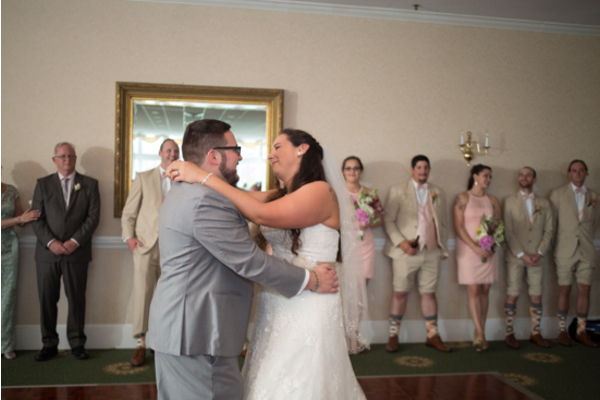 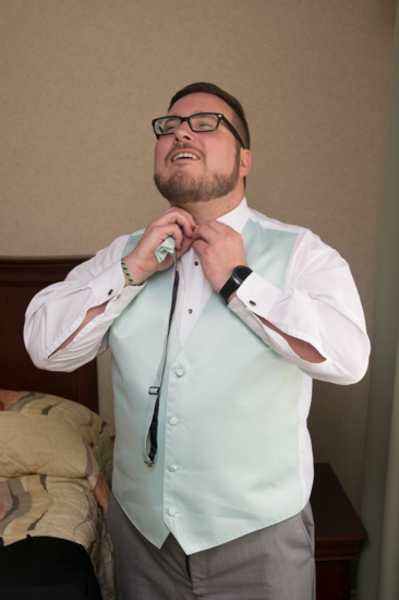 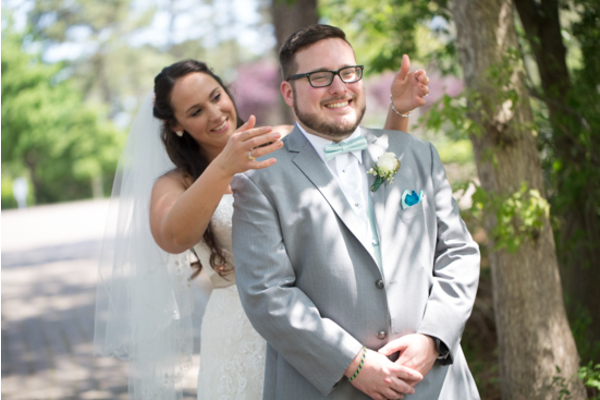 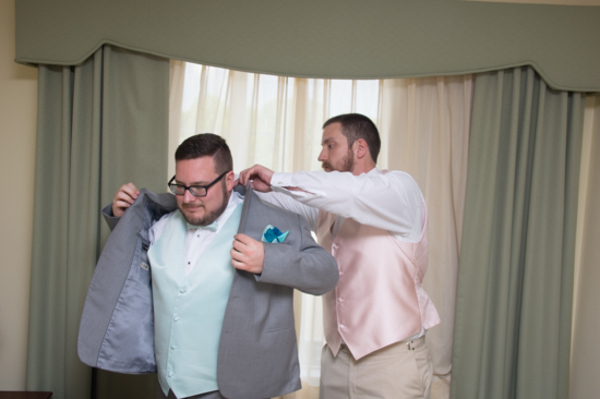 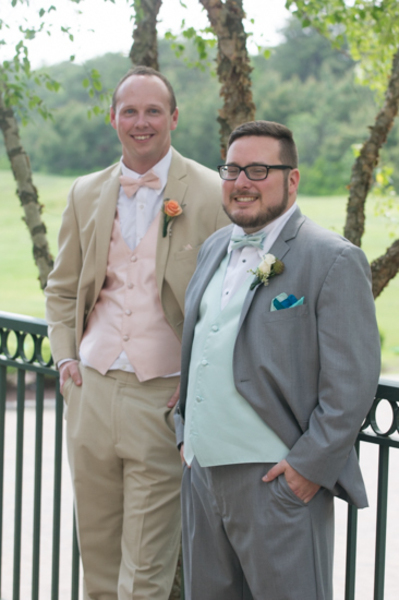 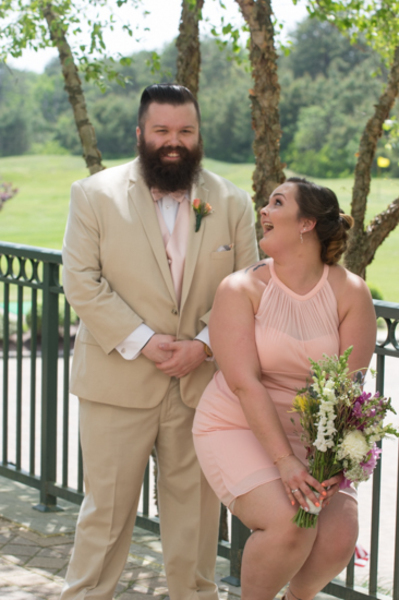 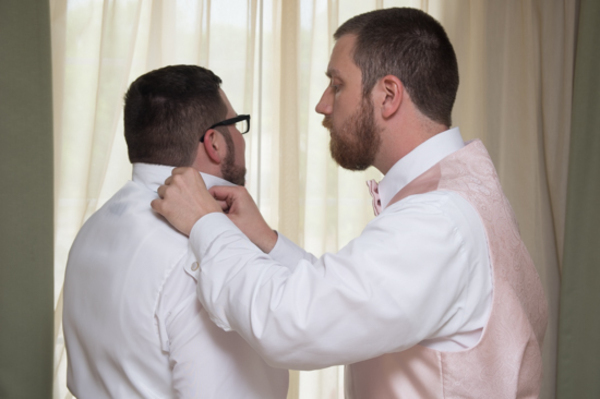 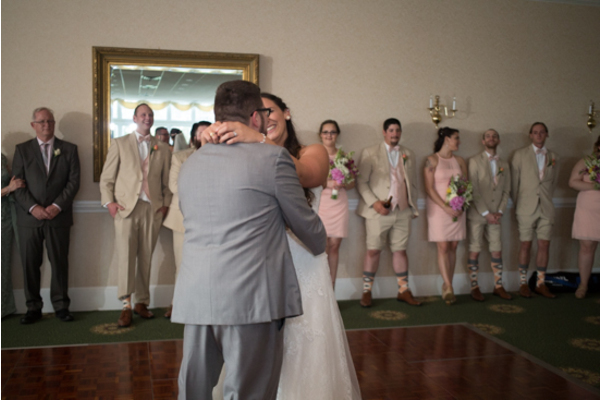 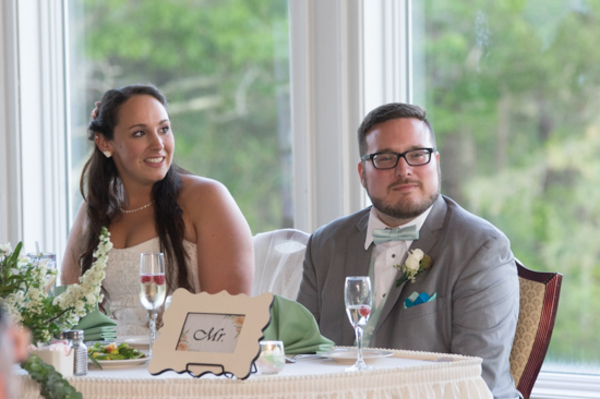 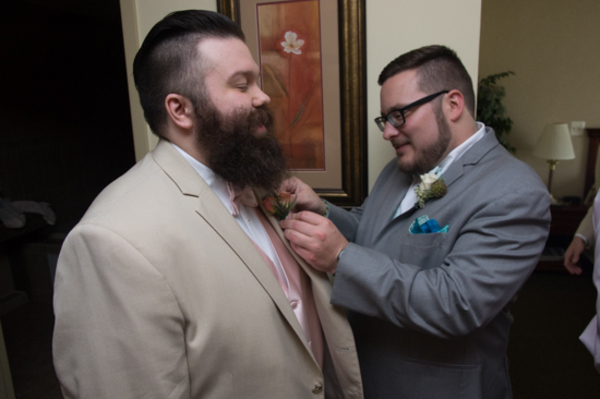 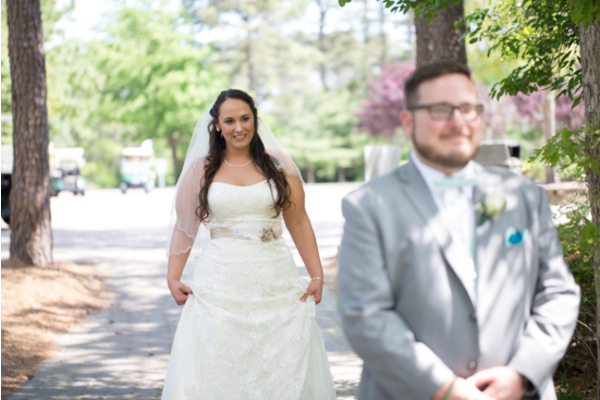 Our NJ Wedding Photographer was there to capture the private moment and the look on Kyle’s face when he saw his blushing bride. 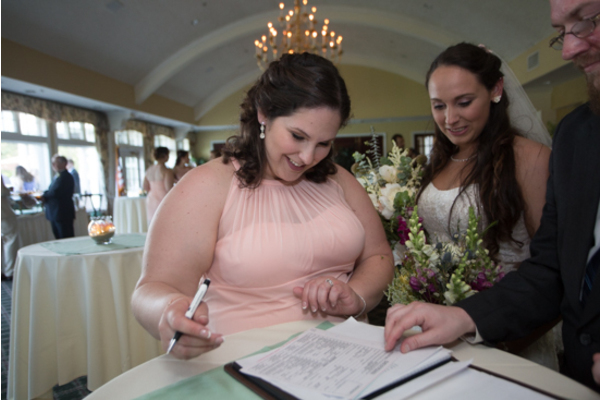 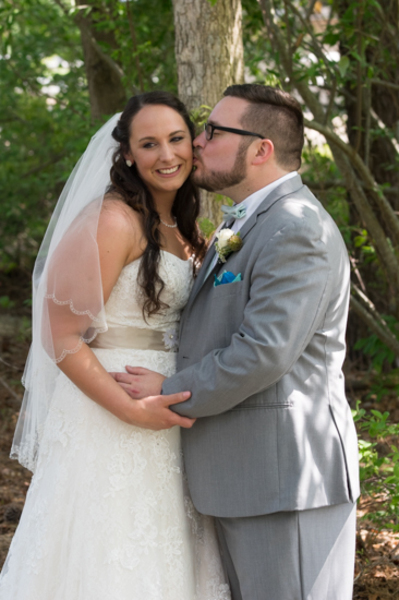 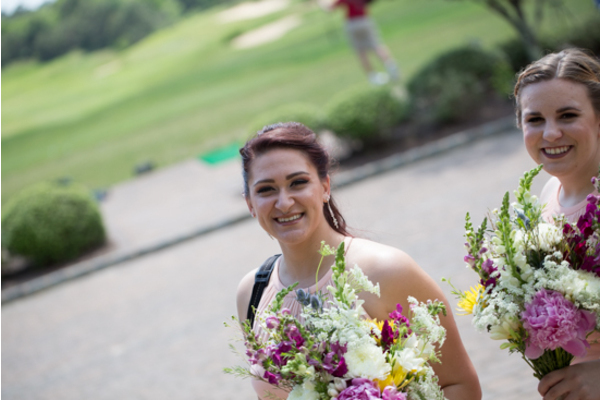 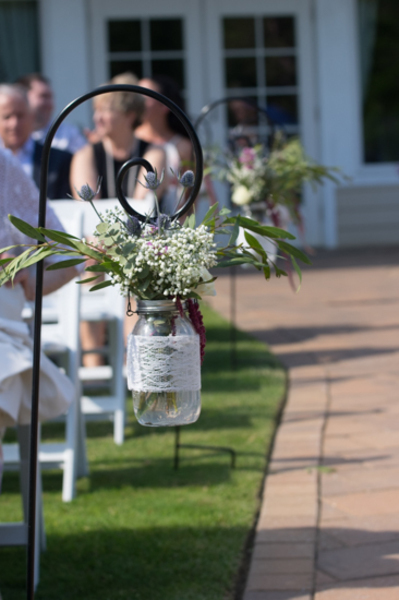 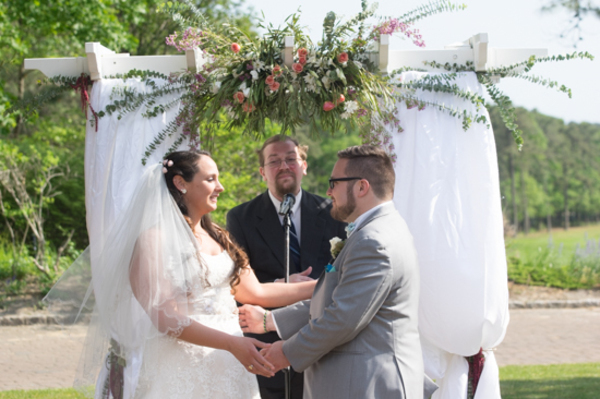 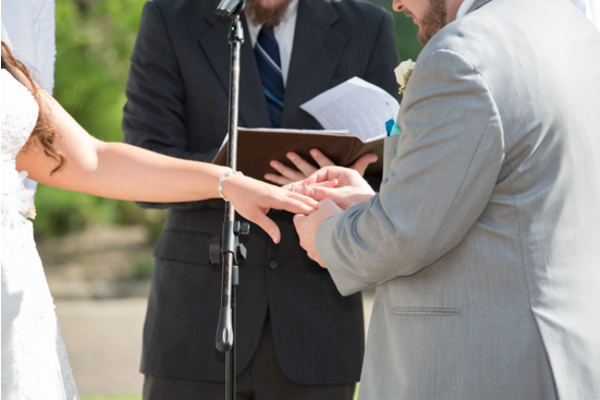 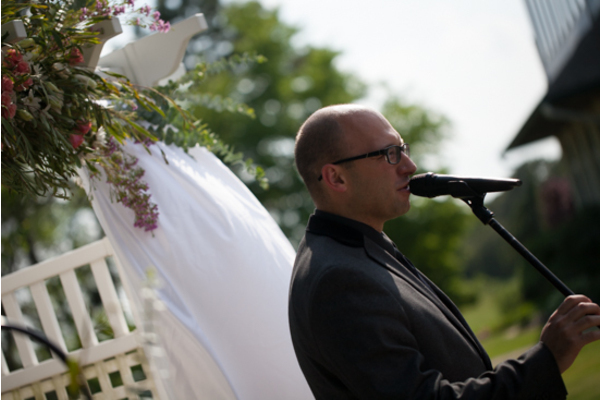 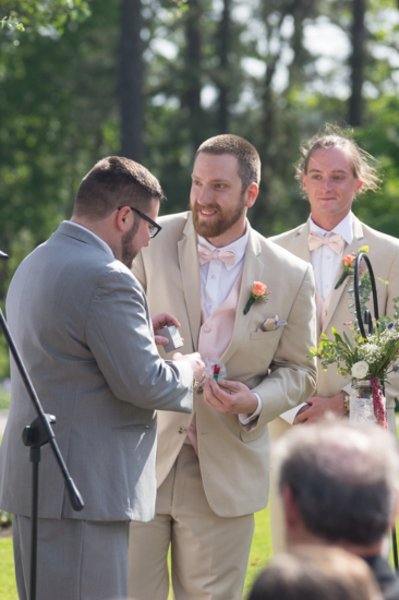 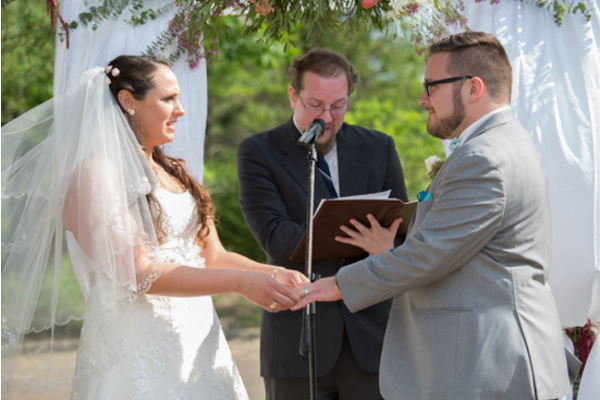 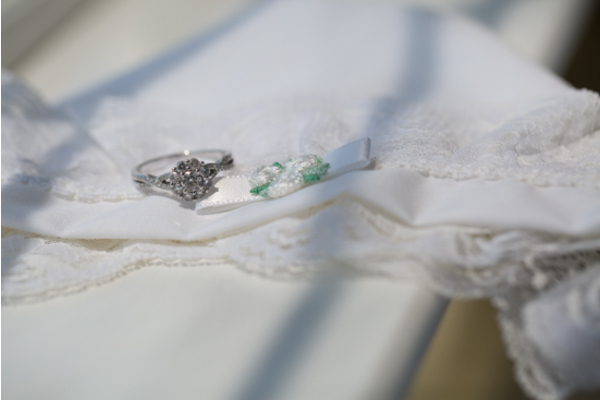 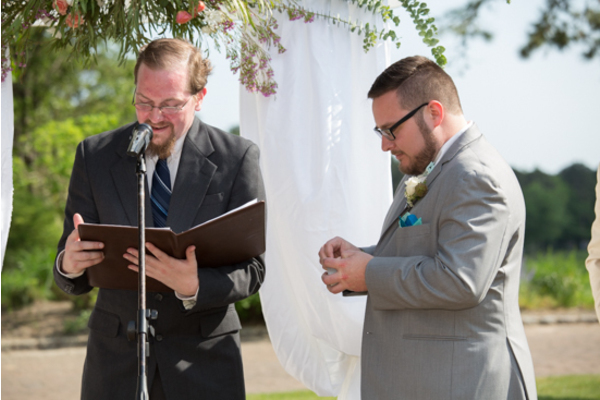 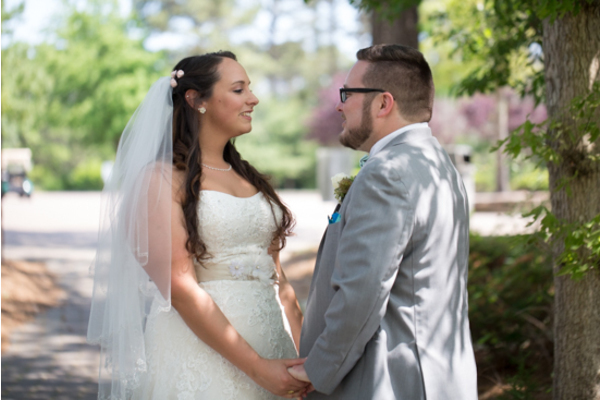 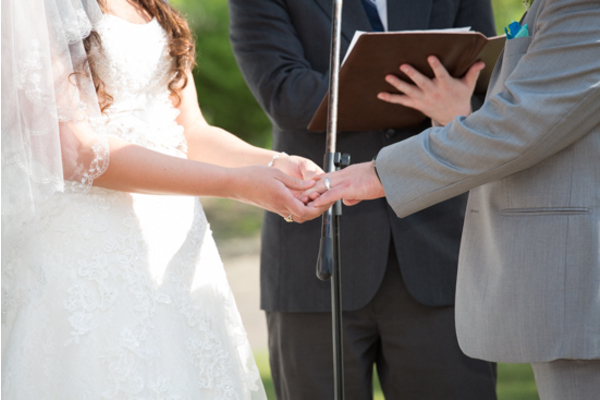 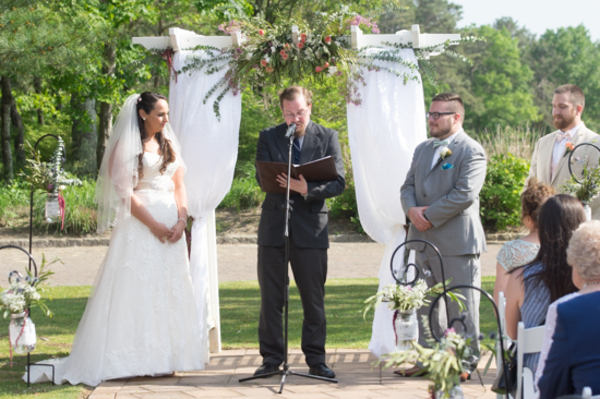 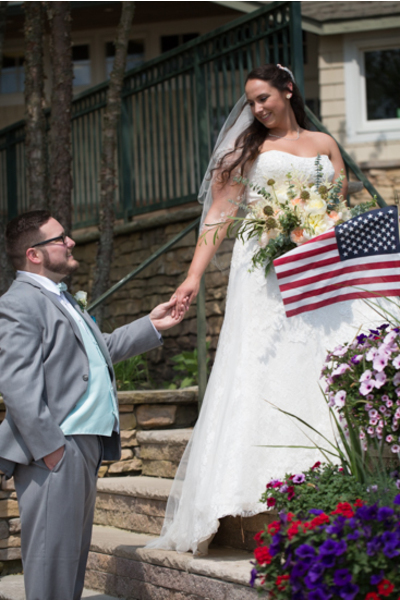 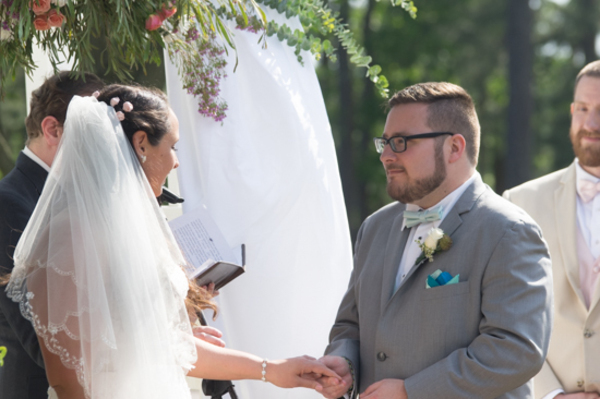 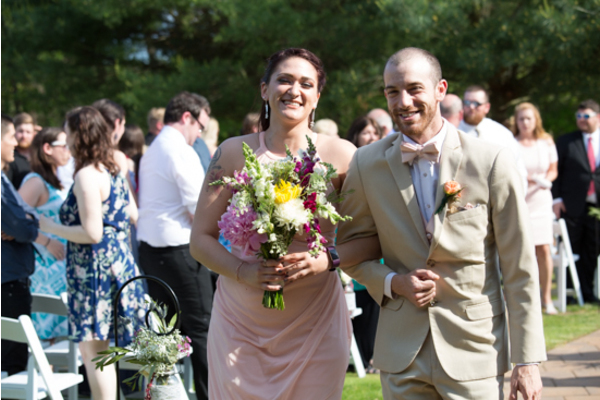 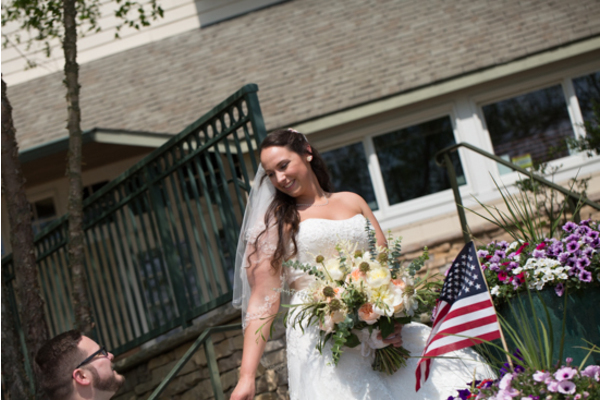 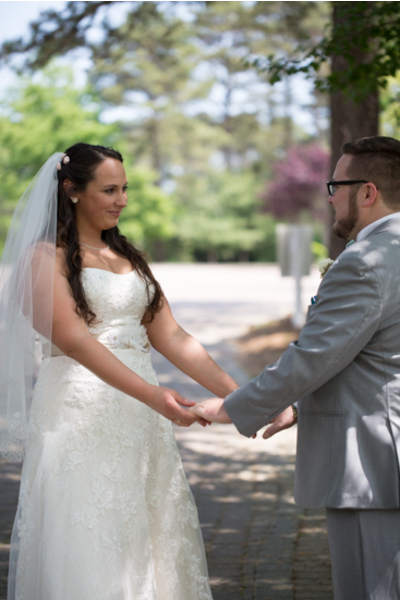 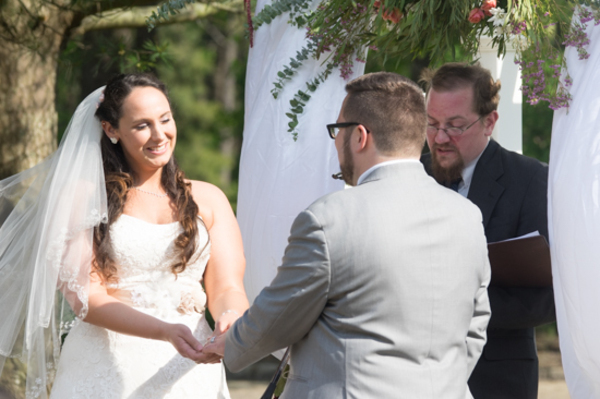 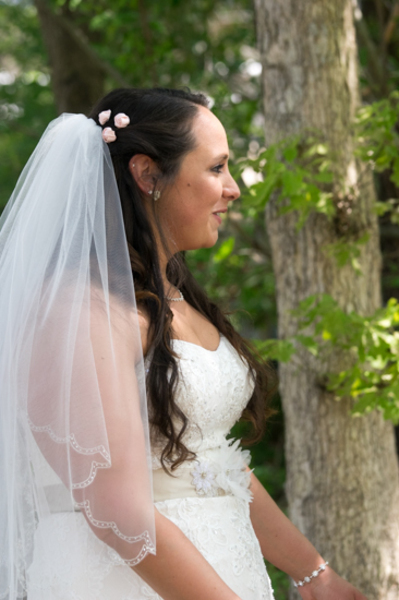 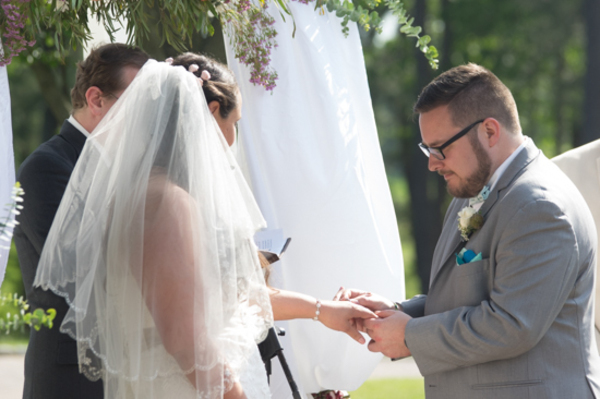 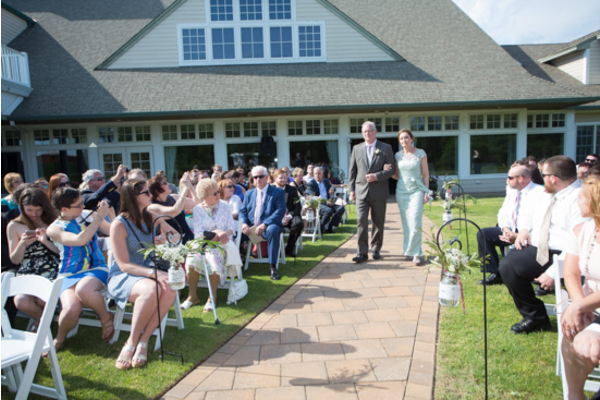 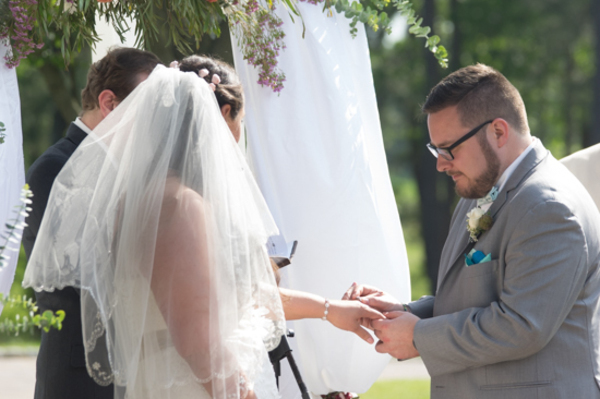 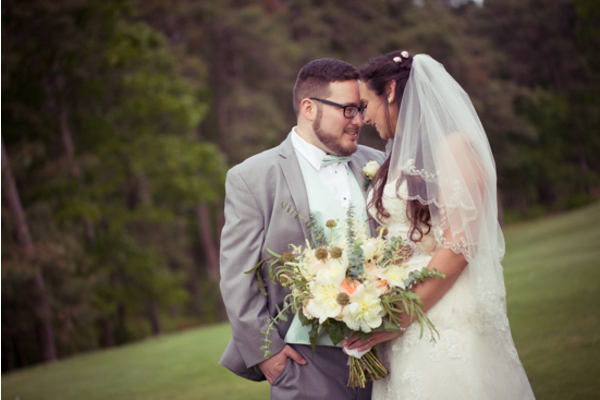 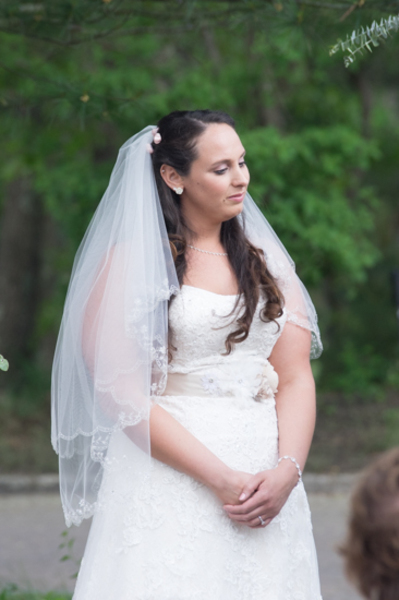 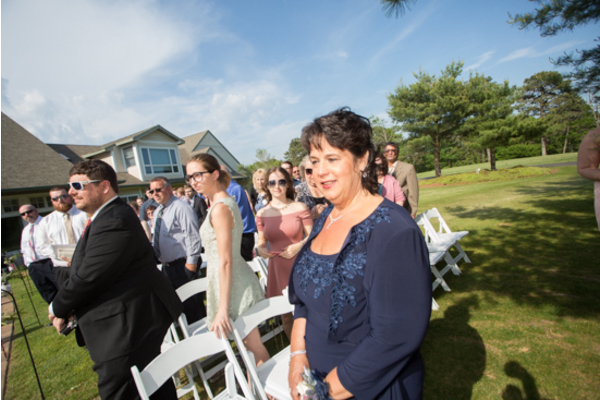 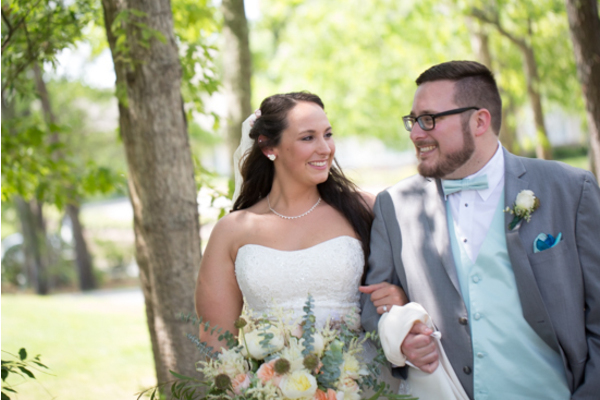 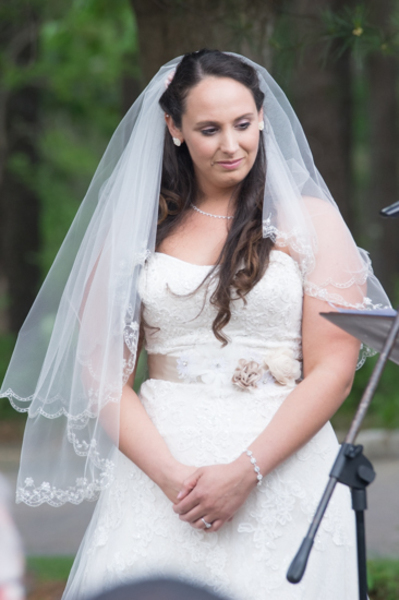 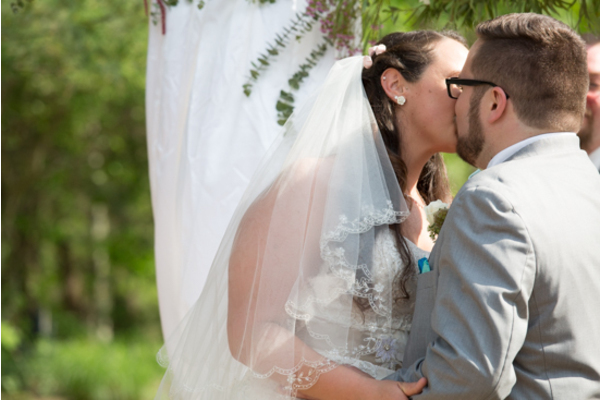 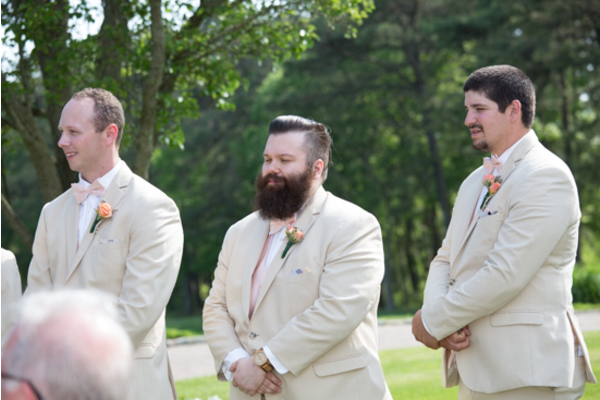 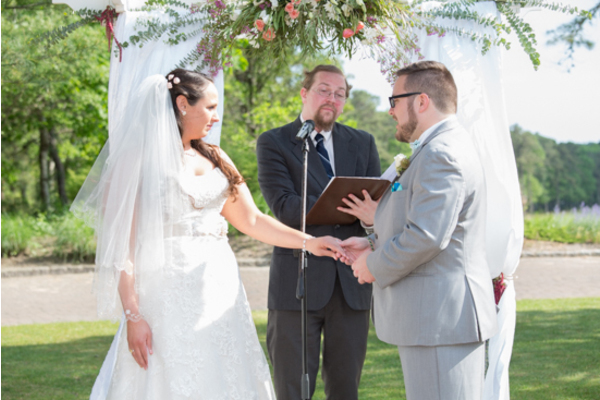 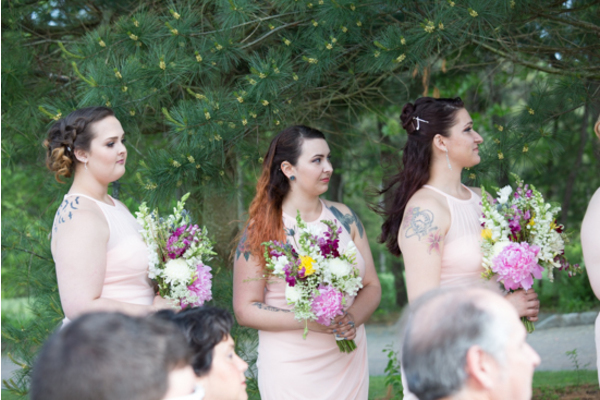 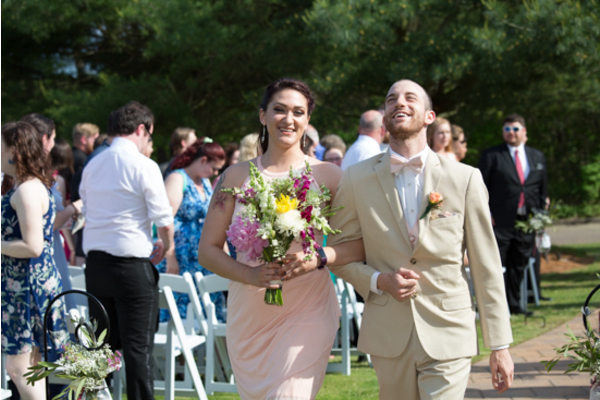 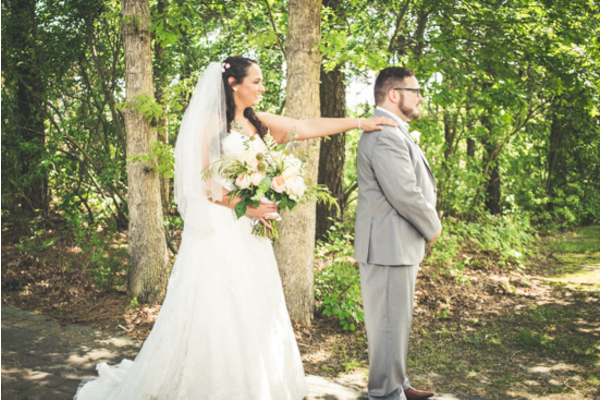 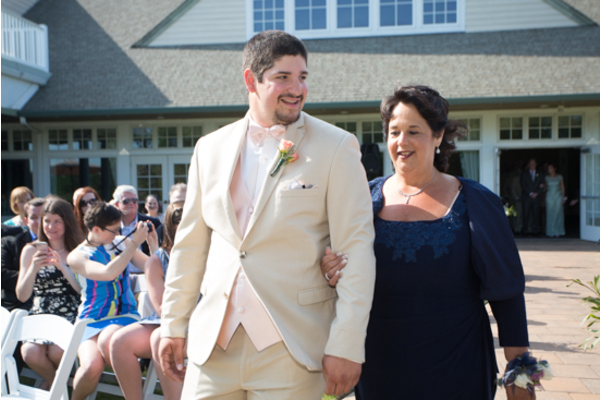 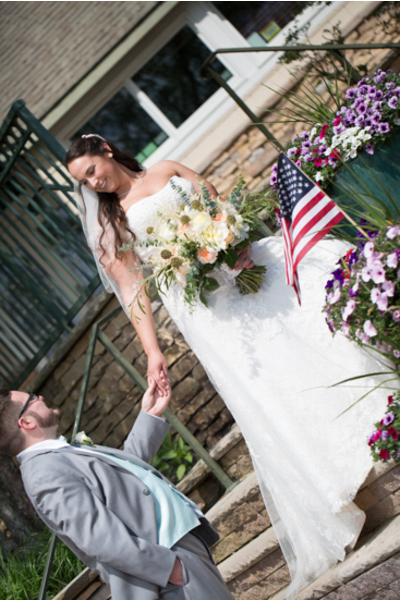 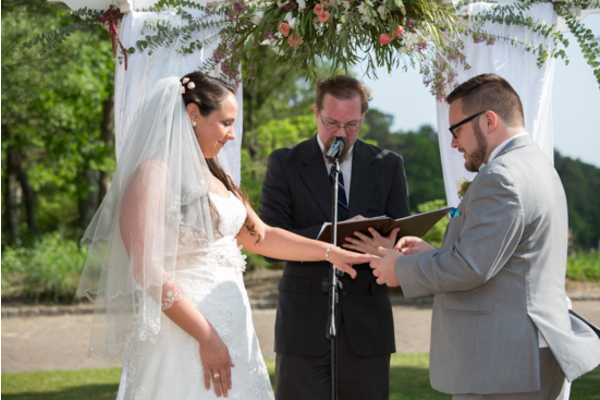 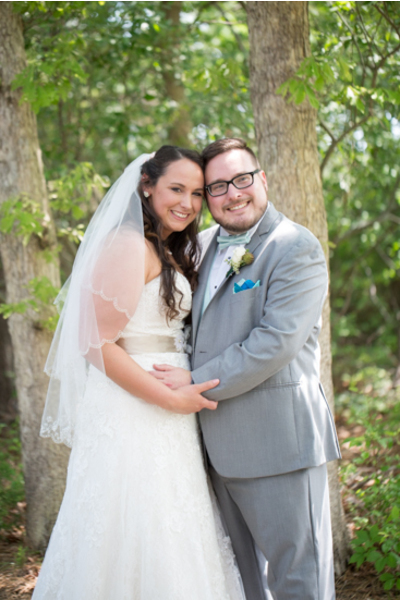 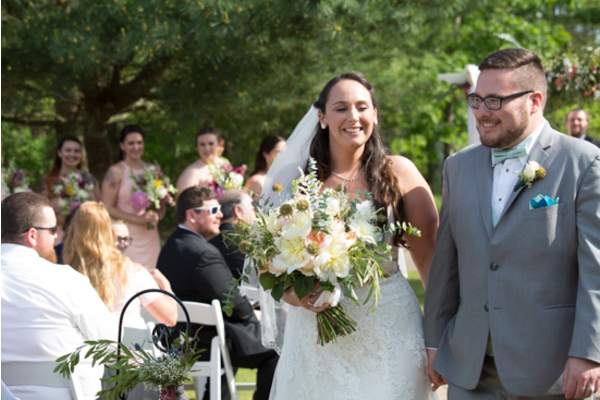 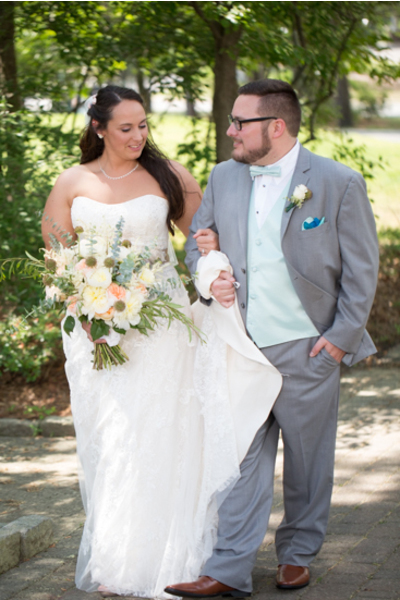 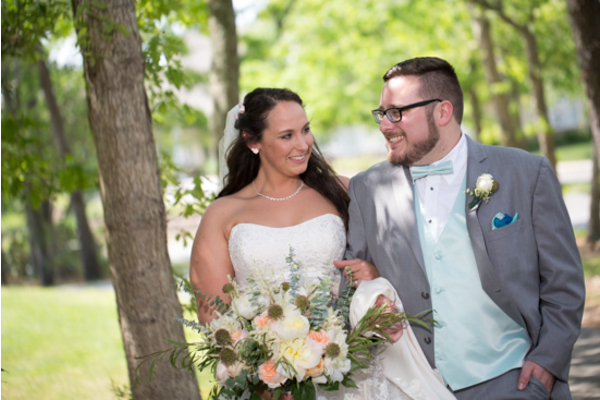 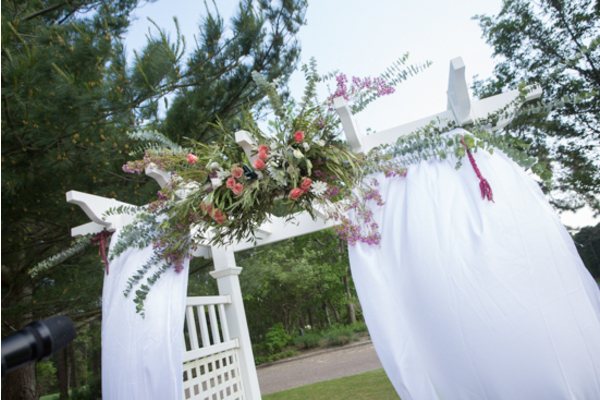 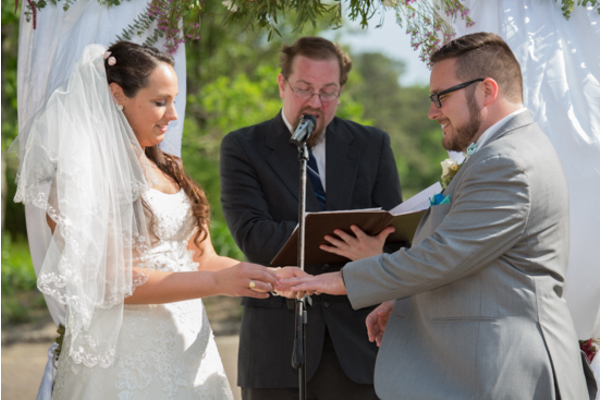 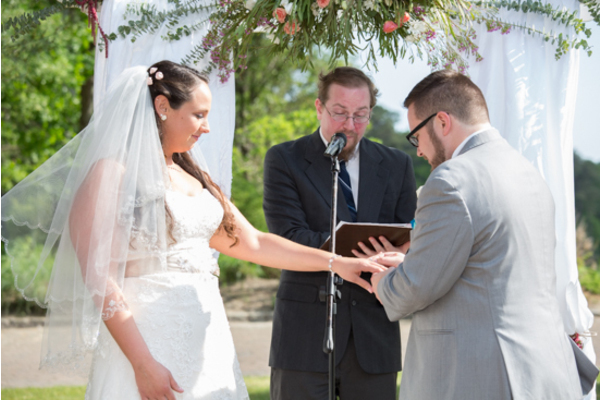 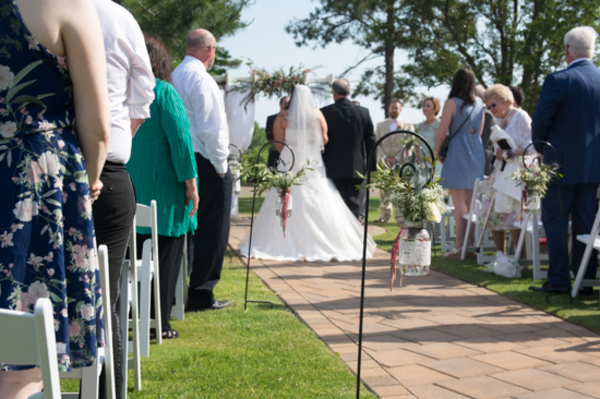 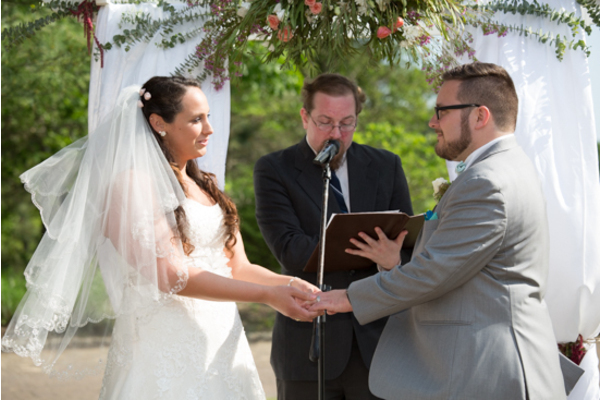 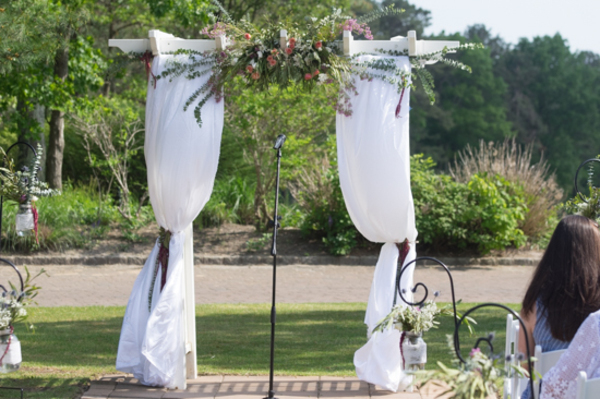 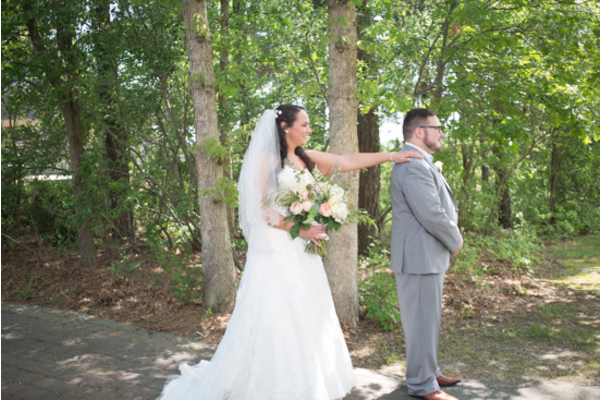 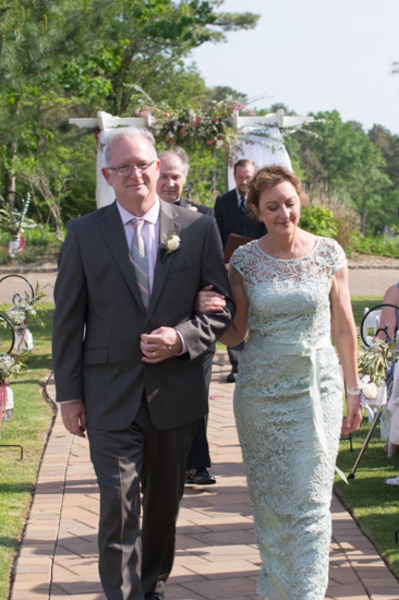 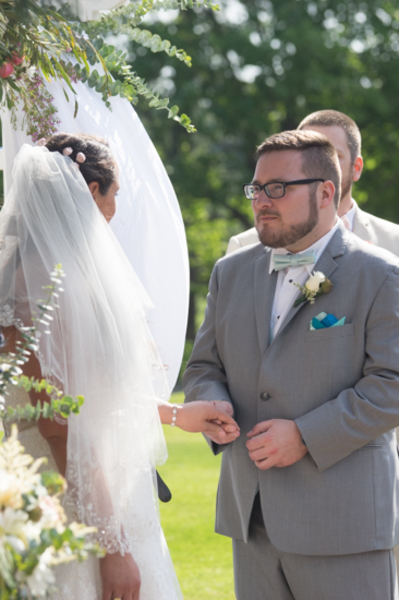 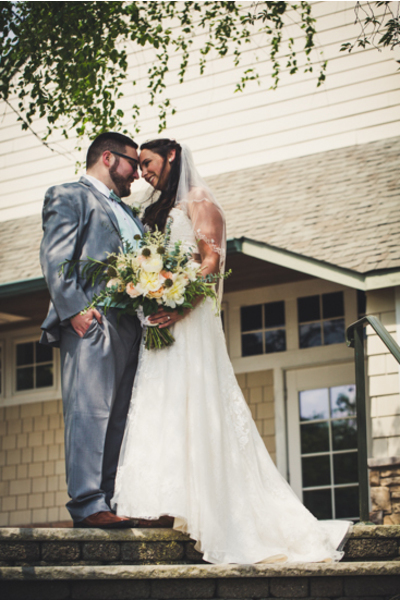 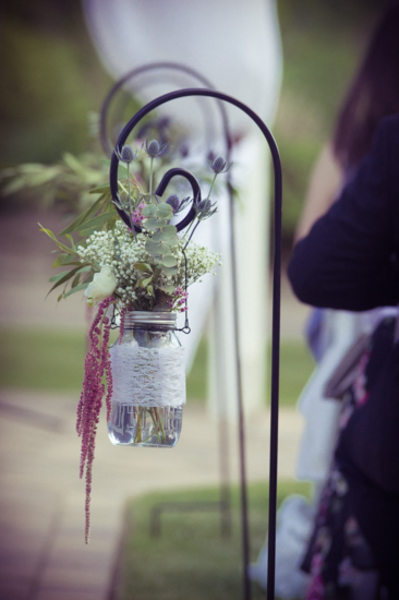 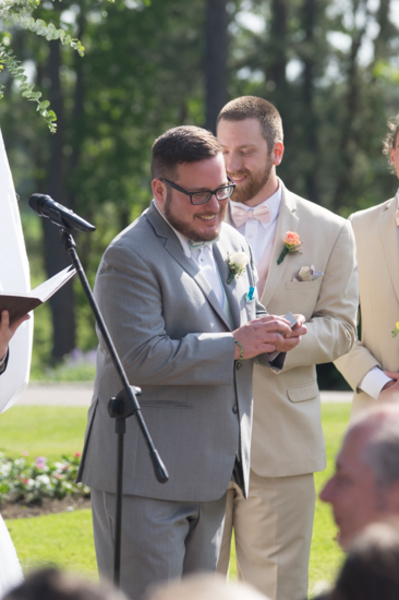 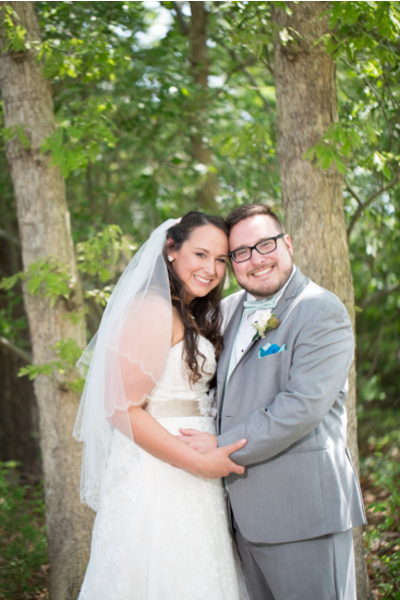 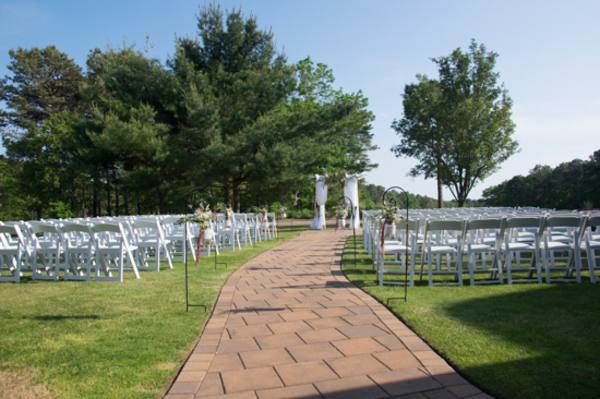 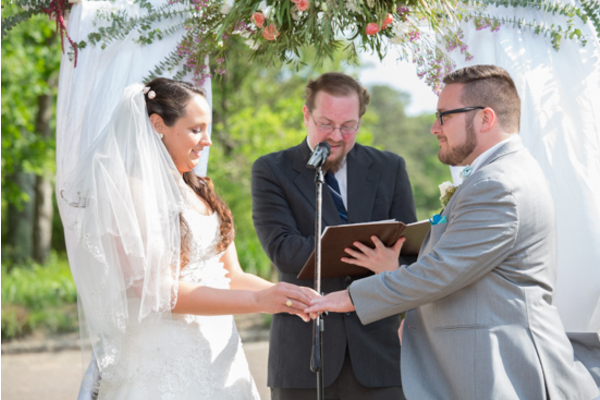 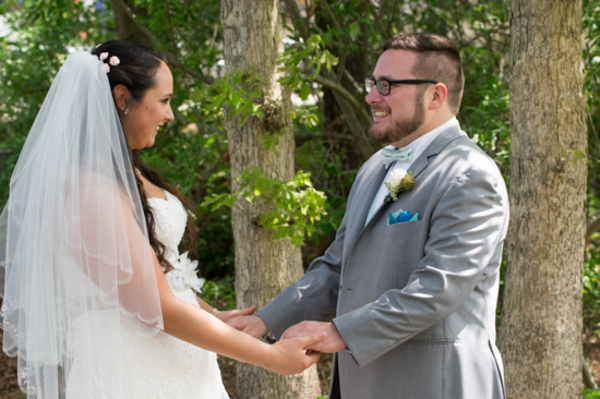 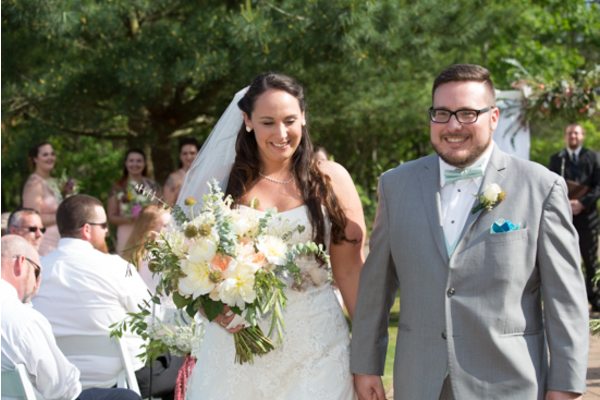 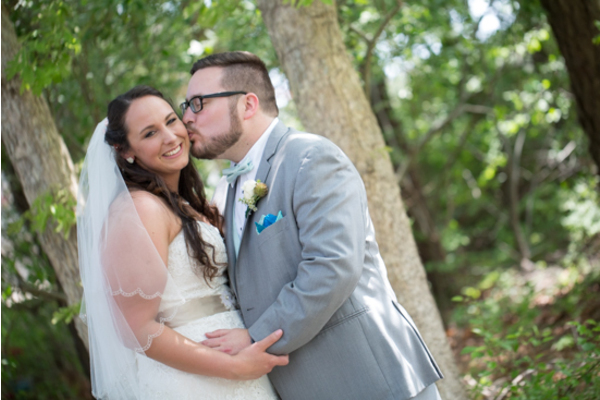 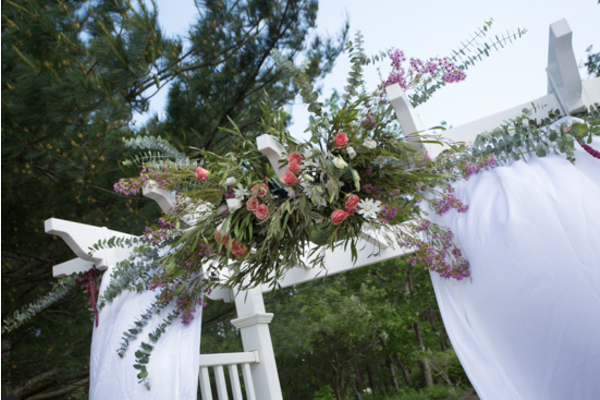 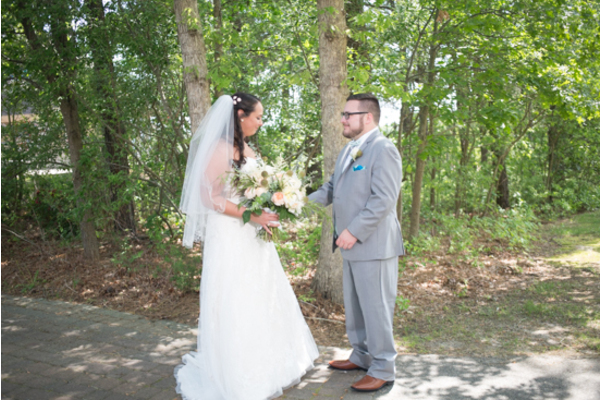 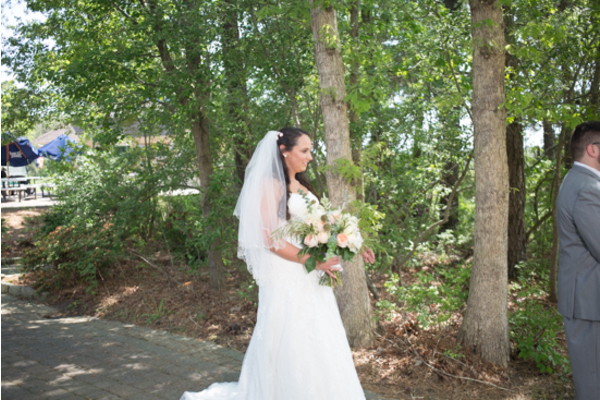 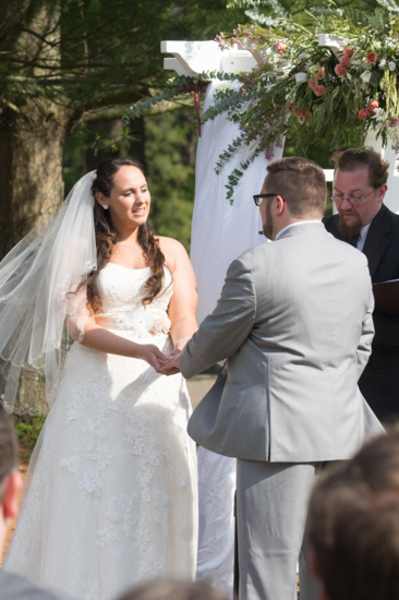 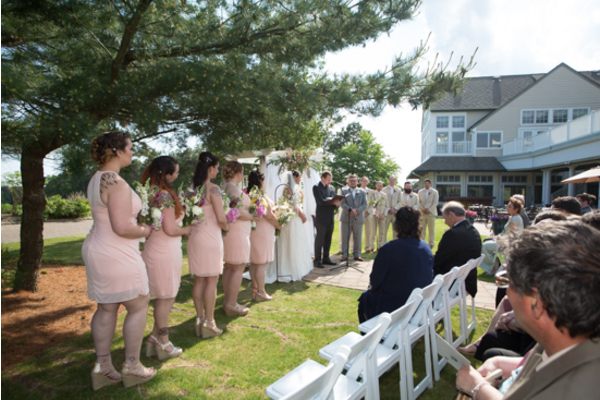 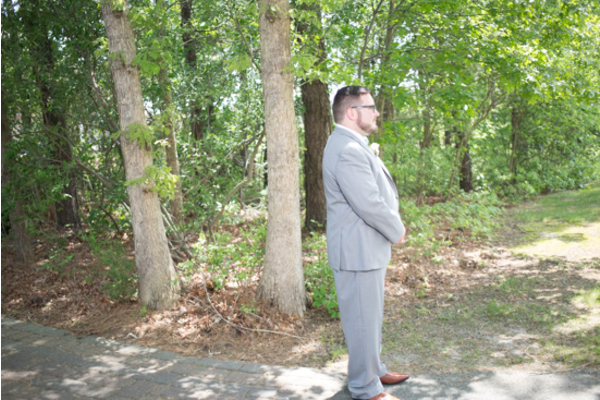 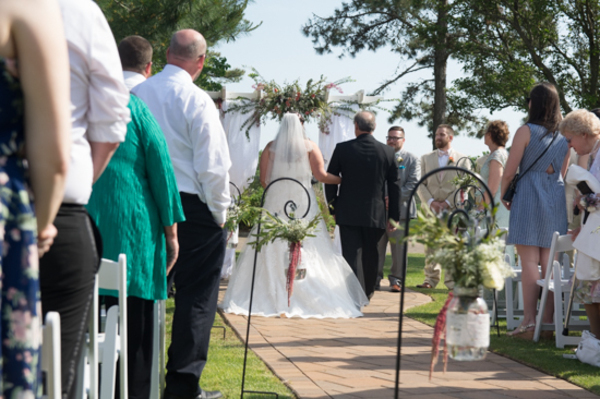 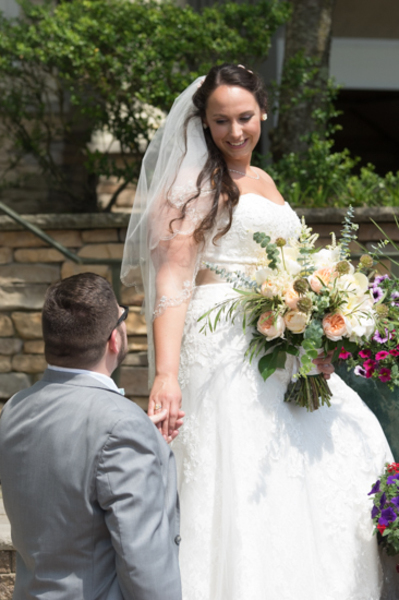 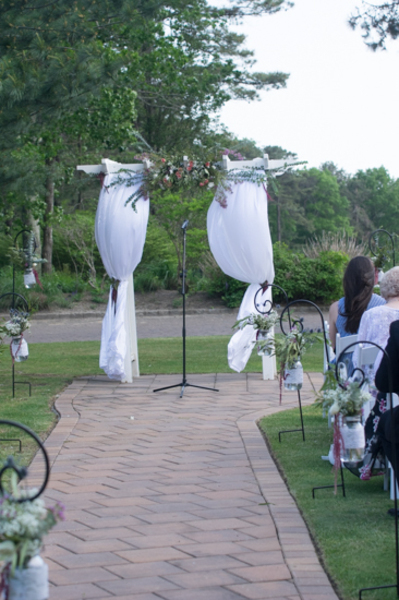 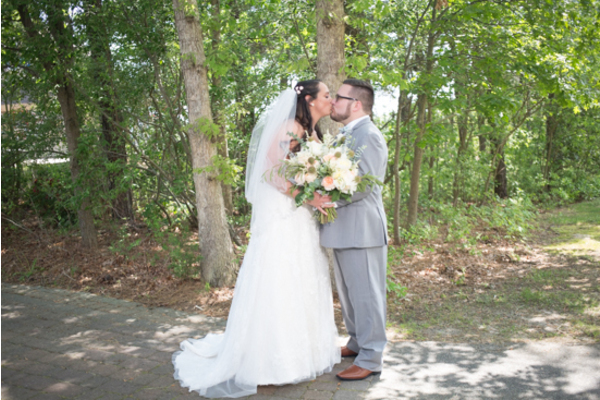 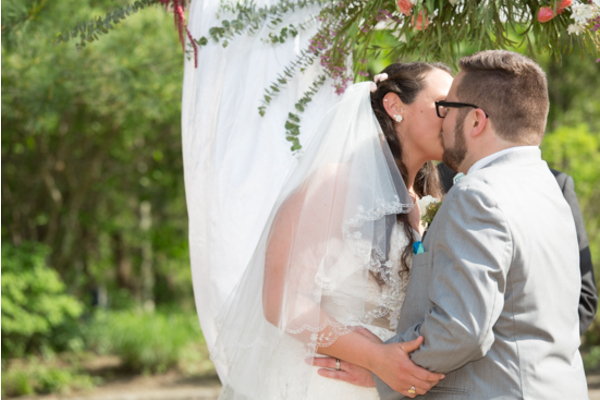 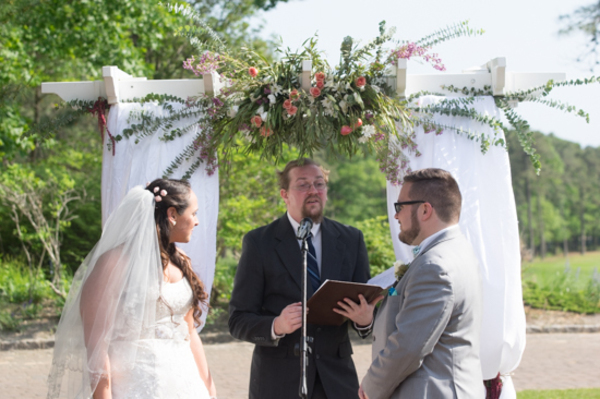 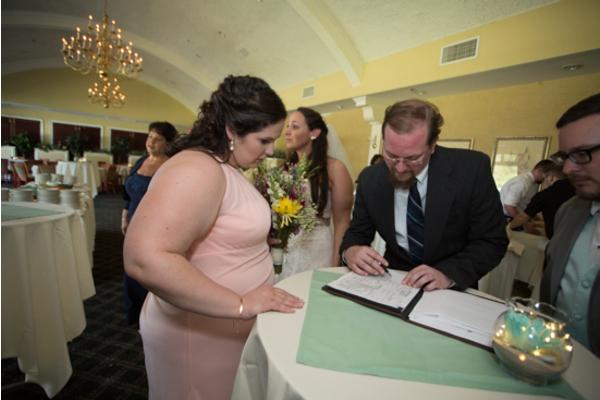 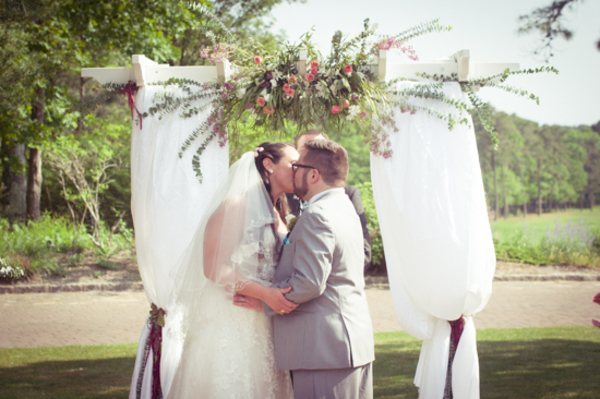 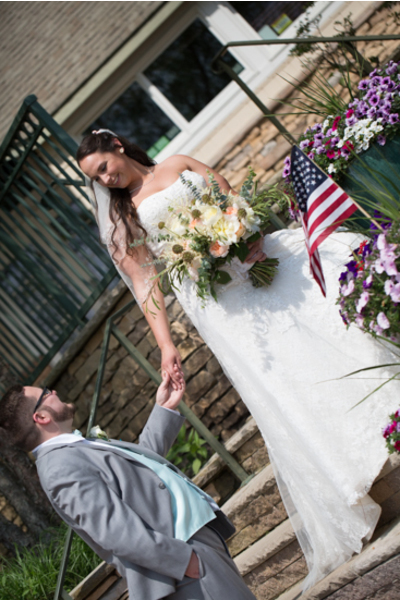 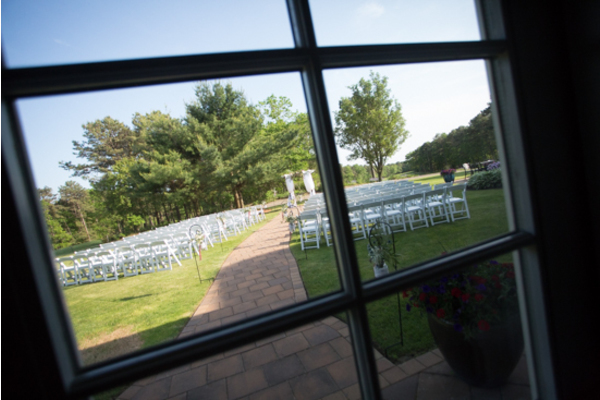 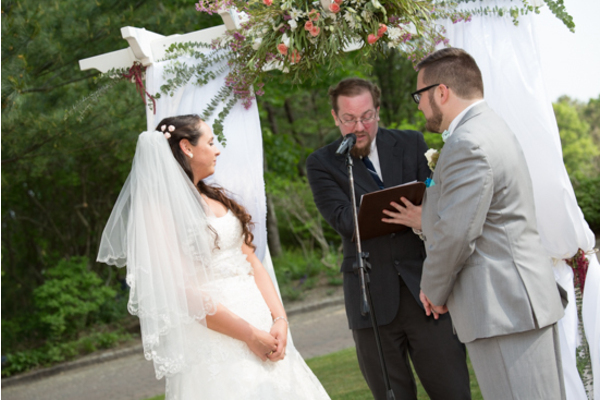 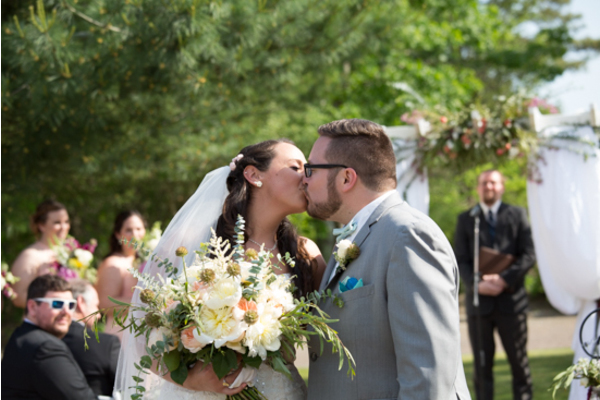 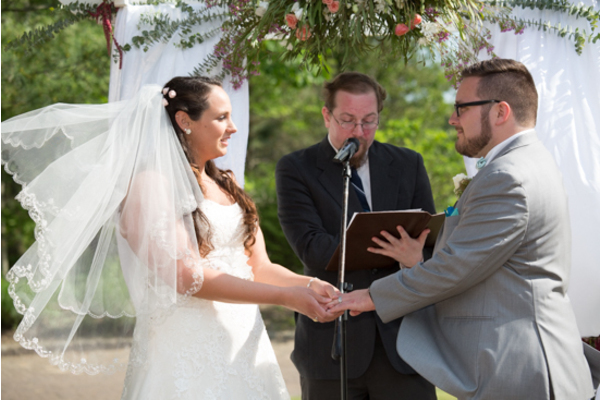 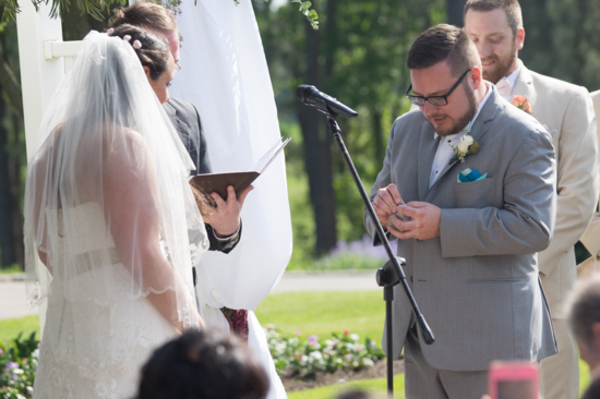 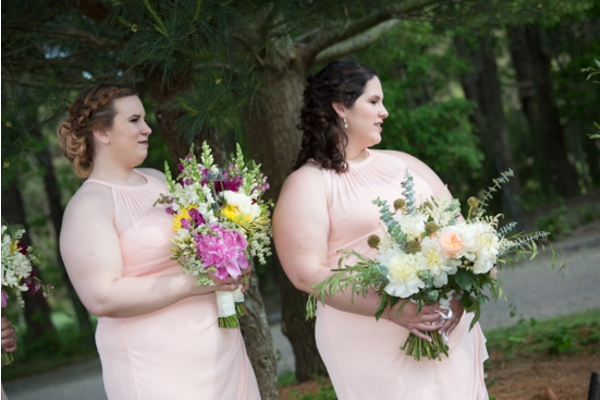 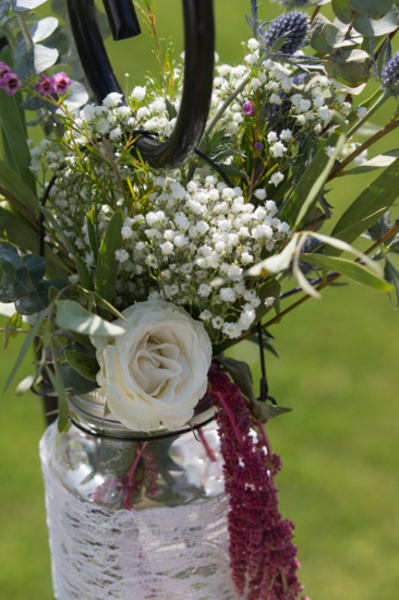 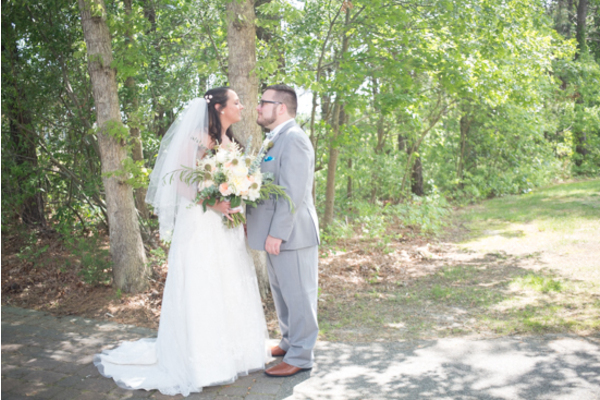 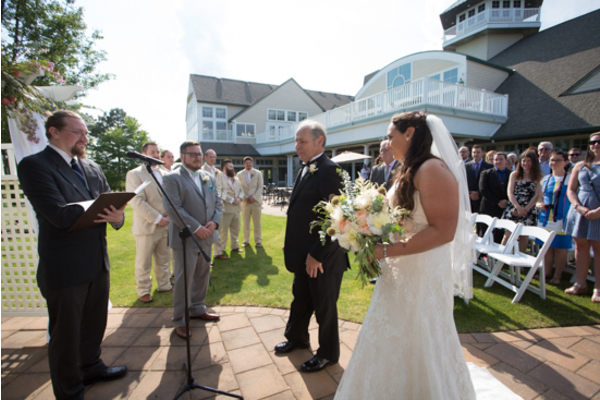 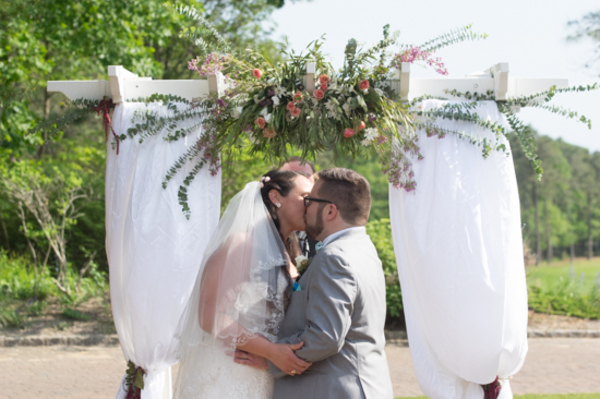 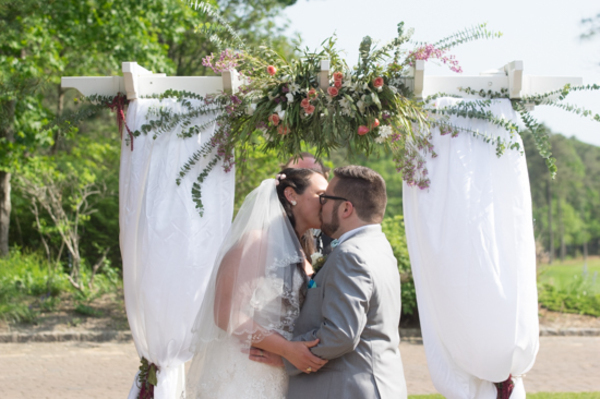 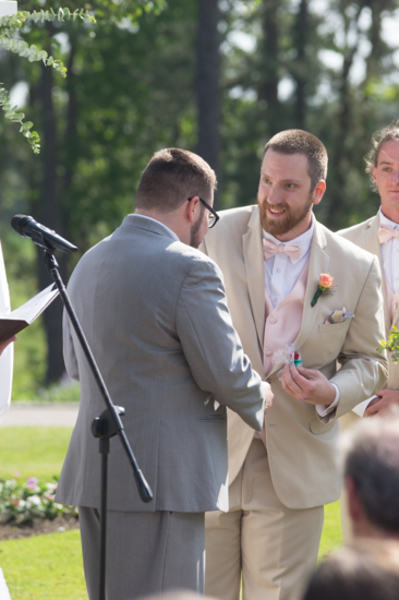 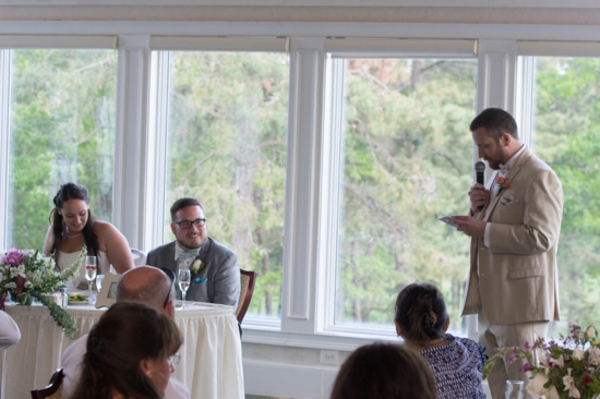 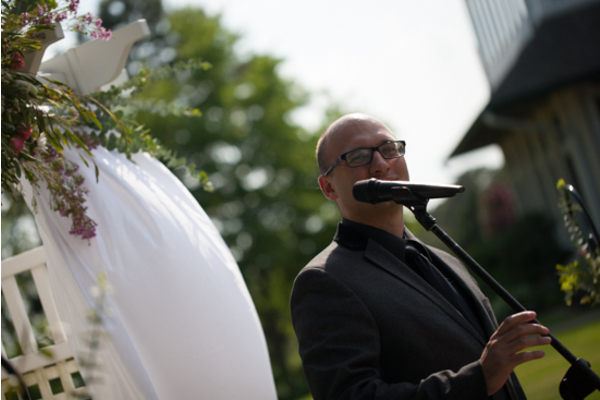 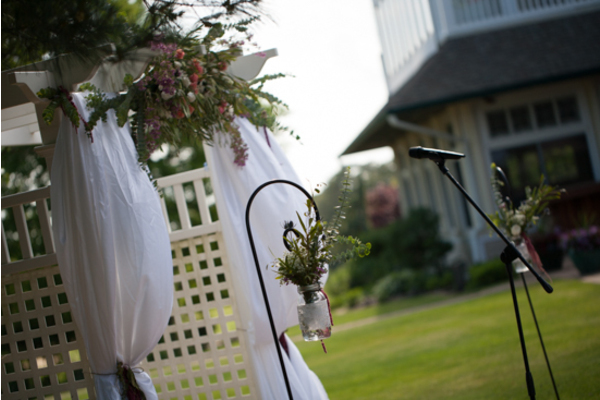 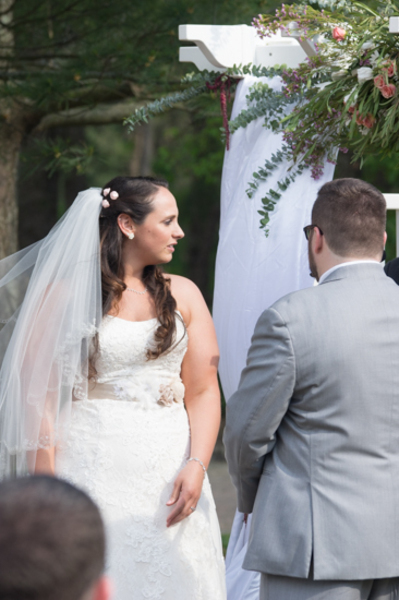 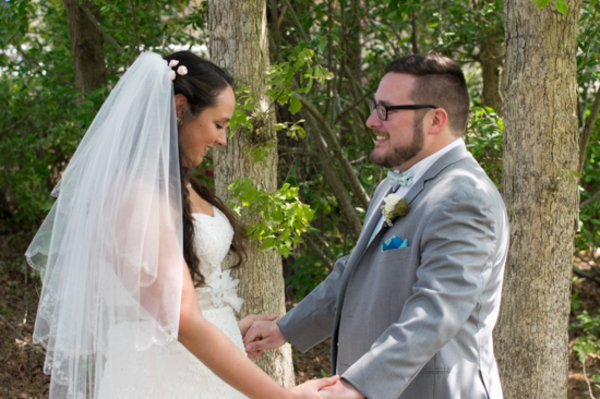 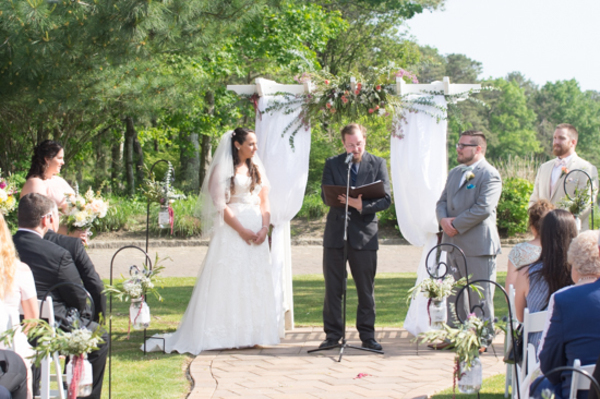 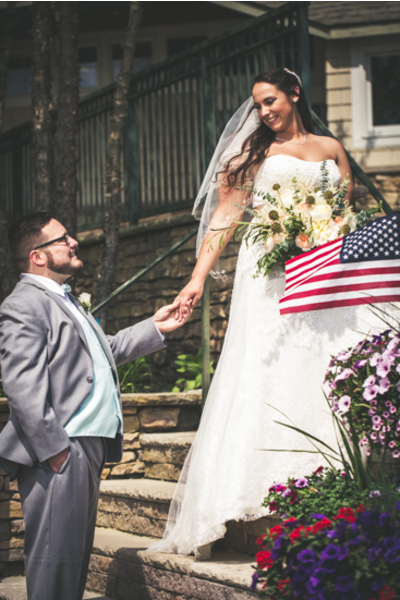 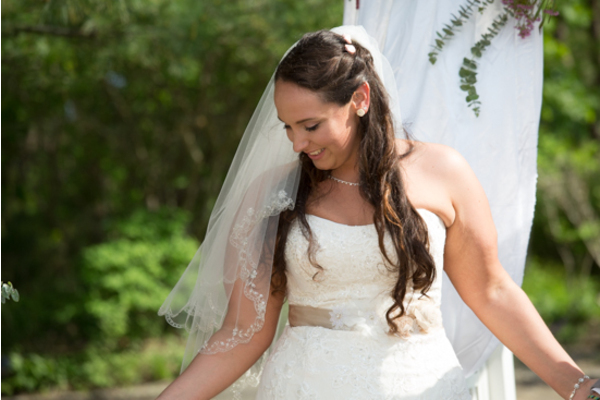 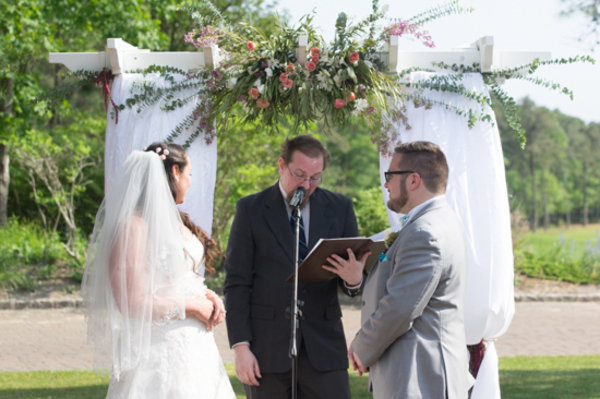 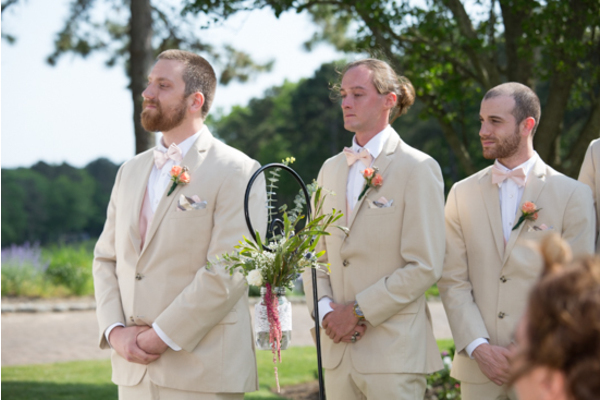 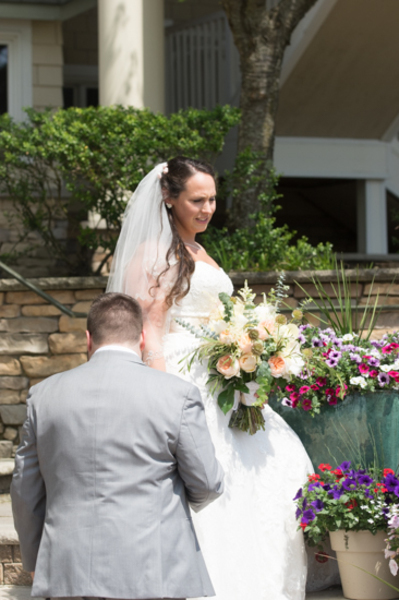 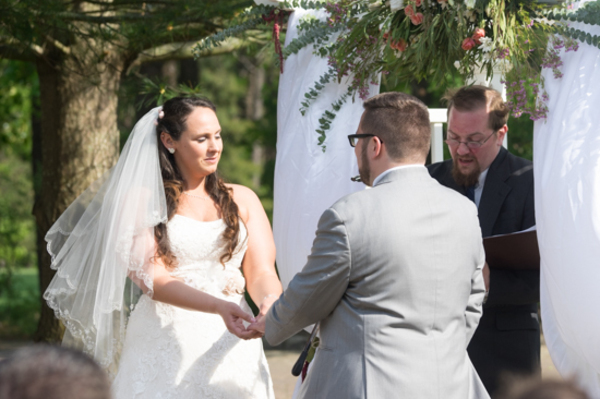 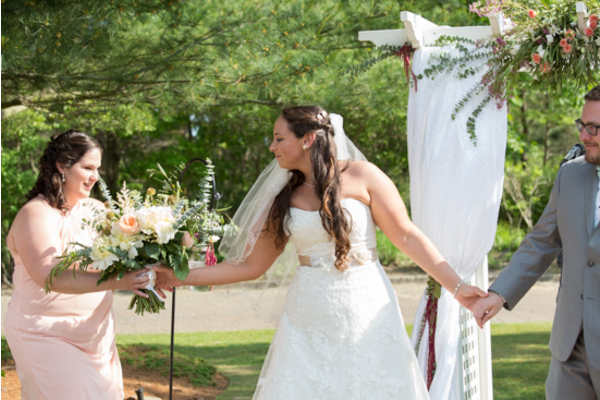 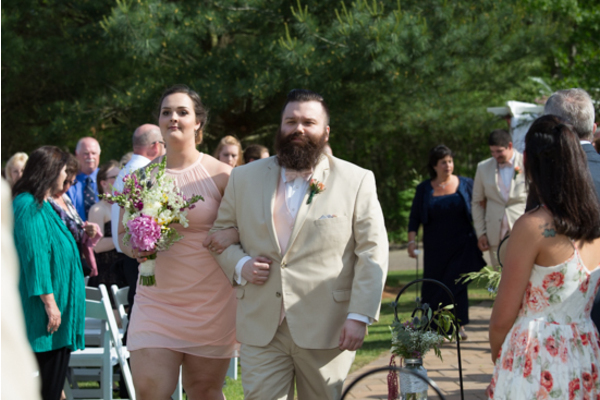 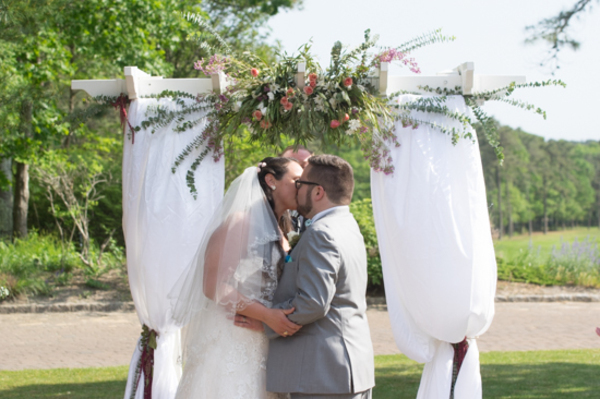 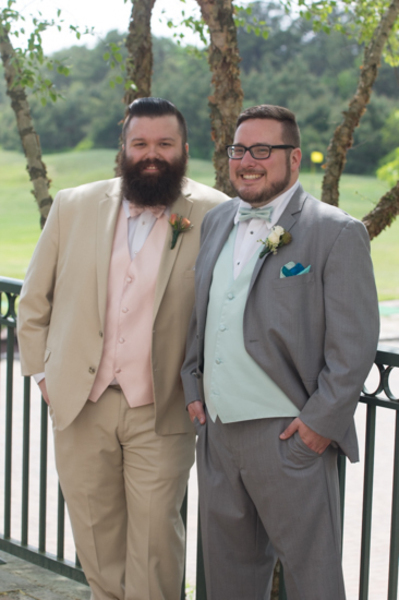 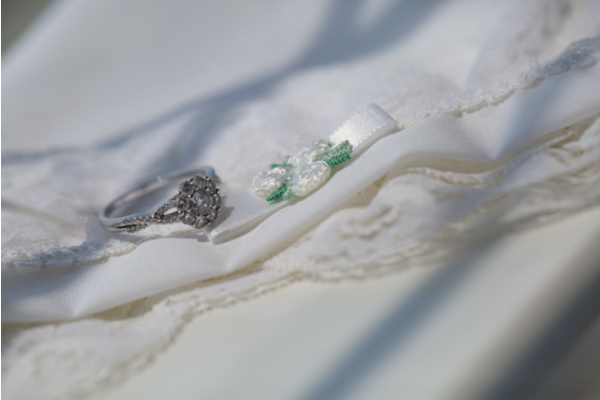 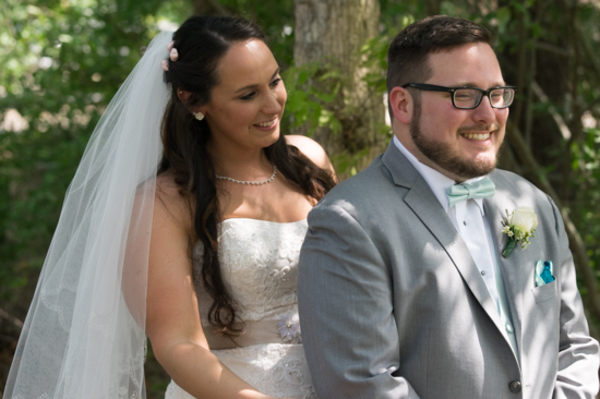 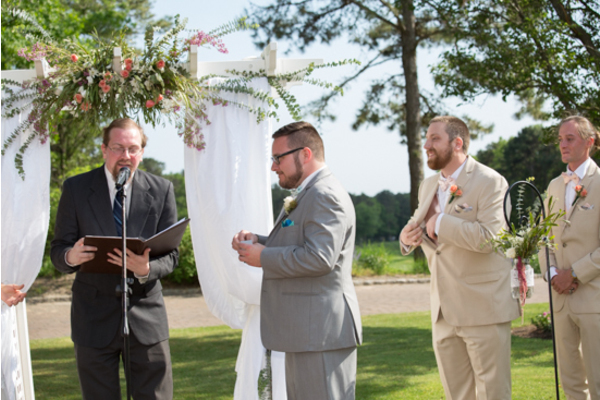 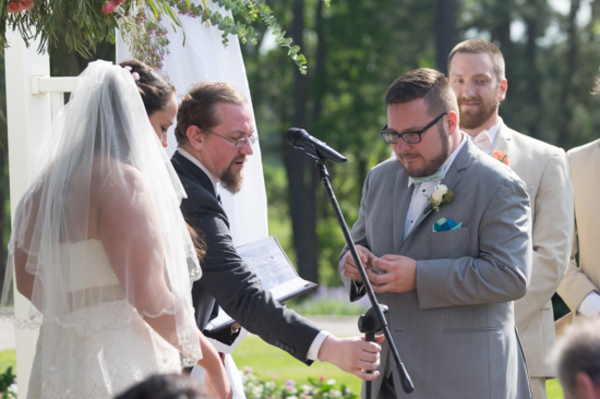 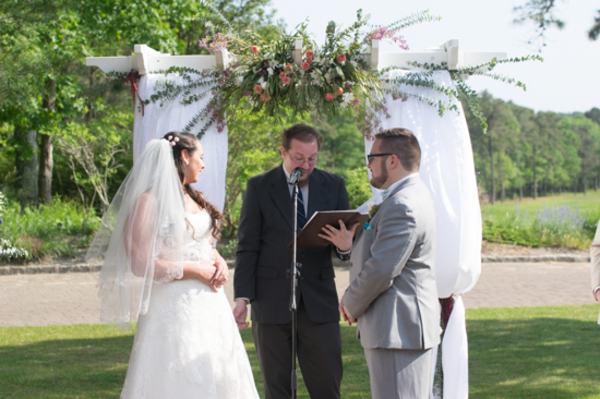 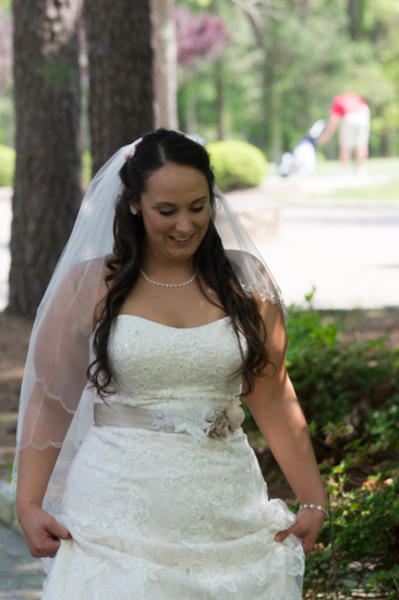 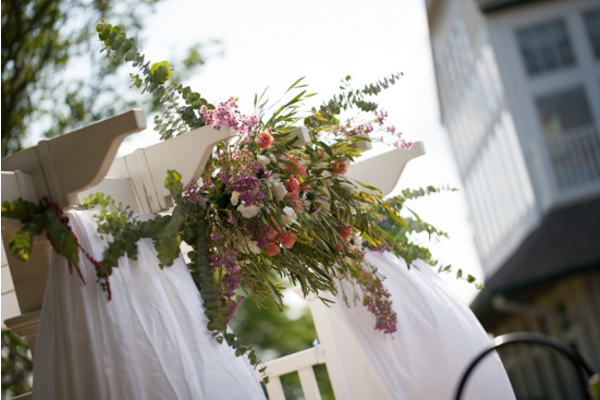 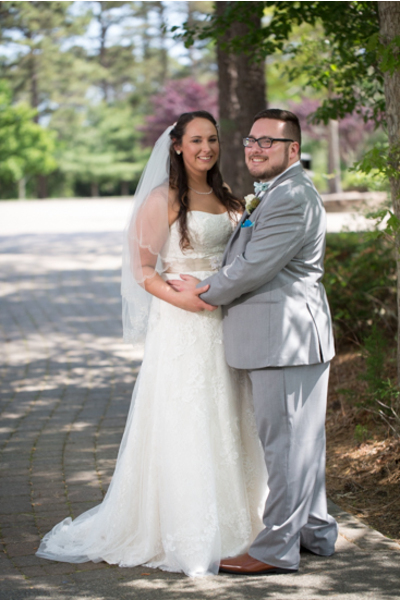 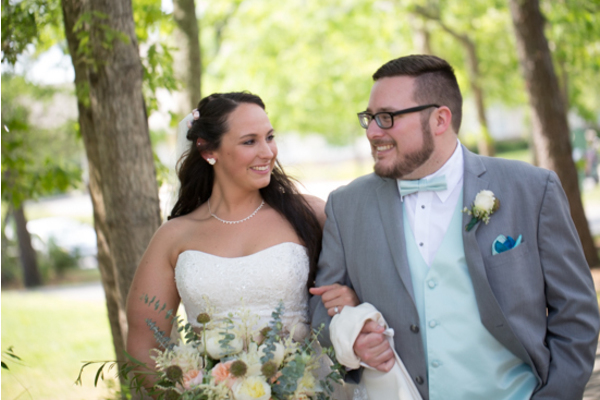 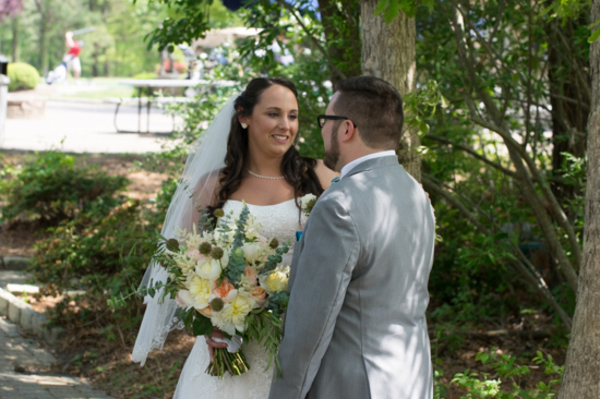 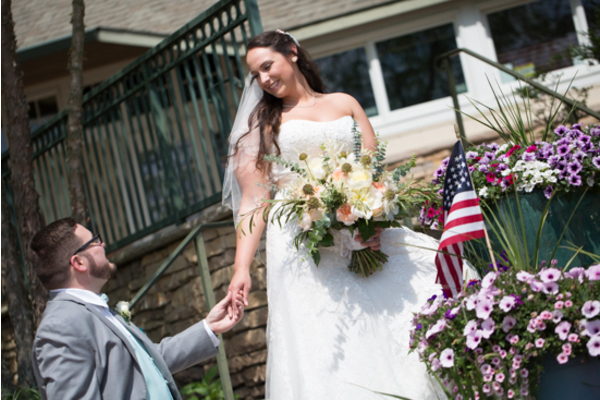 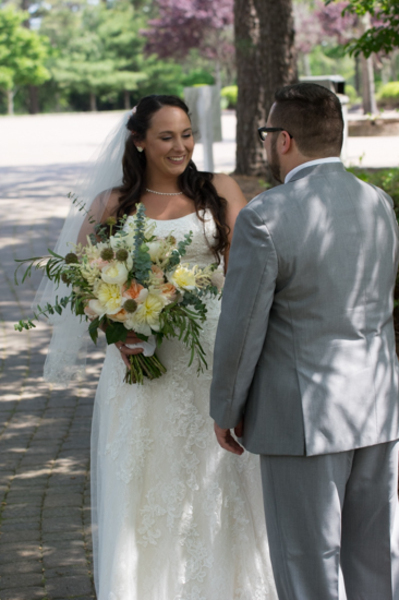 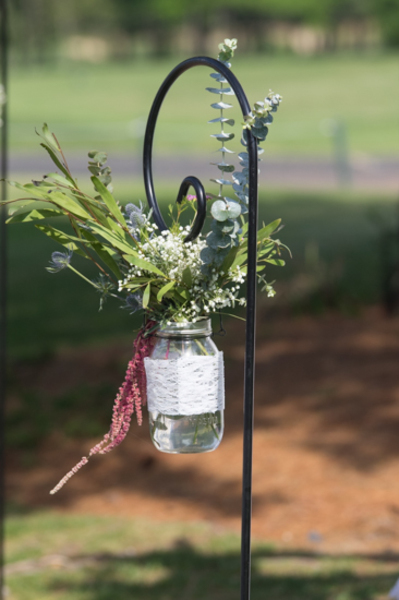 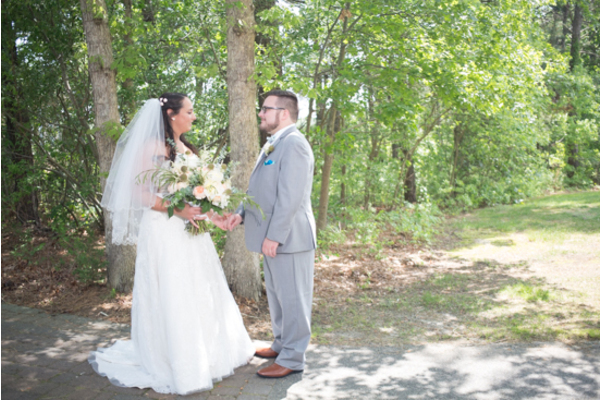 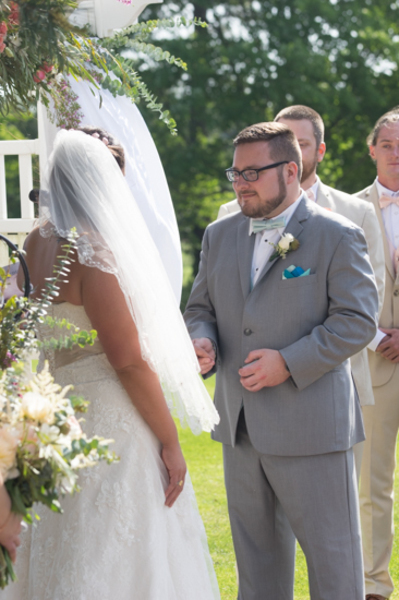 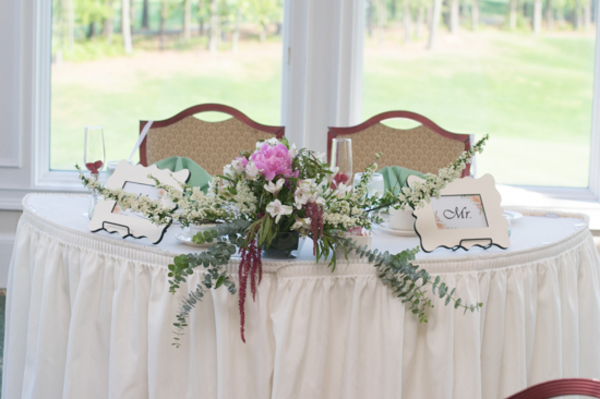 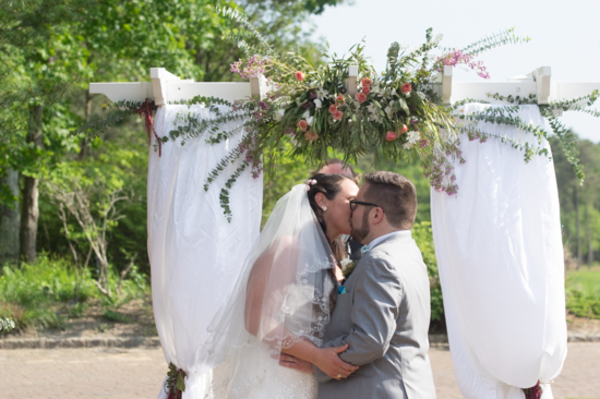 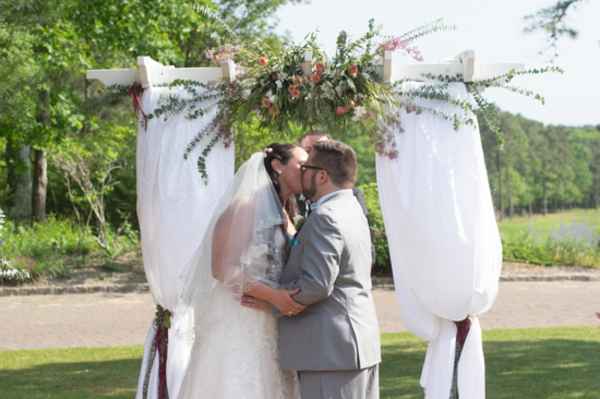 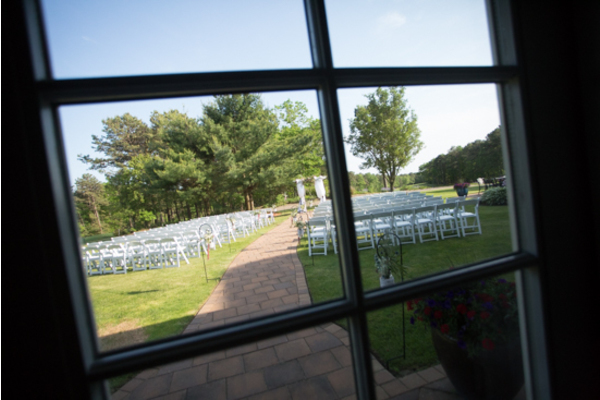 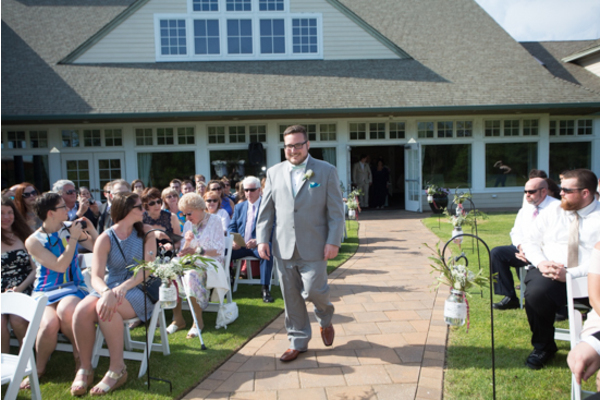 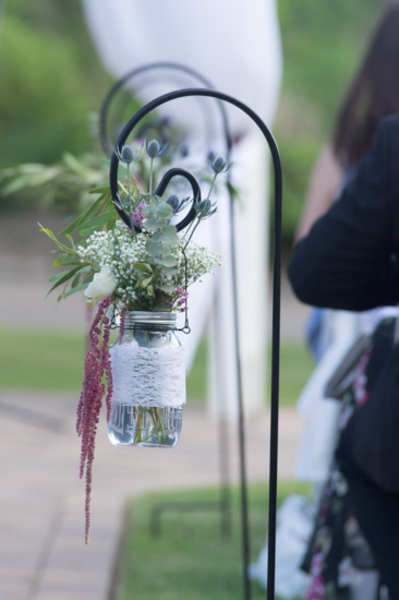 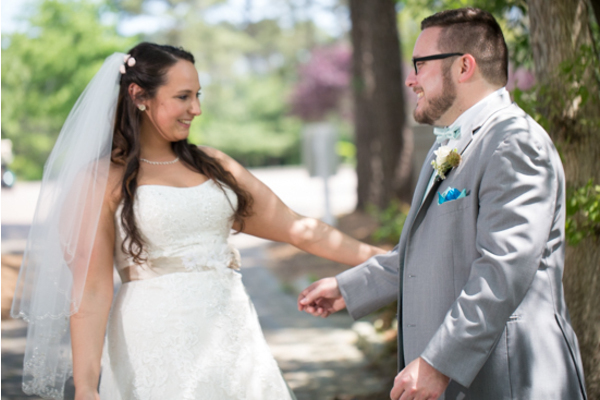 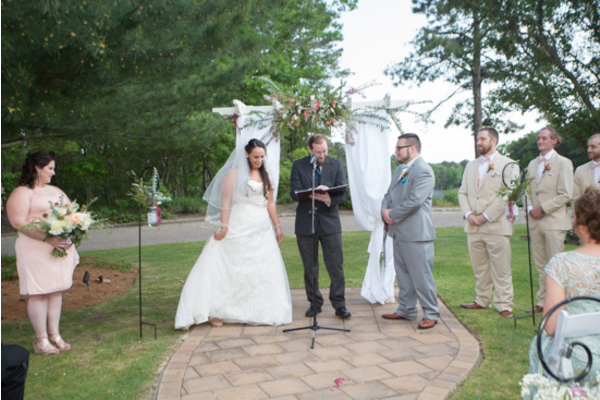 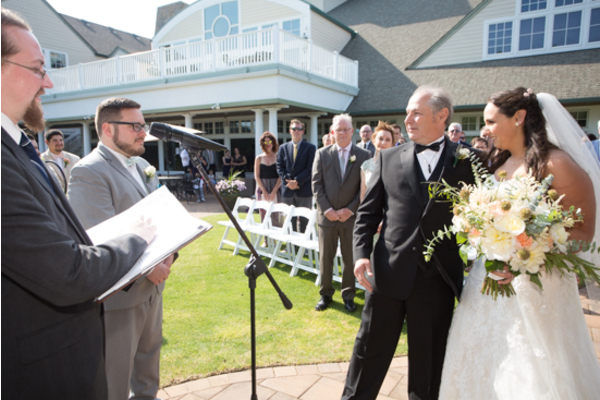 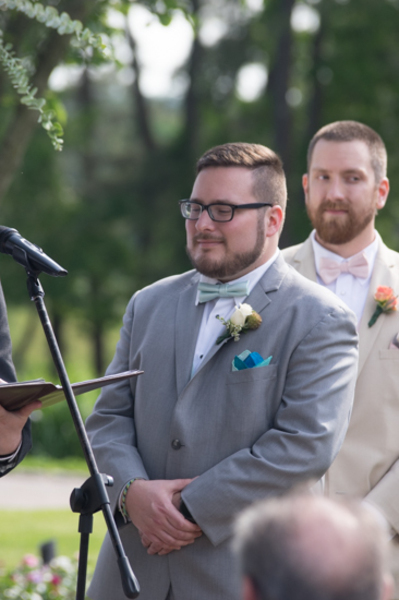 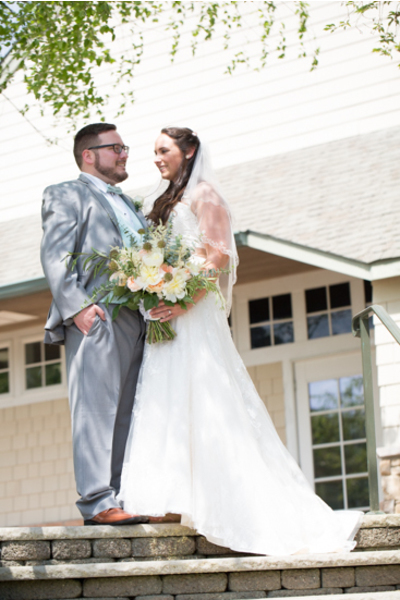 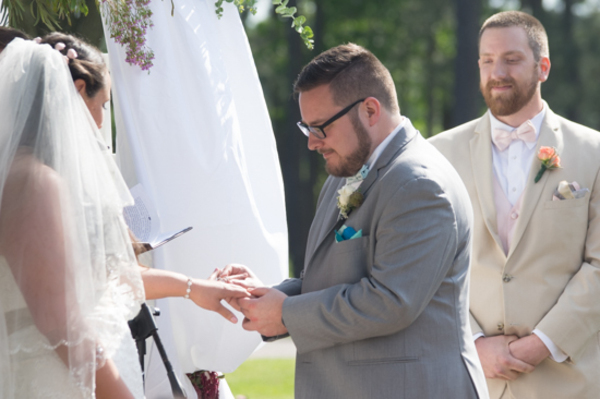 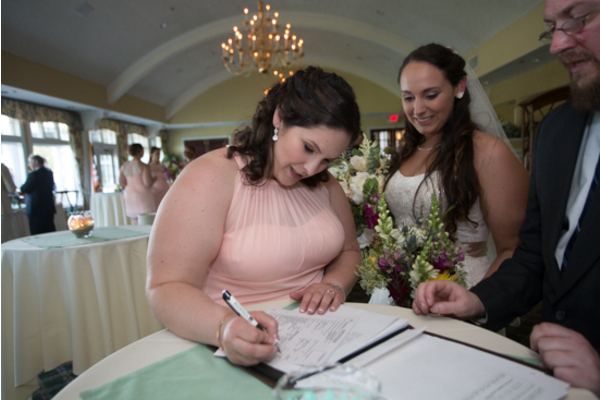 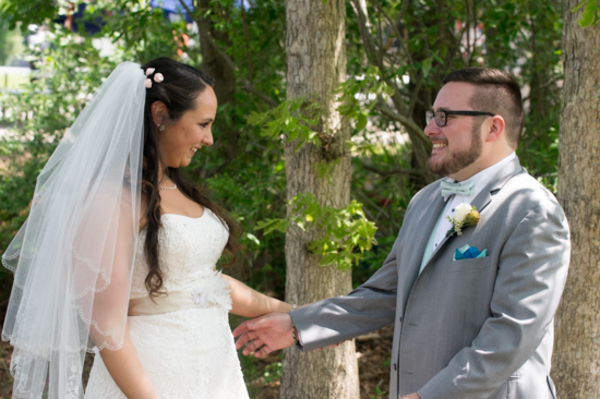 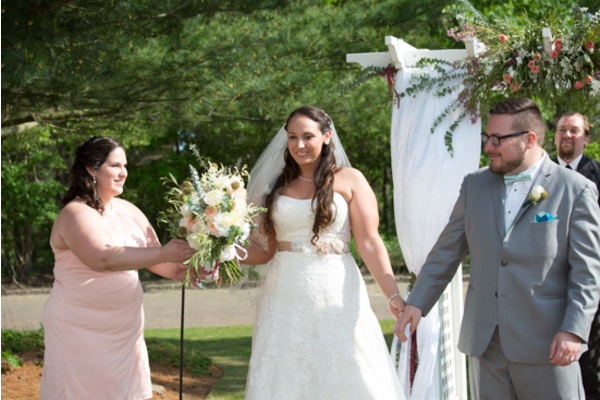 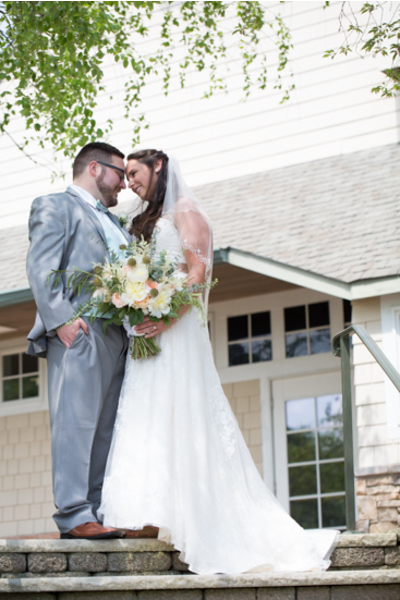 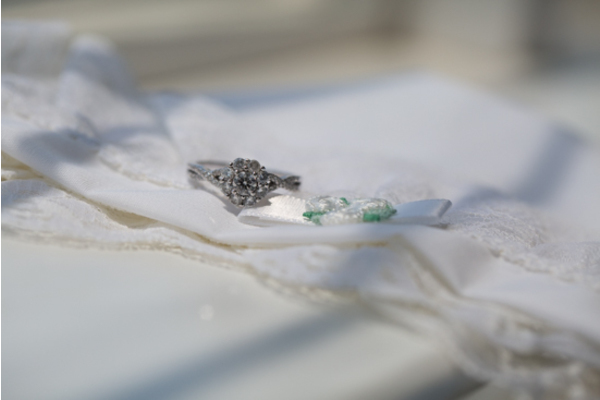 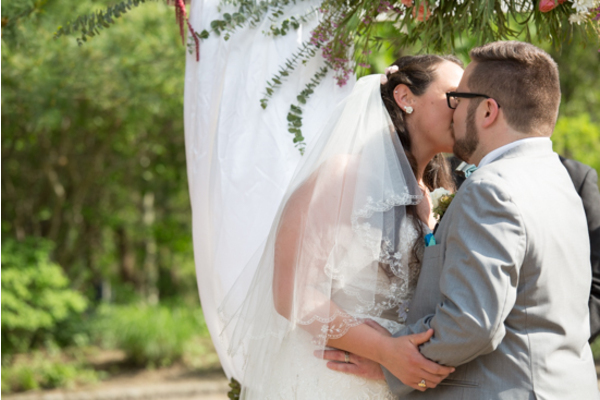 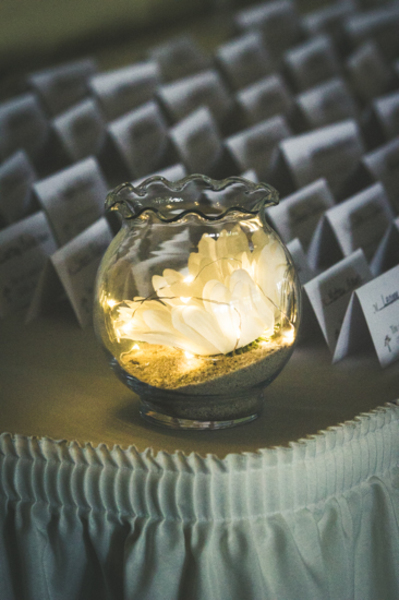 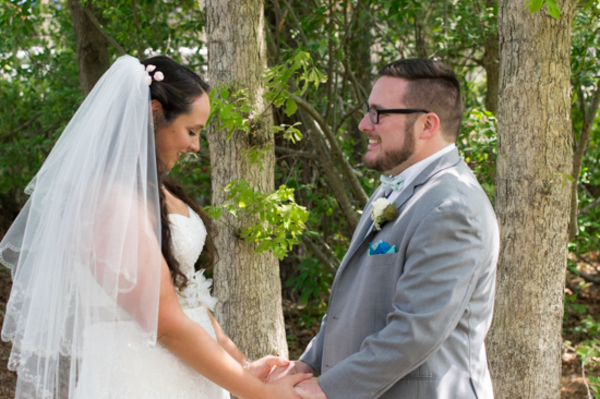 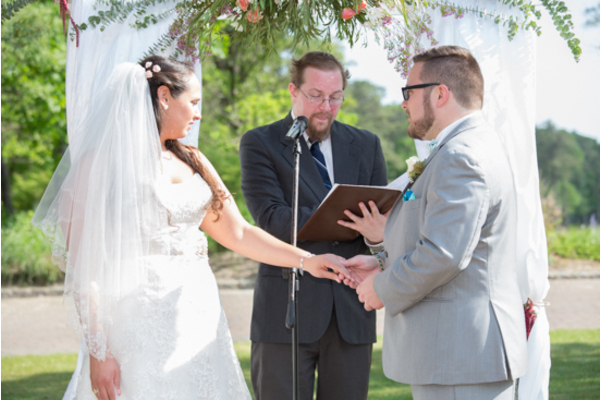 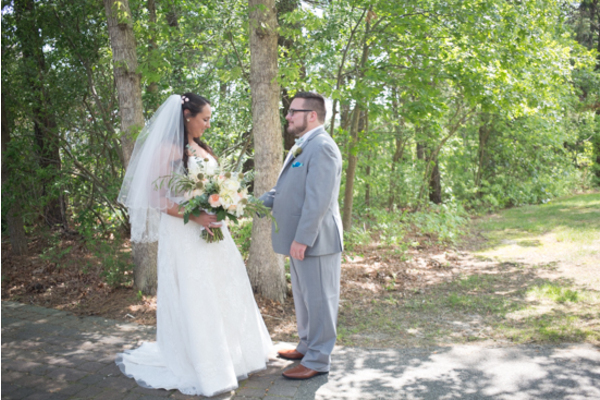 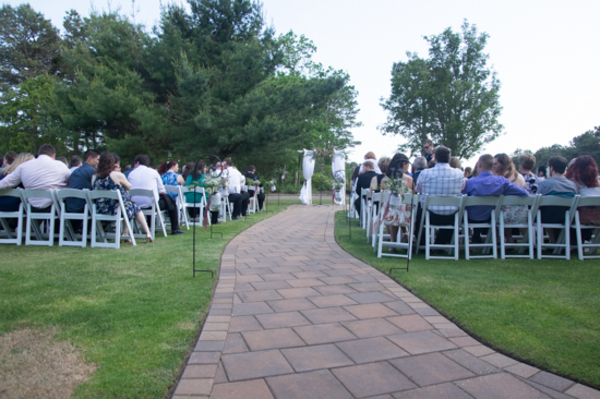 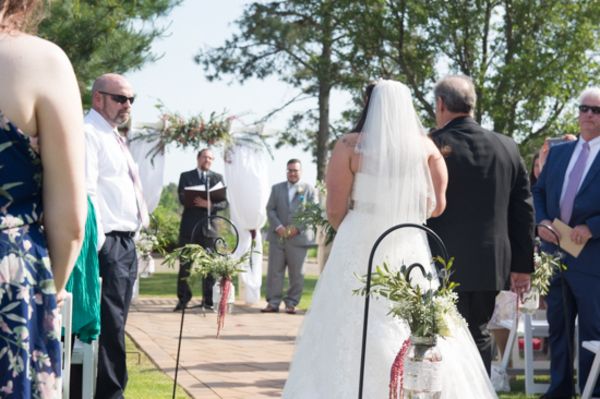 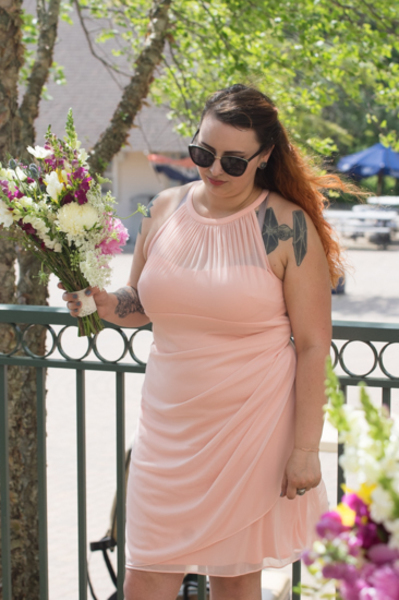 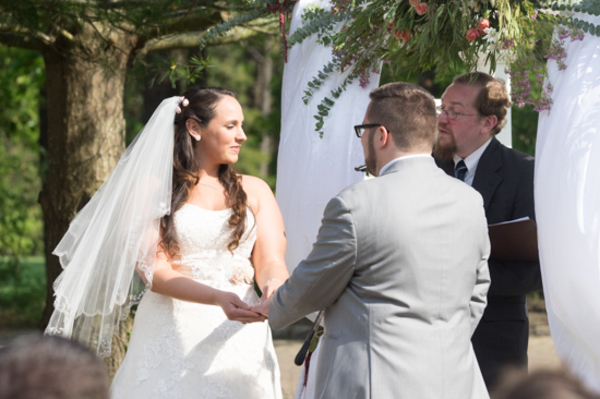 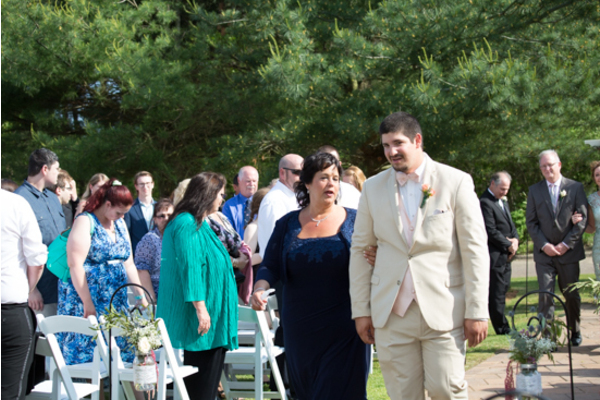 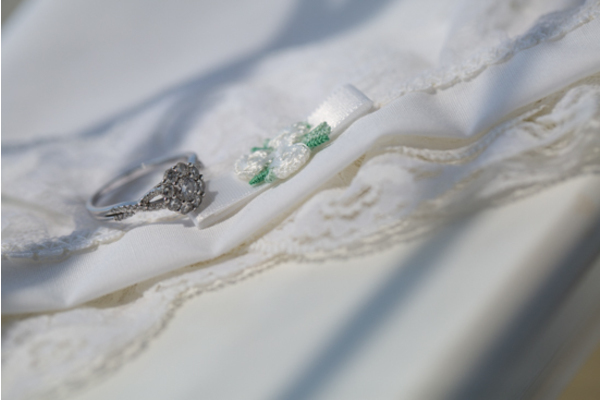 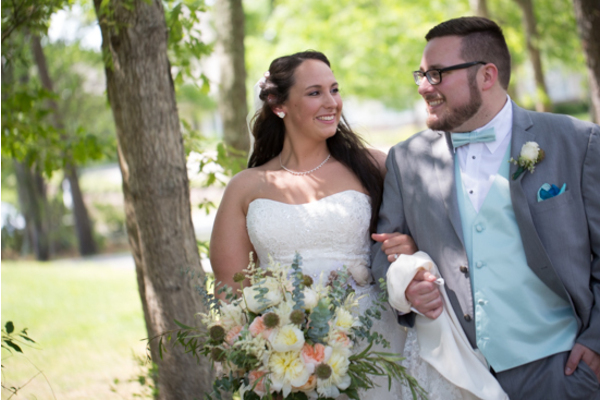 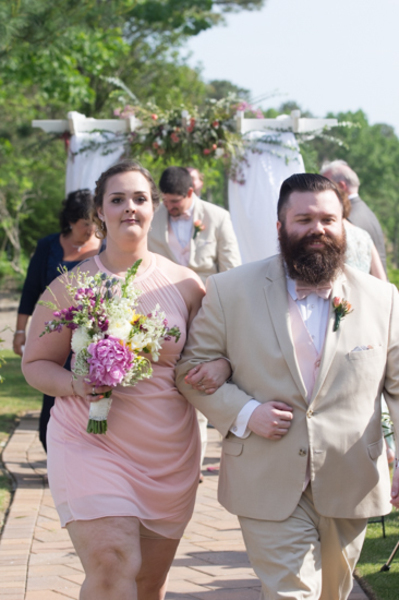 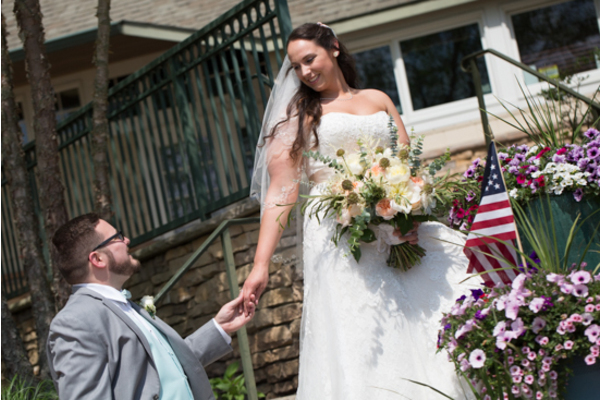 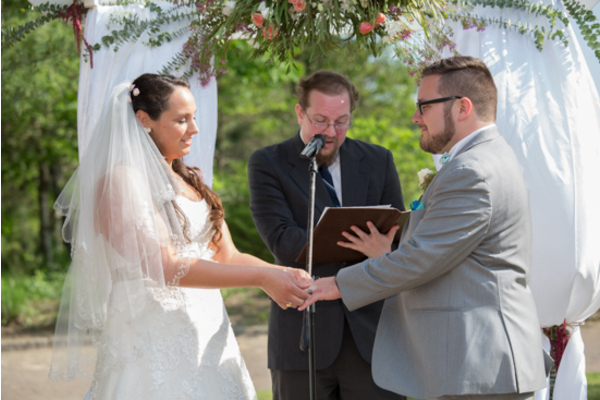 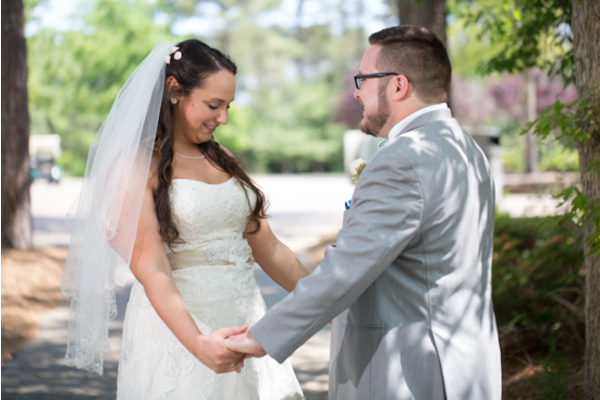 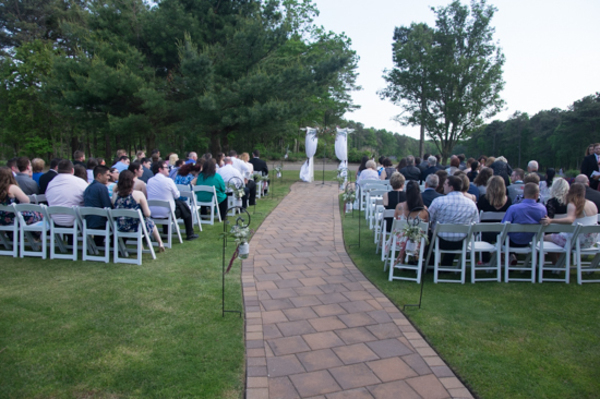 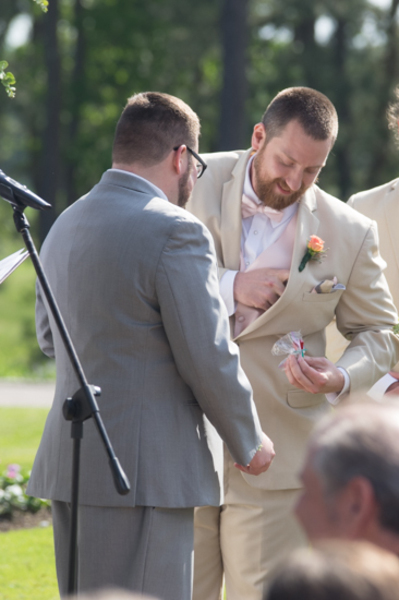 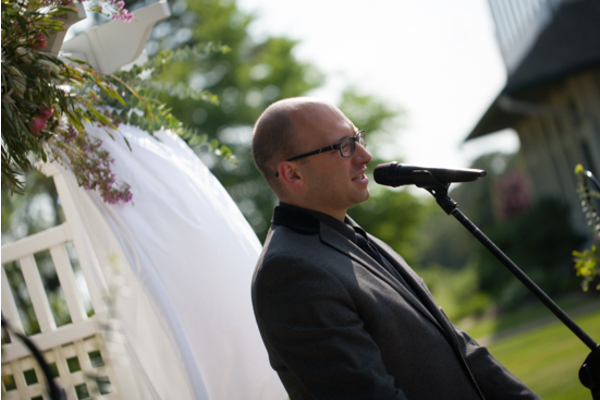 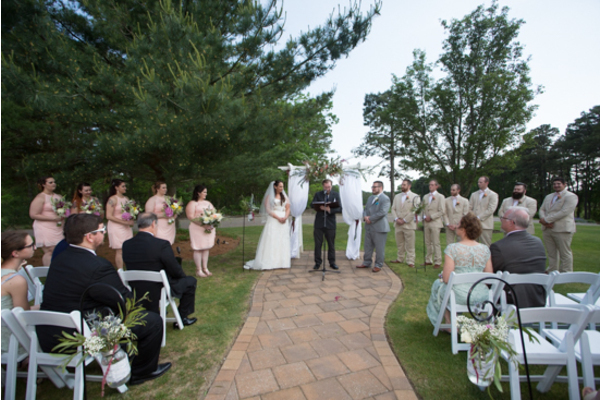 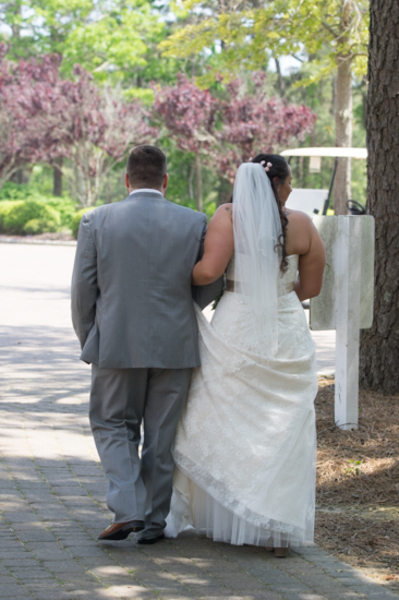 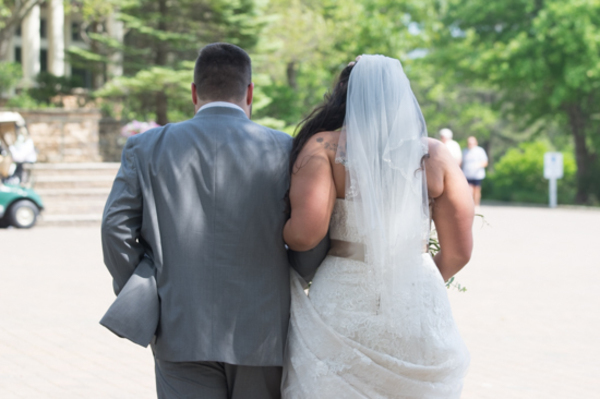 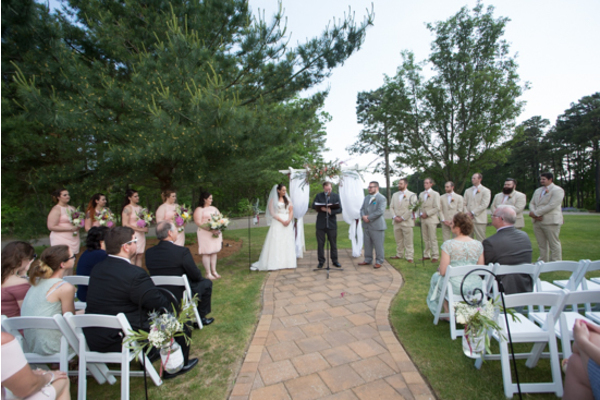 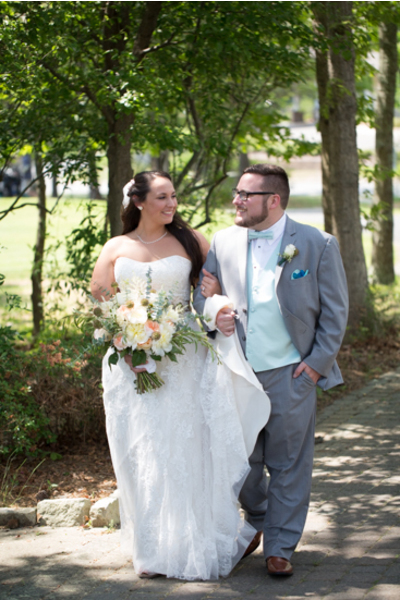 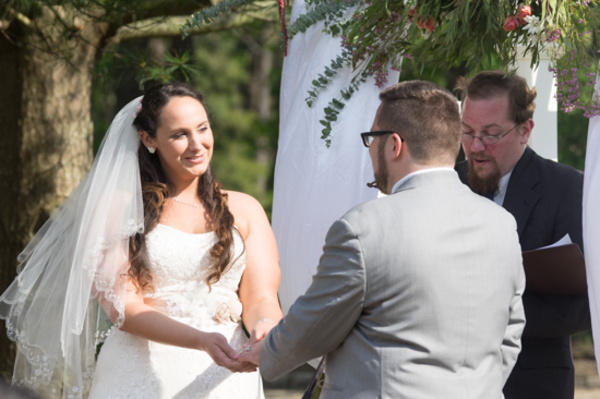 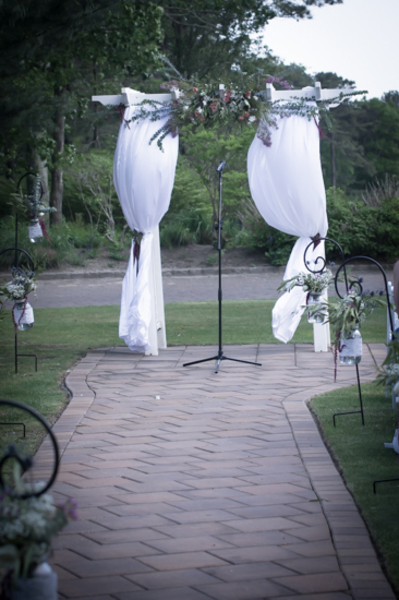 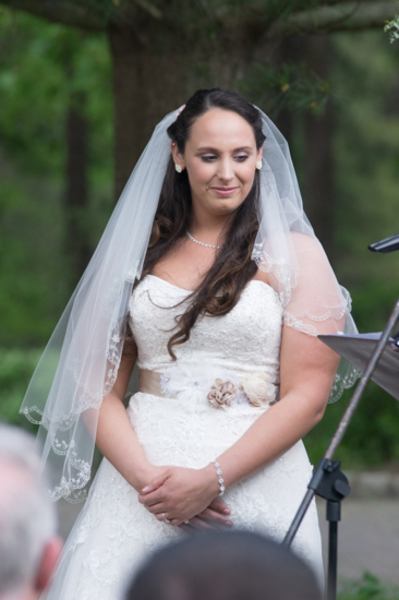 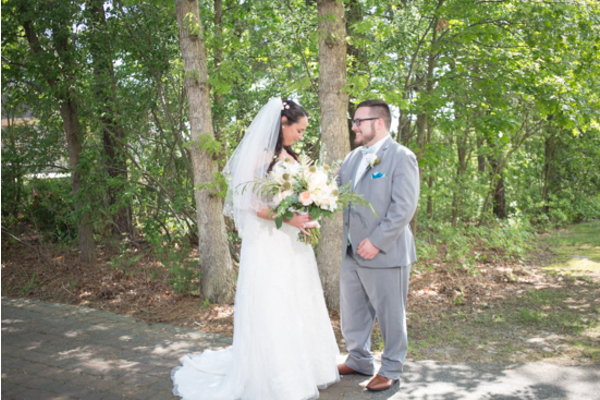 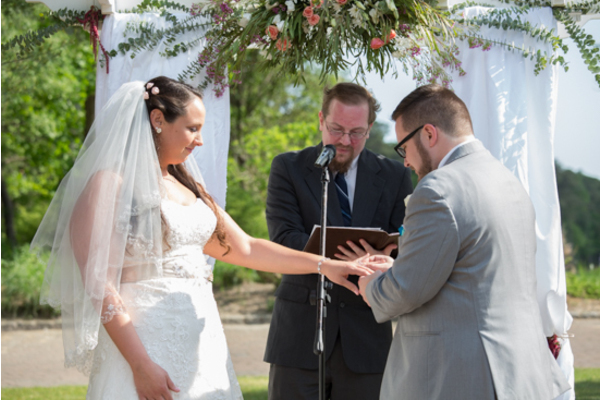 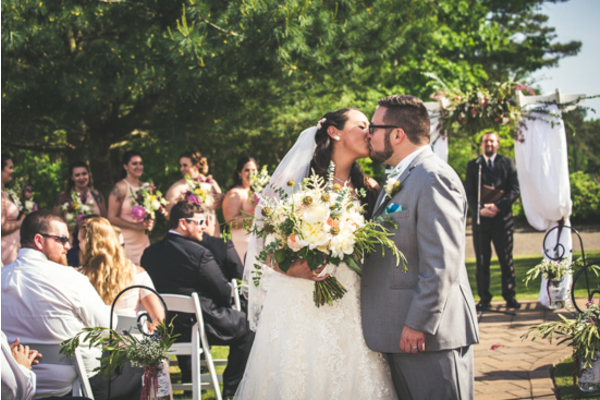 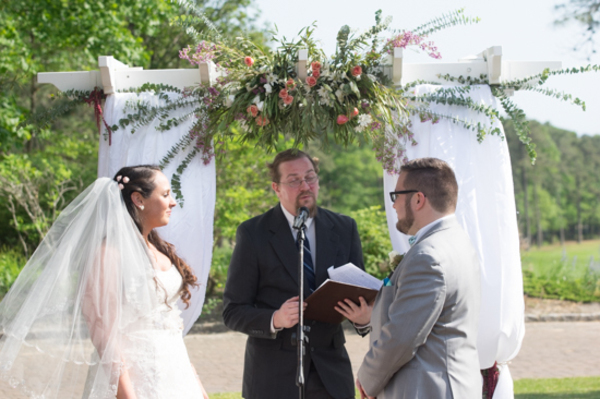 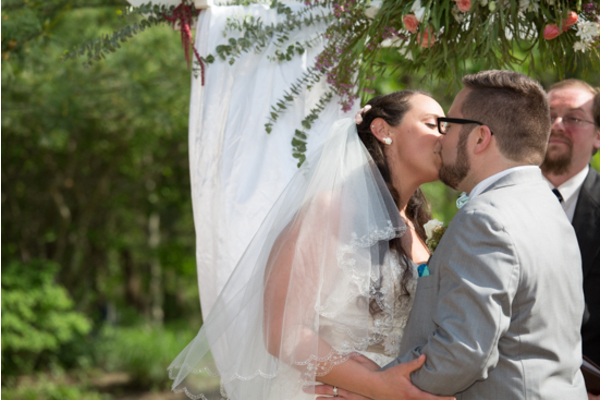 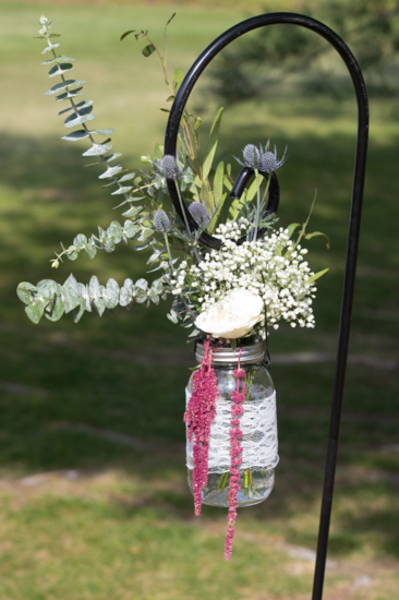 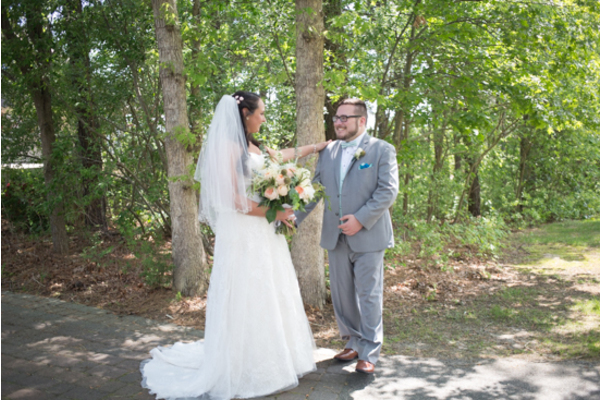 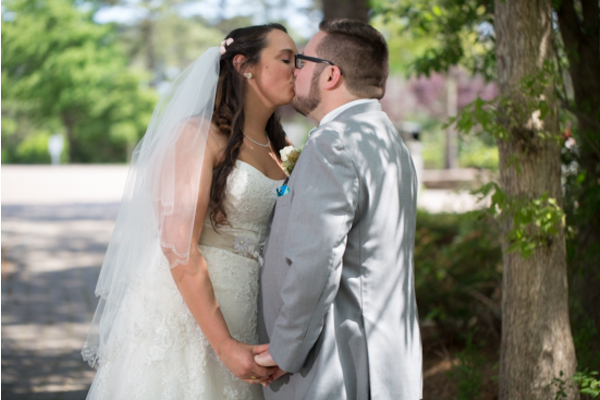 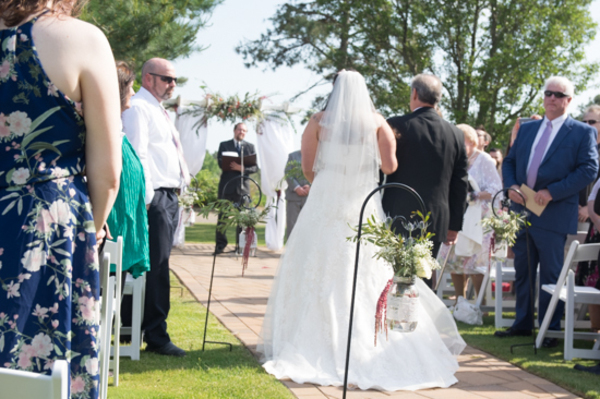 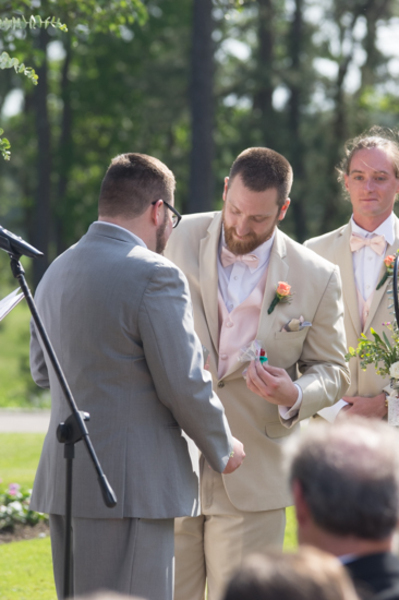 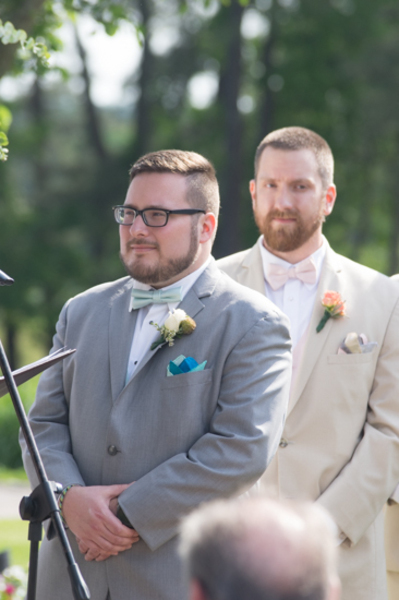 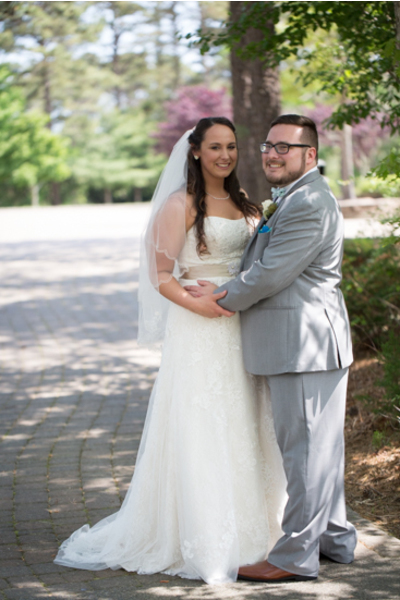 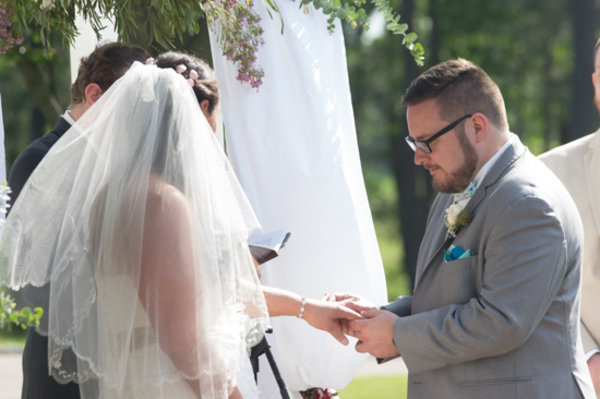 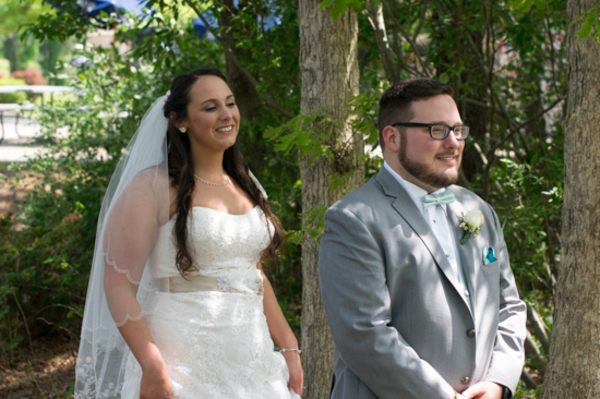 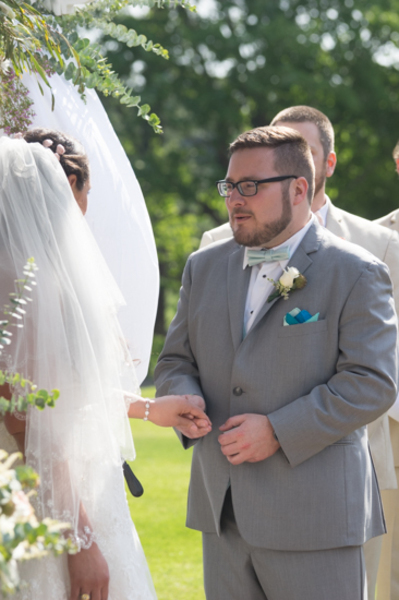 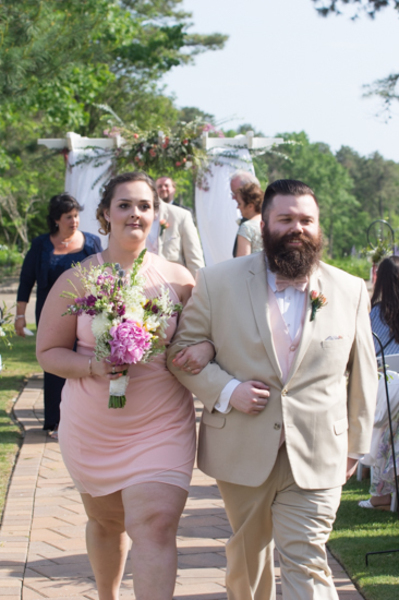 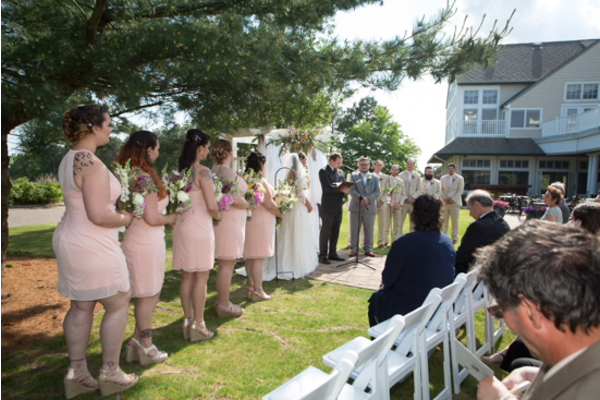 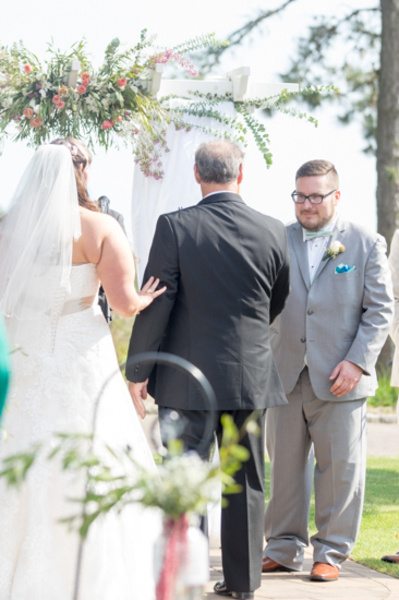 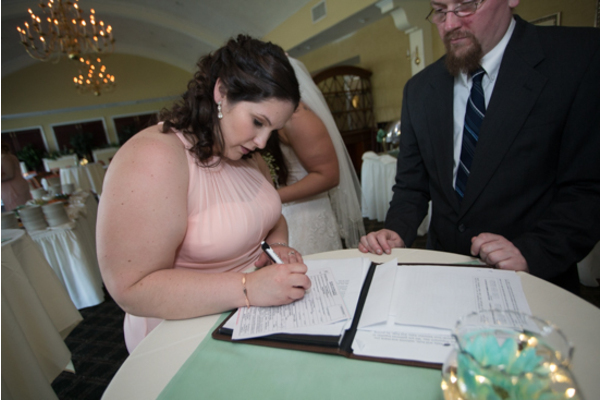 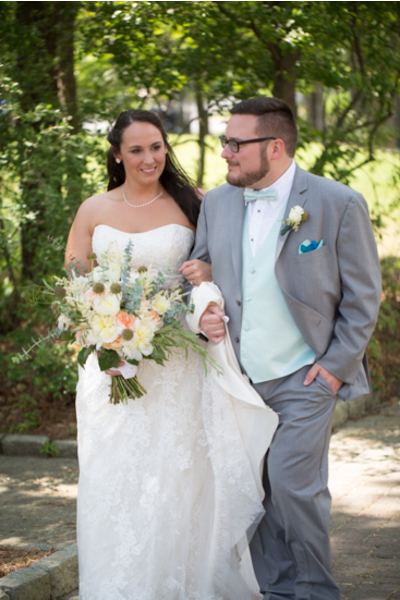 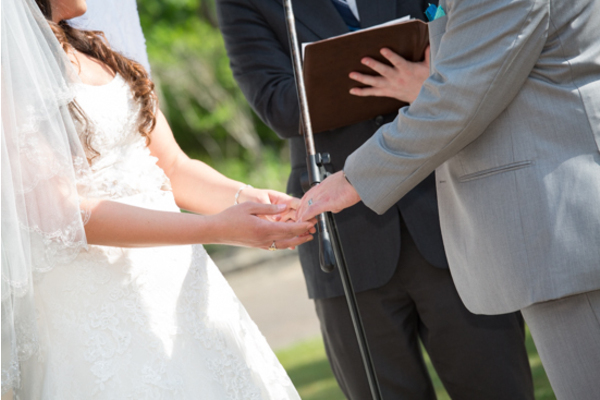 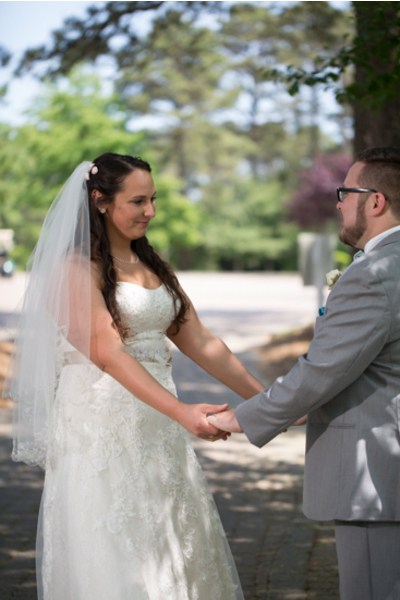 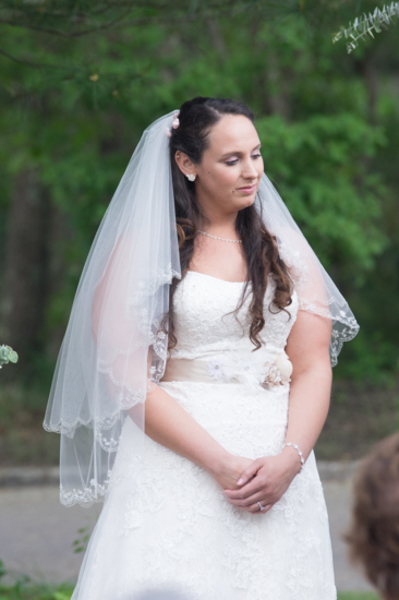 Kelly and Kyle had a beautiful outdoor ceremony officiated by our NJ Wedding Officiant. 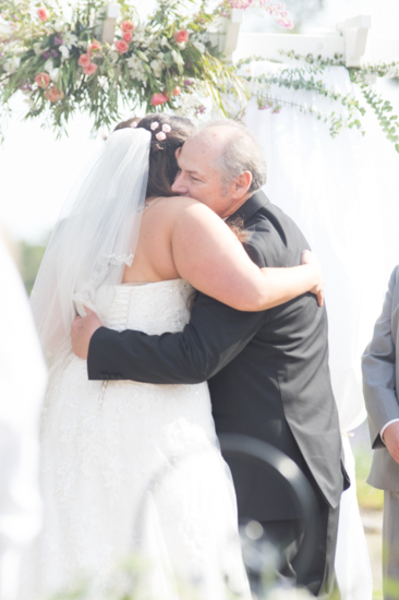 The guests and couple shared tears and laughs throughout the touching service. 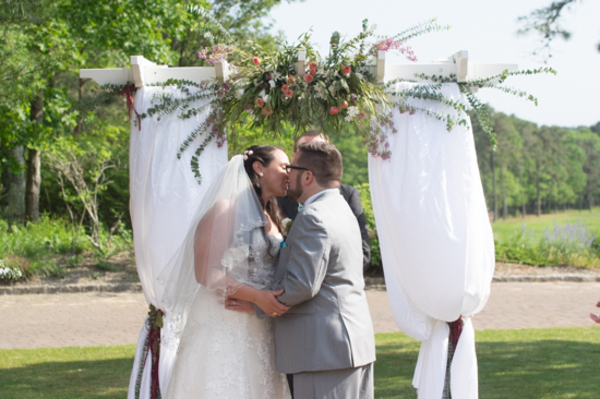 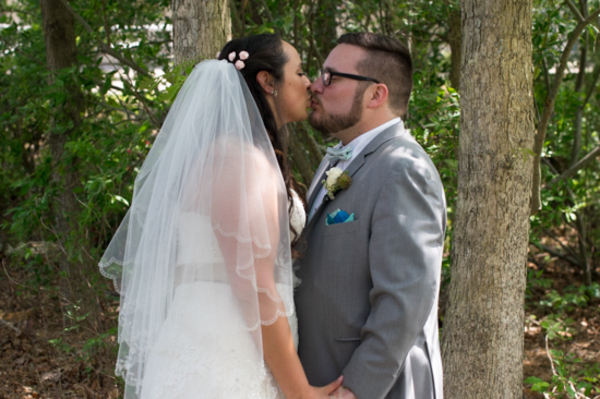 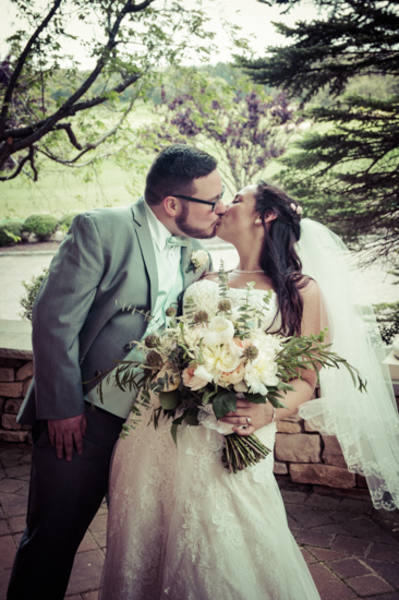 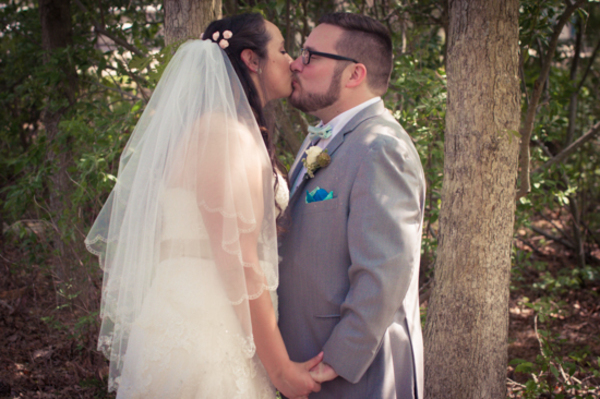 The lovebirds sealed their vows with a kiss and were officially married! 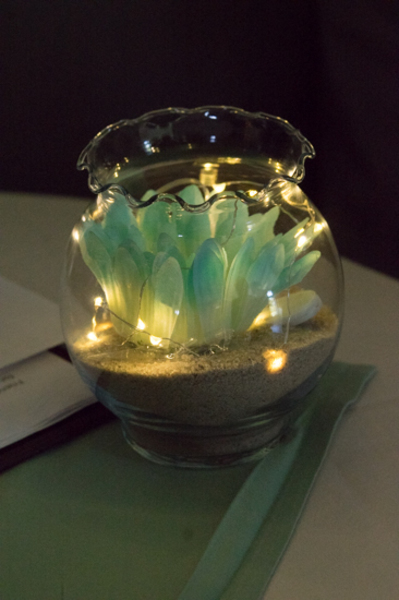 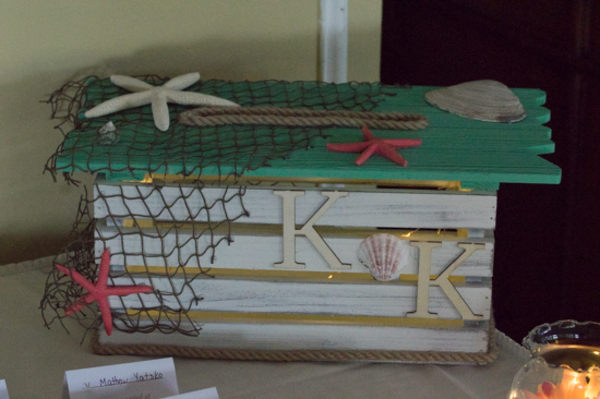 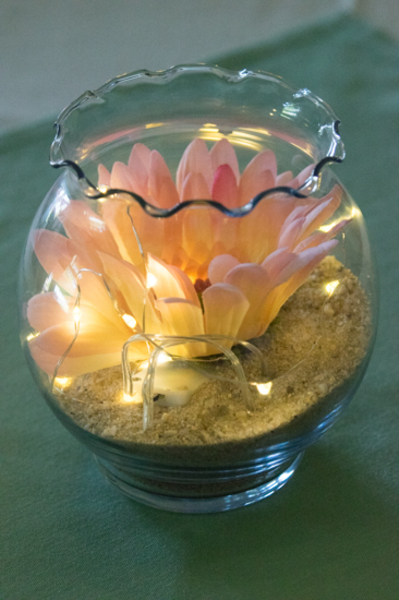 The guests then moved inside where the welcomed the newlyweds to the beach-themed reception. 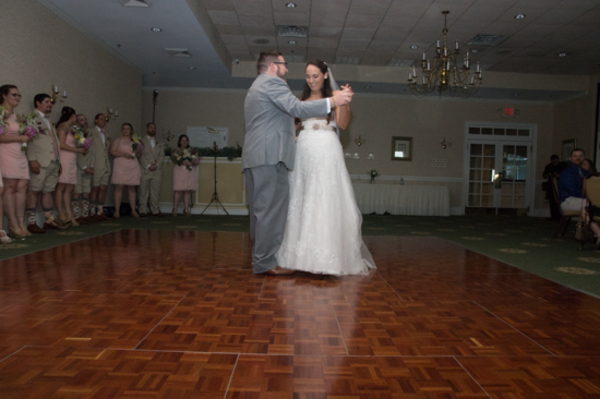 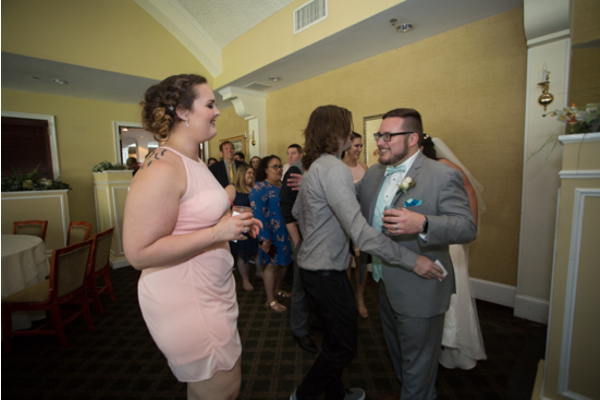 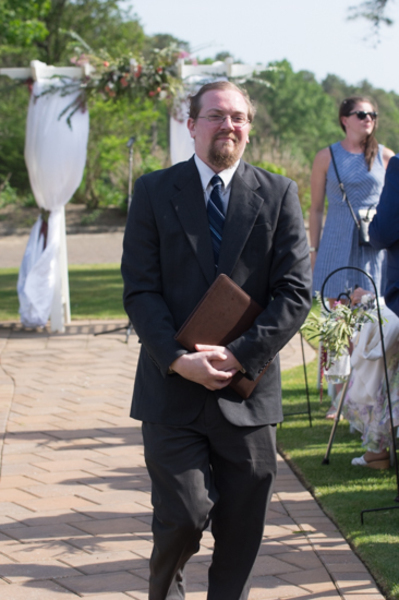 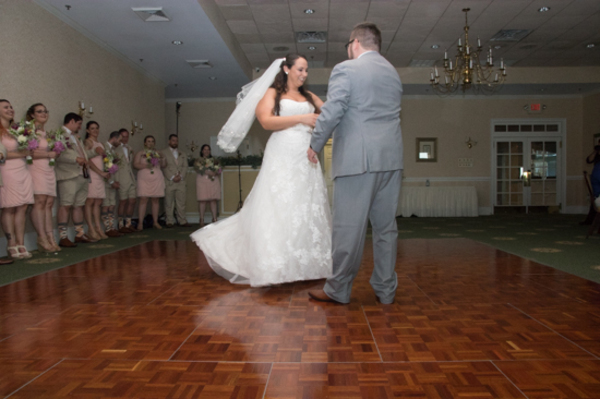 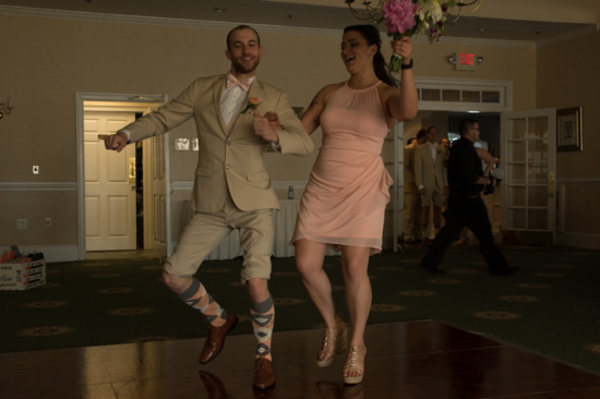 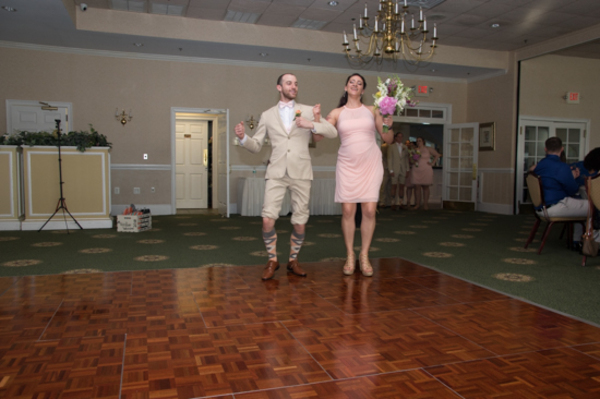 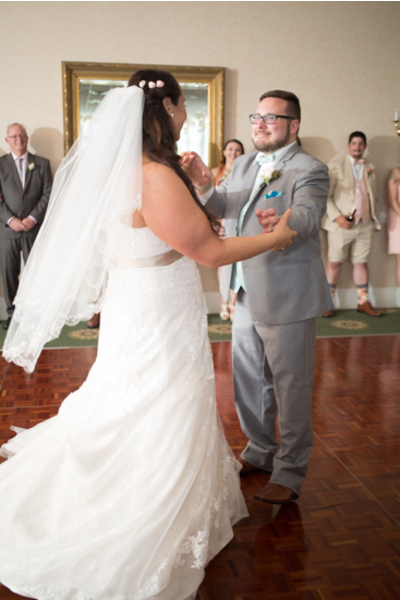 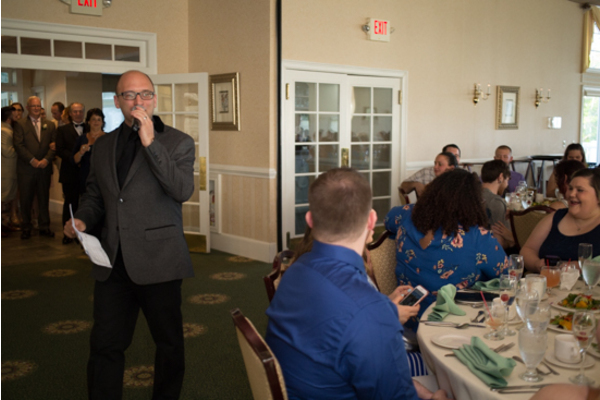 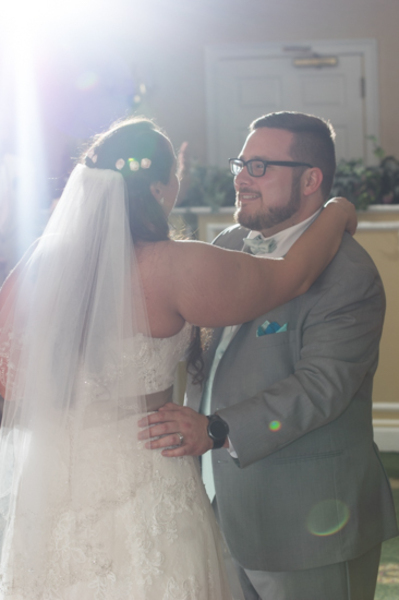 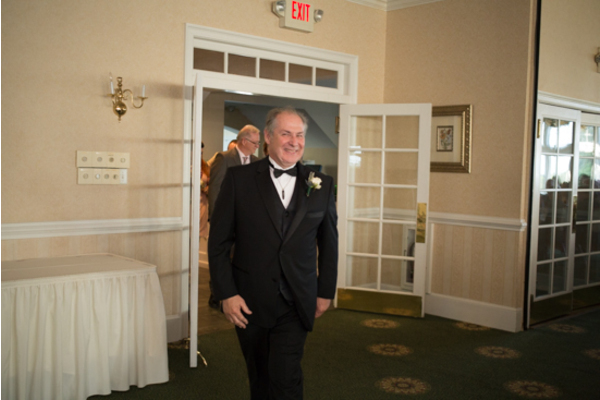 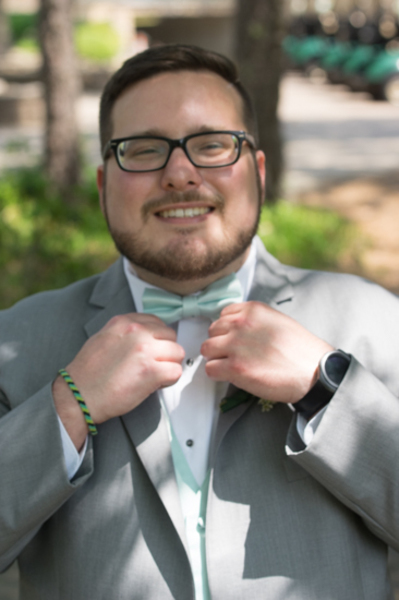 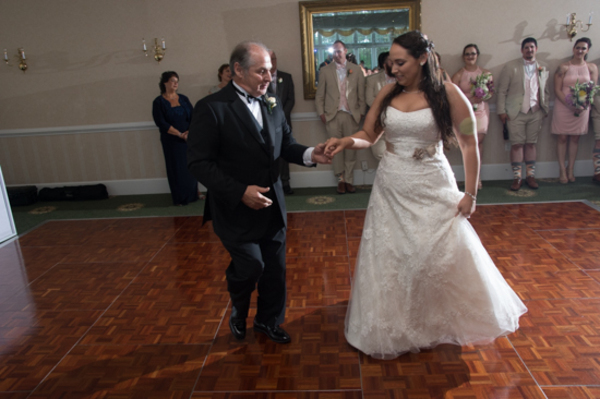 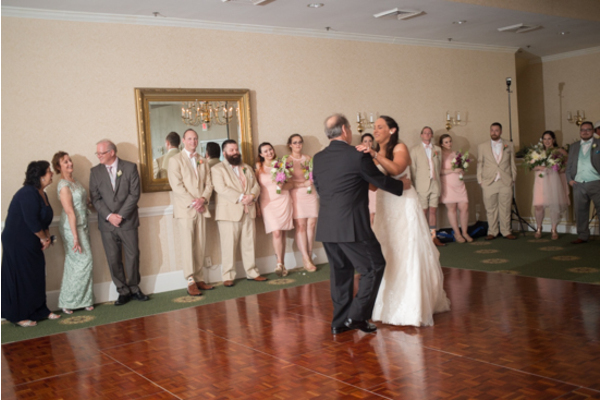 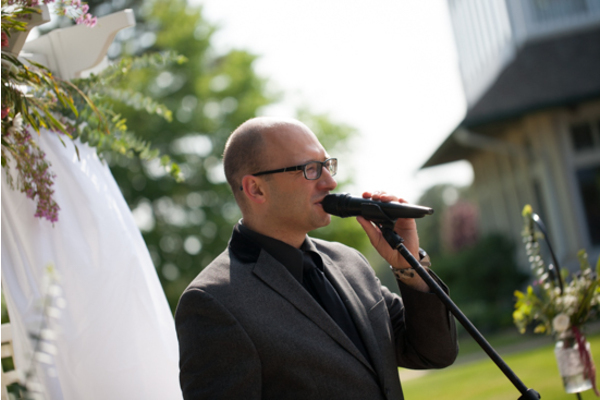 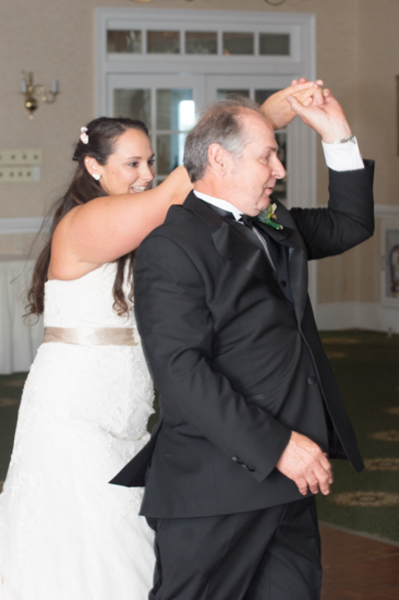 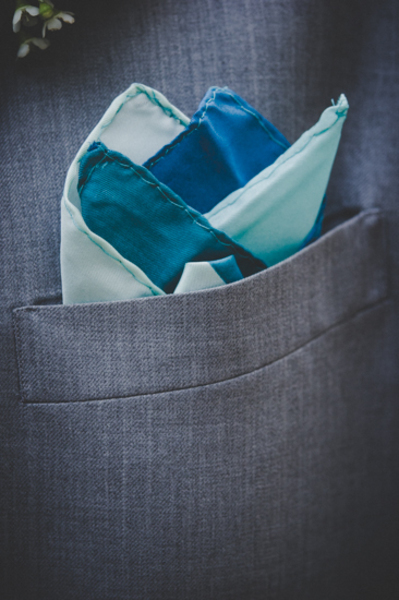 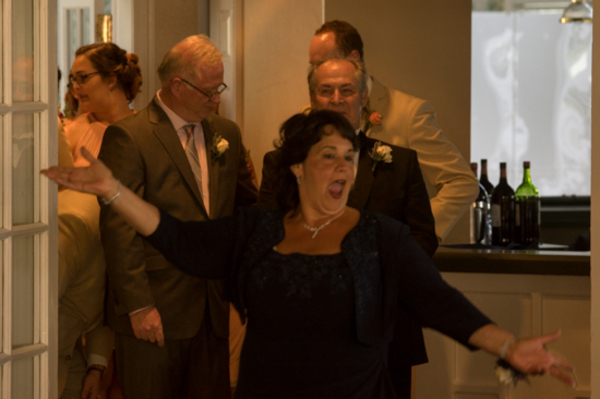 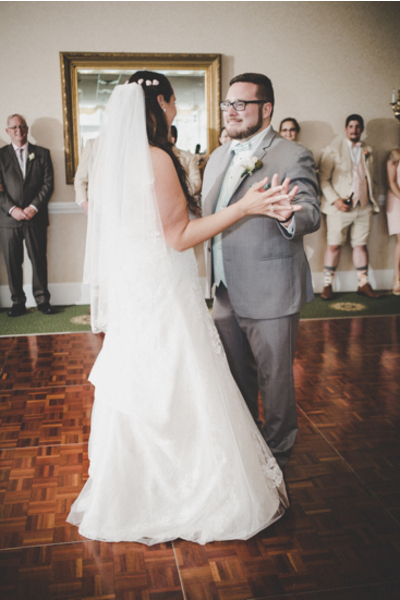 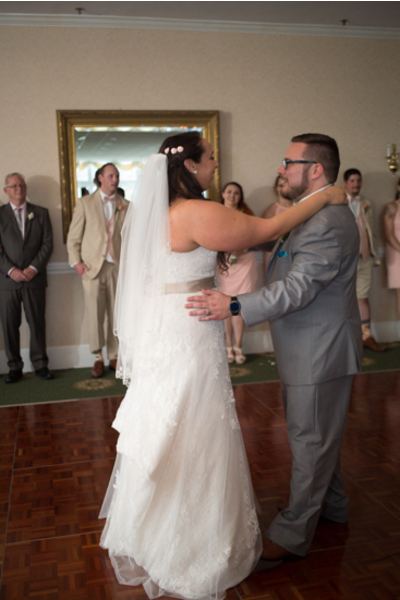 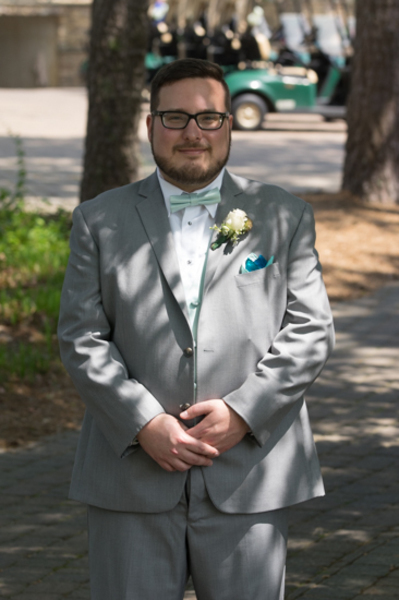 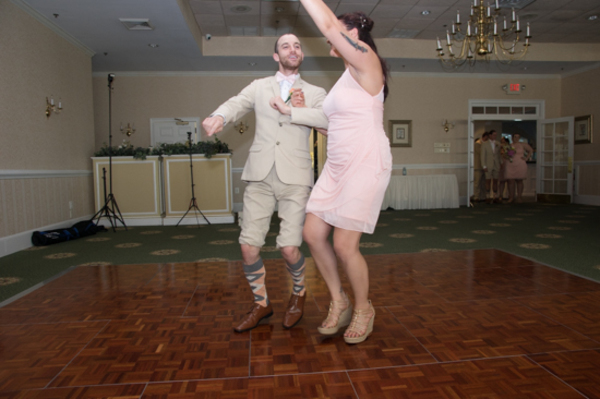 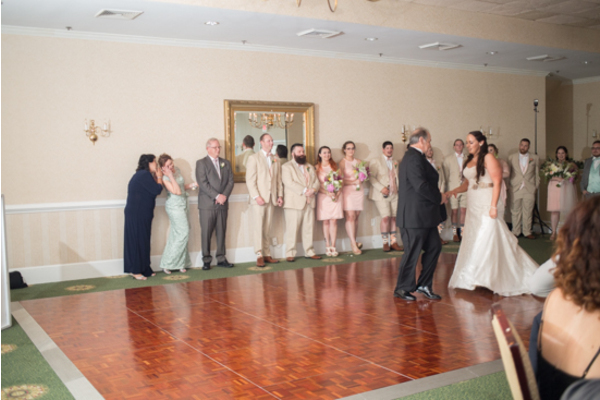 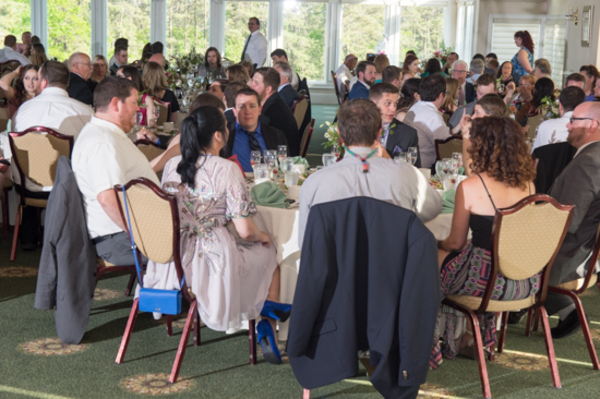 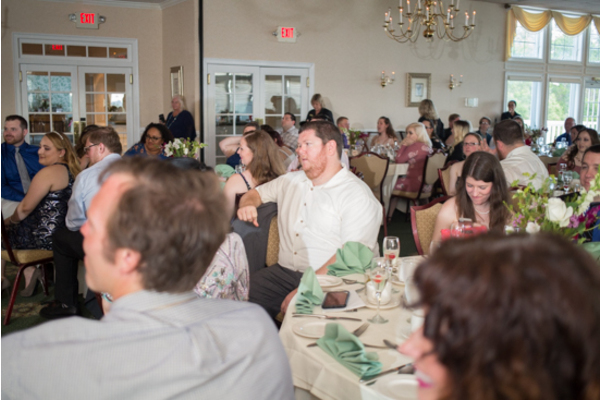 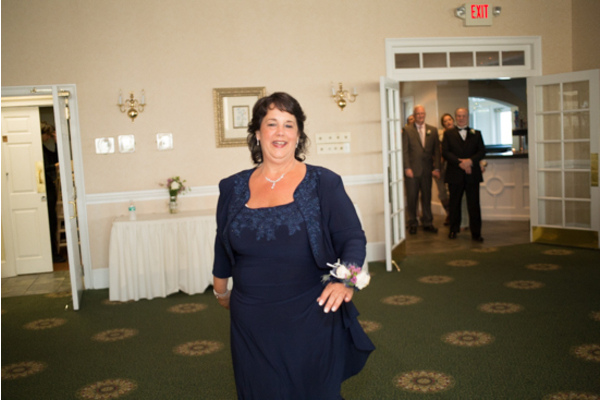 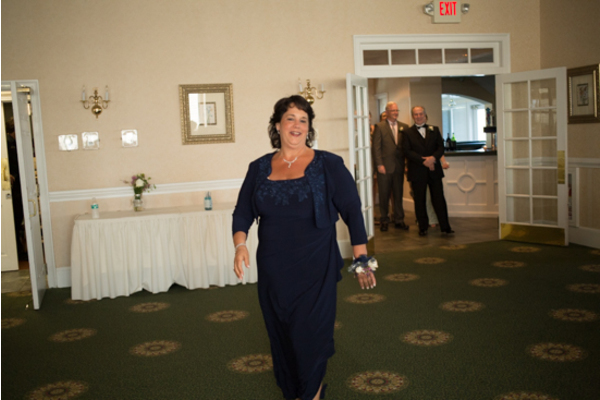 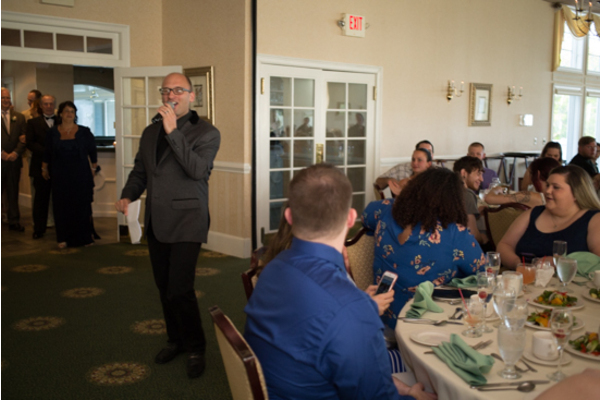 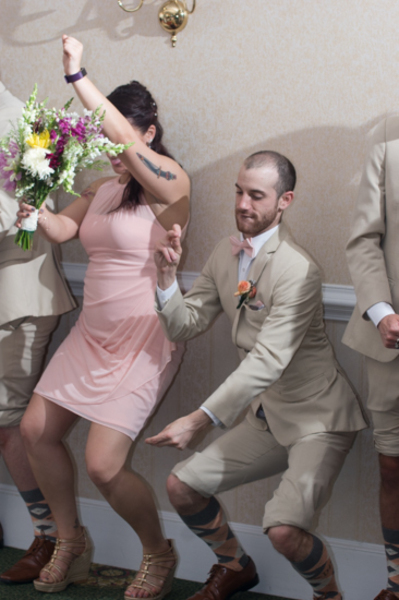 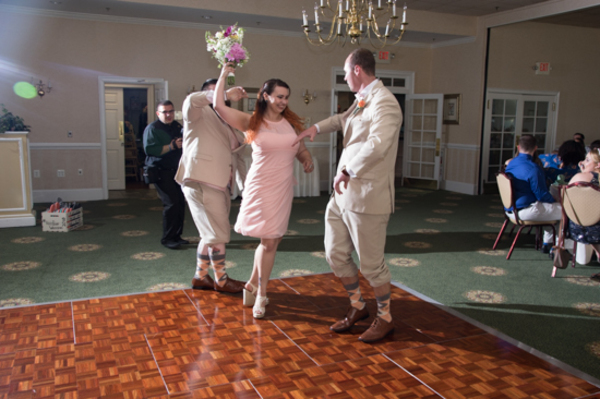 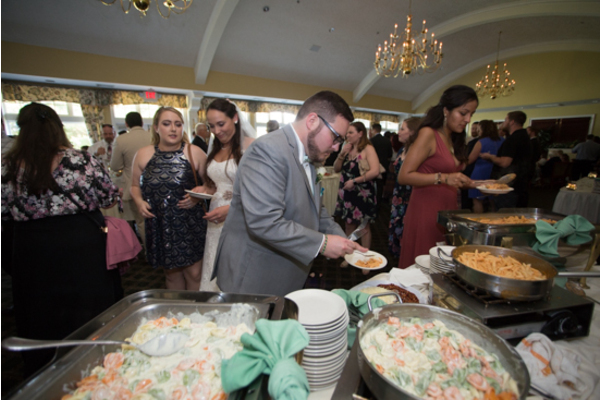 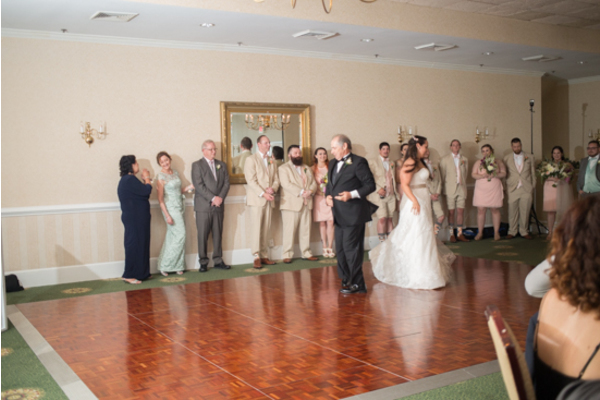 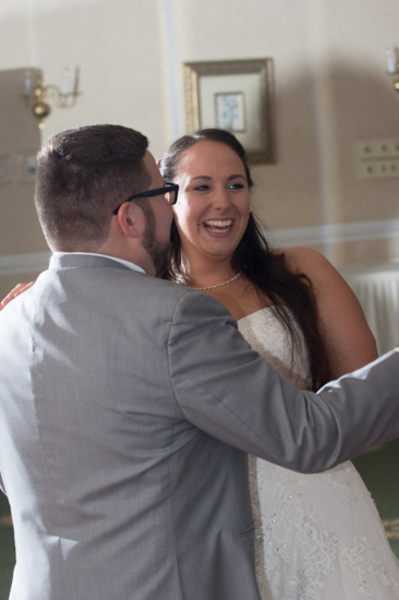 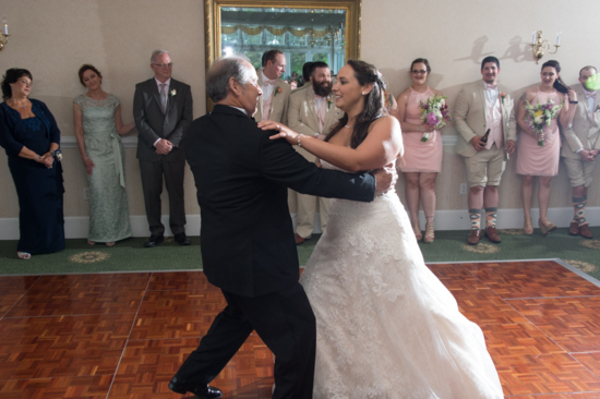 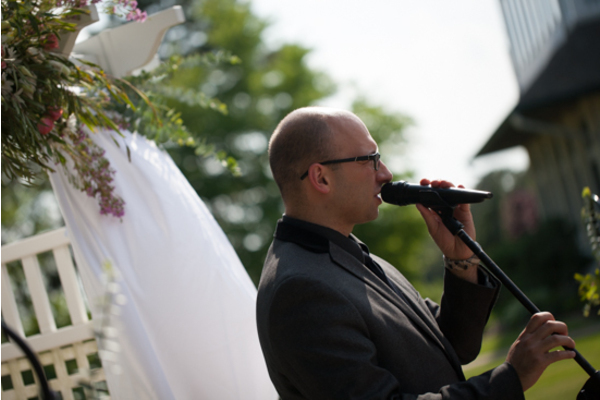 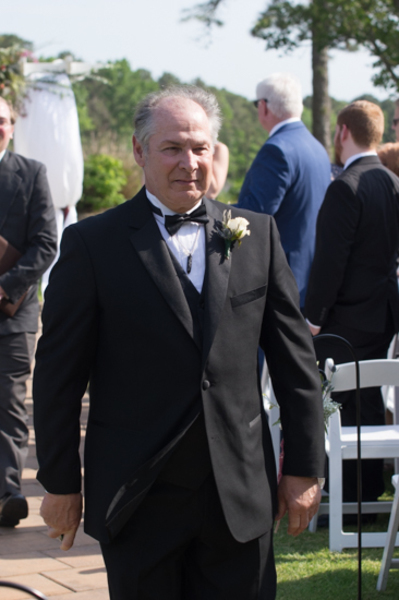 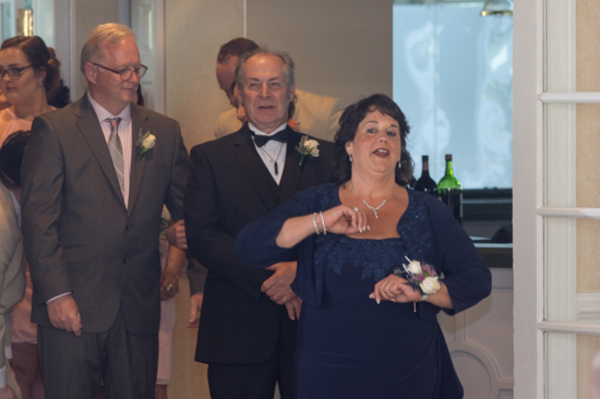 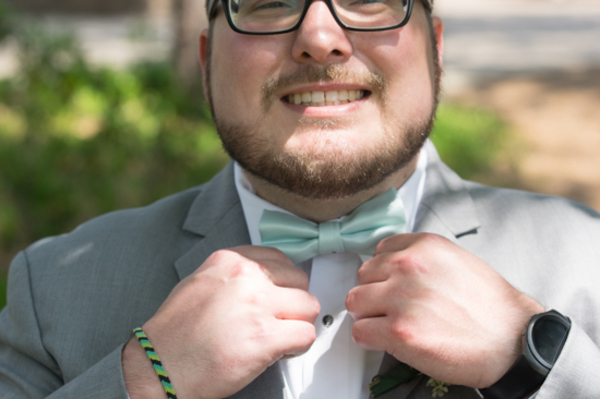 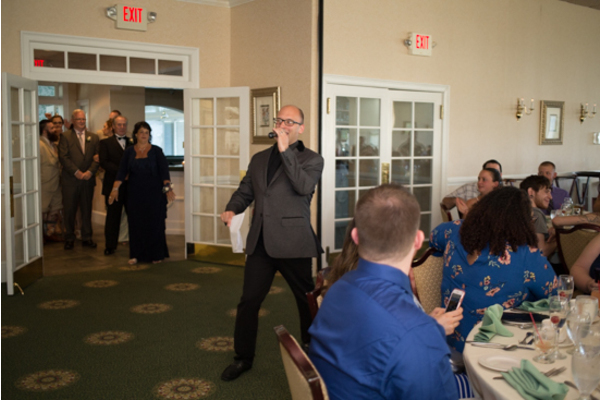 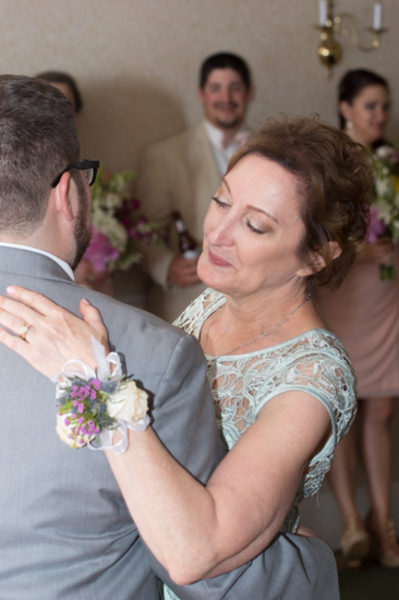 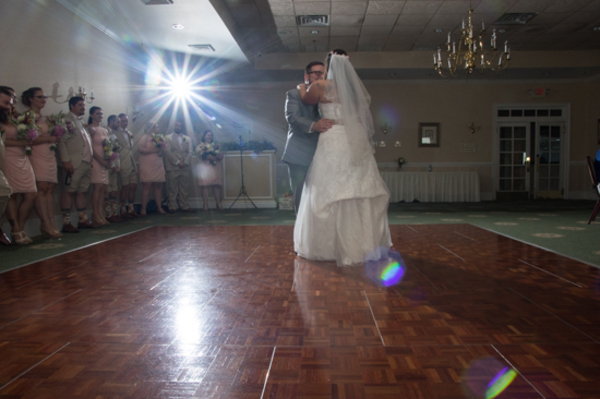 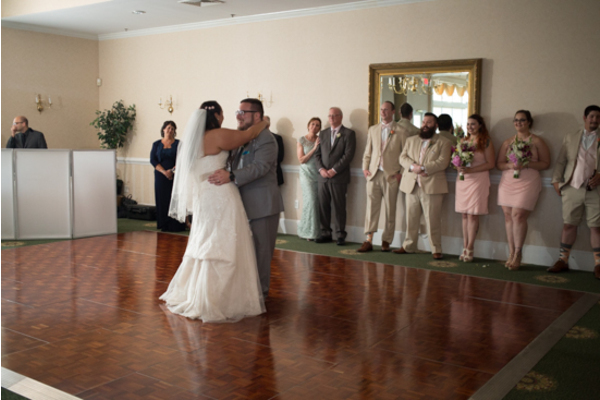 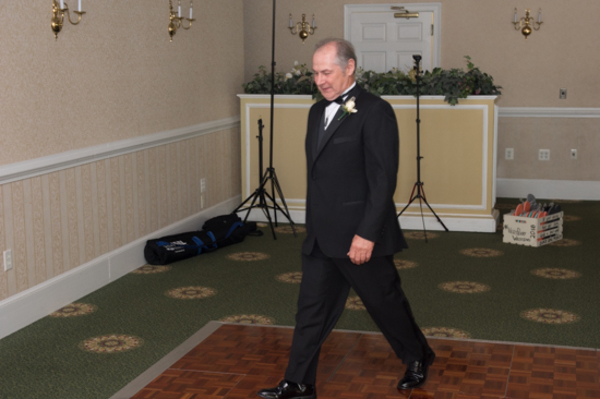 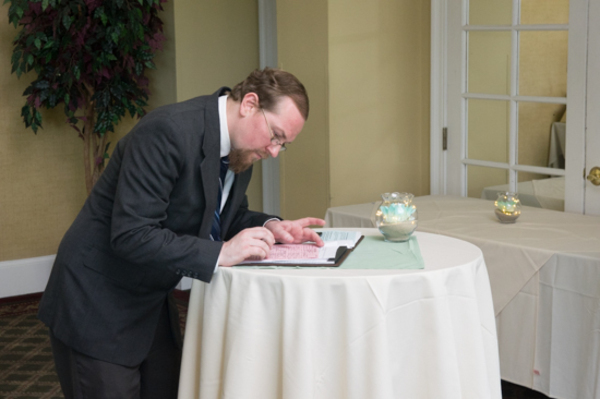 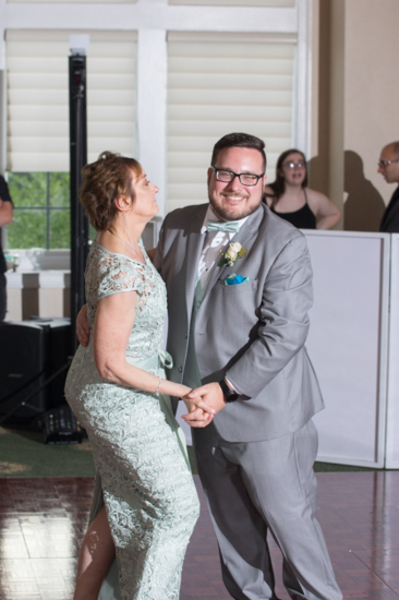 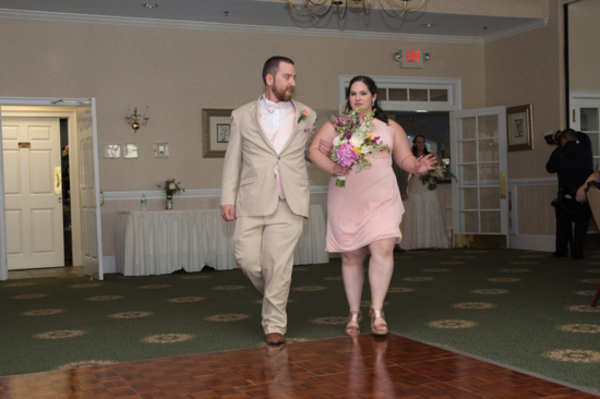 Our NJ Wedding DJ was on hand to keep the party going and the guests dancing all night. 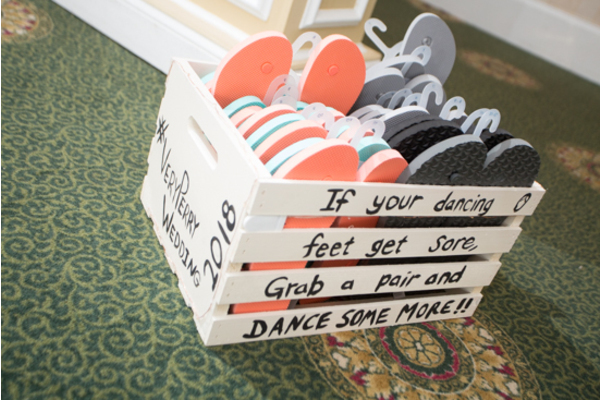 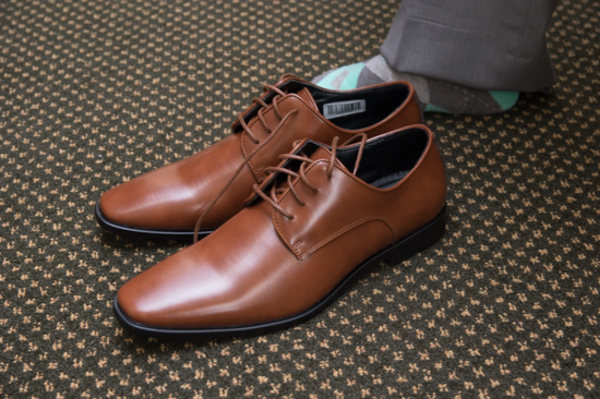 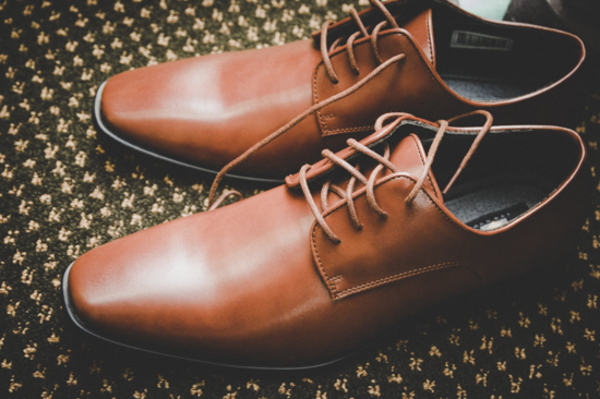 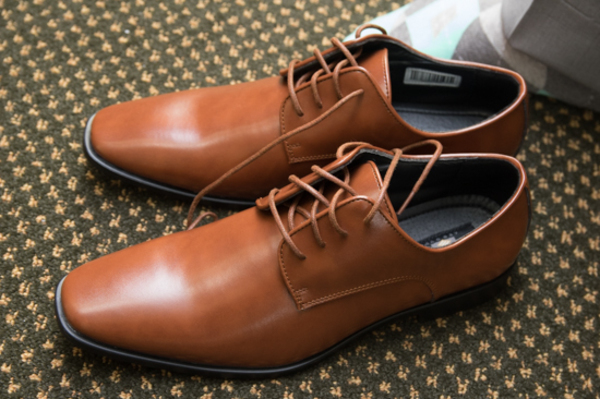 If anyone’s feet were tired, they stopped by our Social Booth to take pictures of the good times they were having with friends. 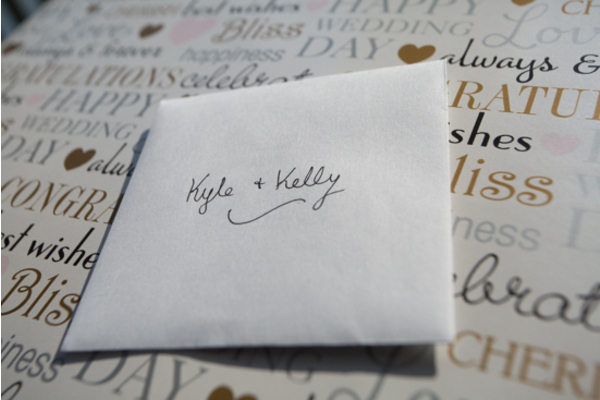 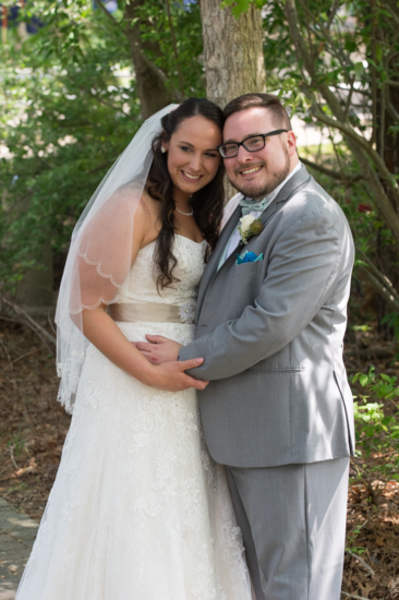 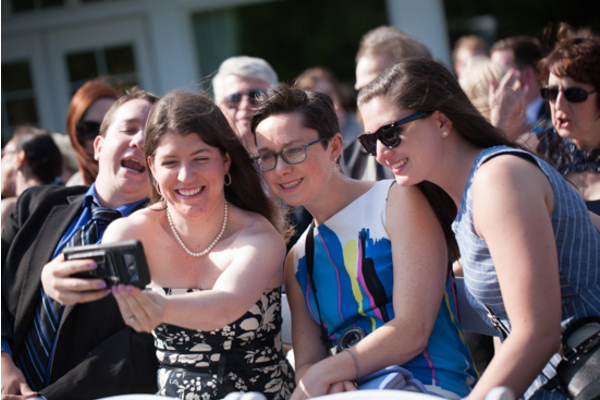 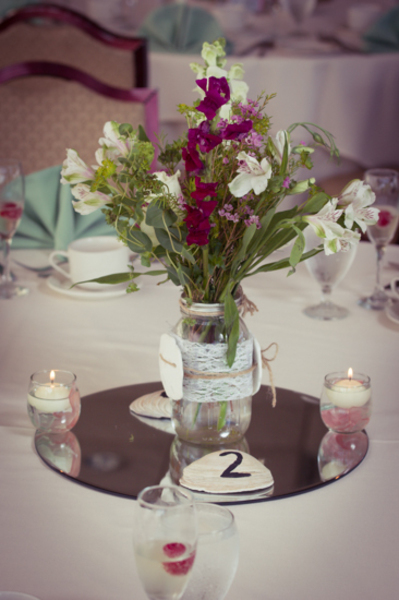 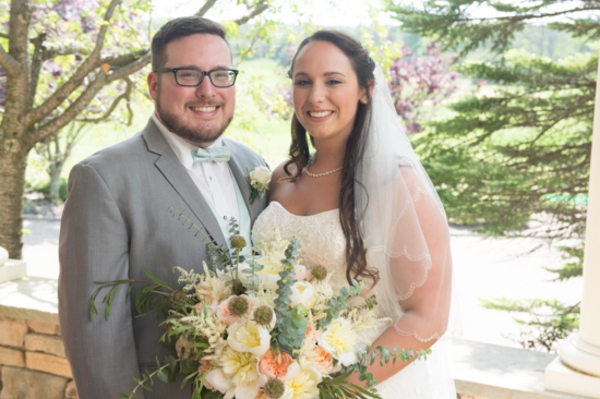 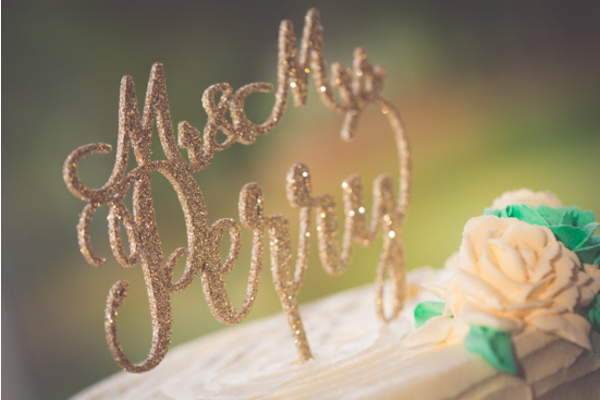 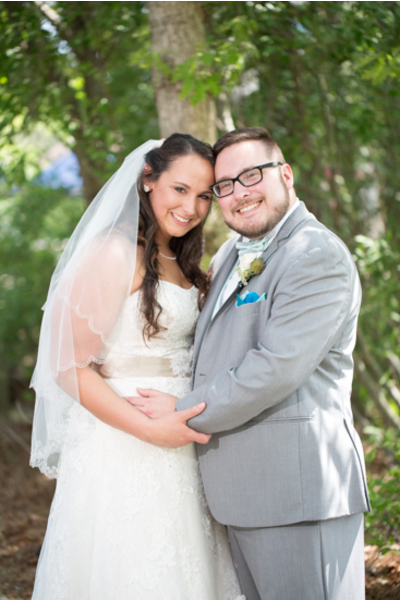 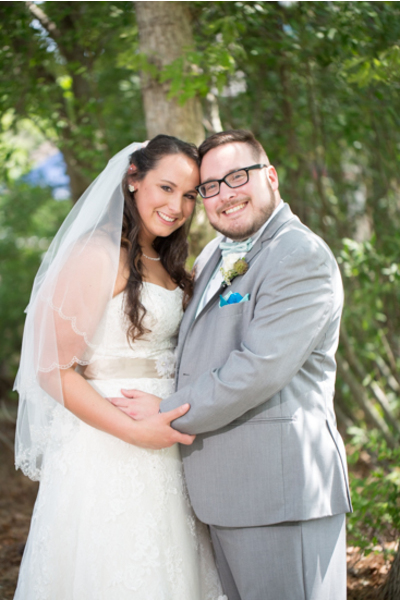 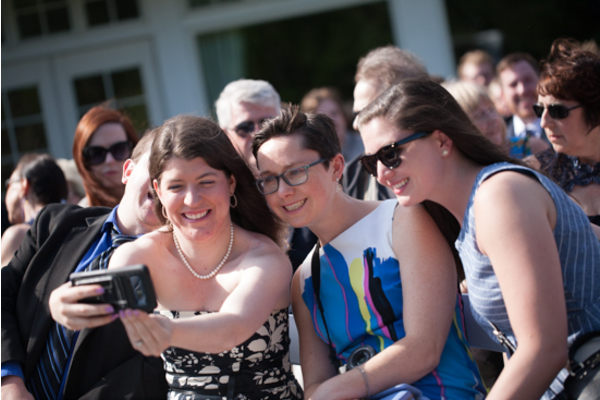 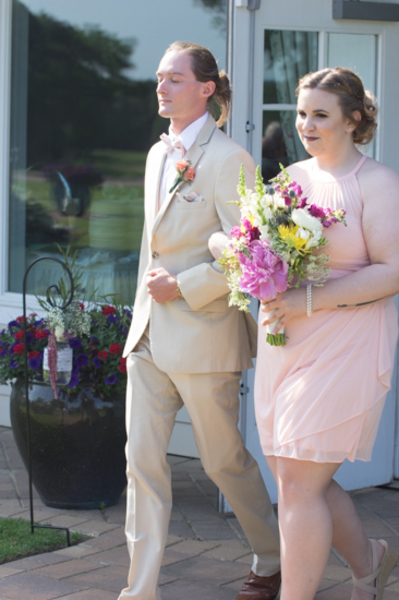 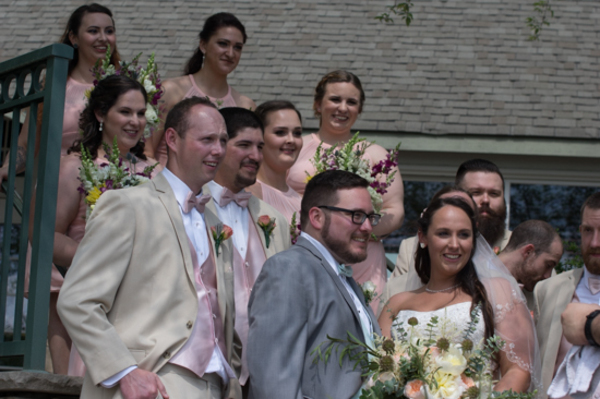 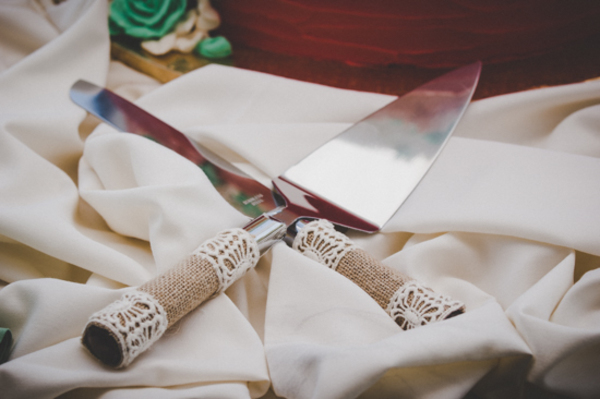 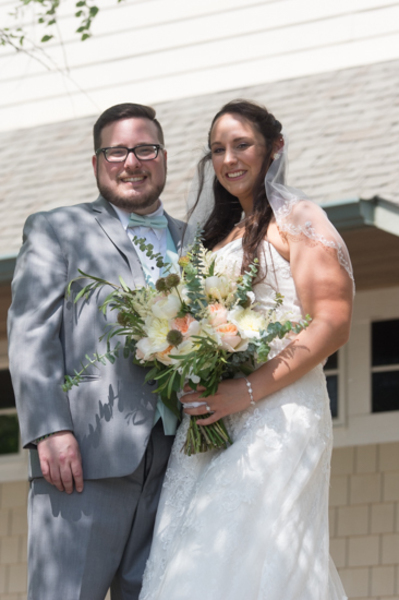 Congratulations, again, to Kelly and Kyle on their wonderful wedding! 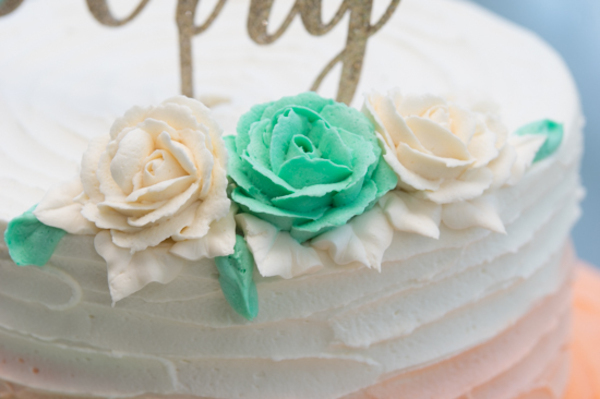 We wish you luck and happiness in the years to come!